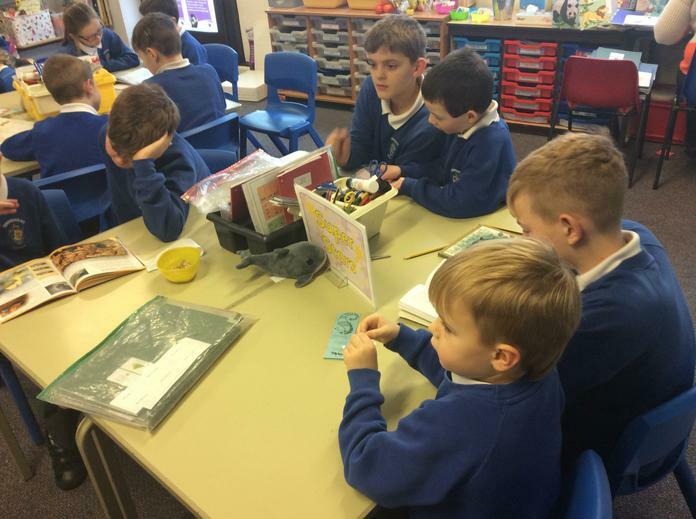 Welcome back to school after February half term. 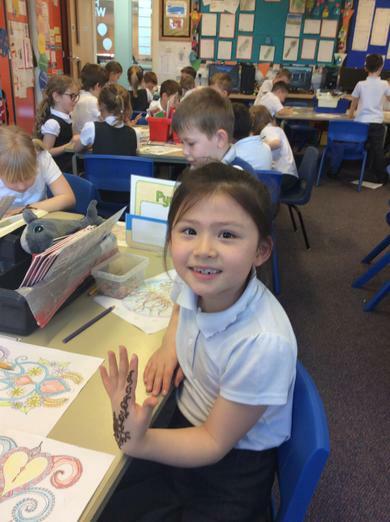 We hope you had a lovely half term and are looking forward to spring arriving. 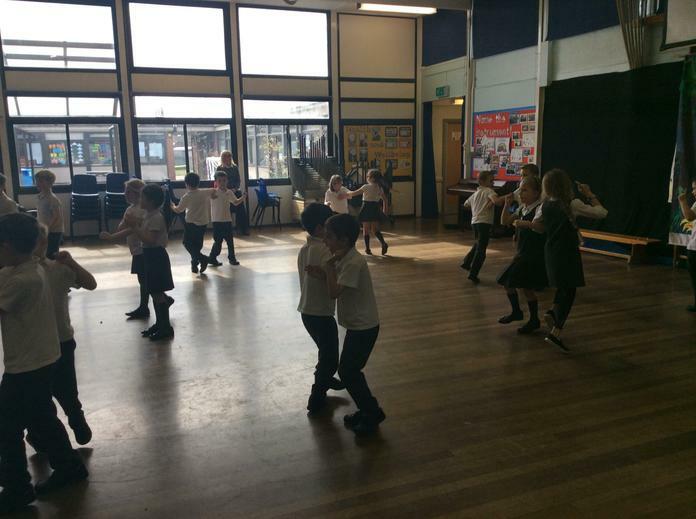 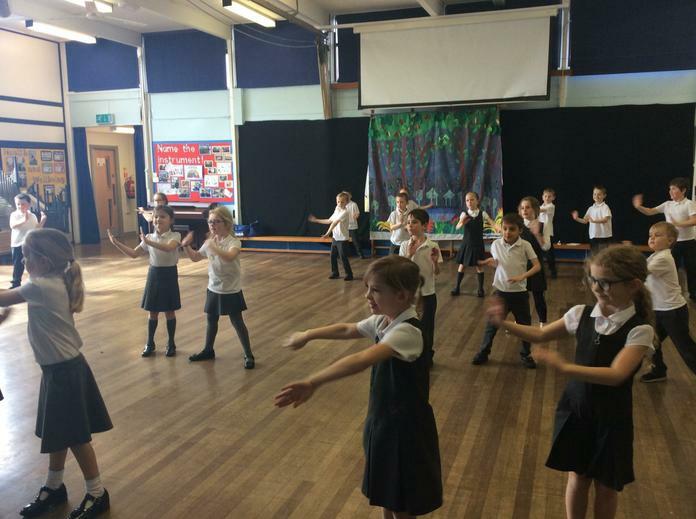 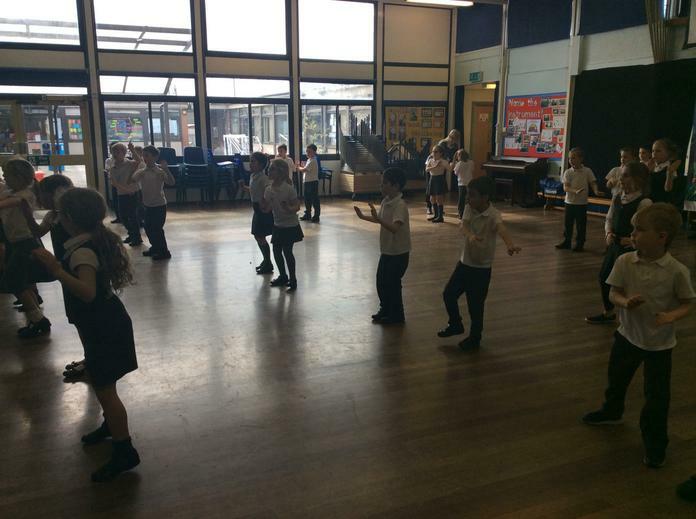 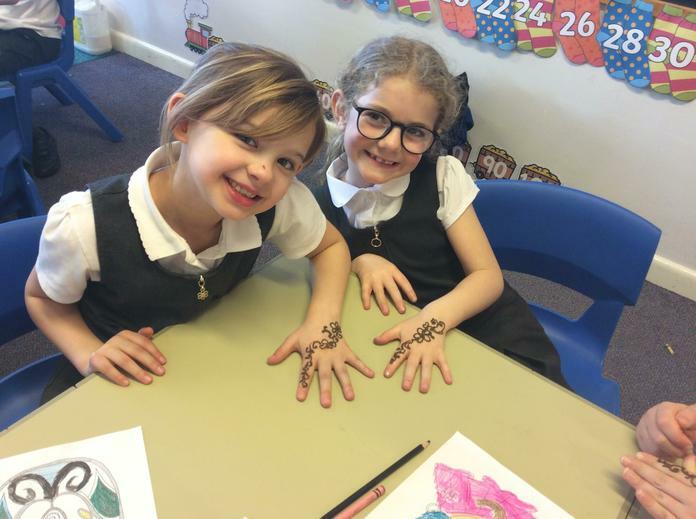 Our topic this half term is Incredible India. 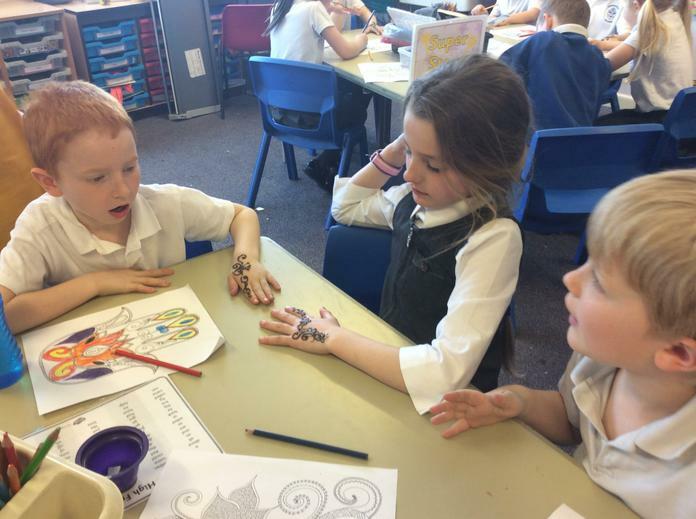 We will be comparing India to the United Kingdom and learning about its geography and culture. 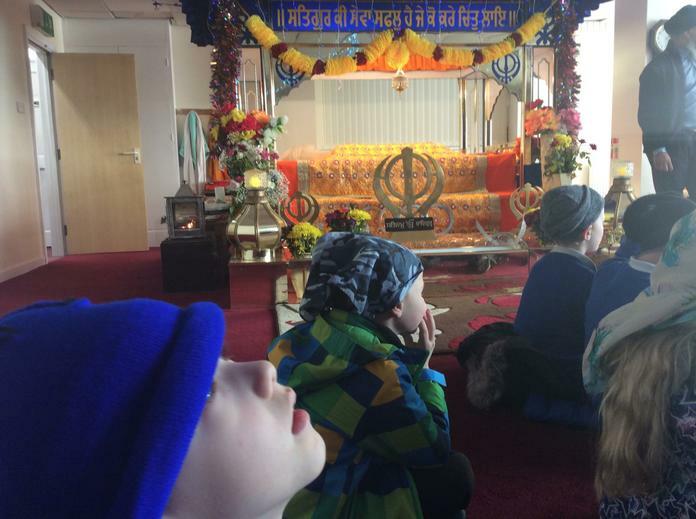 We are visiting a Sikh temple in Preston on Wednesday 6th March and will also be learning how Hindus worship. 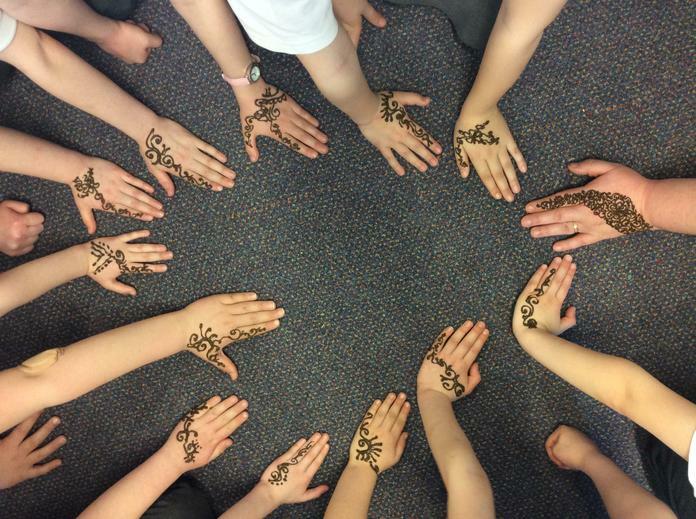 We will have some fun tasting India food and learning some Bollywood moves. 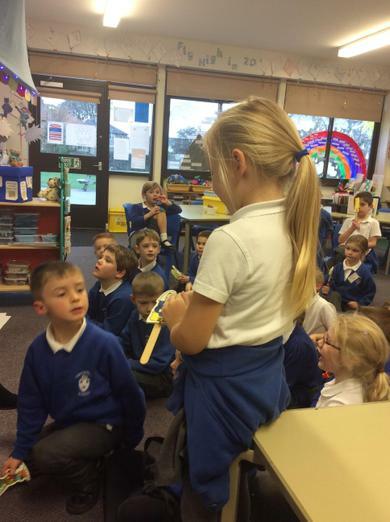 A topic letter will be sent home as soon as possible. 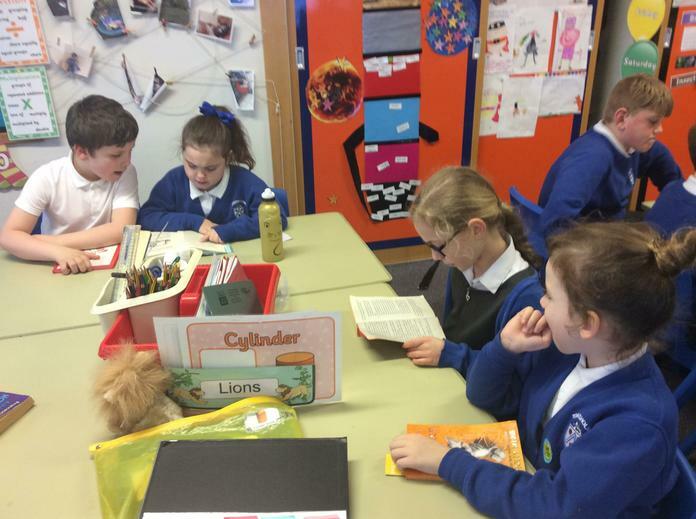 On Your Marks, Get Set, READ!!! 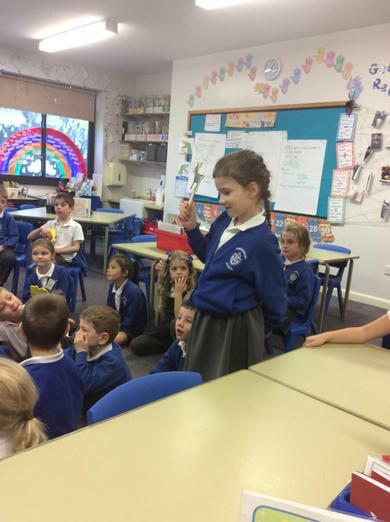 We have had a visitor in Year 2. 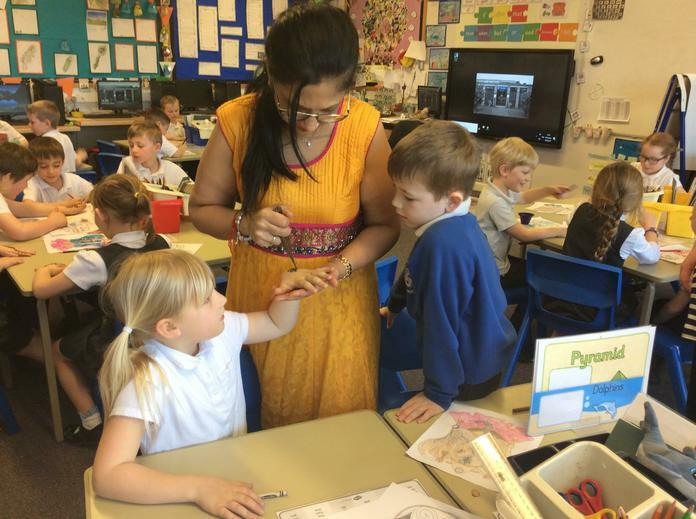 Prags told us about her childhood and how she felt when she came to this country as a child and had to learn to speak English. 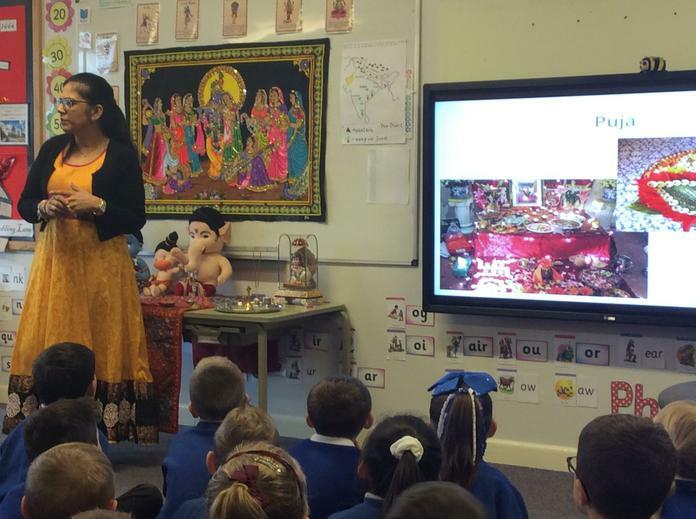 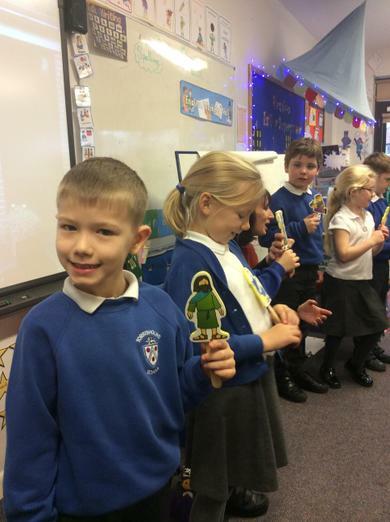 We learned about how Hindus worship and some of the stories about the different Gods. 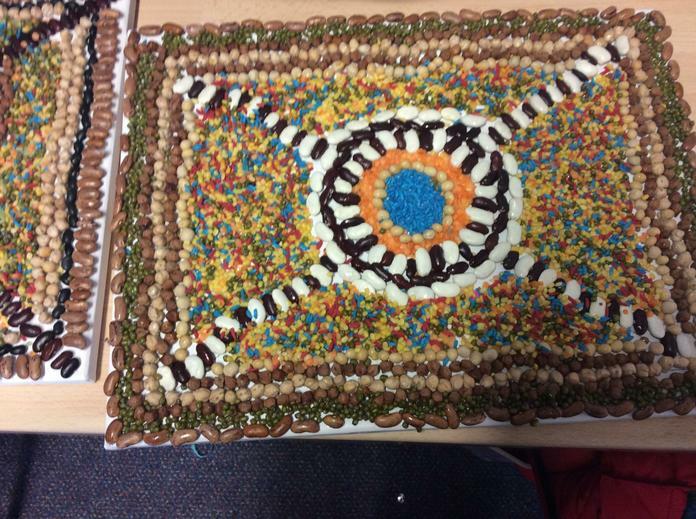 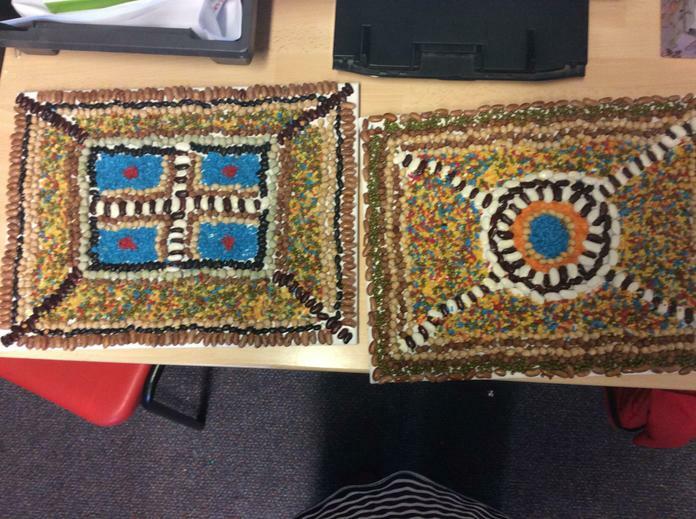 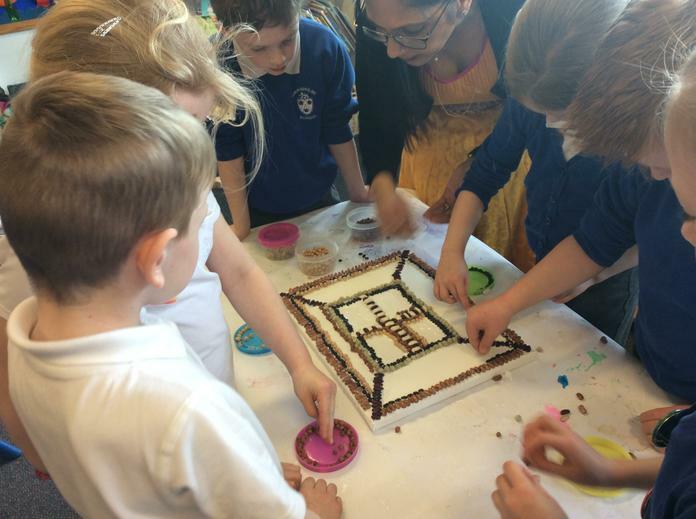 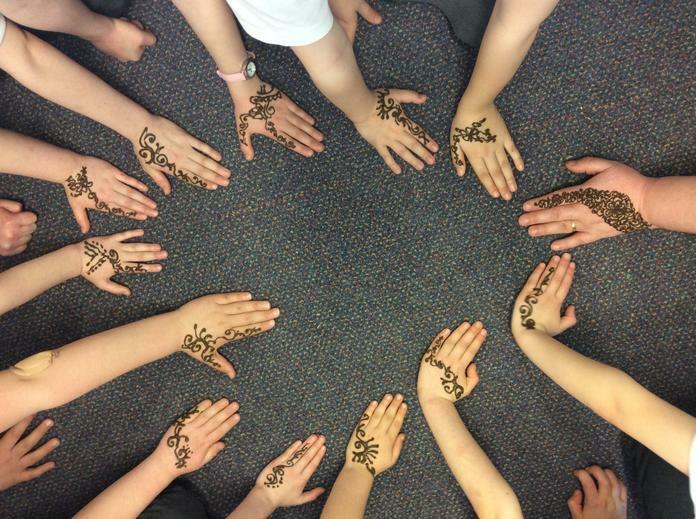 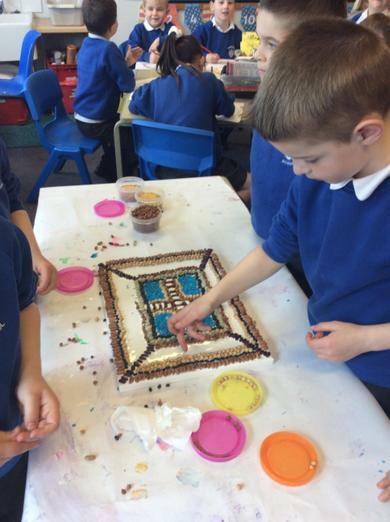 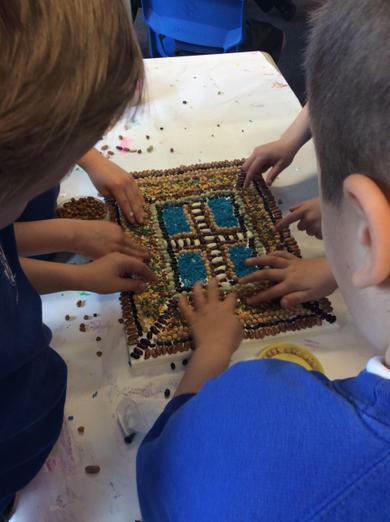 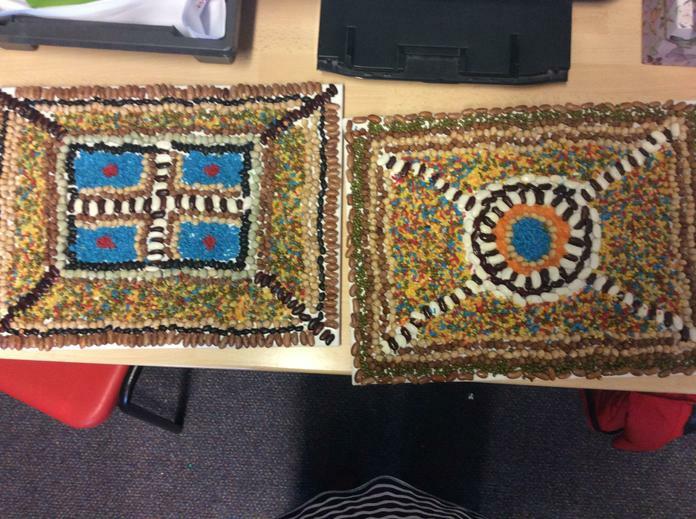 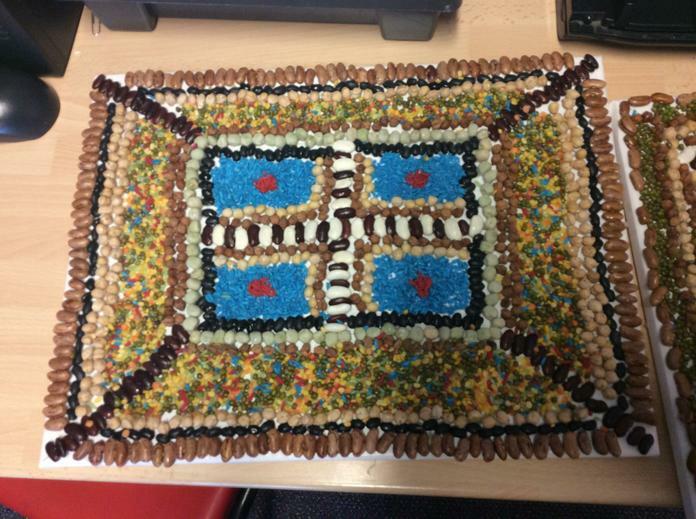 We worked as a team to create a piece of Rangoli art work; took part in some Indian dancing and had henna on our hands. 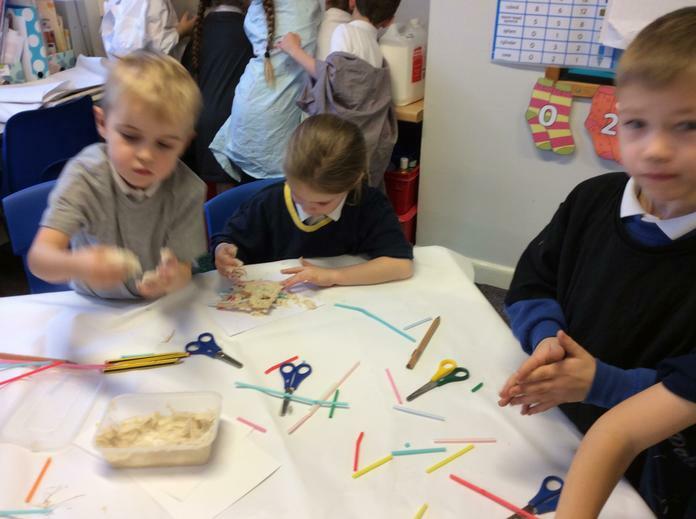 We learned lots and had lots of fun. 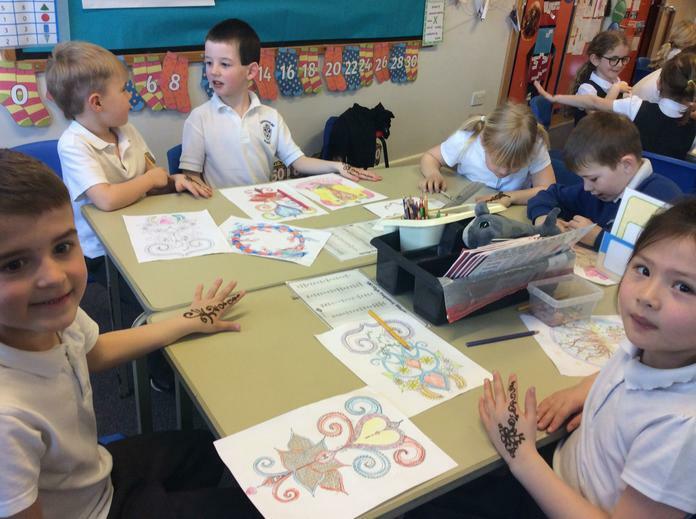 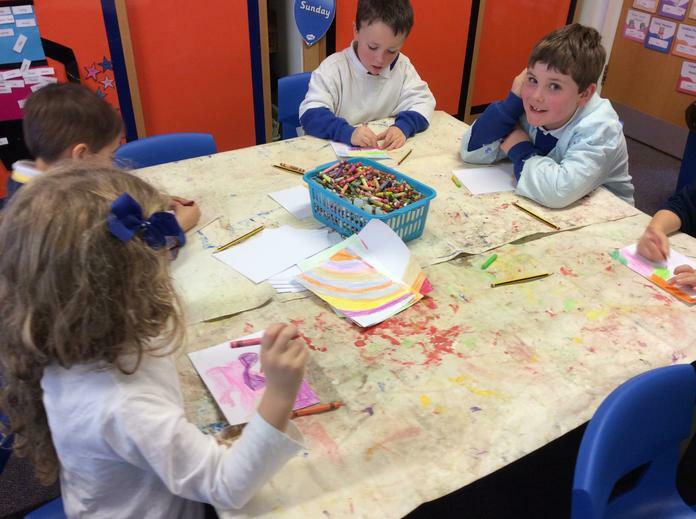 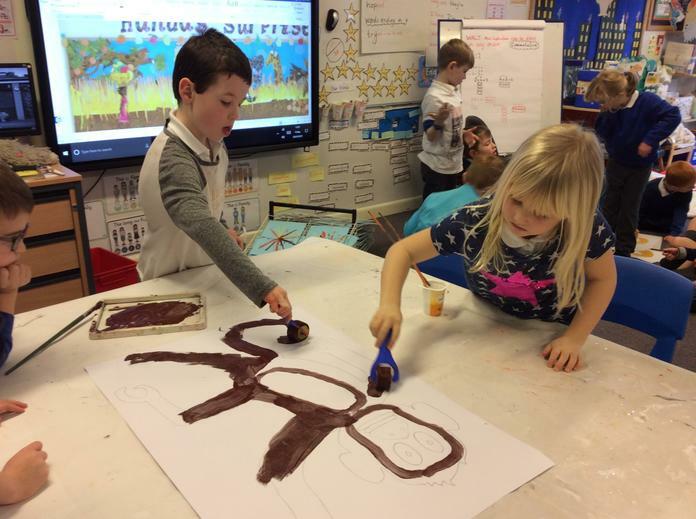 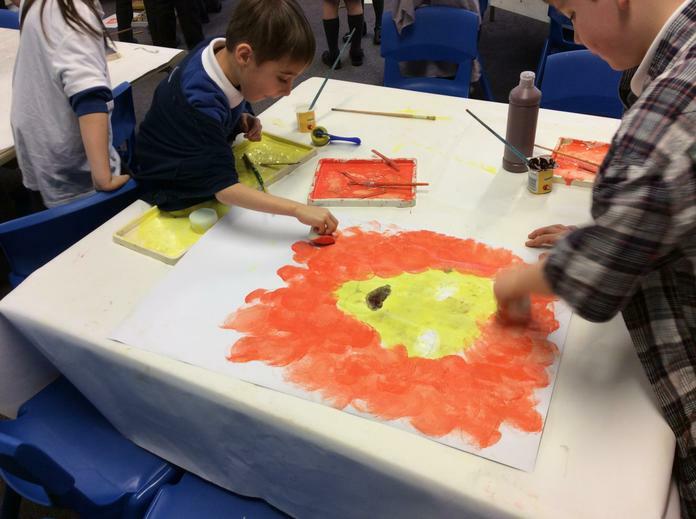 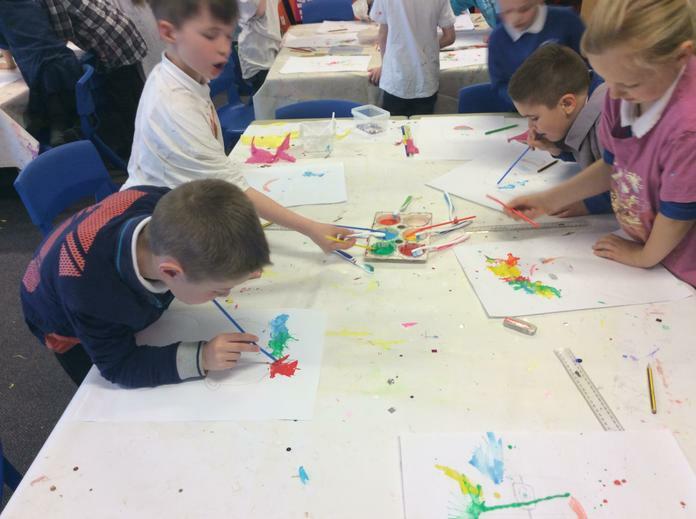 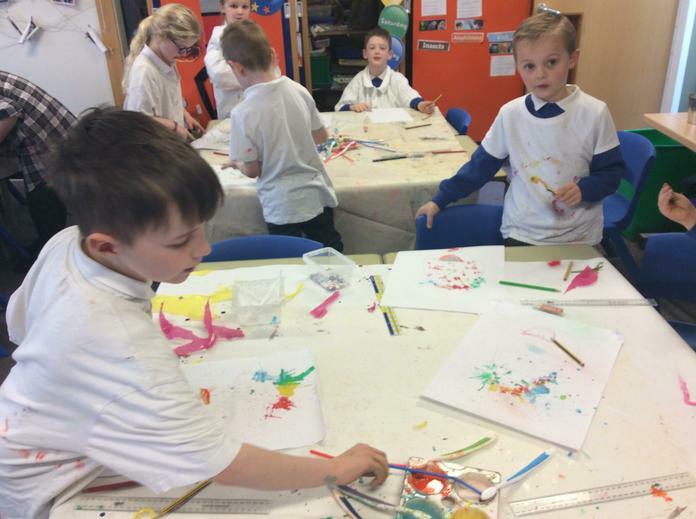 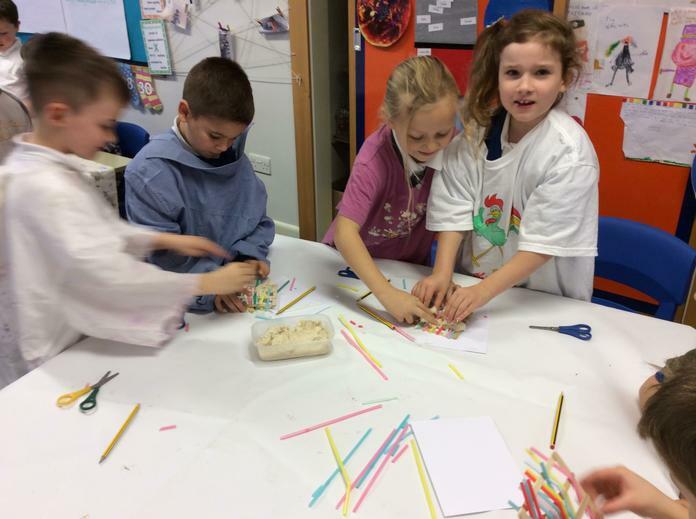 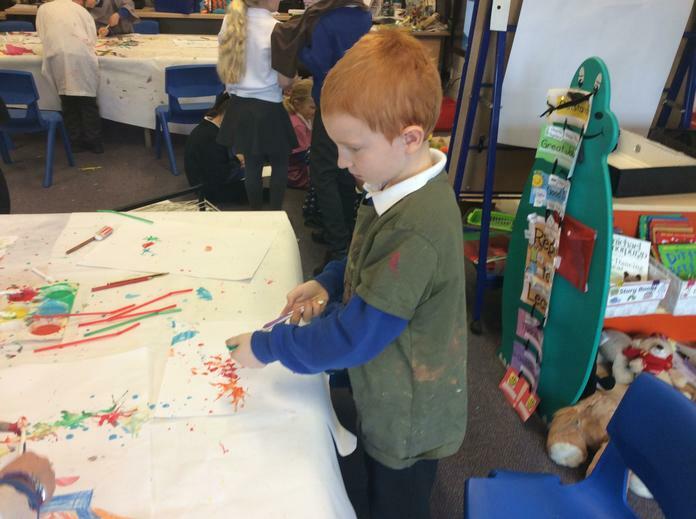 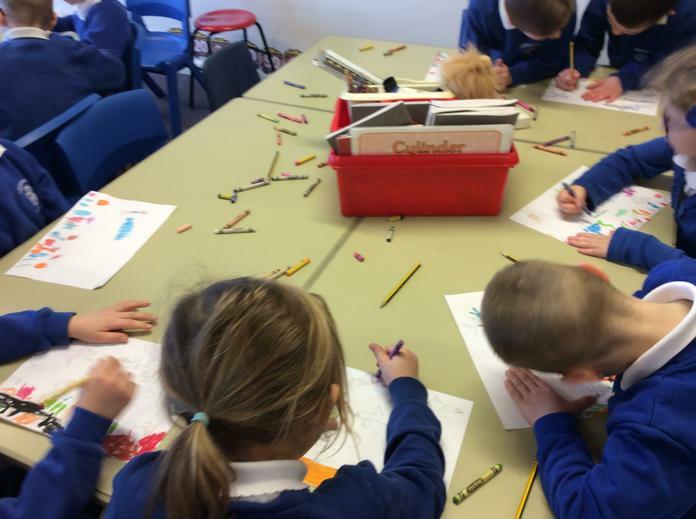 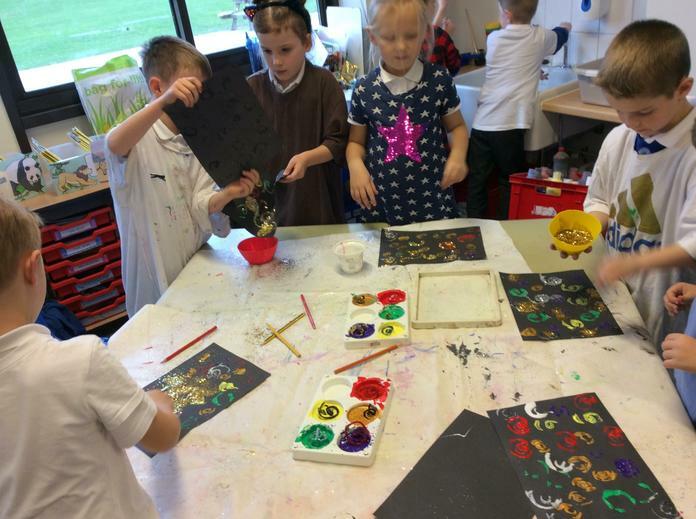 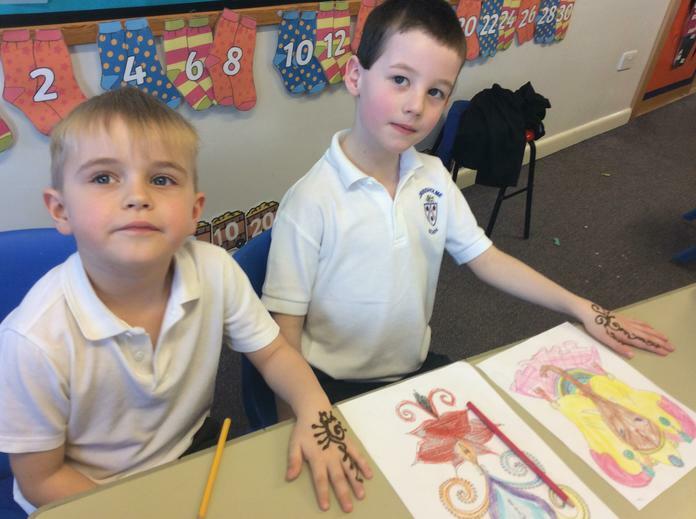 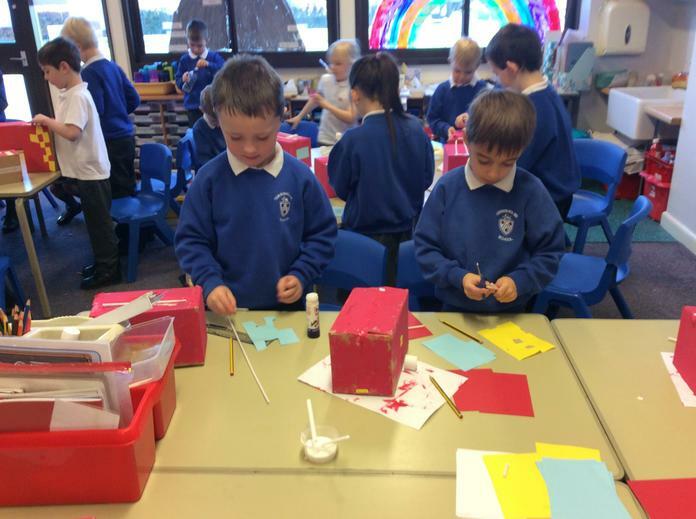 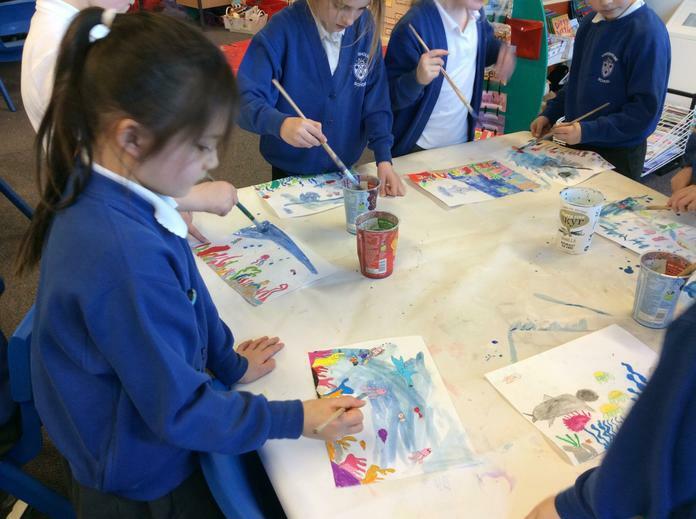 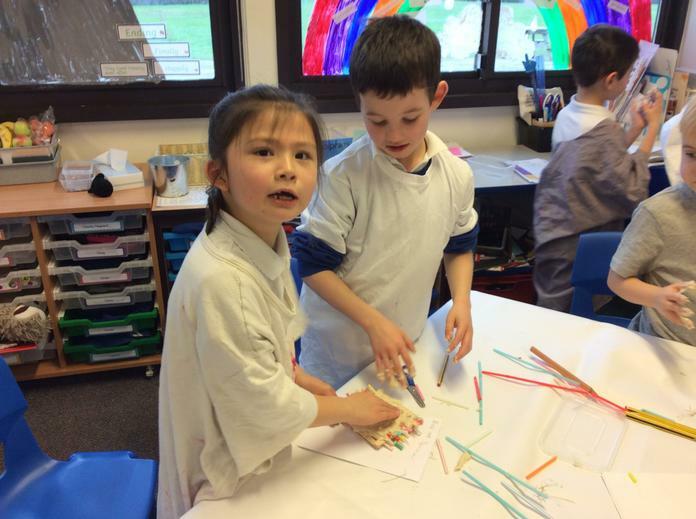 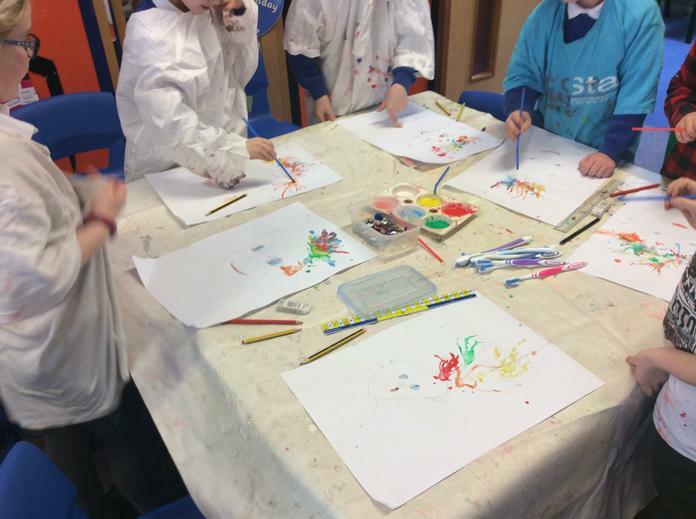 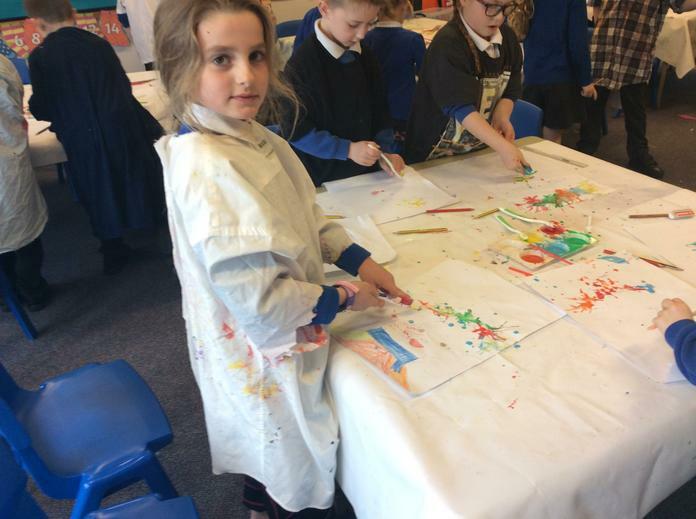 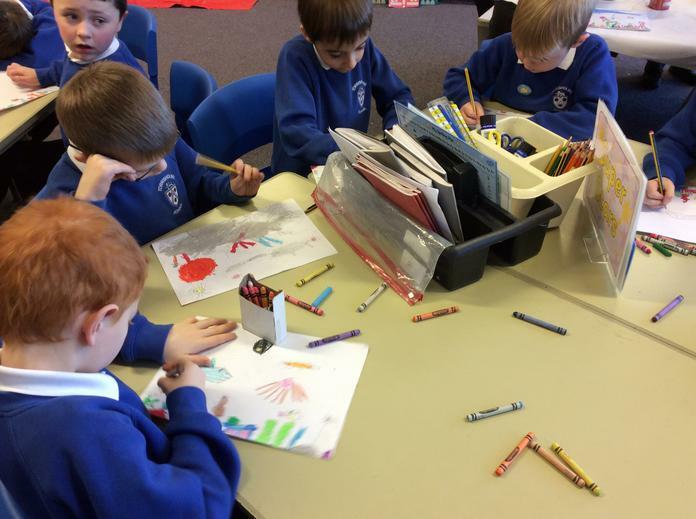 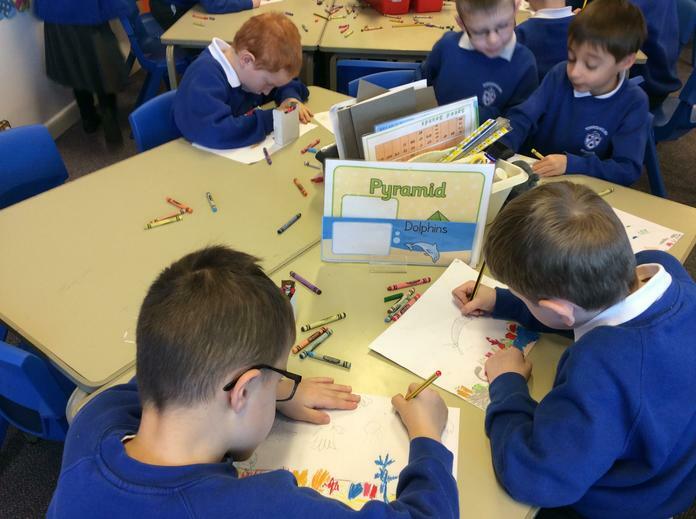 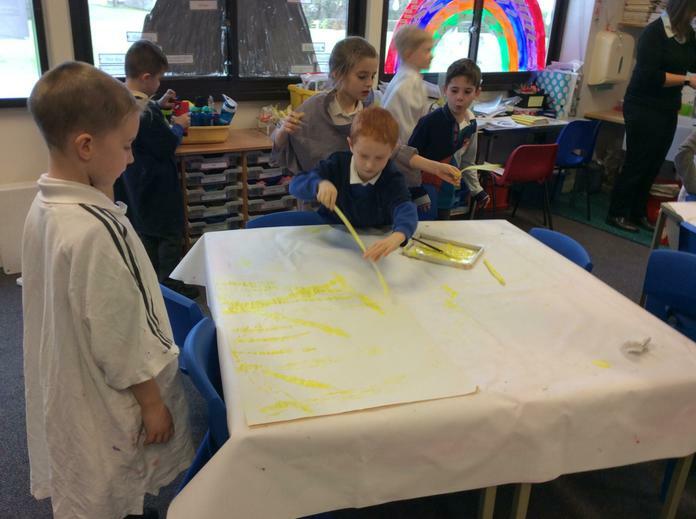 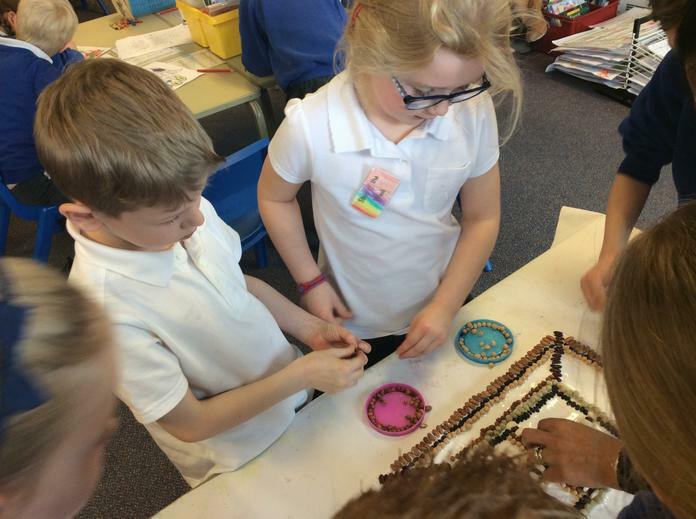 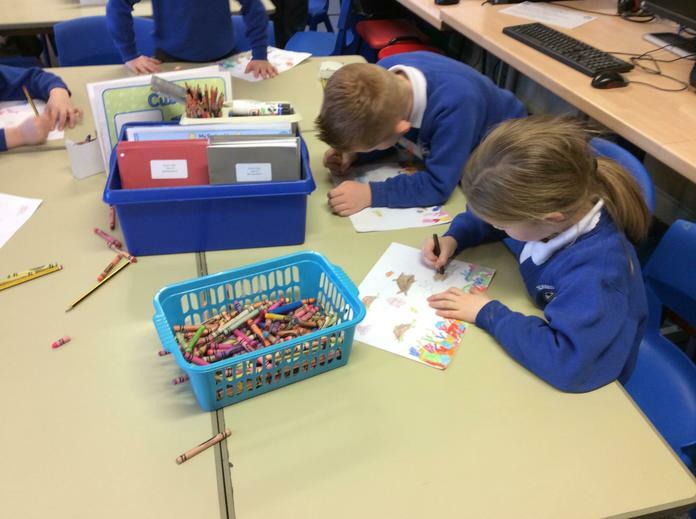 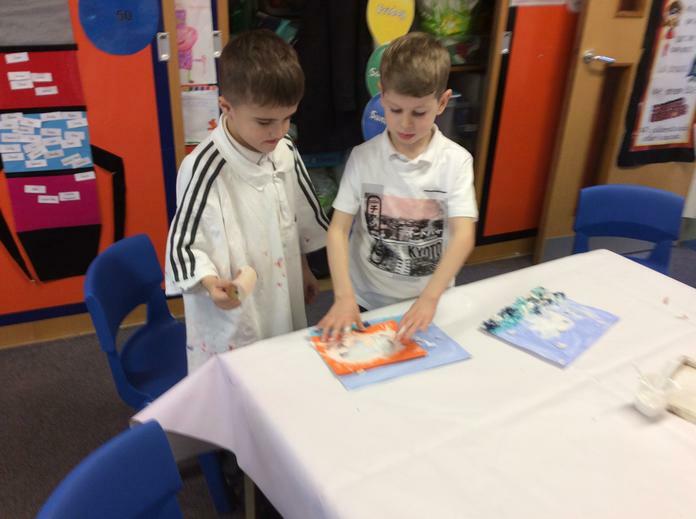 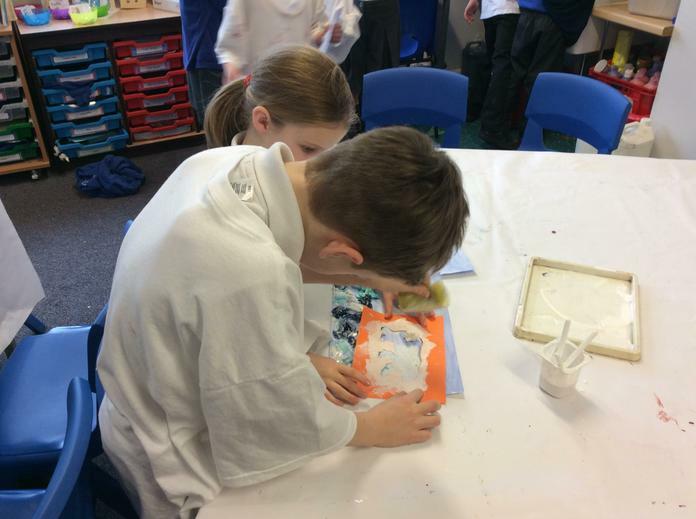 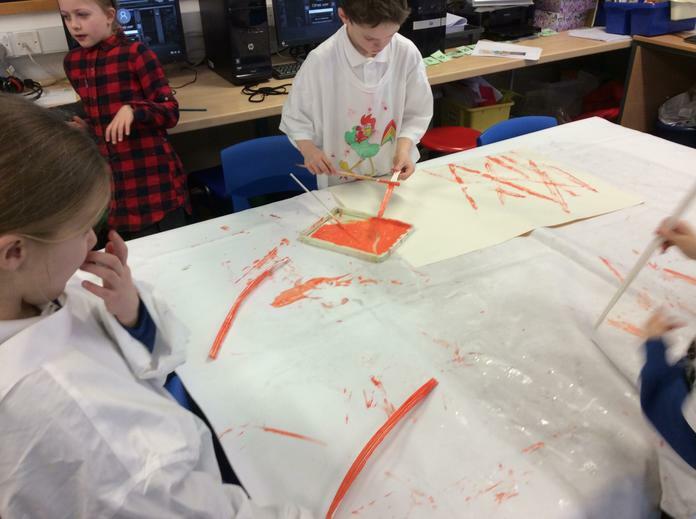 We have been learning about the Hindu festival of Holi. 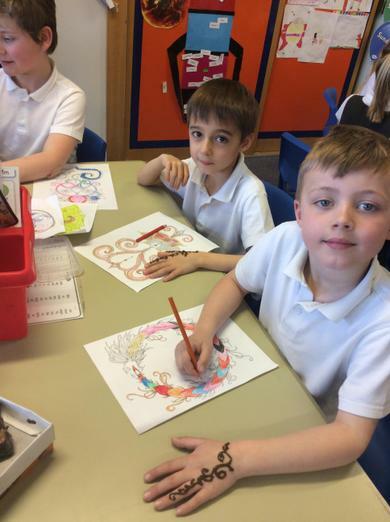 This is a spring festival and known as the festival of colour. 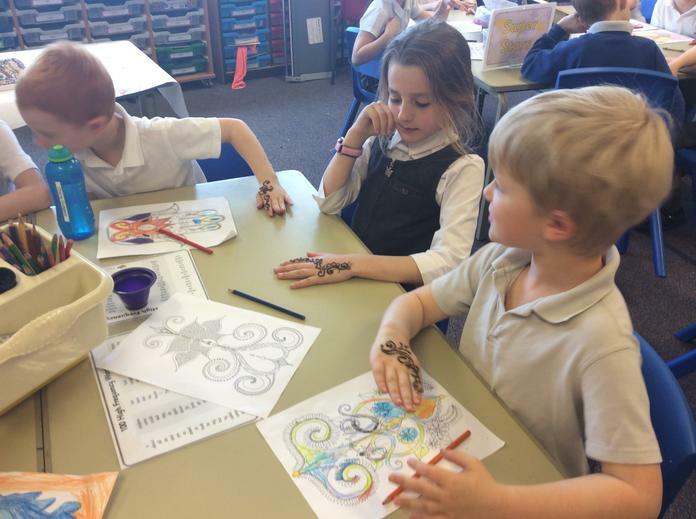 We learned about the Hindu stories that people remember during this festival and how they celebrate it. 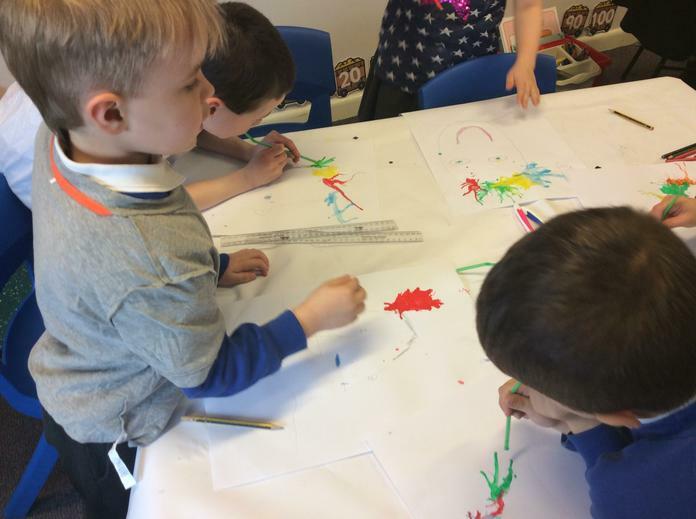 One way they celebrate is people throwing coloured water and powder paint at each other as part of their celebrations. 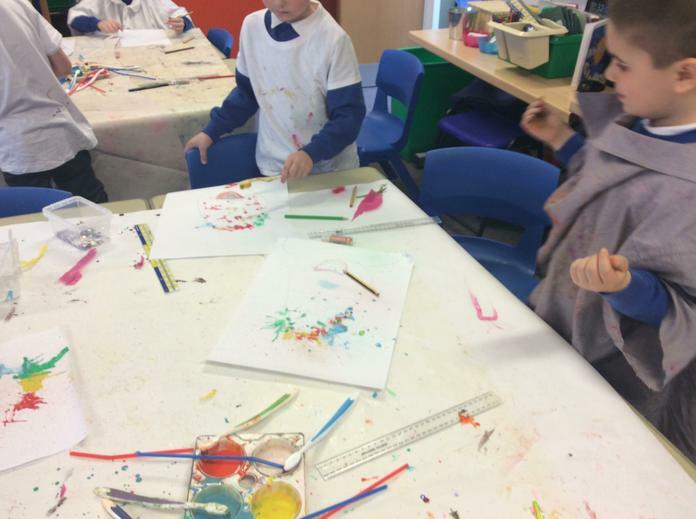 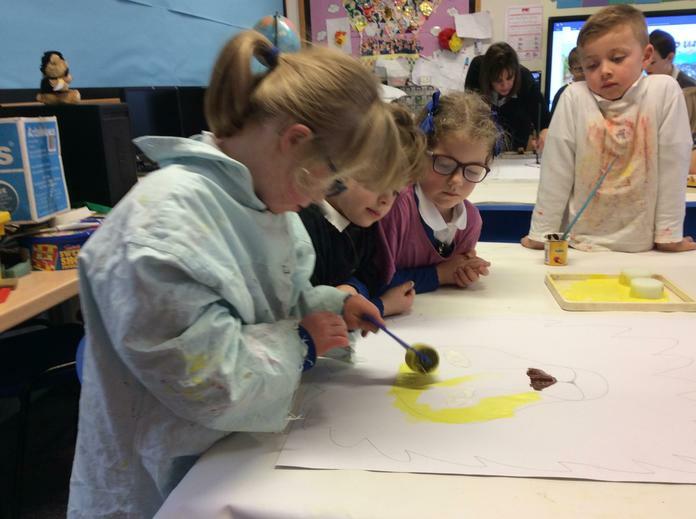 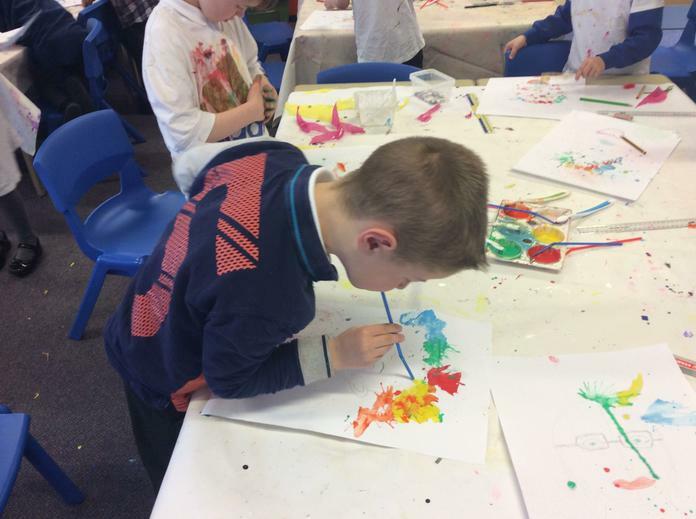 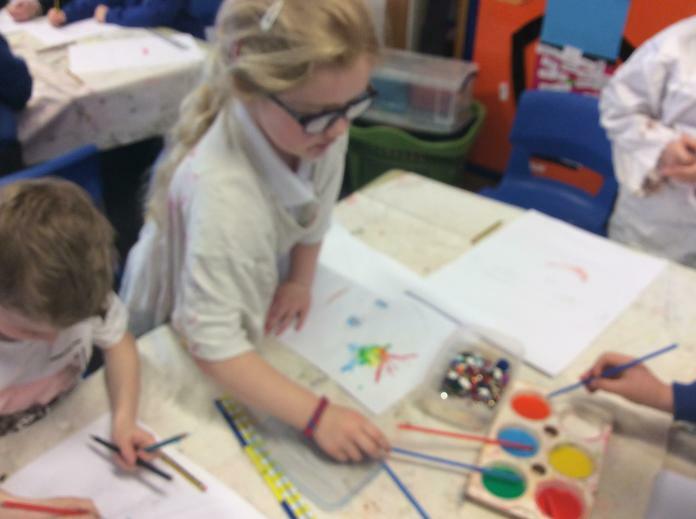 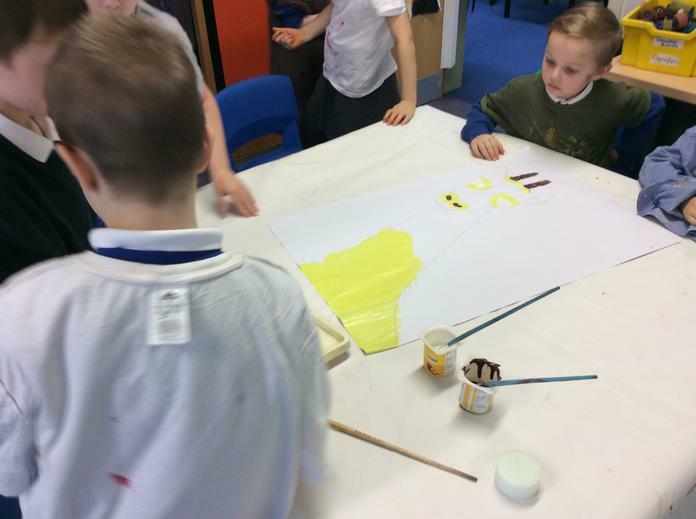 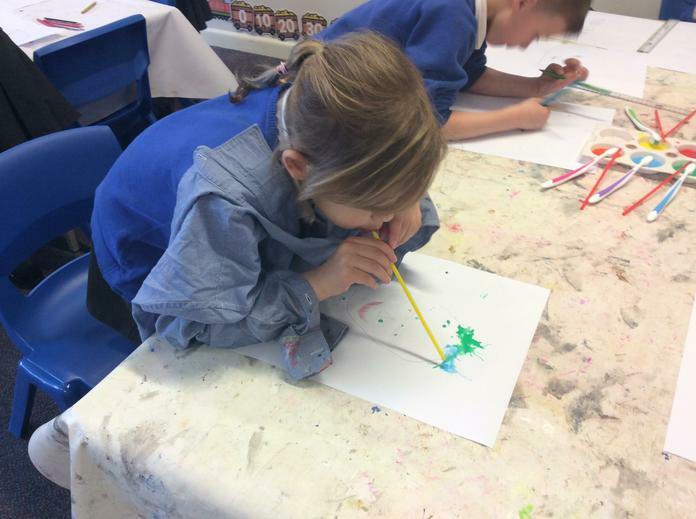 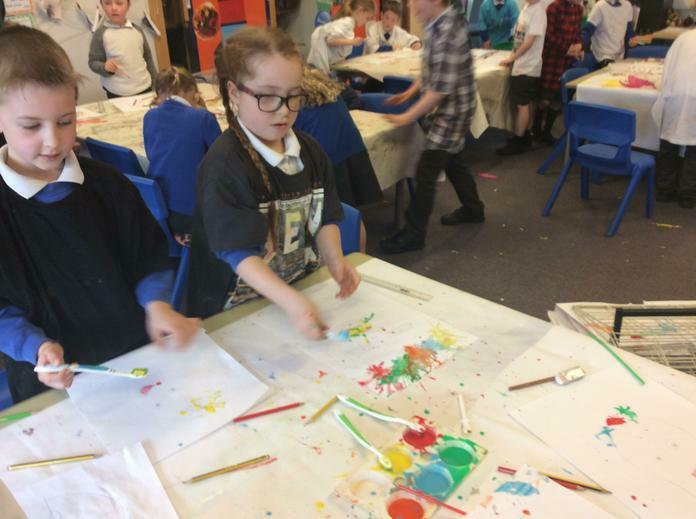 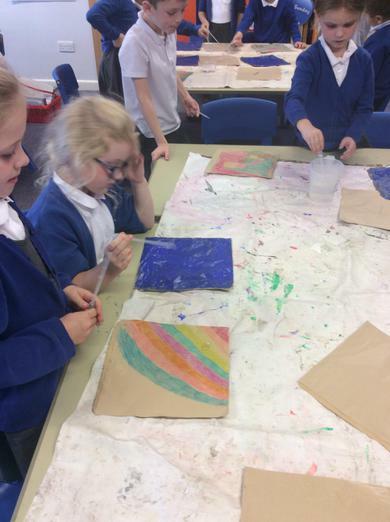 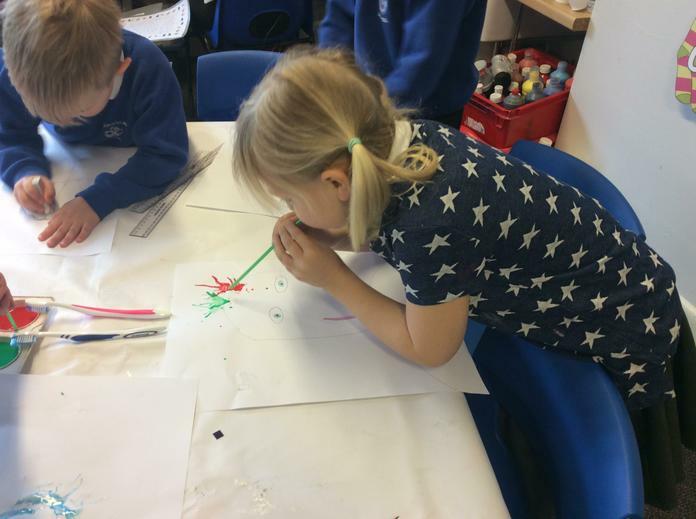 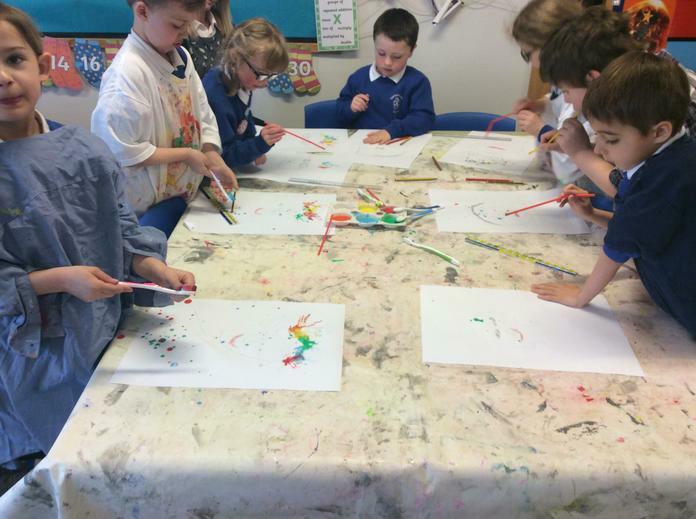 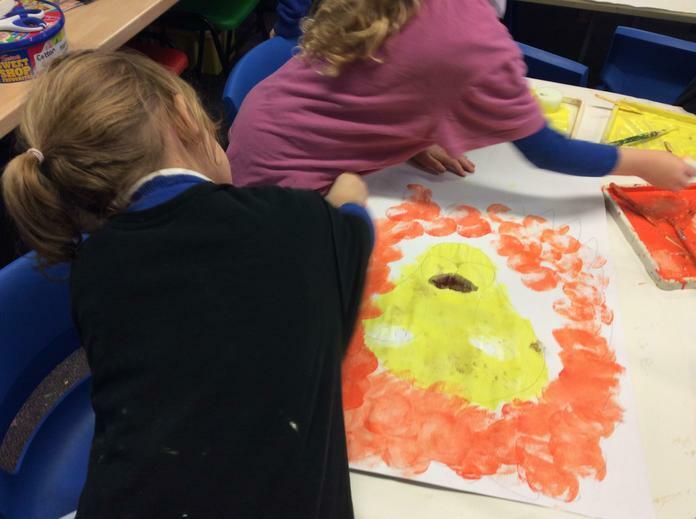 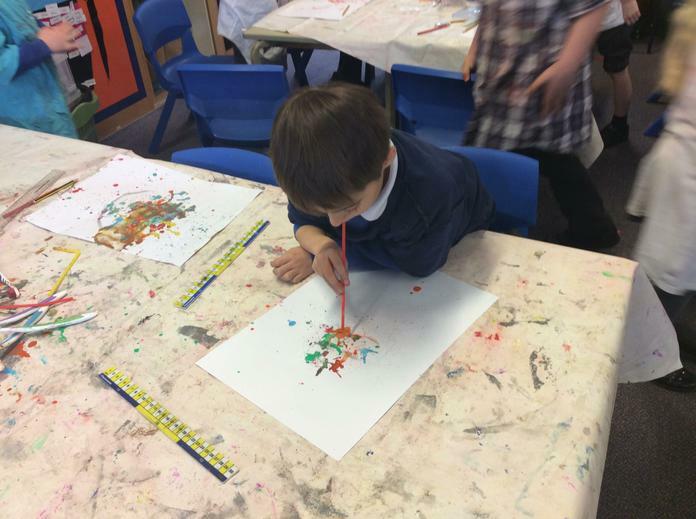 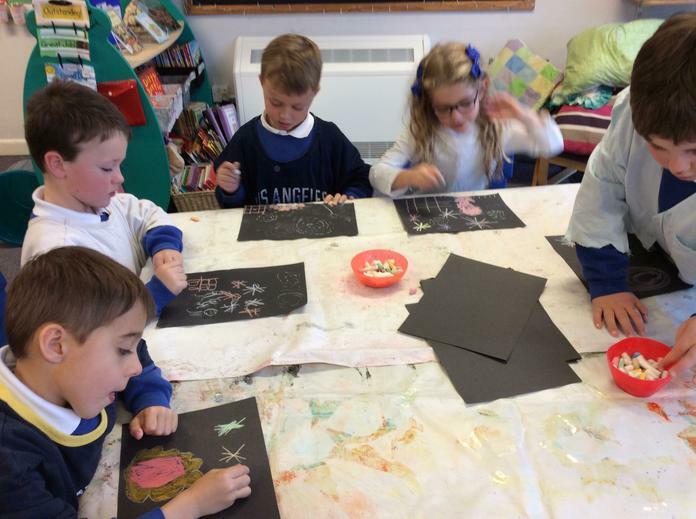 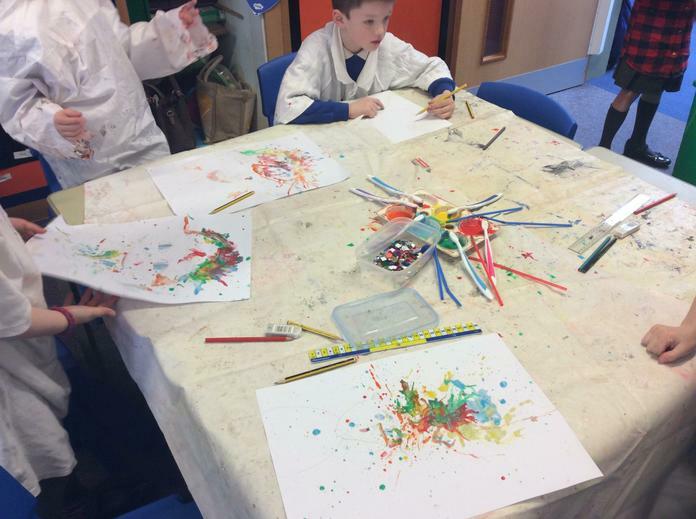 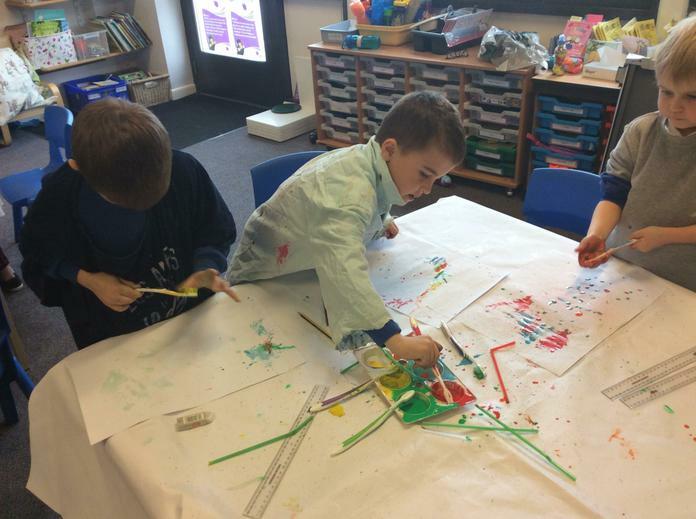 We drew a self portrait and add hair by blowing paint and flicking paint across it like the celebrations of Holi. 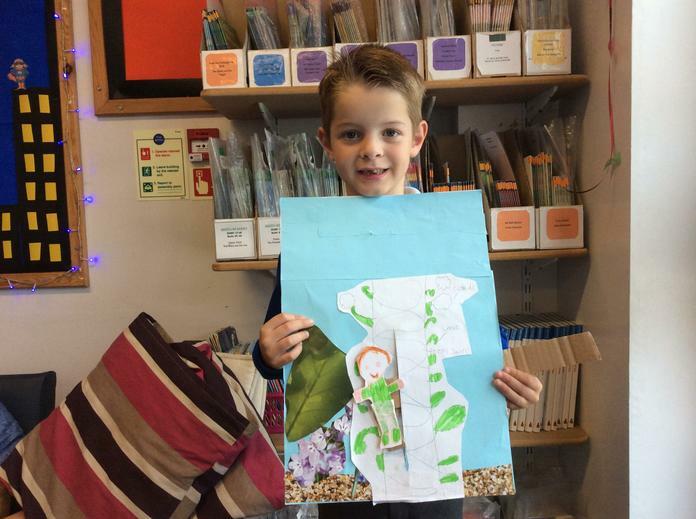 We have made a festival elephant using a plastic milk bottle. 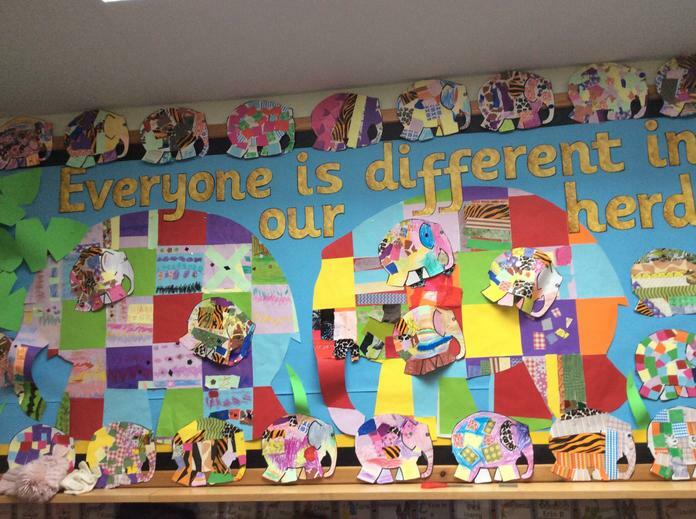 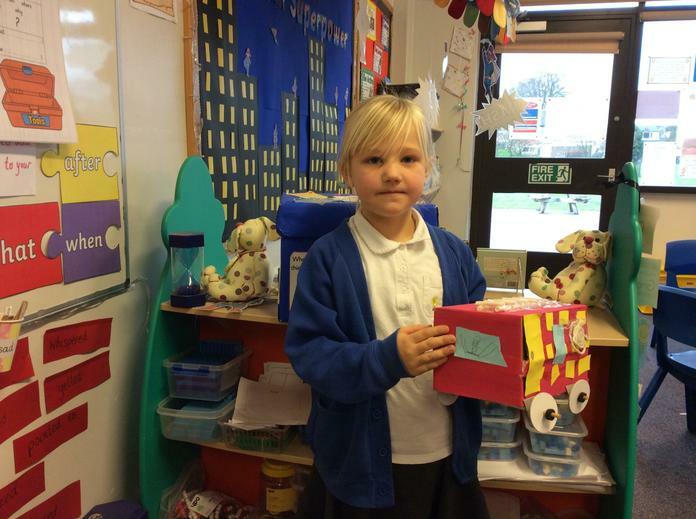 We have learned how elephants are decorated for special occasions and some festivals. 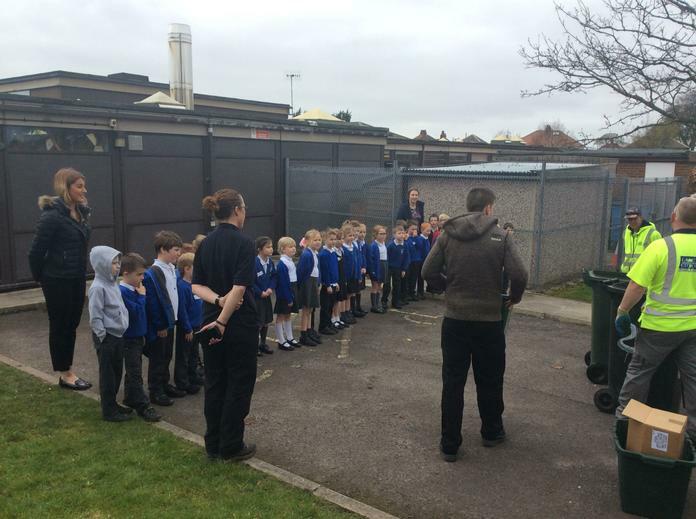 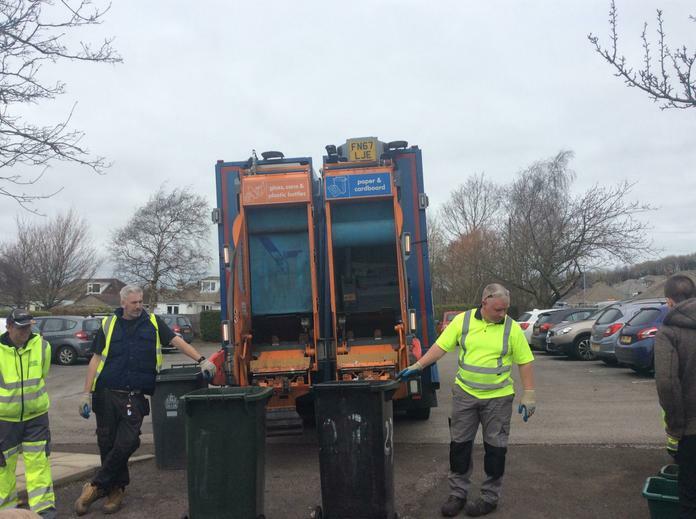 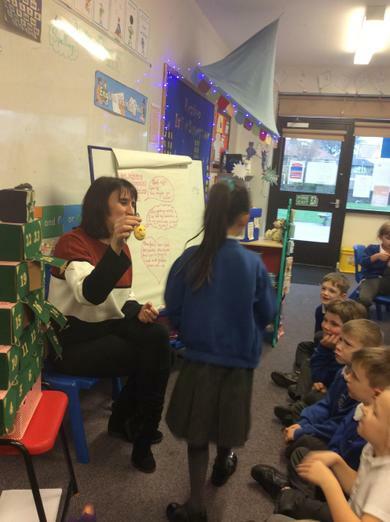 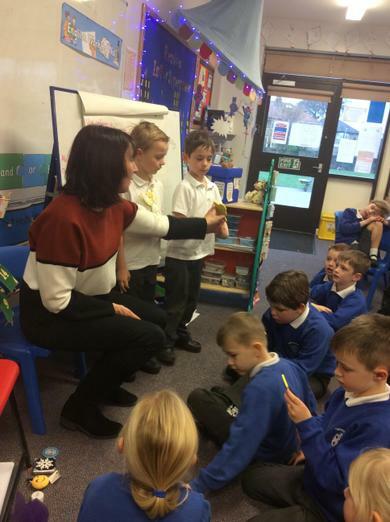 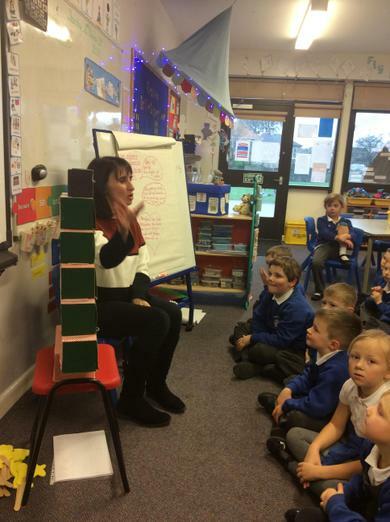 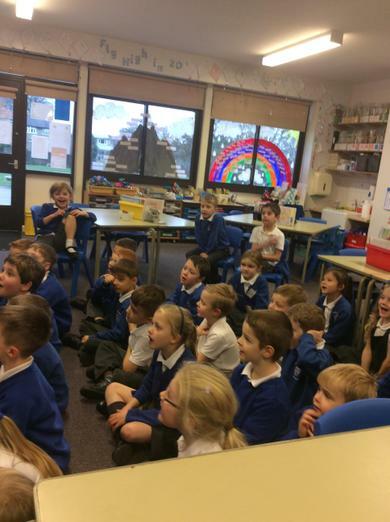 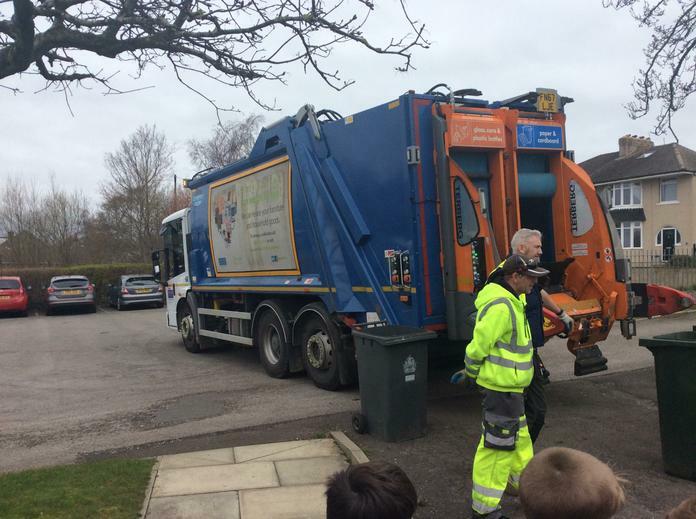 During recycling week, one of Lancashire County Council recycling crew visited Year 2. 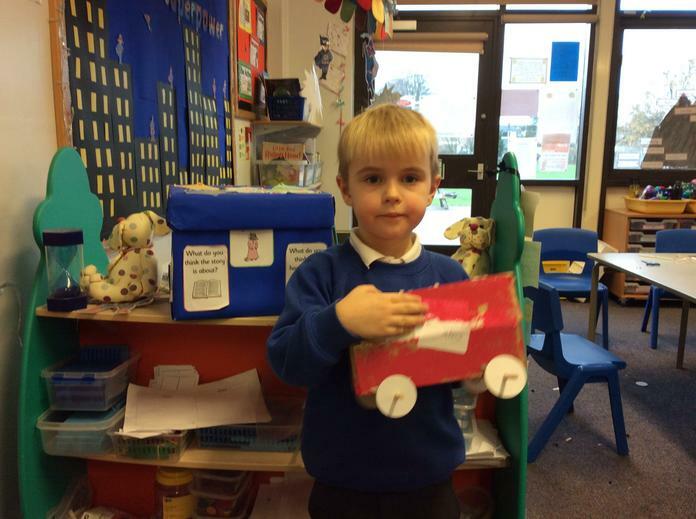 We found out how the truck worked and the importance of reducing, recycling and reusing. 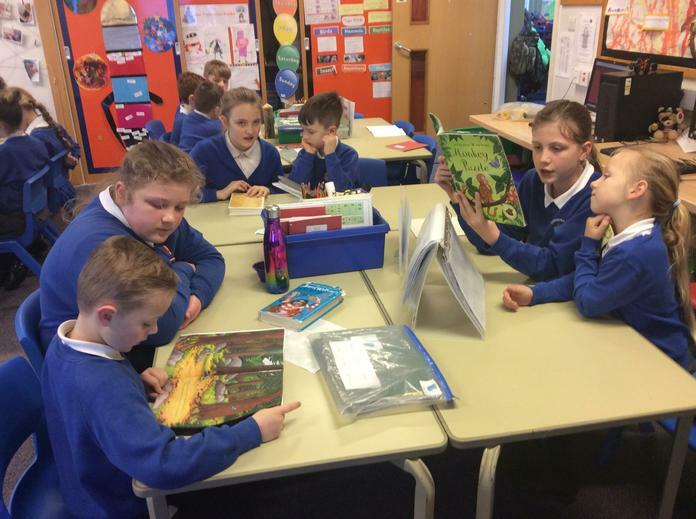 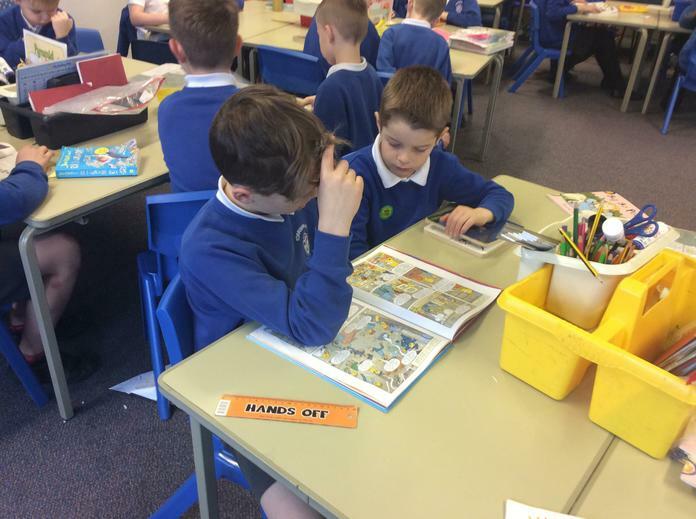 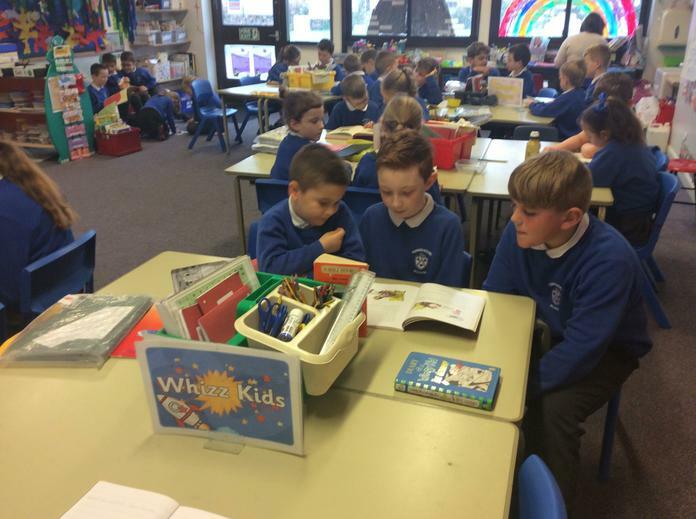 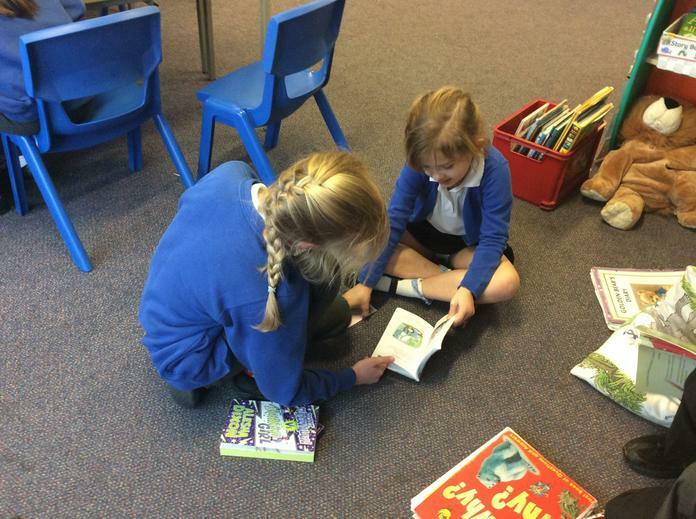 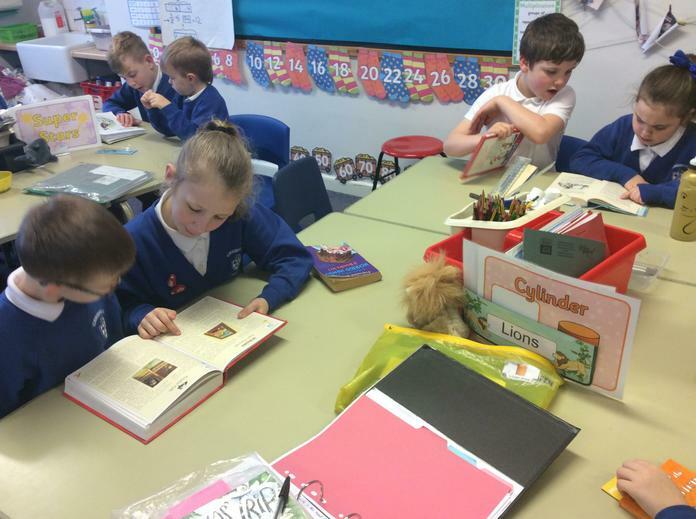 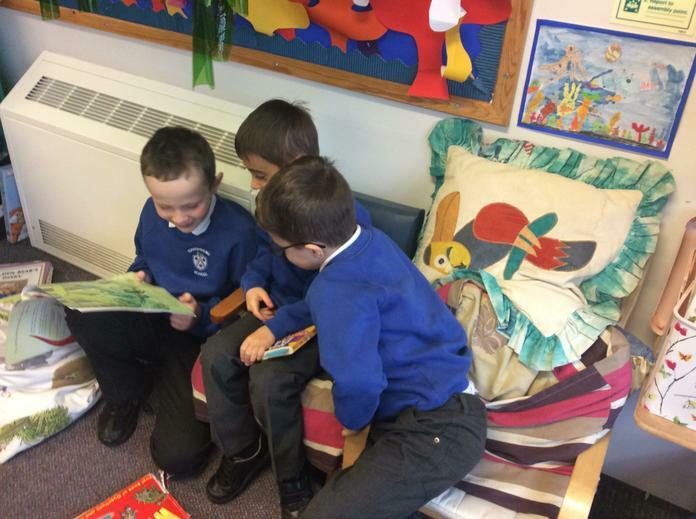 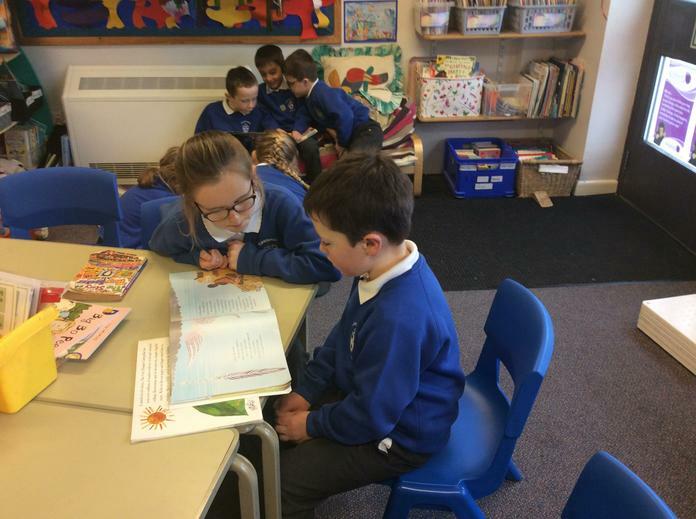 During World Book Day we shared our favourite books with Year 5. 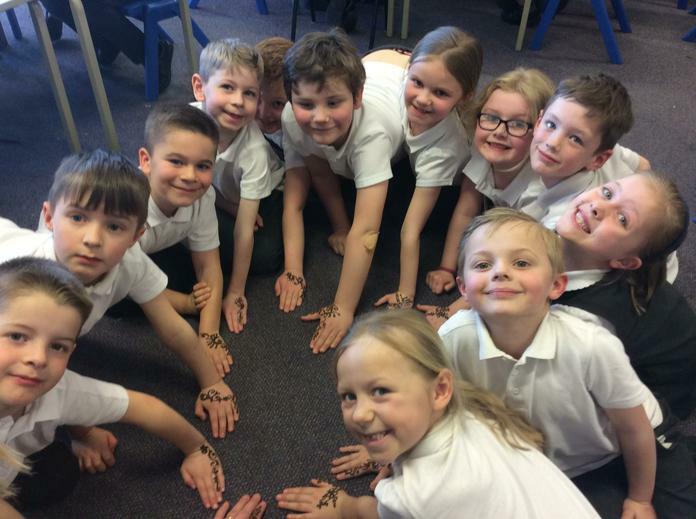 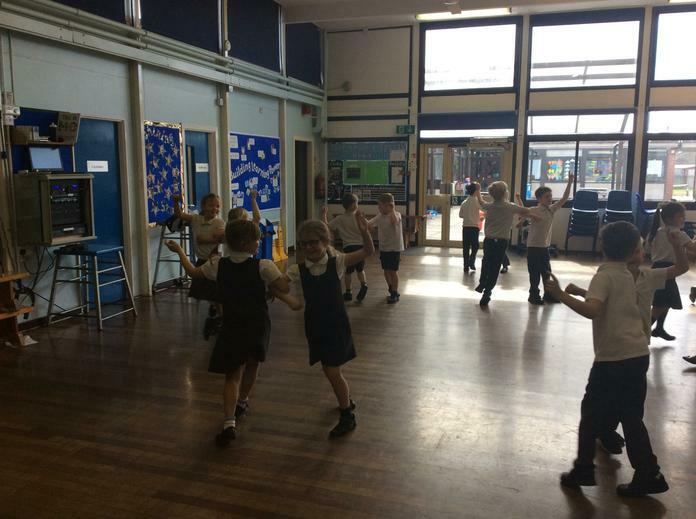 In RE we have been learning how Sikhs' worship. 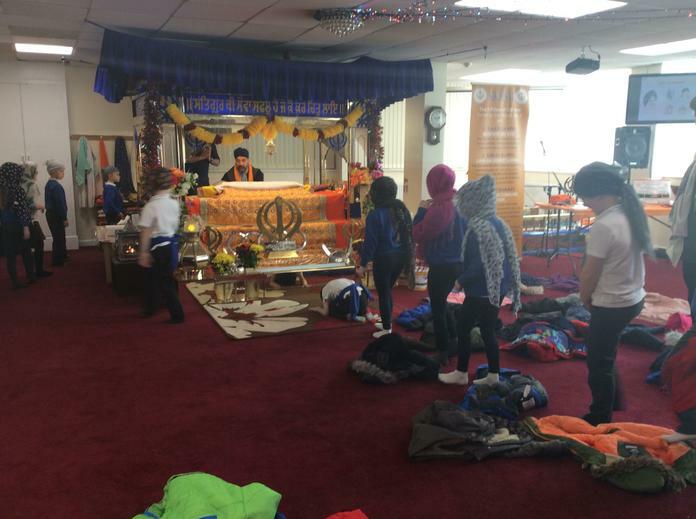 We visited a Sikh temple in Preston to find out more about how they worship. 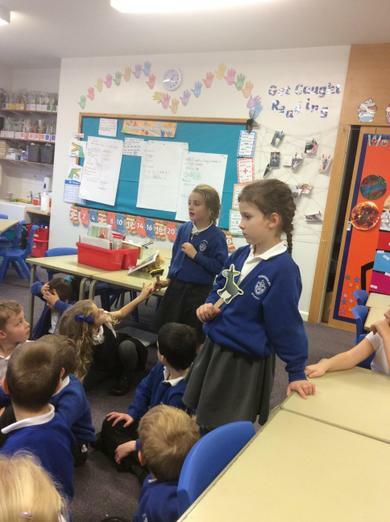 Thank you for welcoming us. 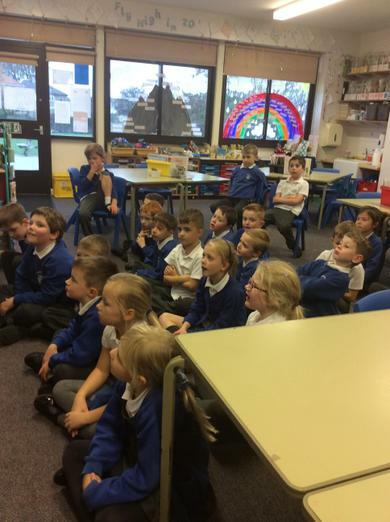 We learned lots of new information. 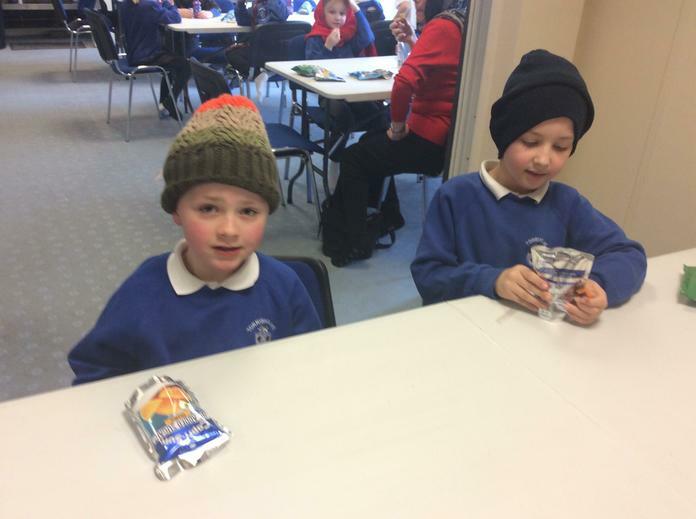 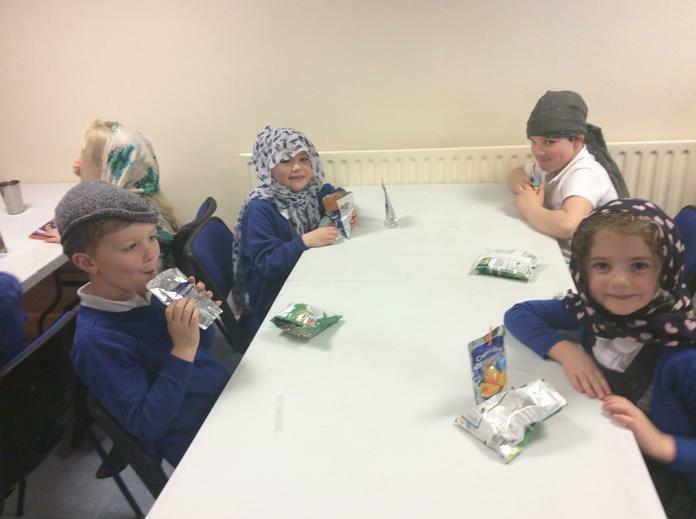 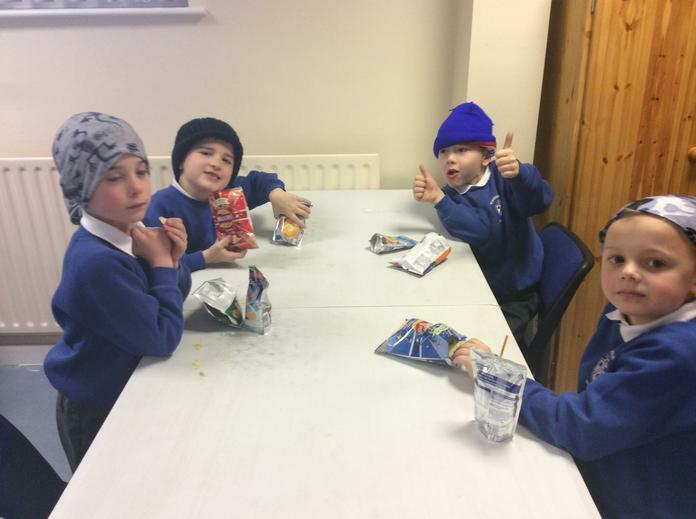 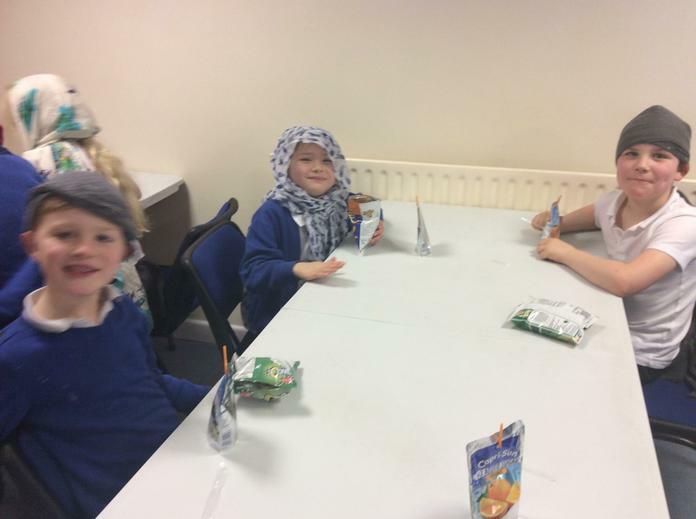 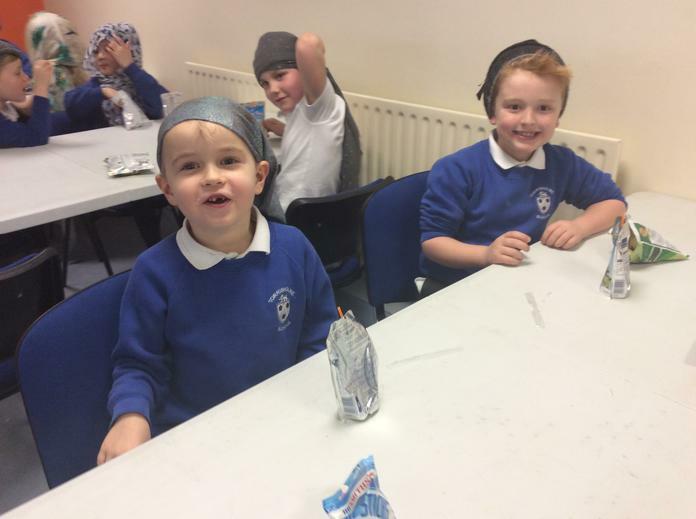 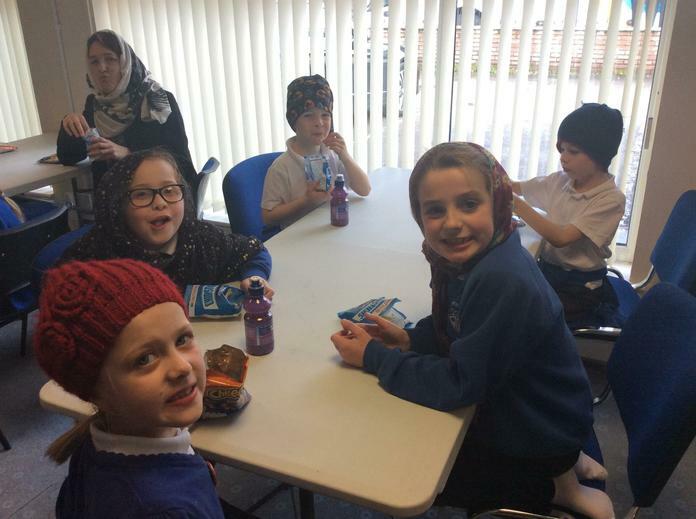 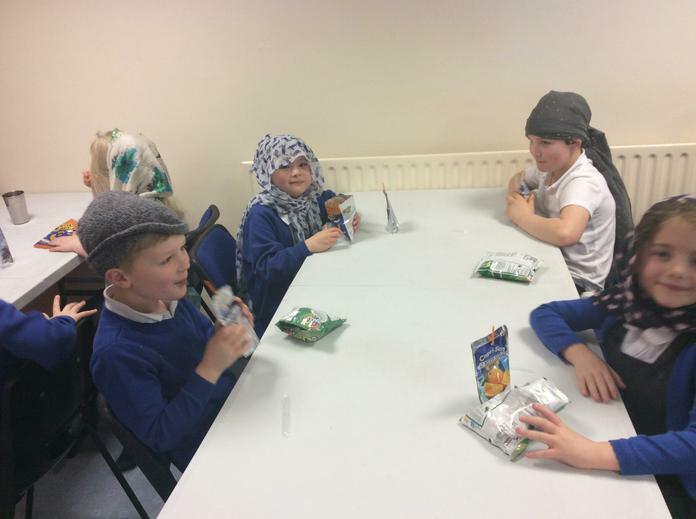 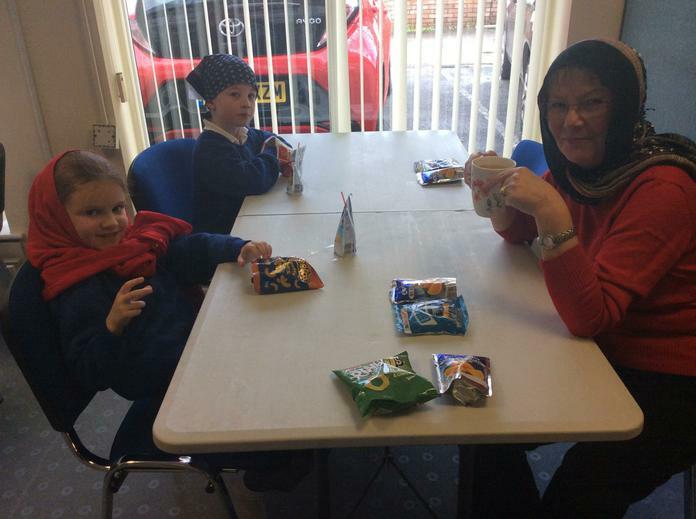 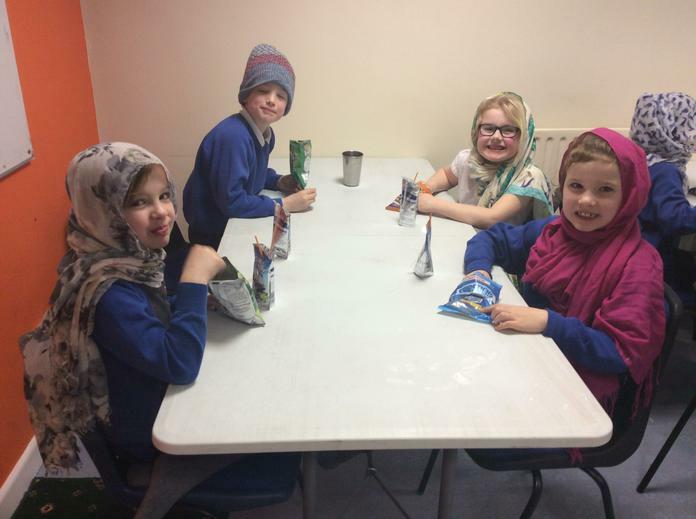 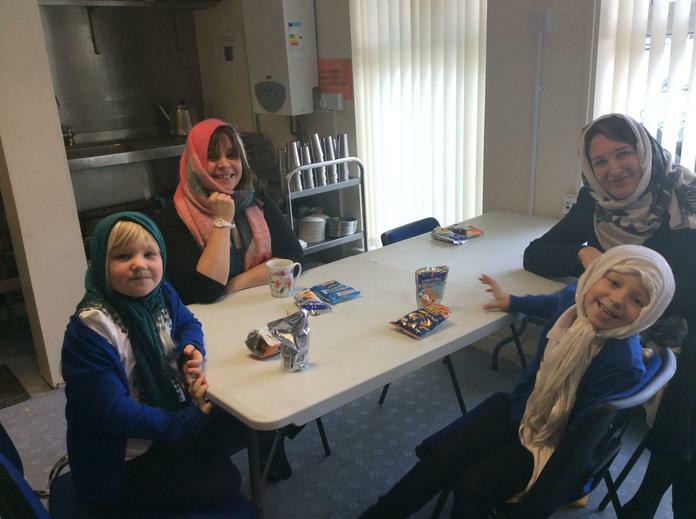 We enjoyed sharing a snack in the Langar. 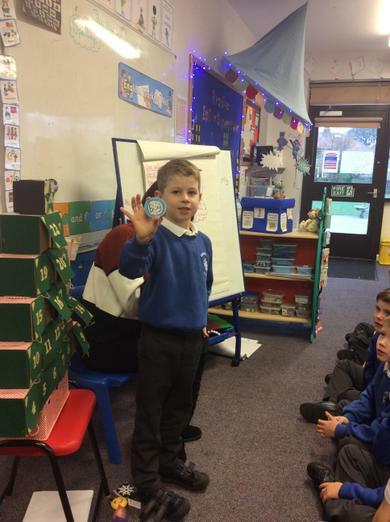 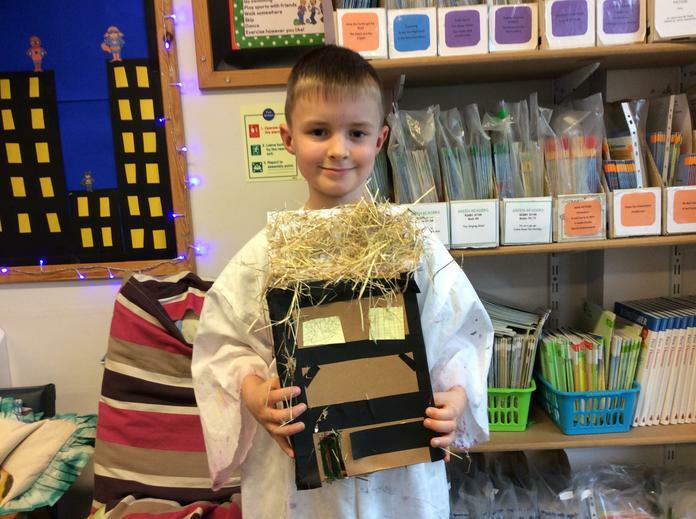 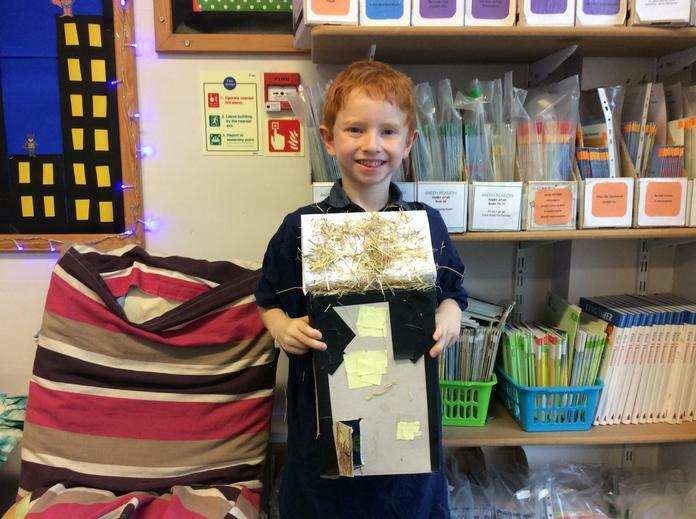 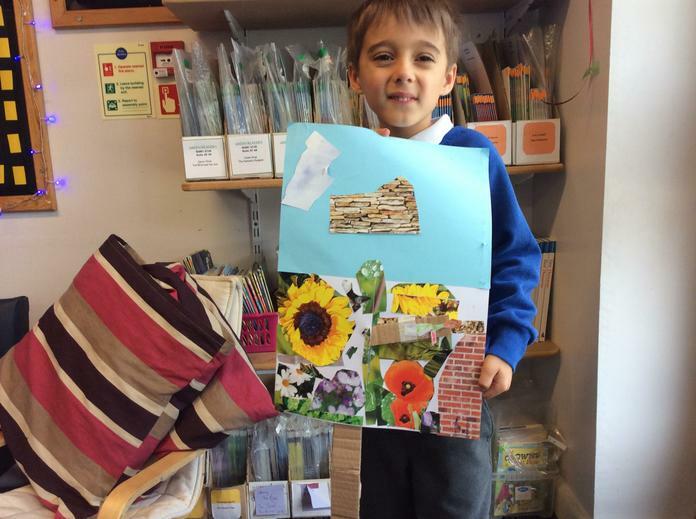 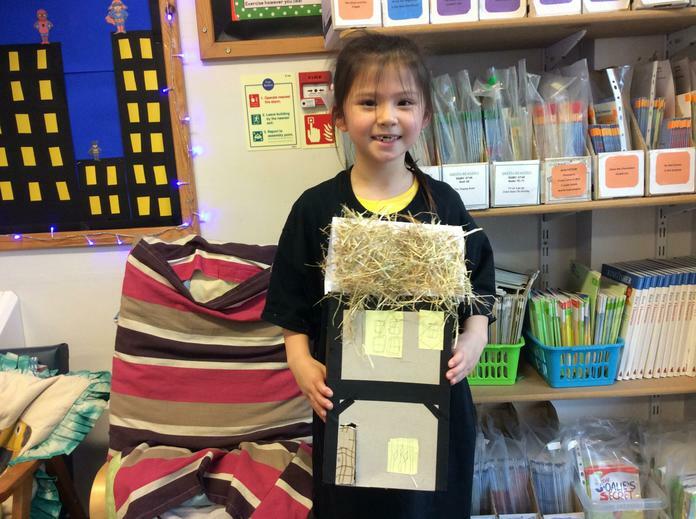 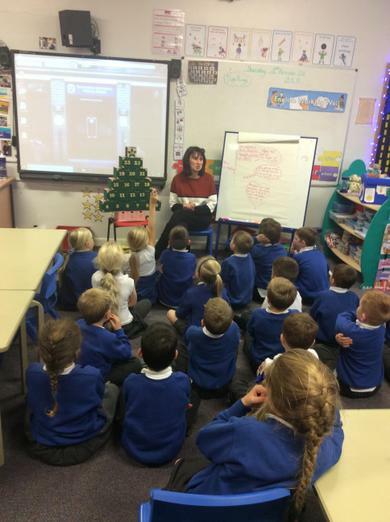 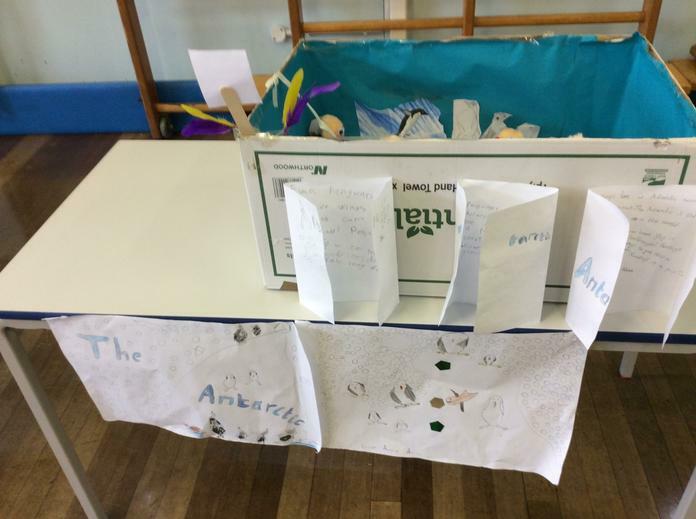 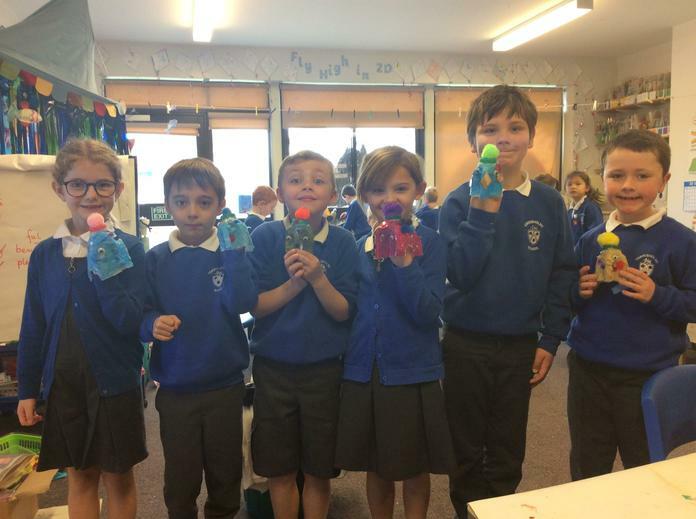 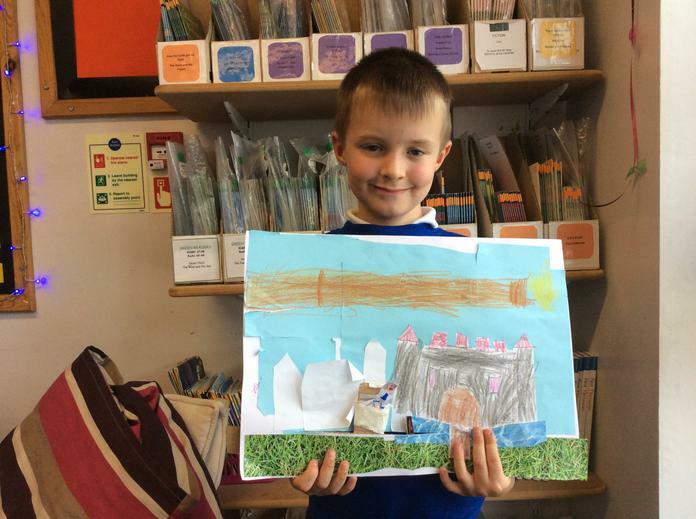 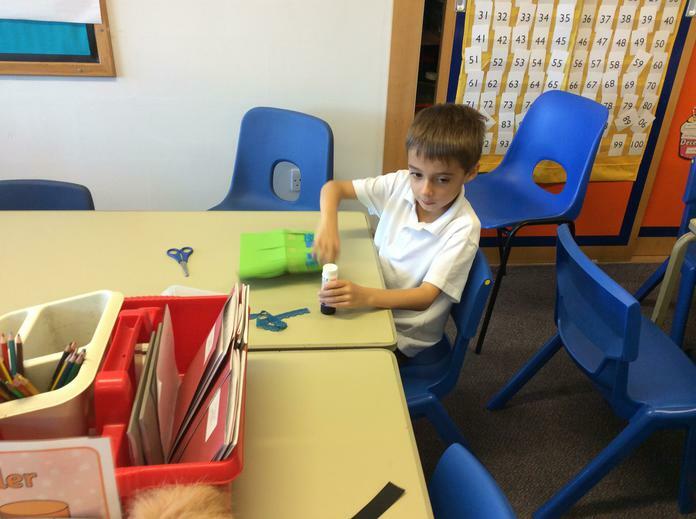 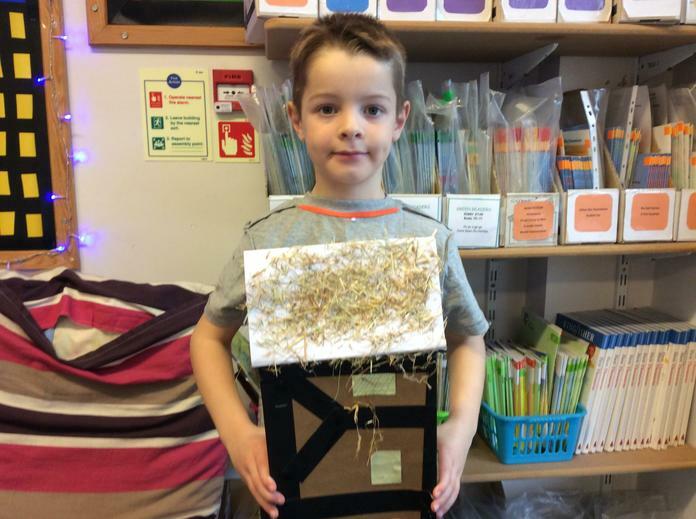 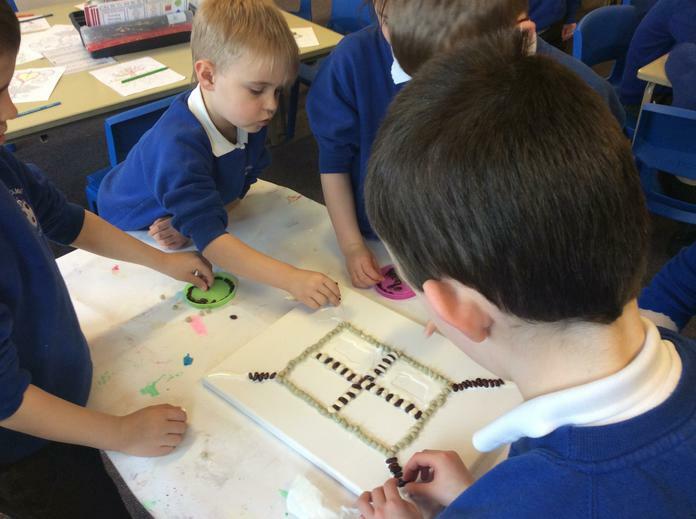 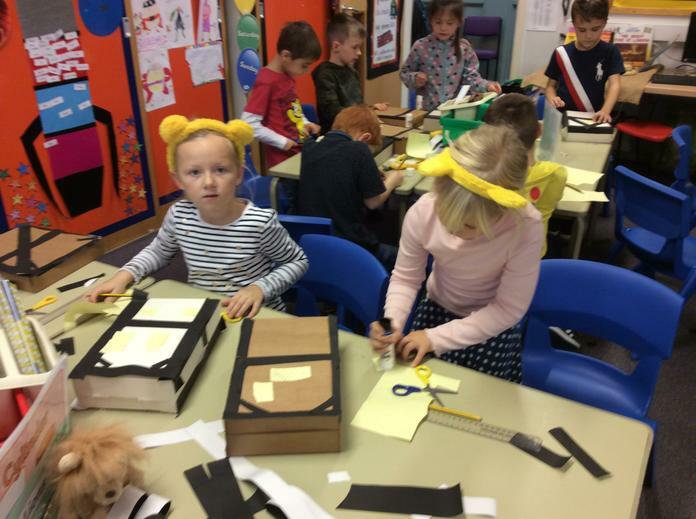 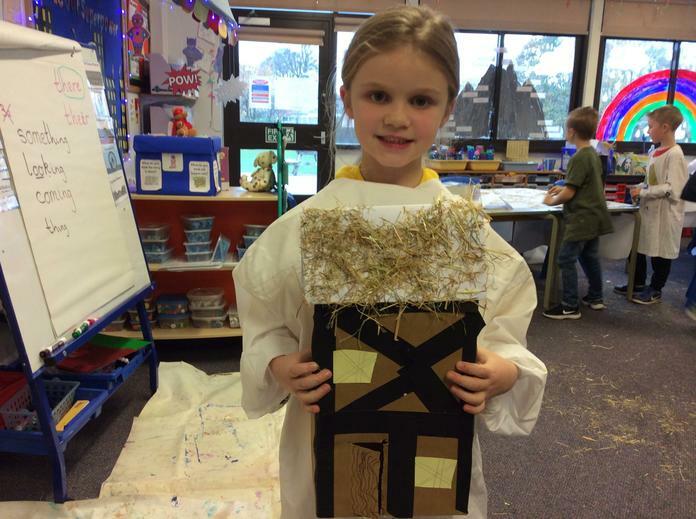 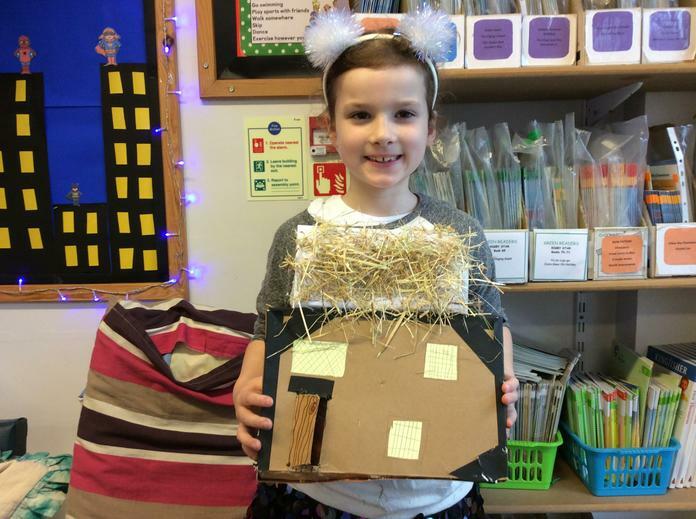 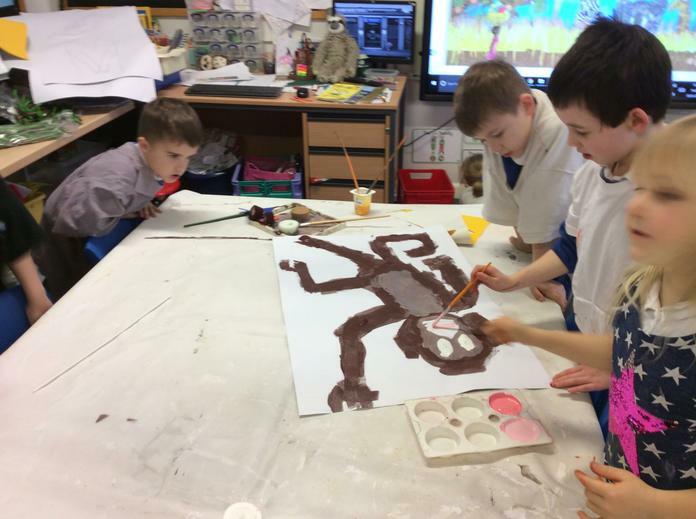 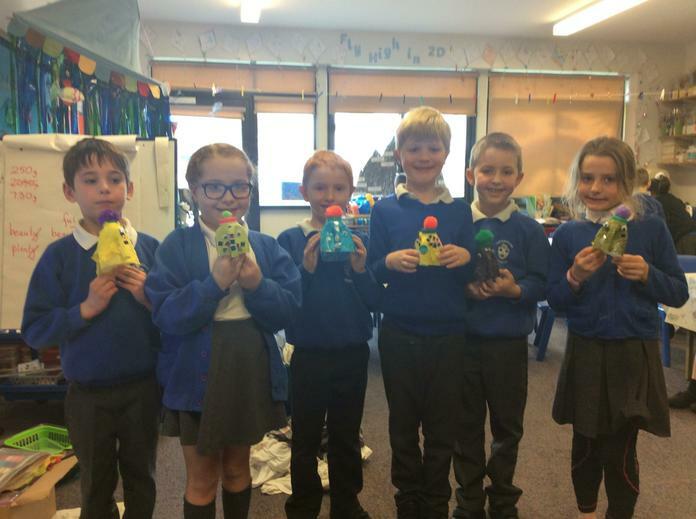 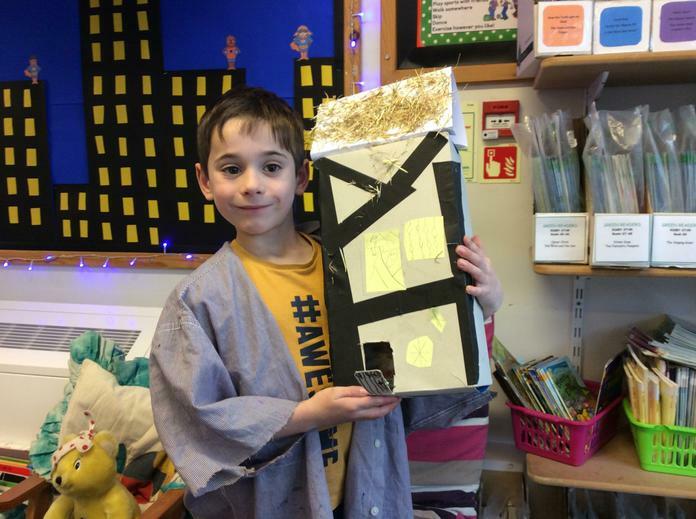 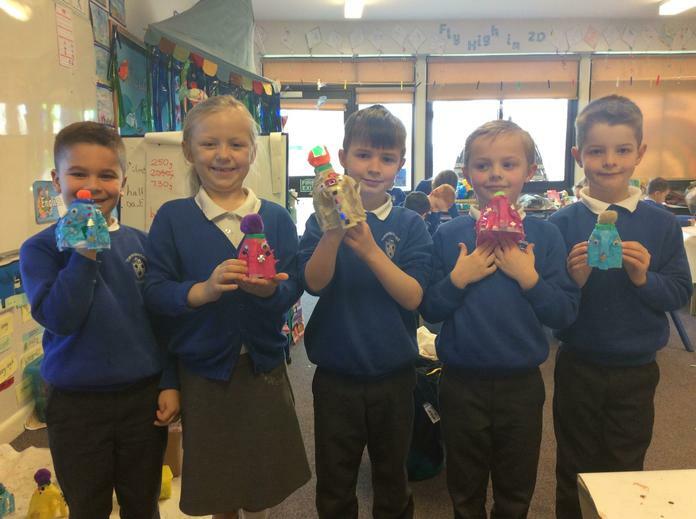 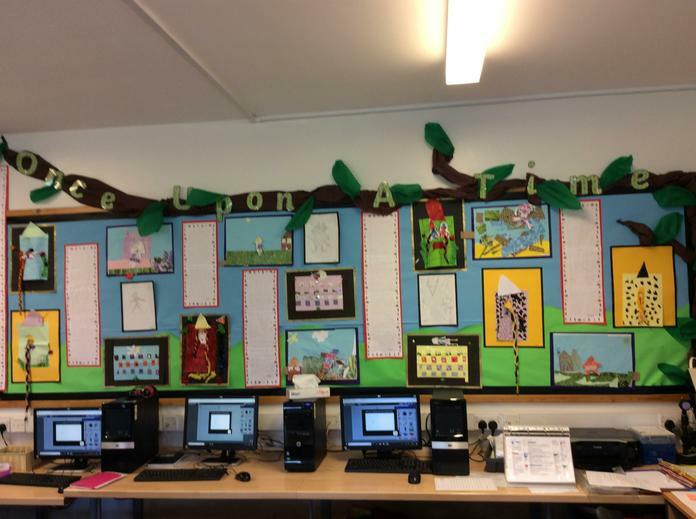 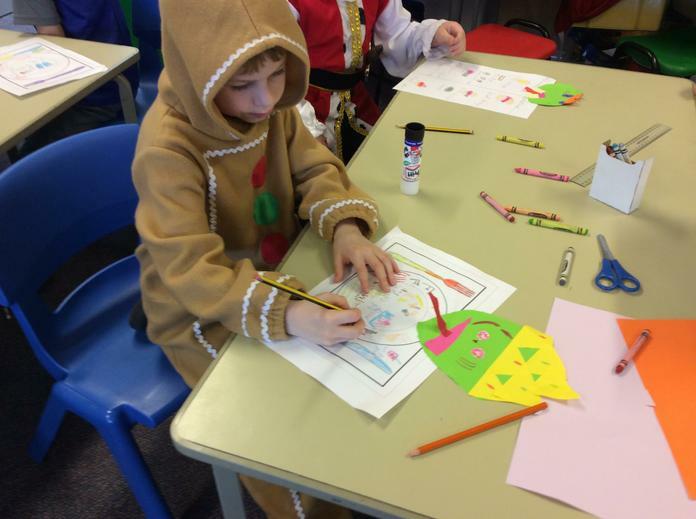 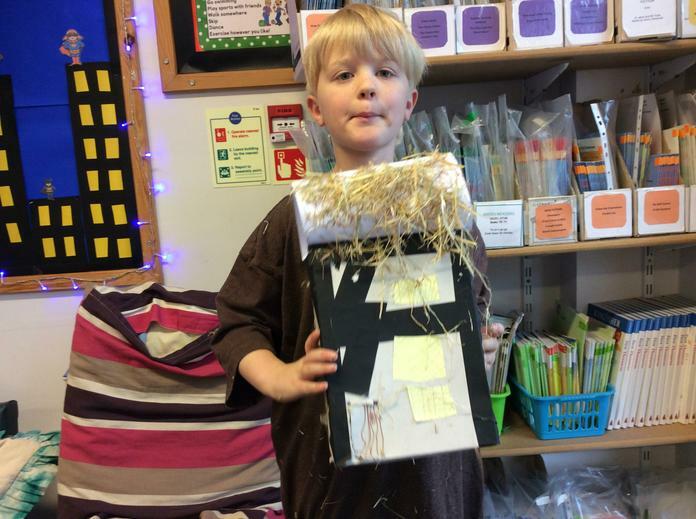 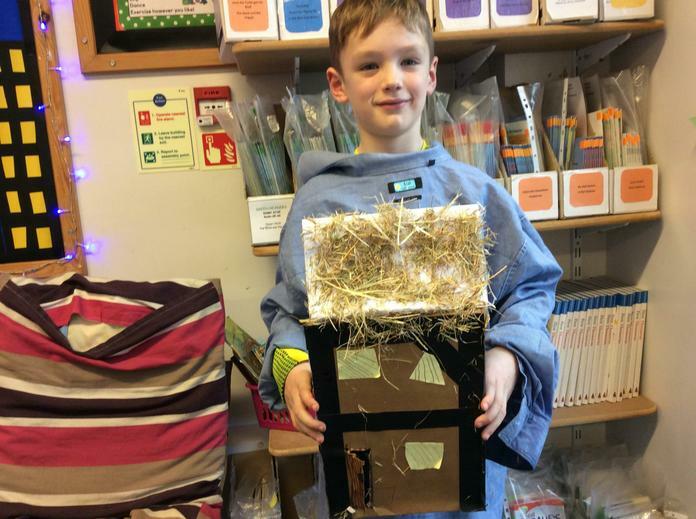 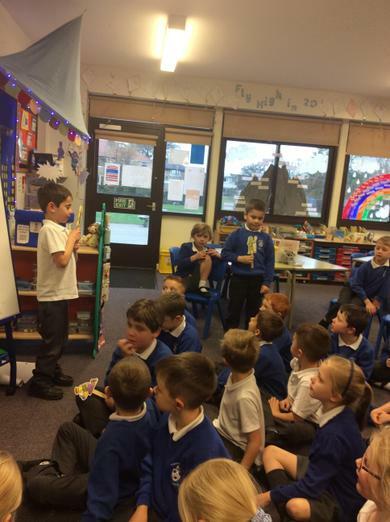 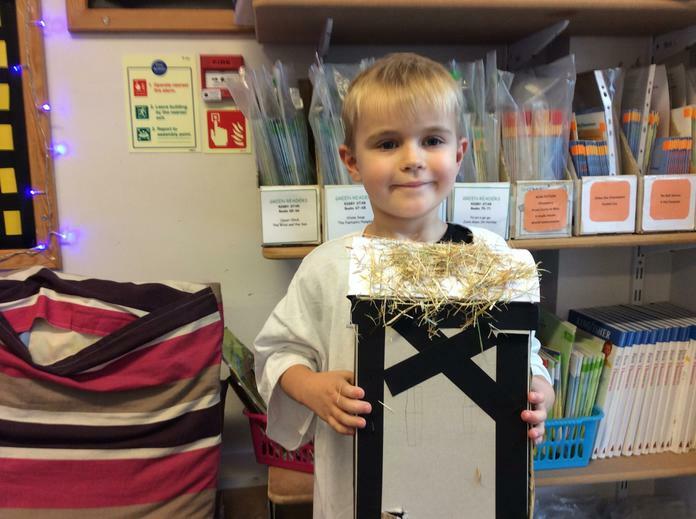 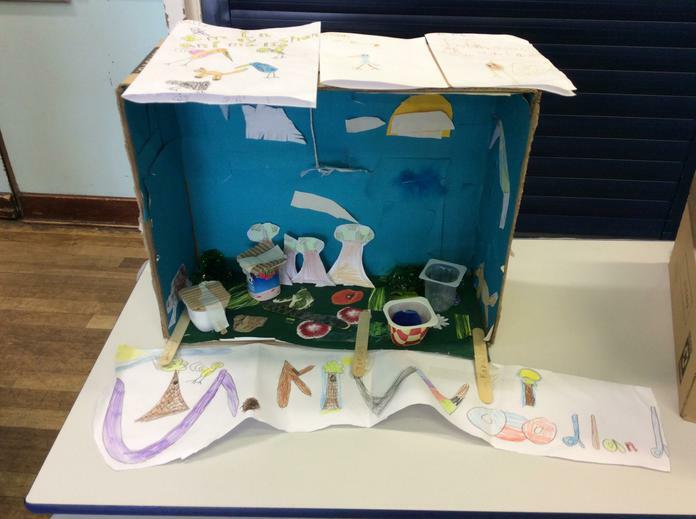 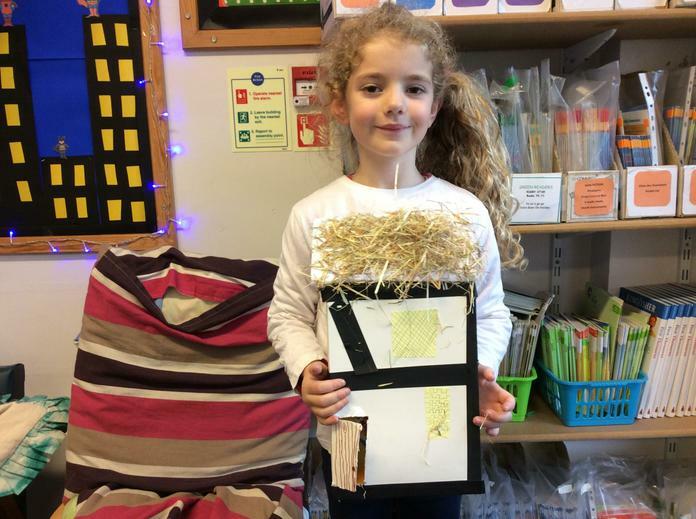 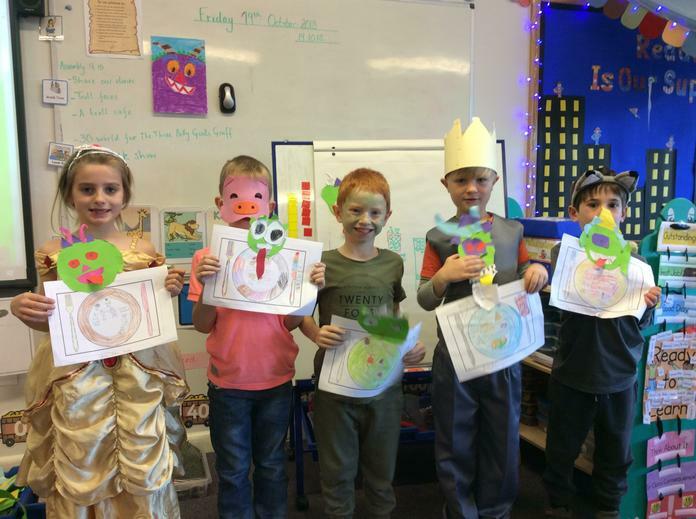 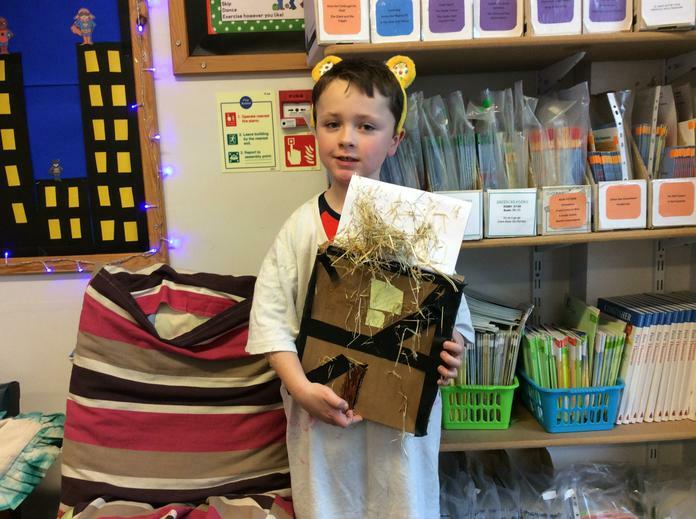 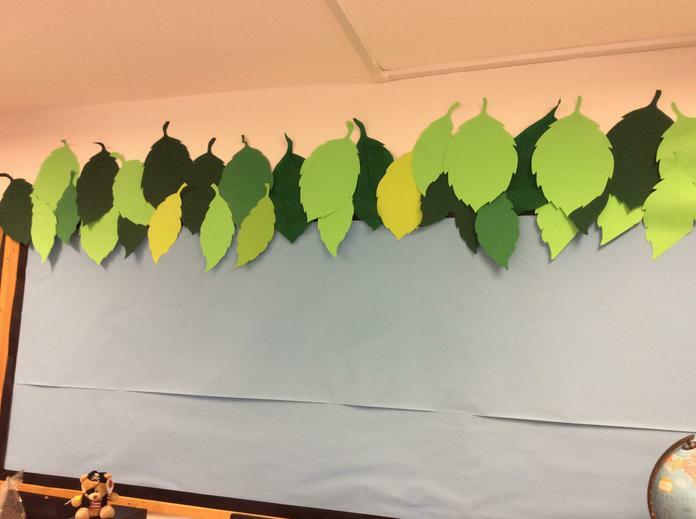 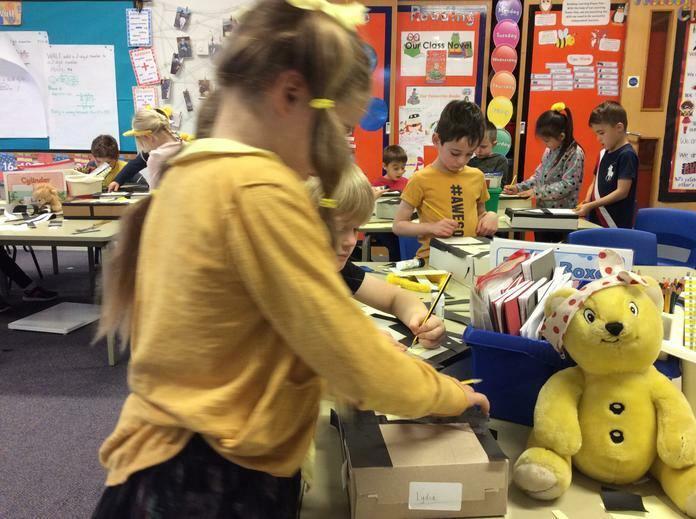 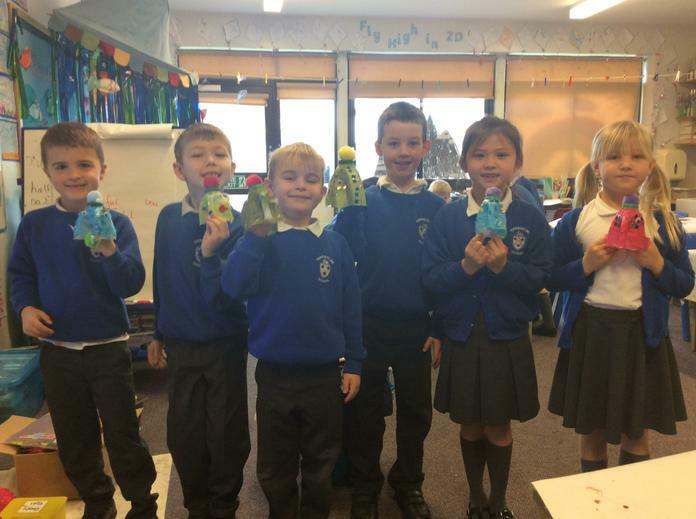 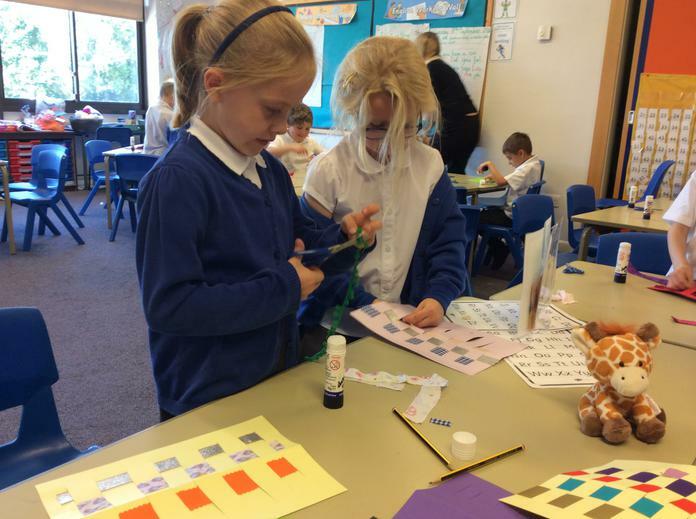 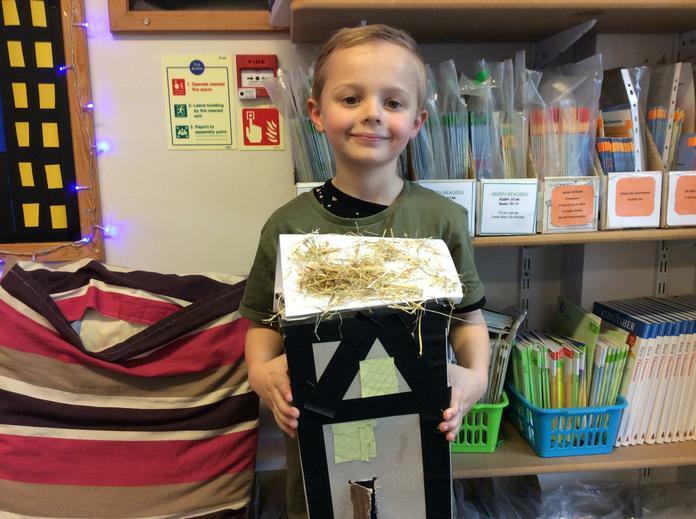 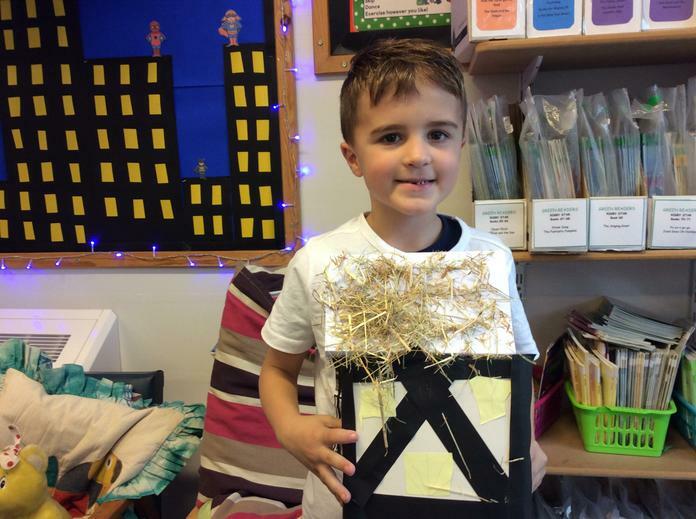 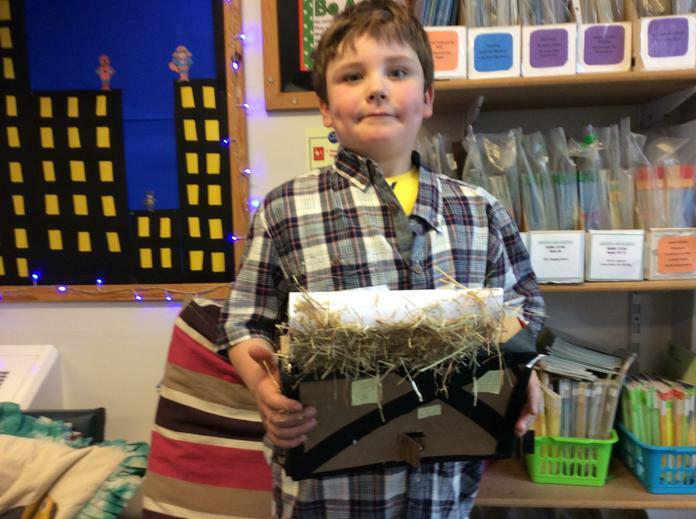 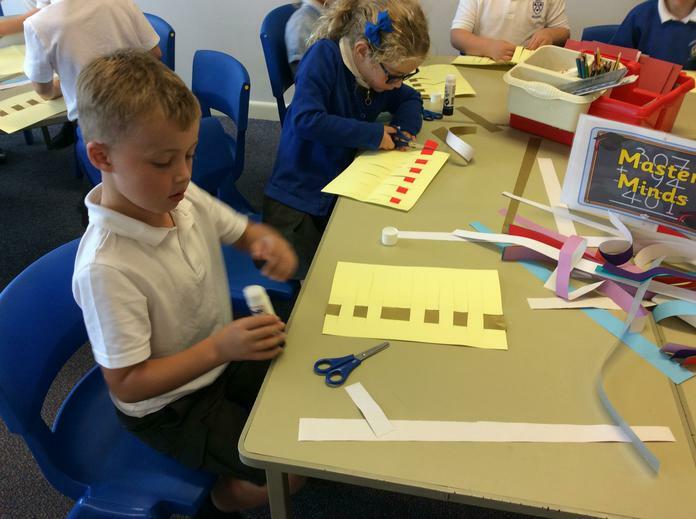 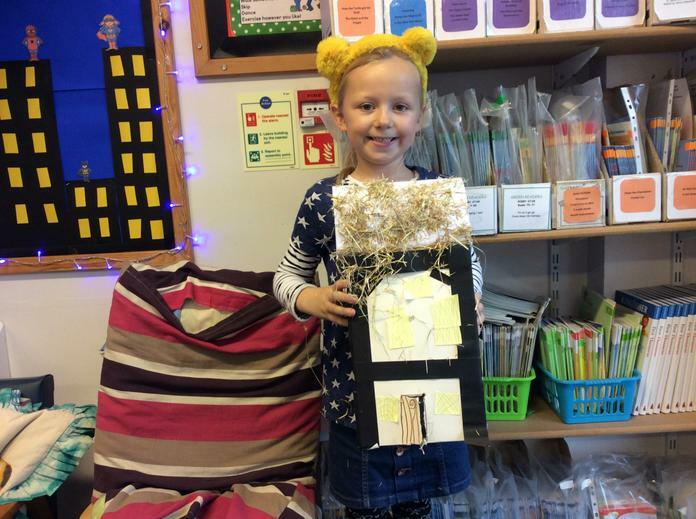 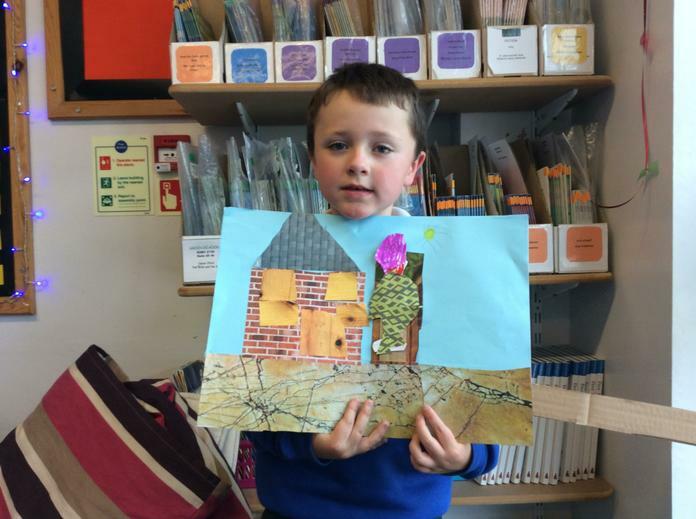 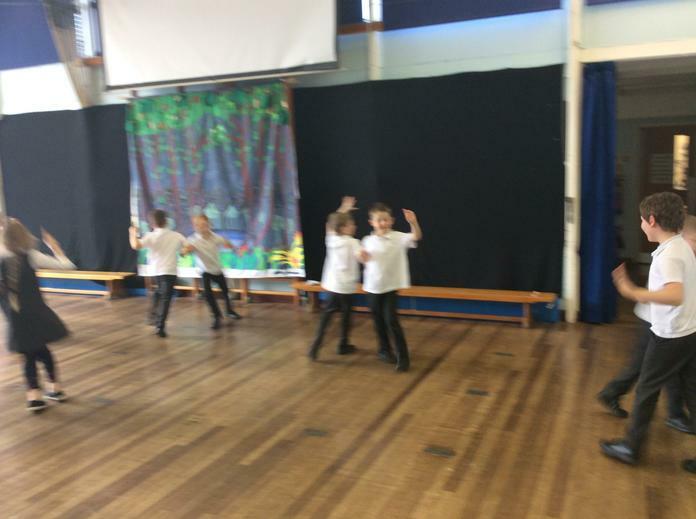 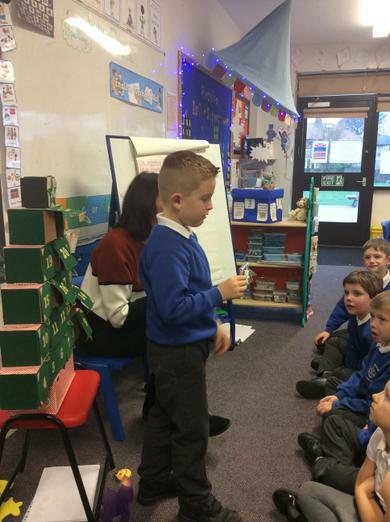 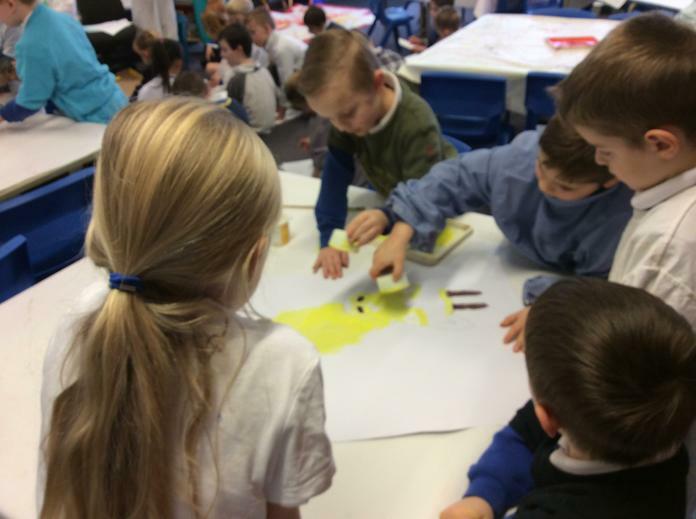 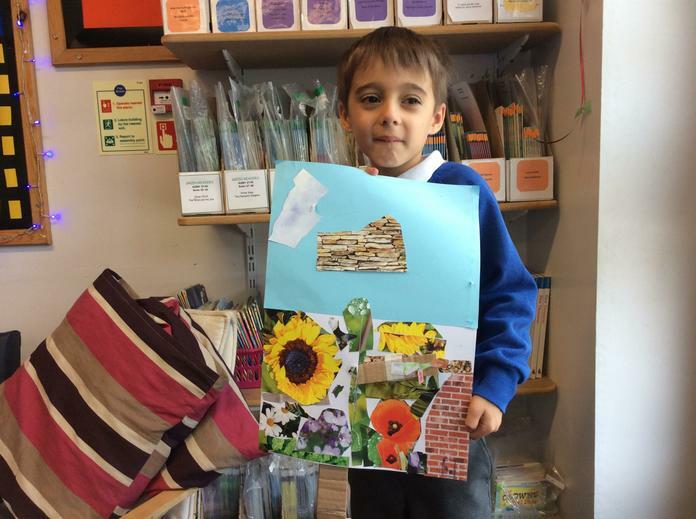 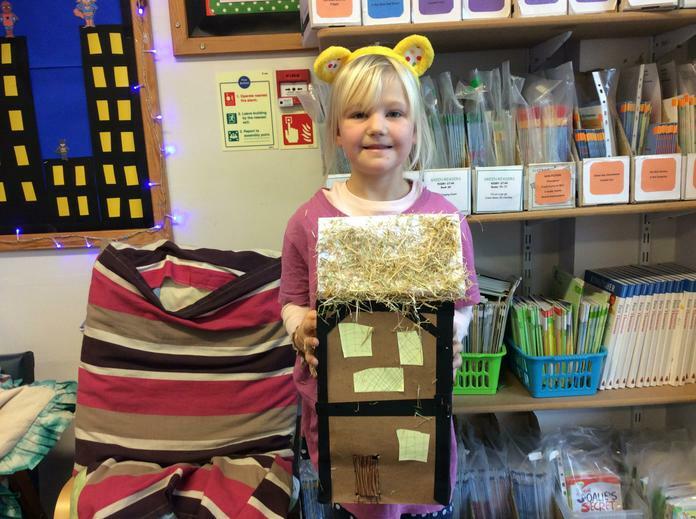 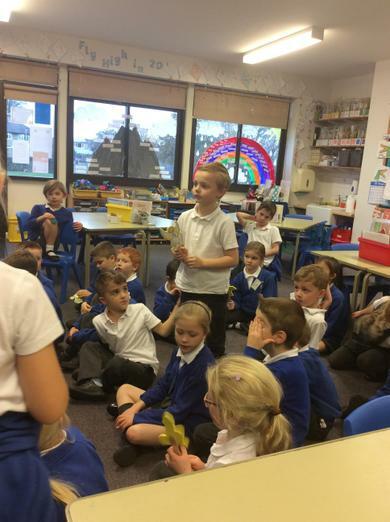 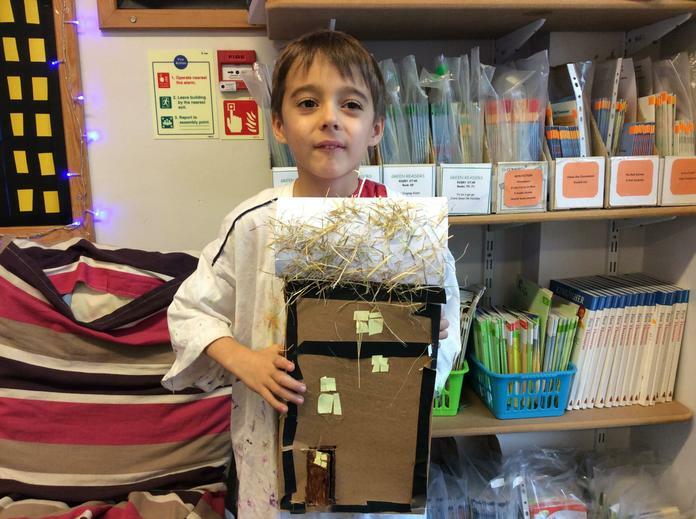 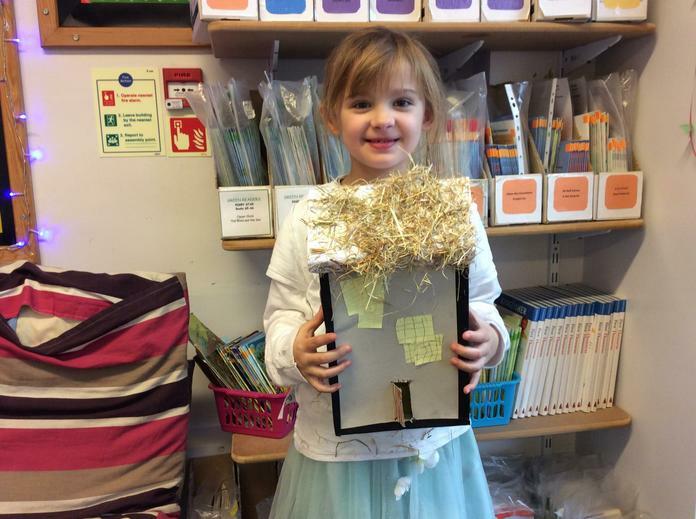 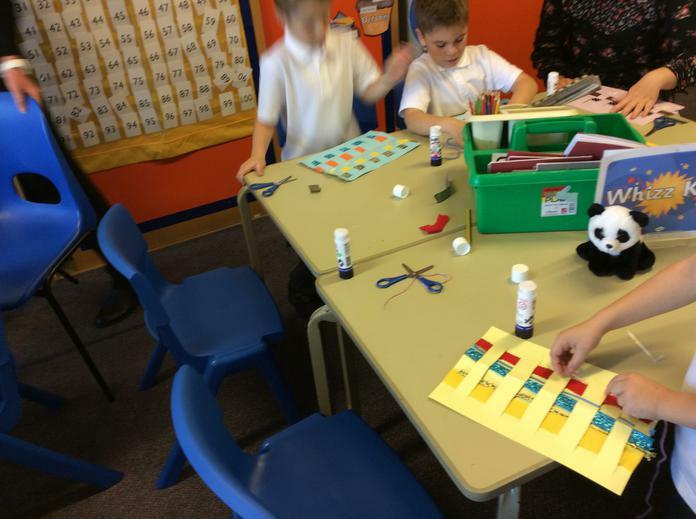 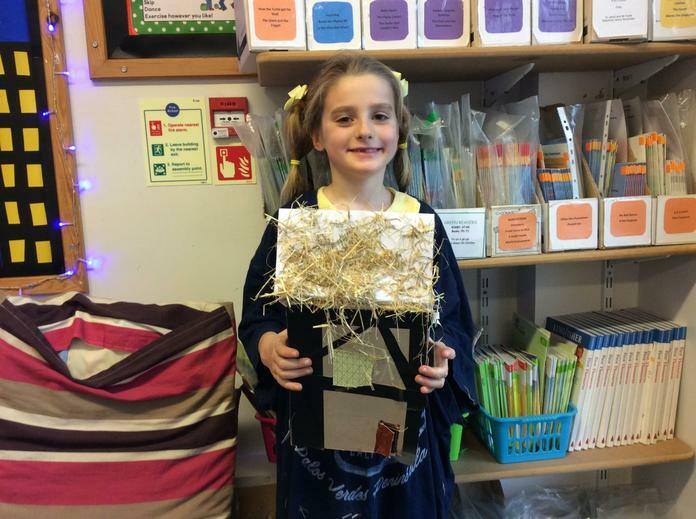 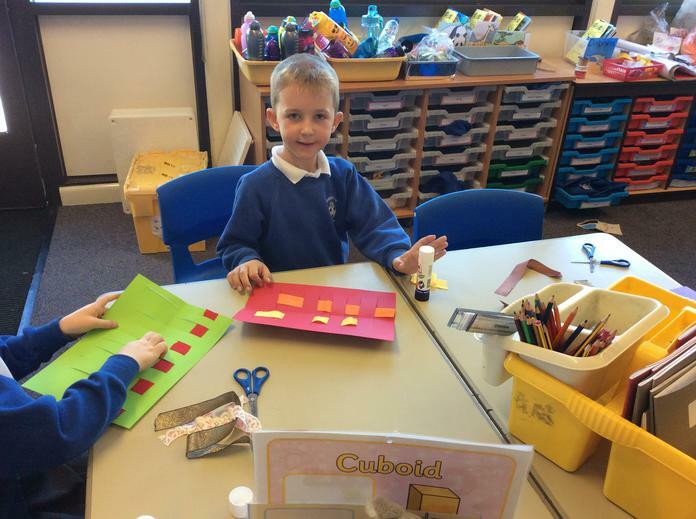 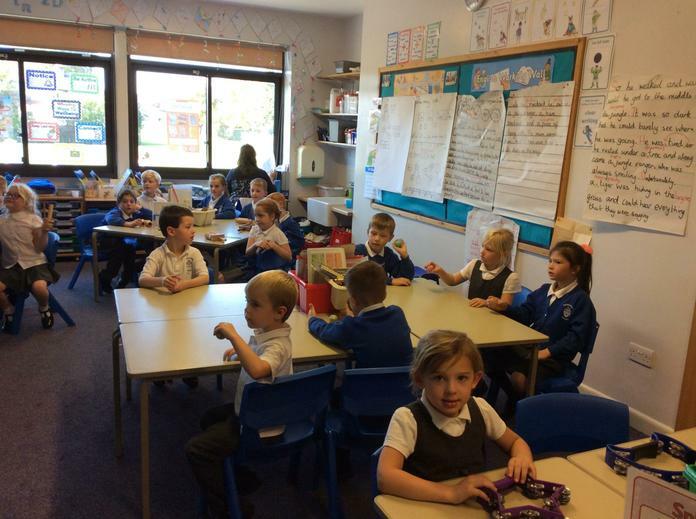 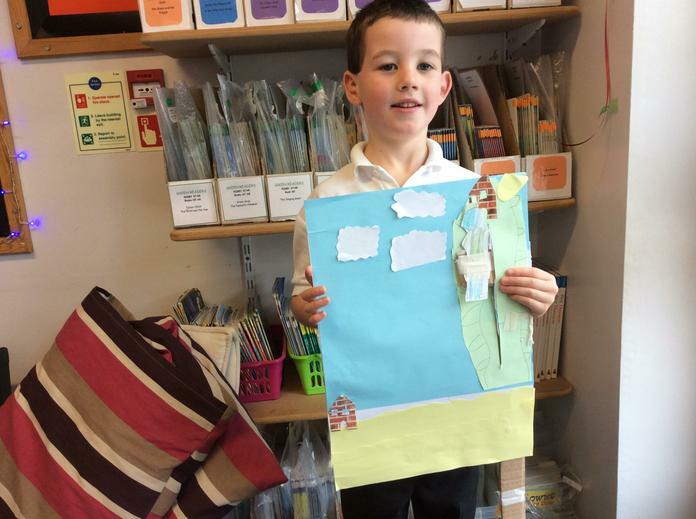 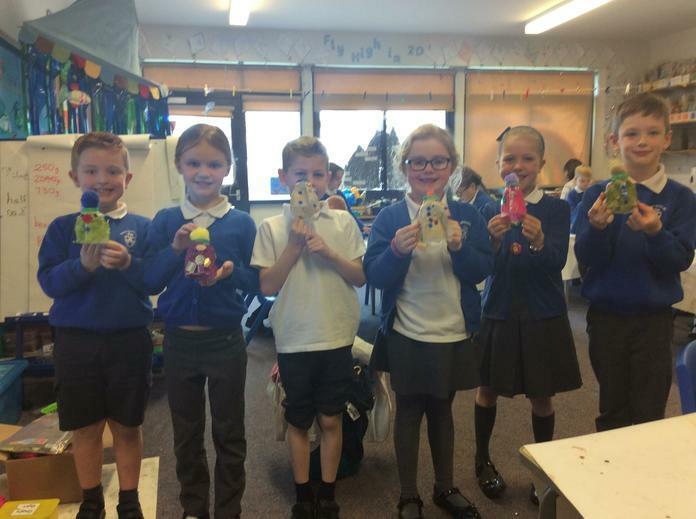 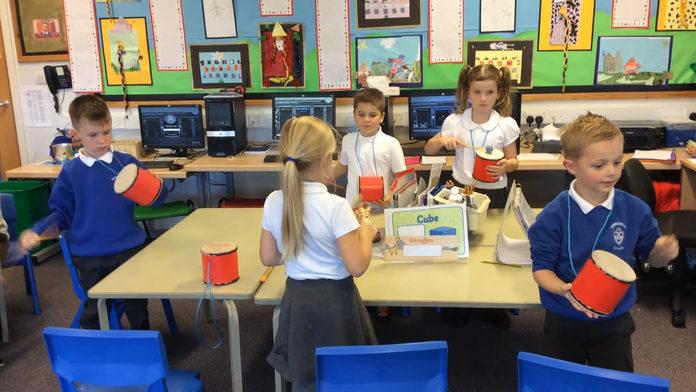 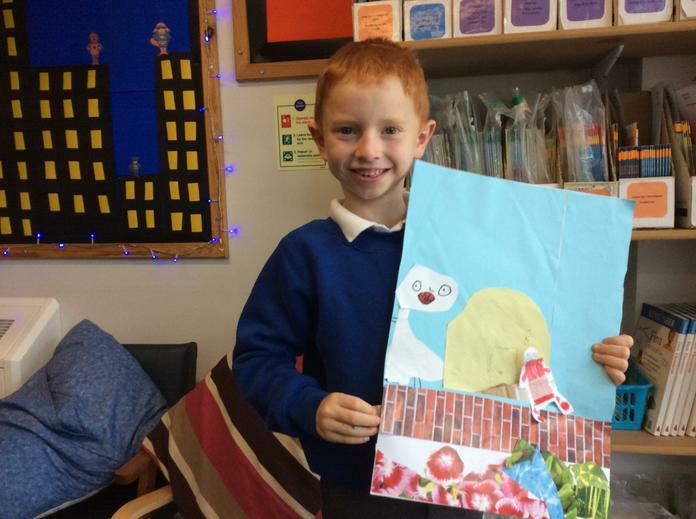 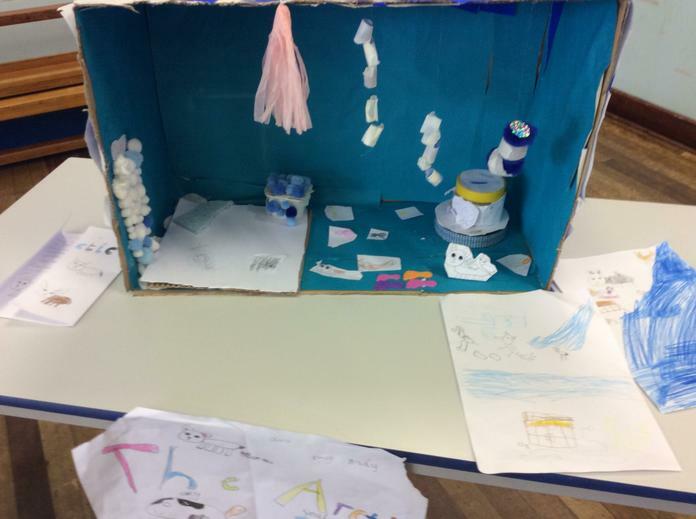 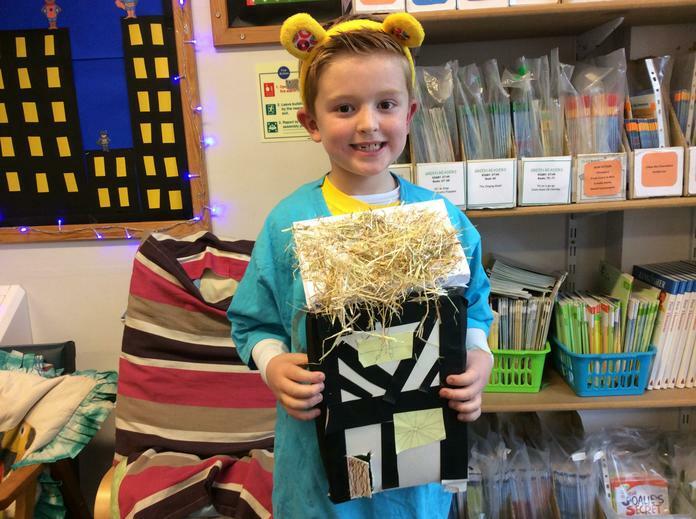 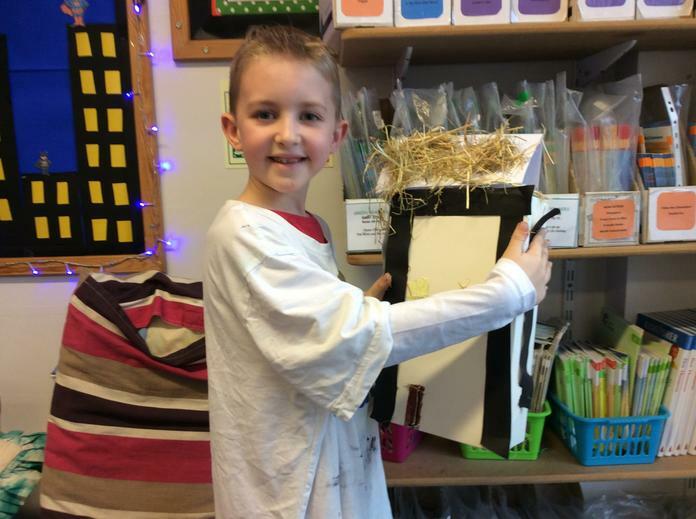 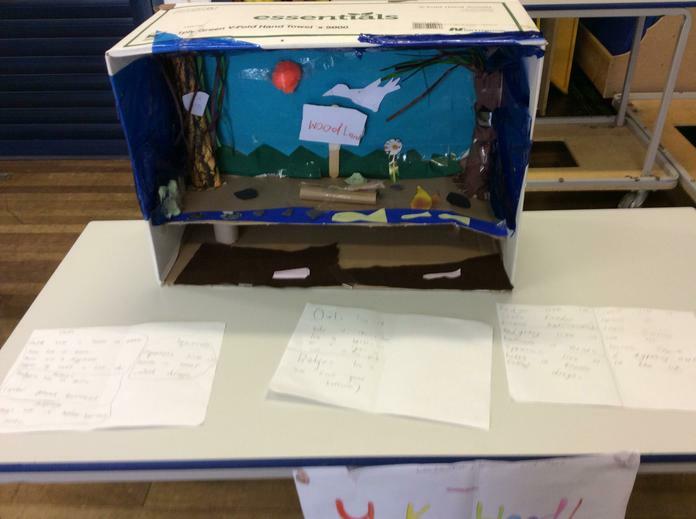 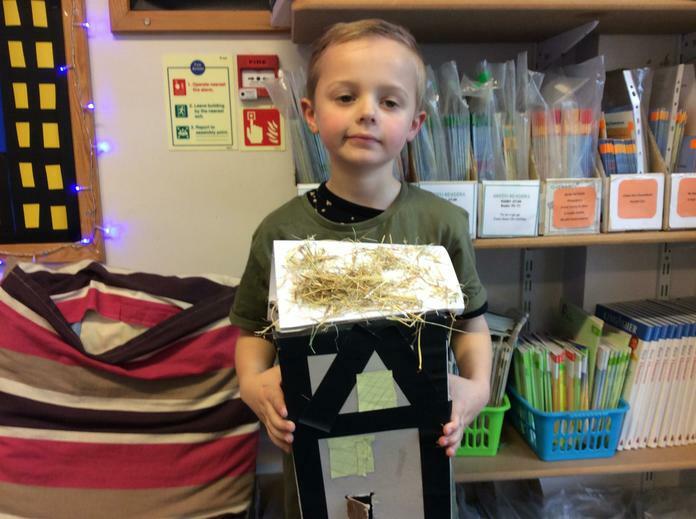 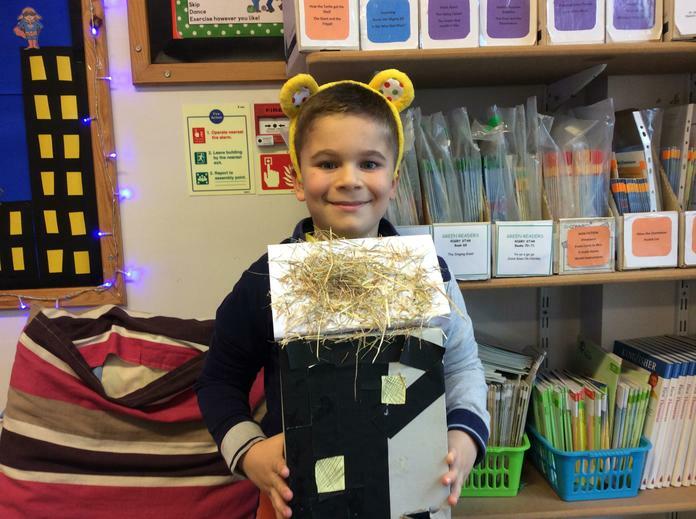 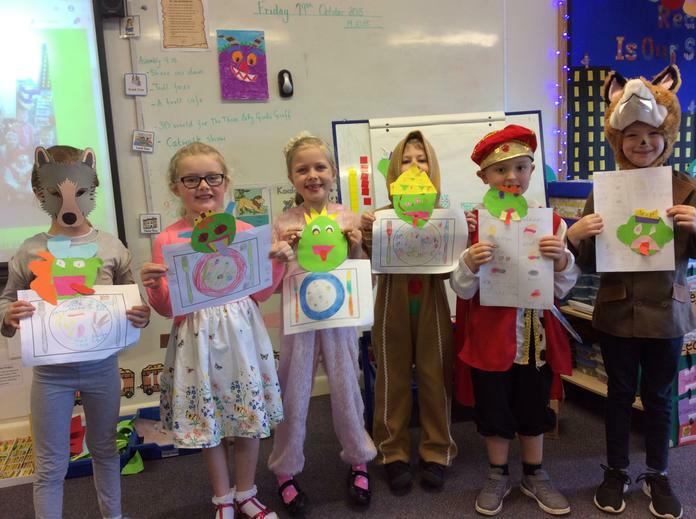 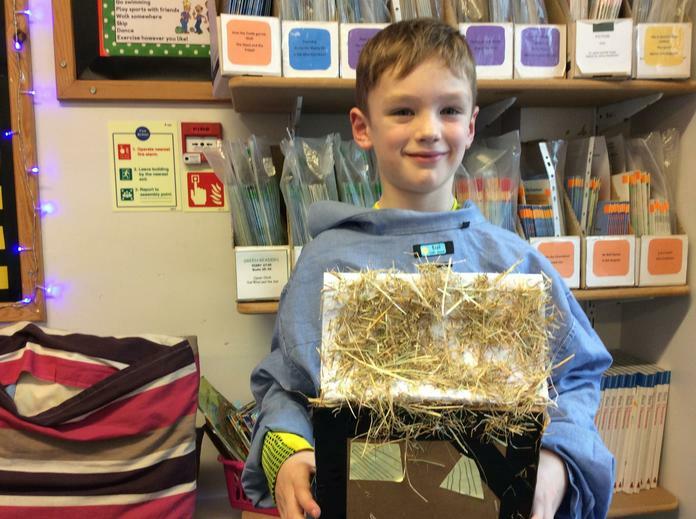 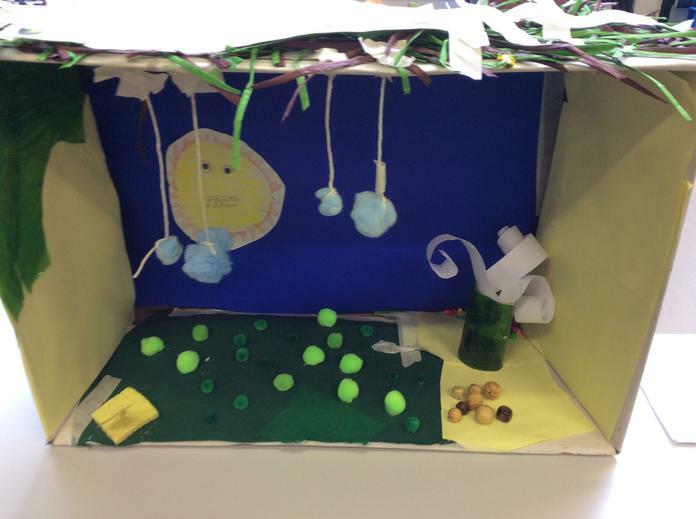 In Year 2, we have had an end of topic project. 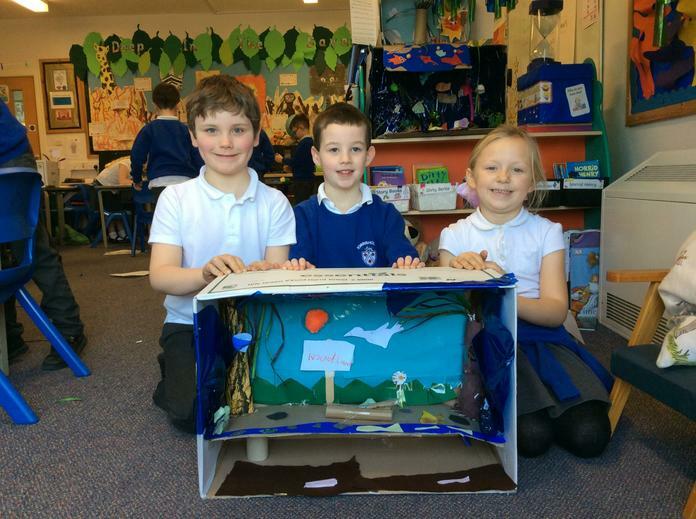 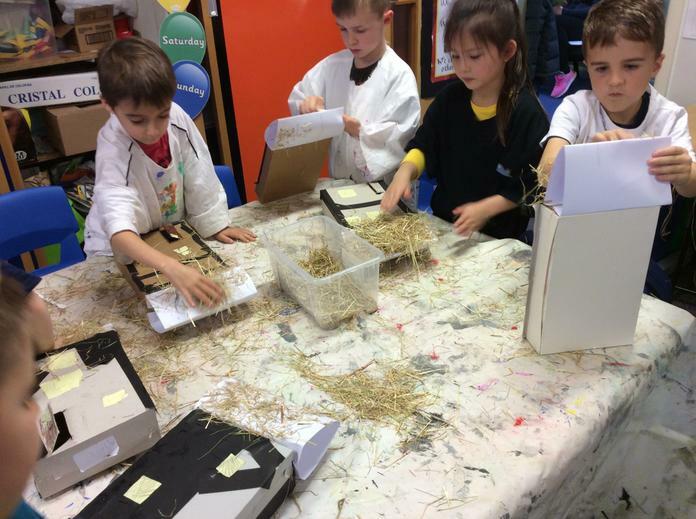 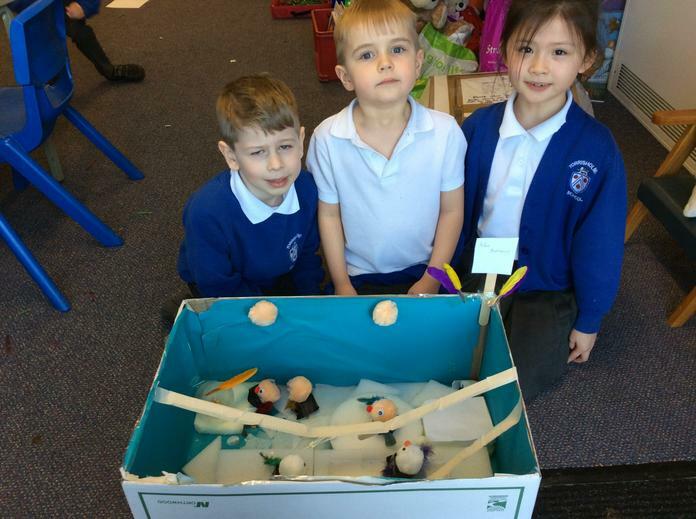 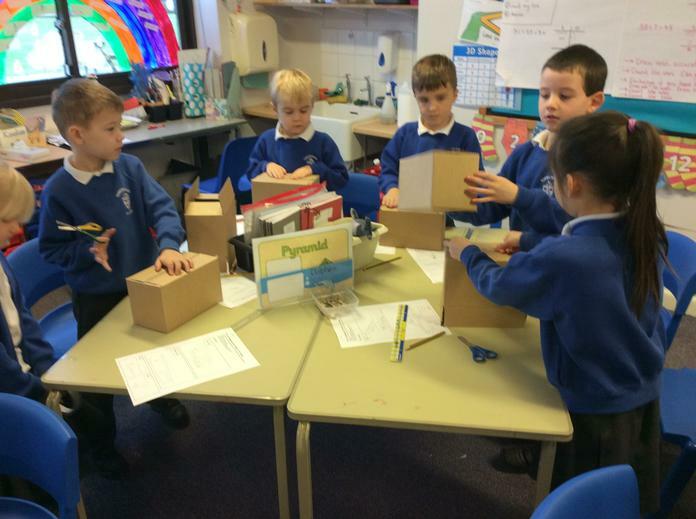 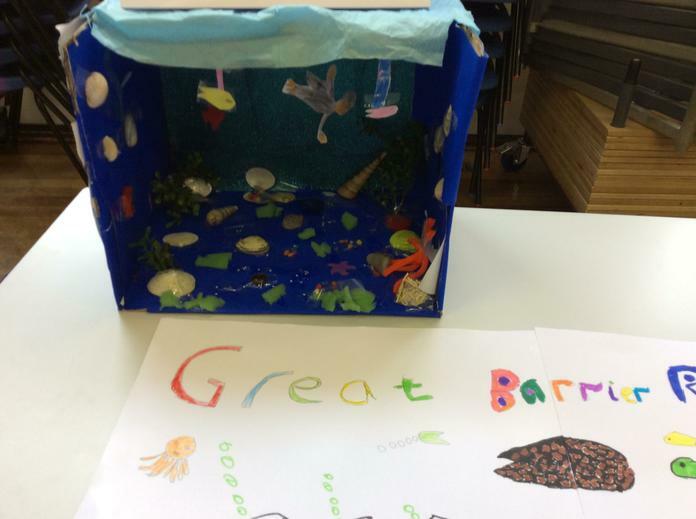 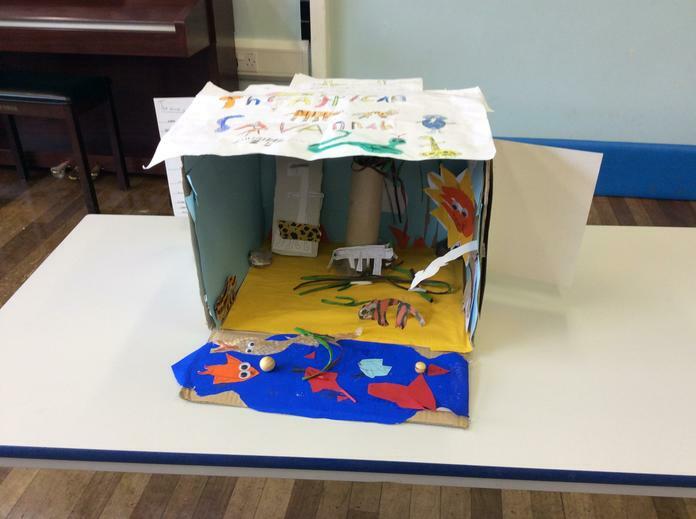 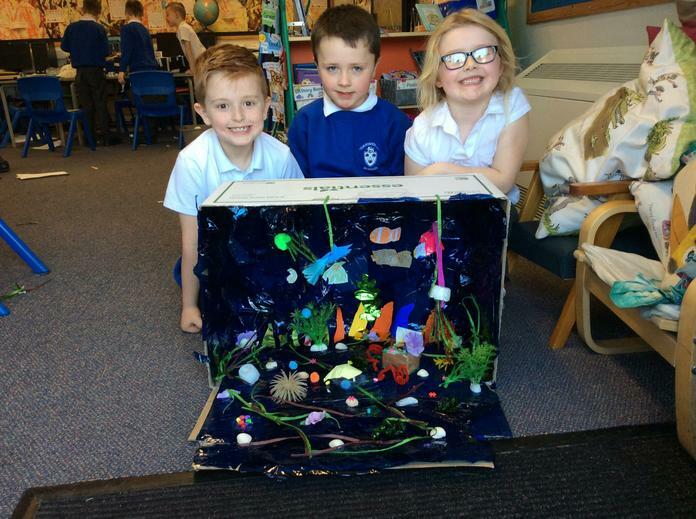 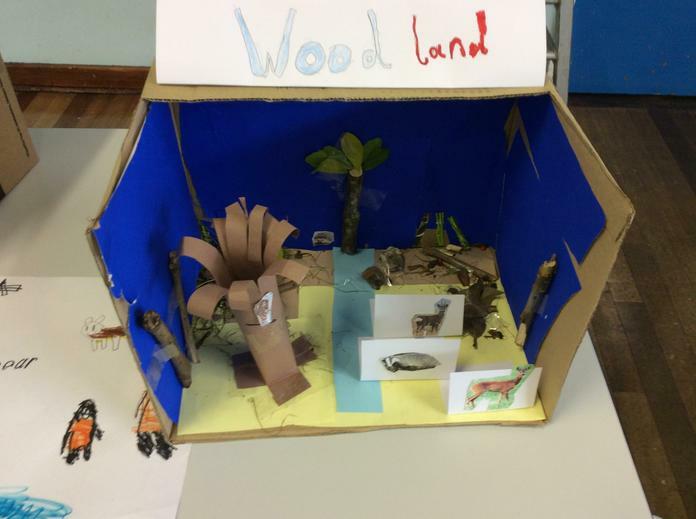 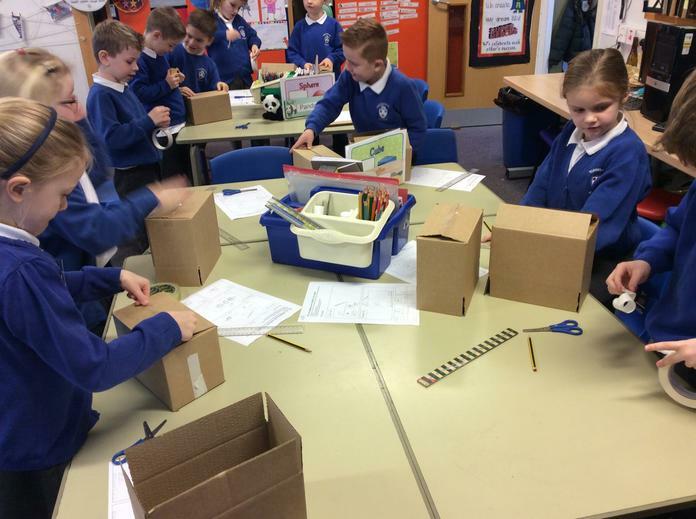 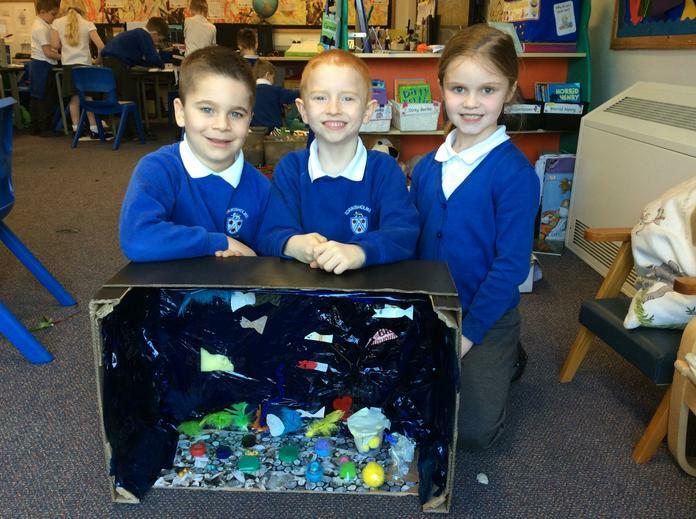 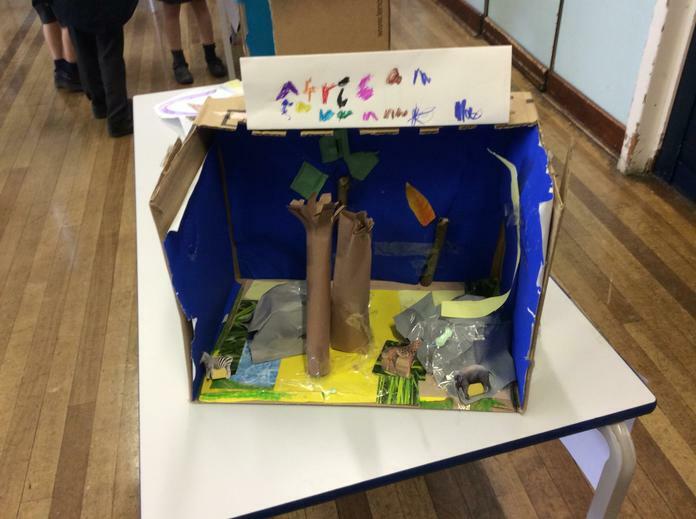 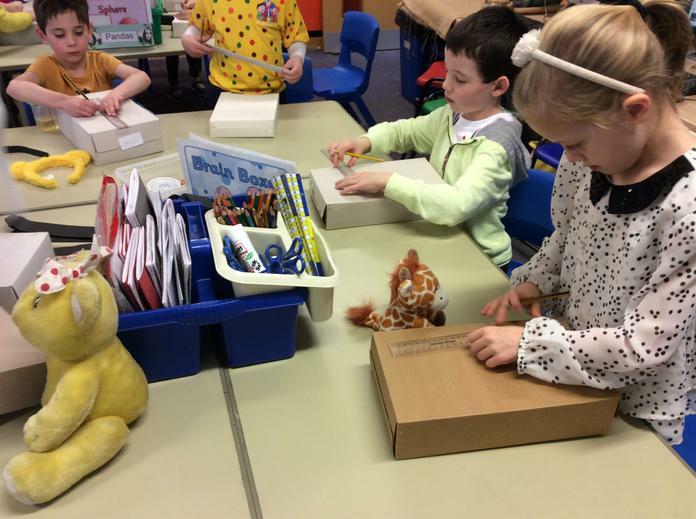 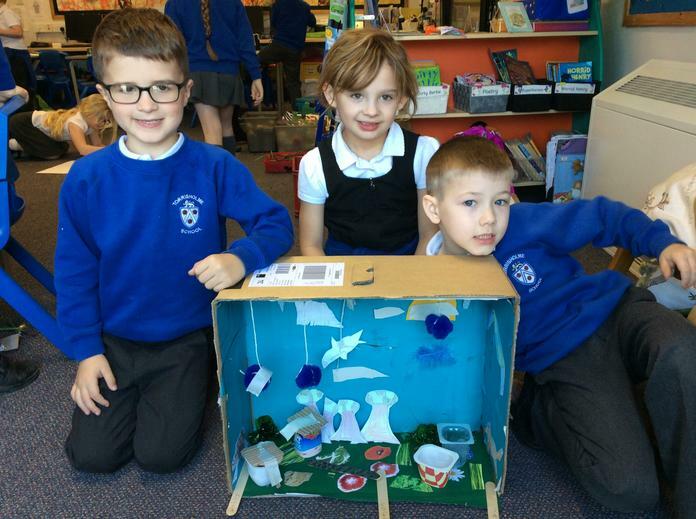 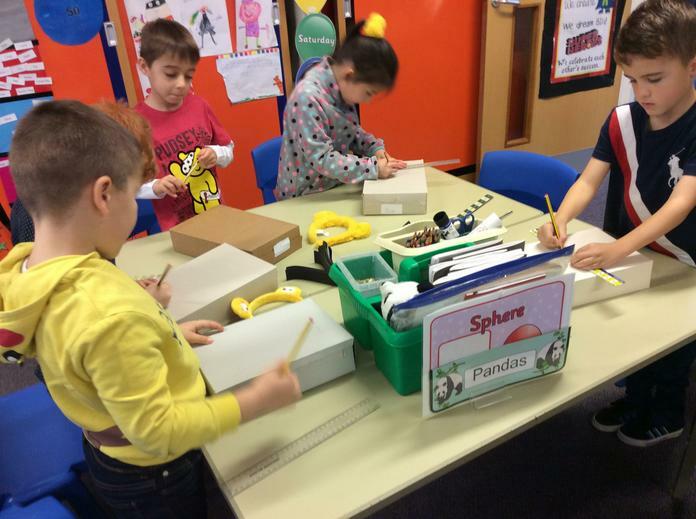 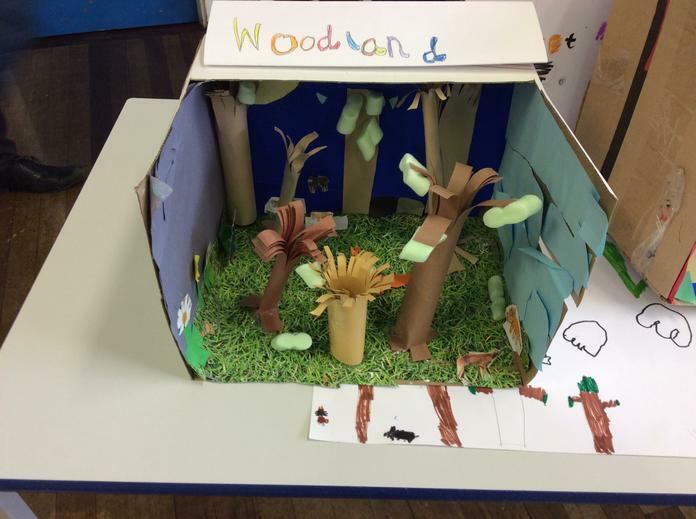 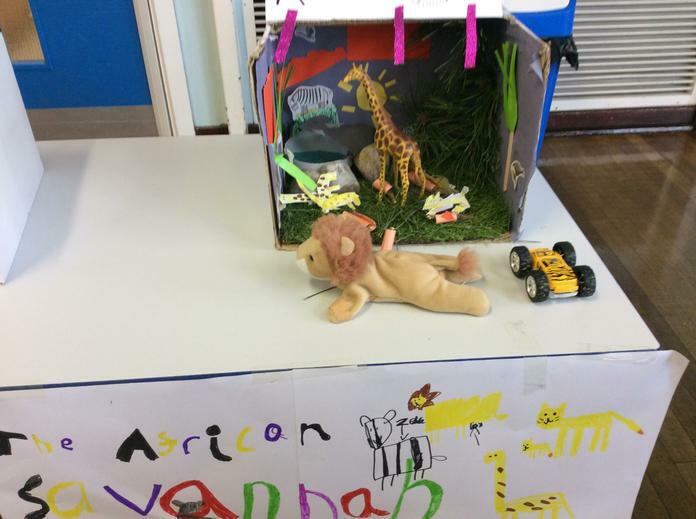 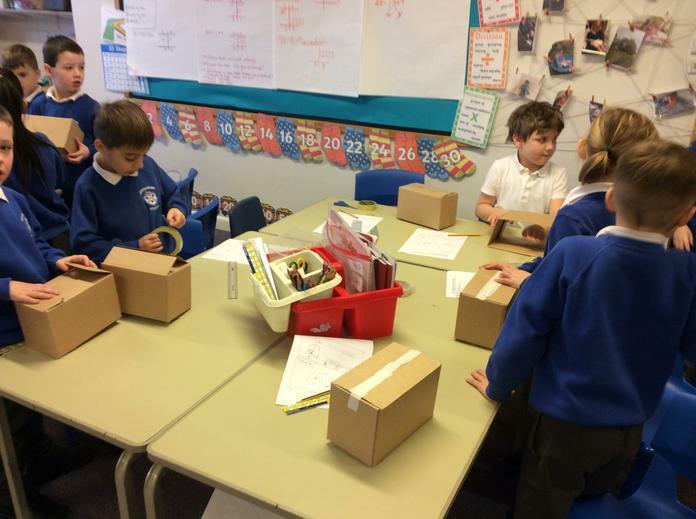 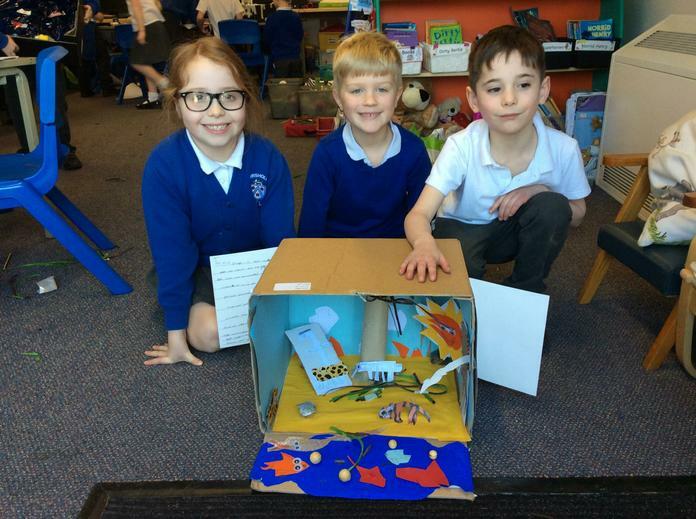 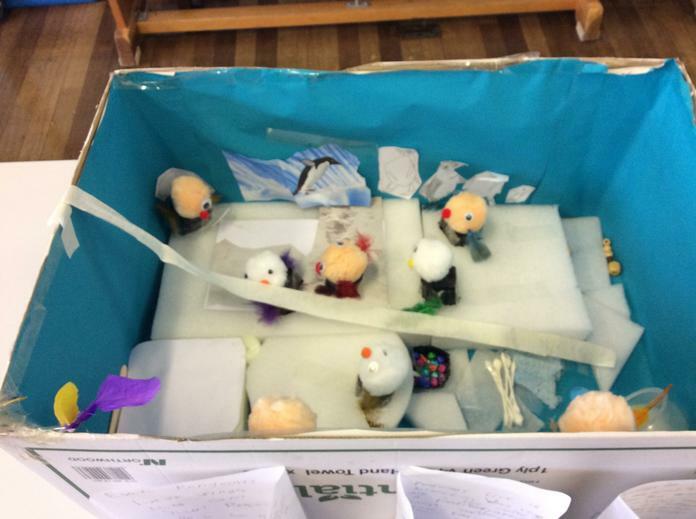 We used our knowledge of habitats and the animals that live in that habitat to plan and build a model of an enclosure. 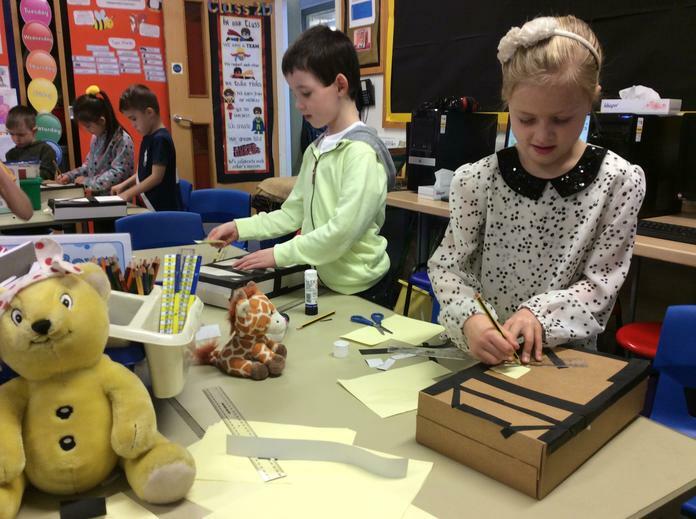 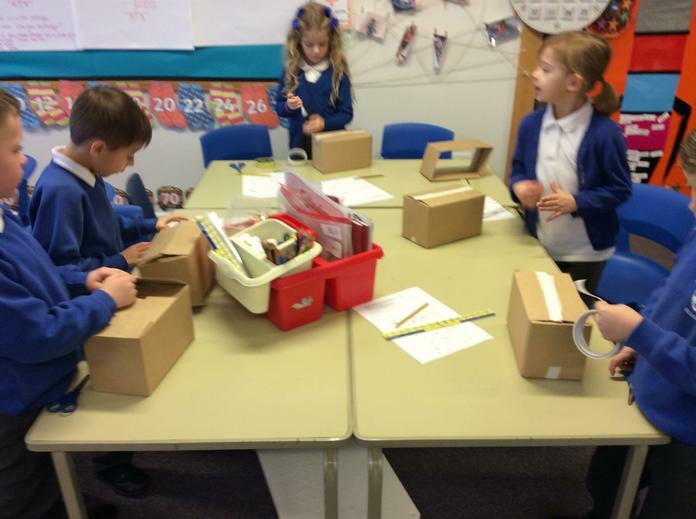 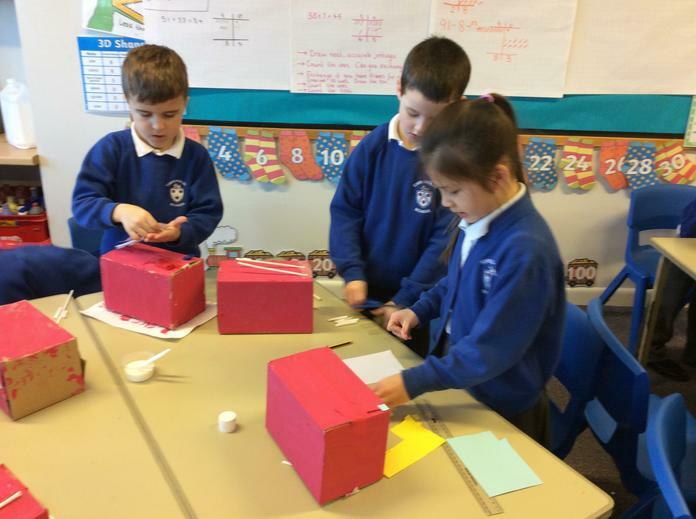 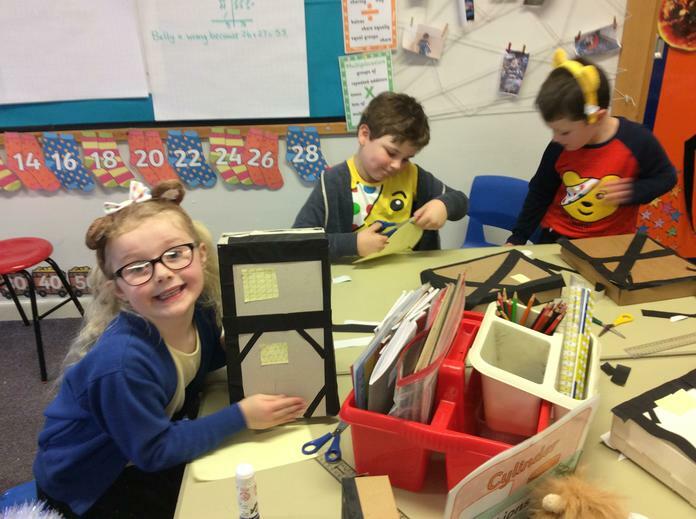 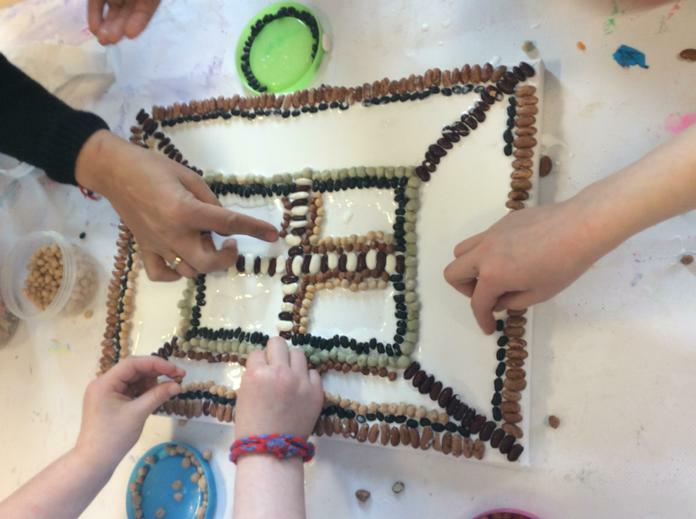 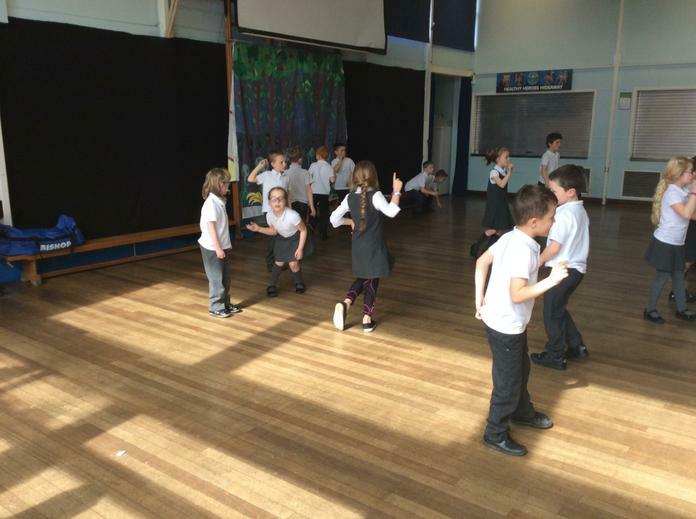 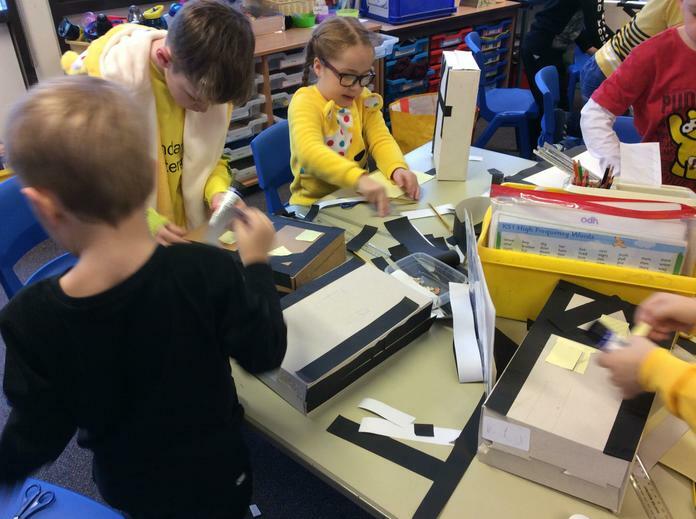 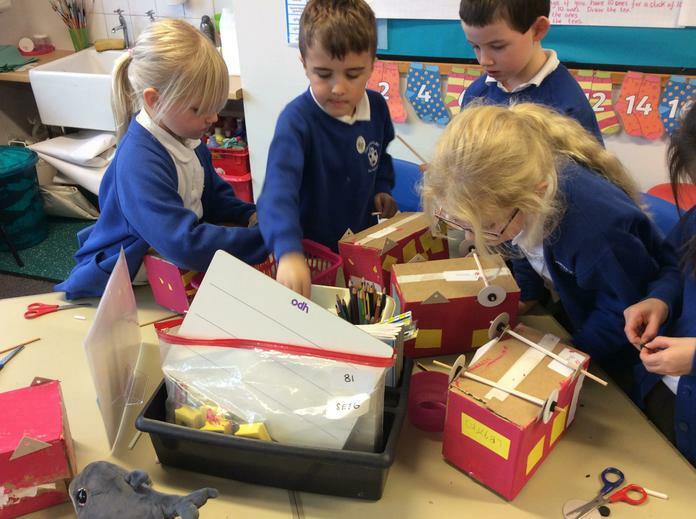 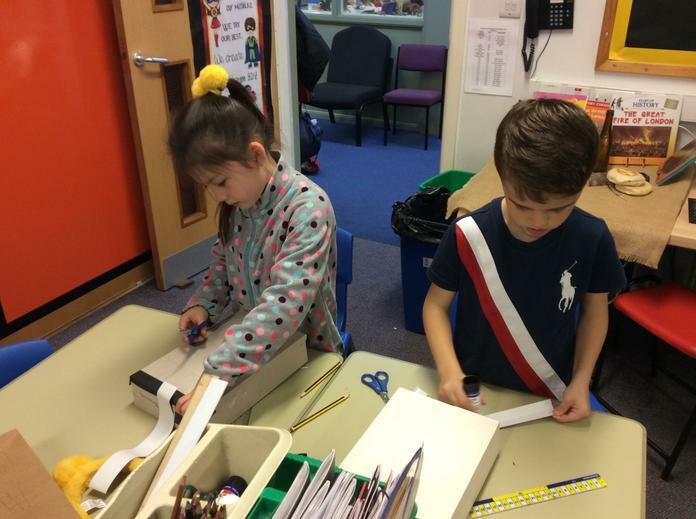 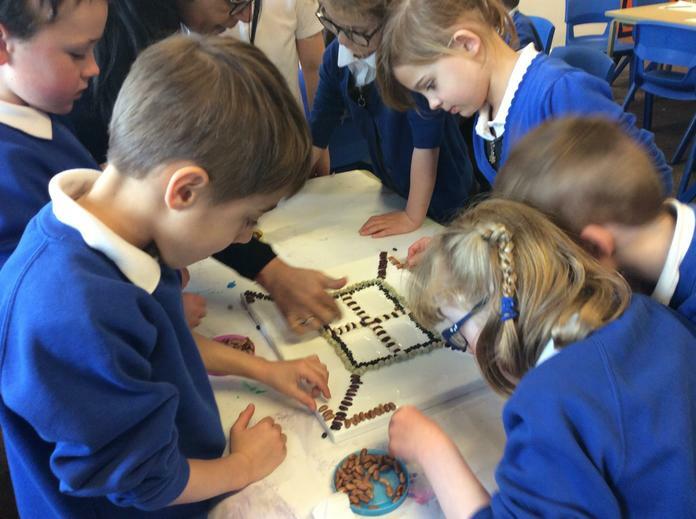 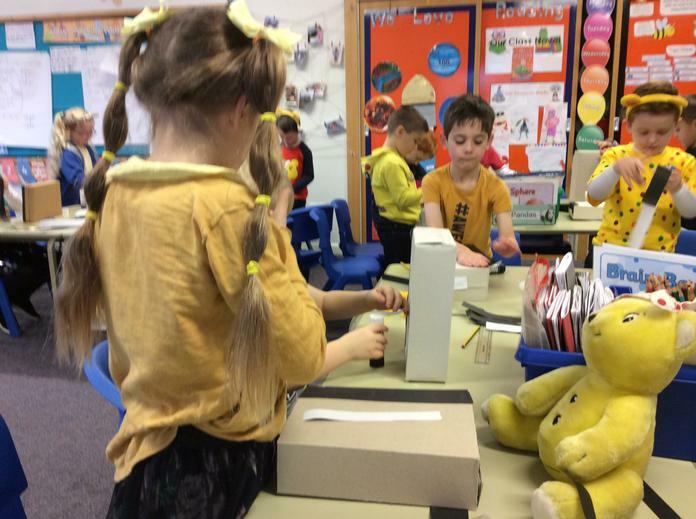 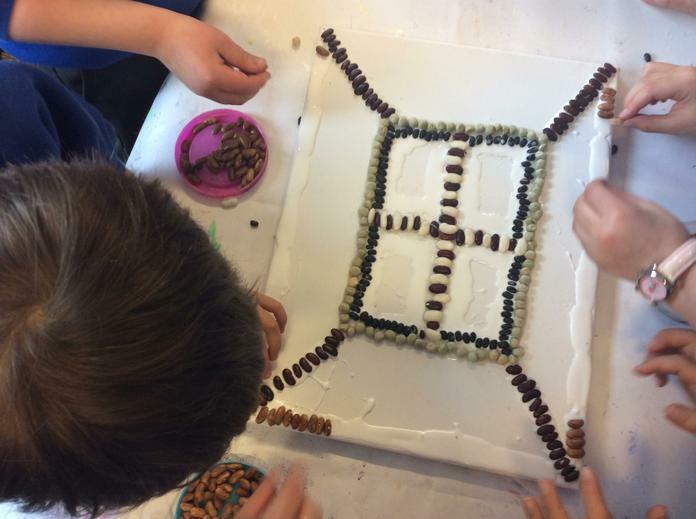 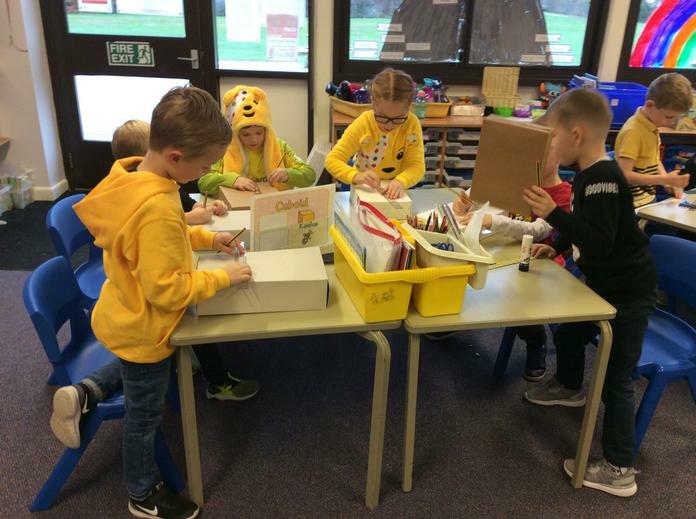 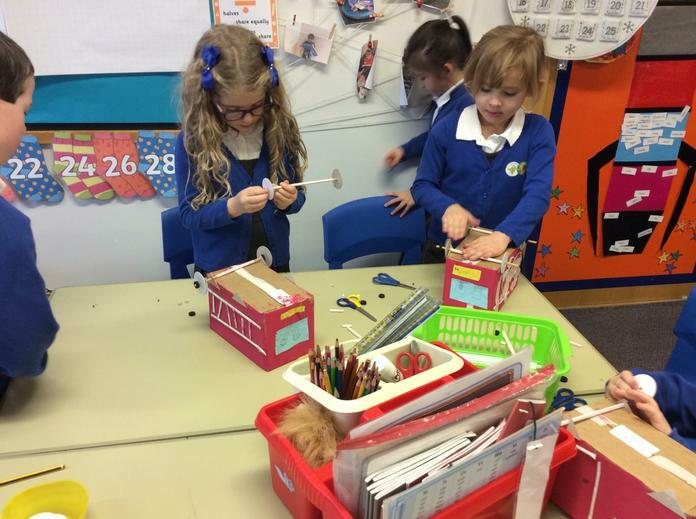 We used our building learning powers to work in teams, listening to each other and contributing ideas; we made a plan and rose to the challenge whilst reflecting and adapting things as the project progressed. 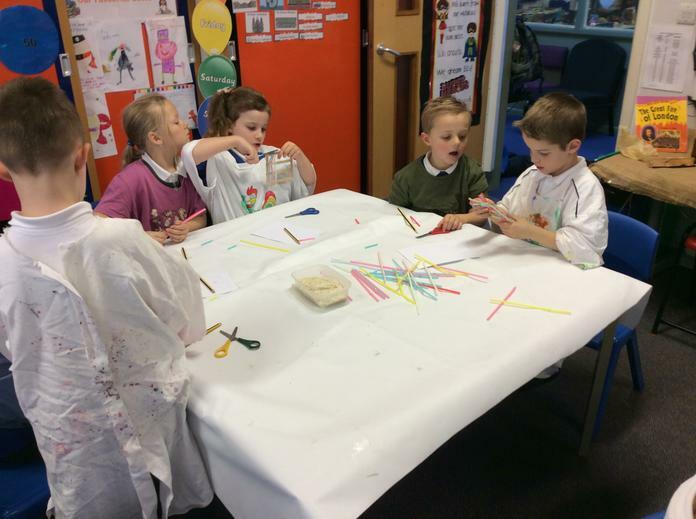 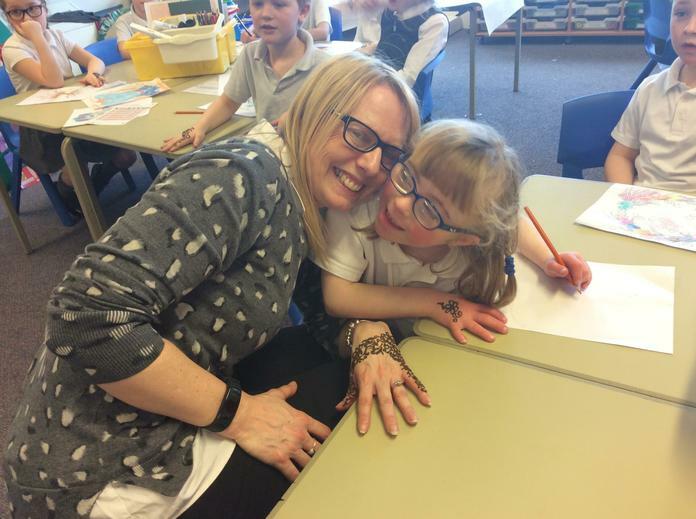 On Friday 1st March parents and carers came into school to see our fabulous enclousres. 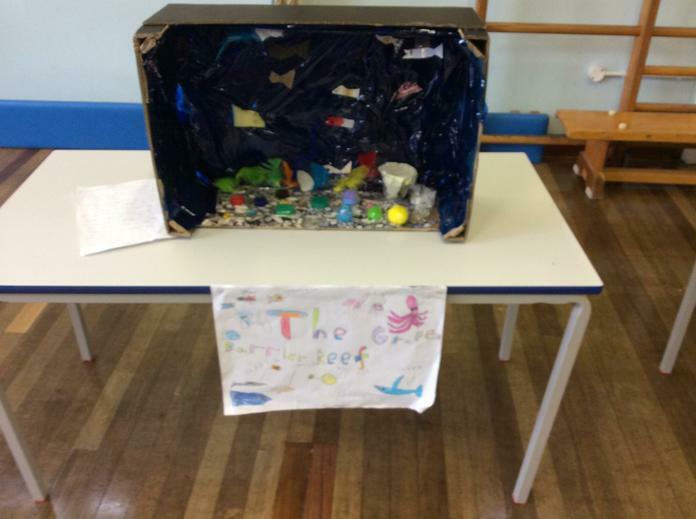 We have created a display in a day!! 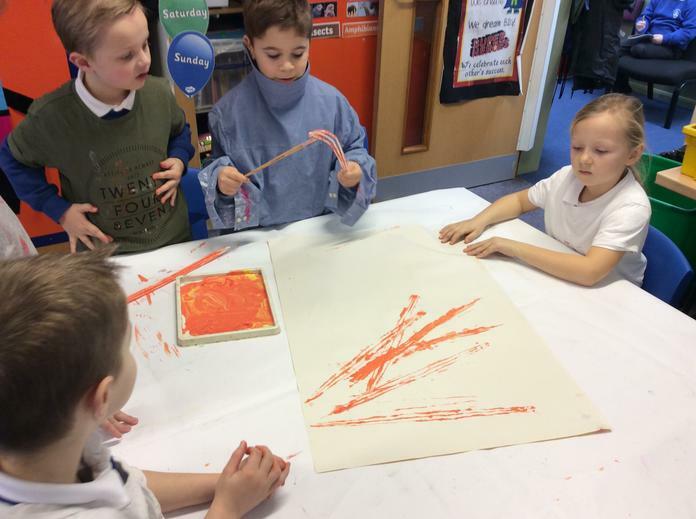 We have been learning about printing. 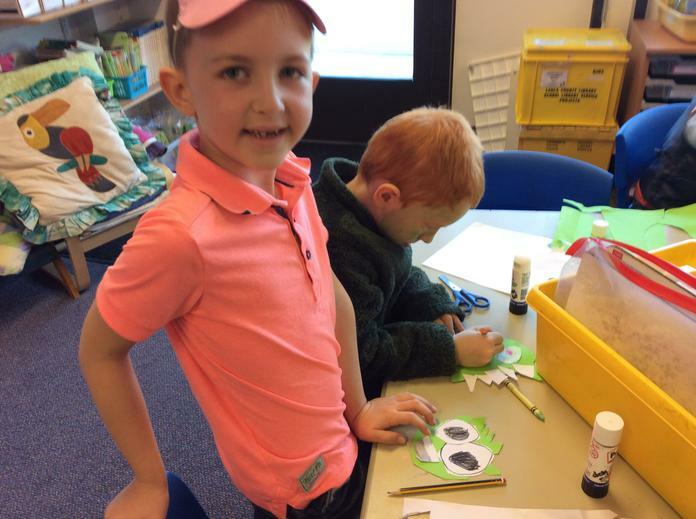 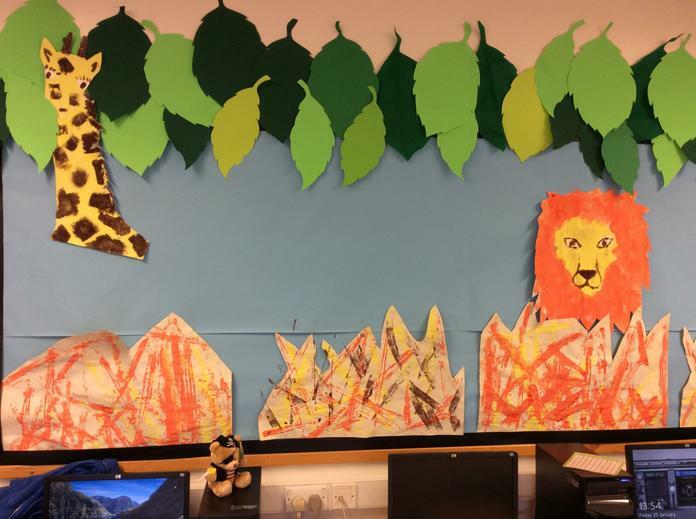 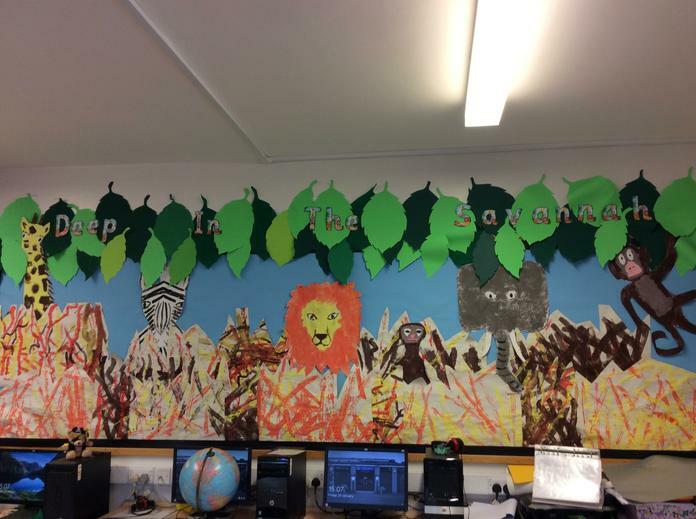 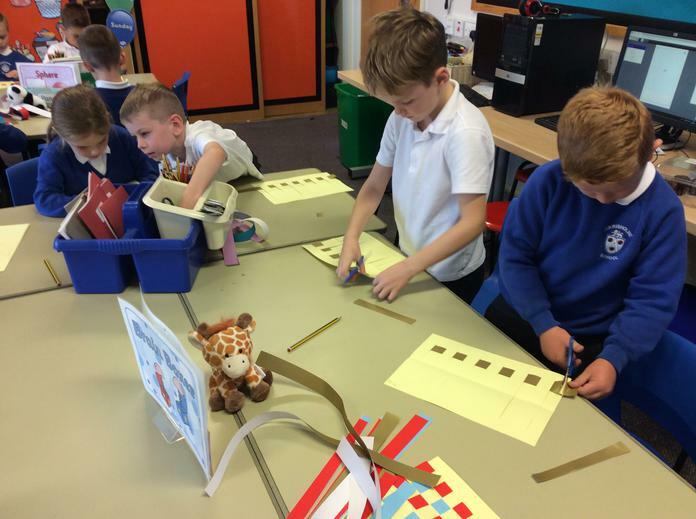 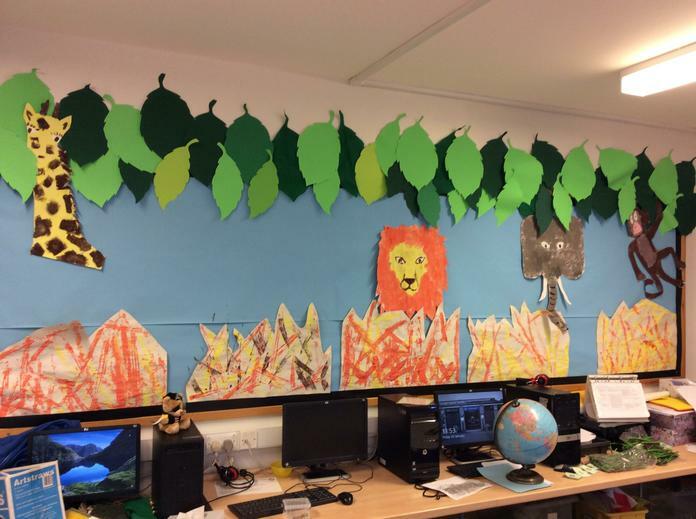 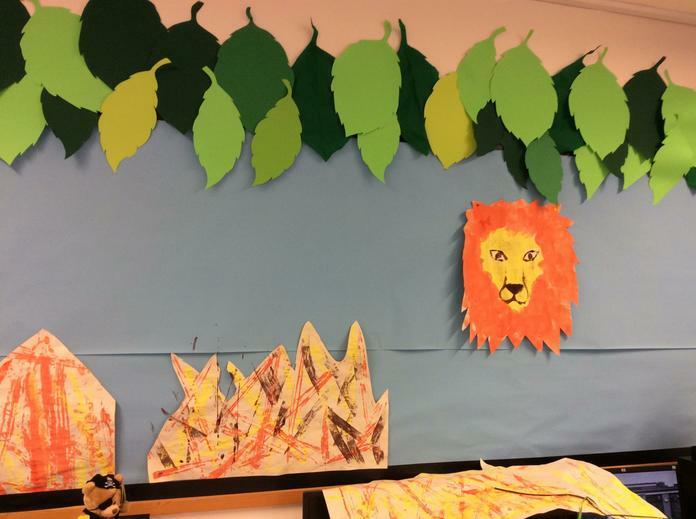 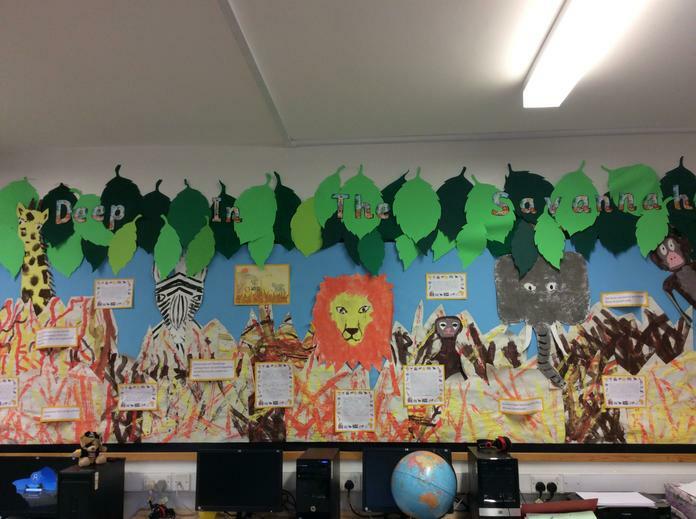 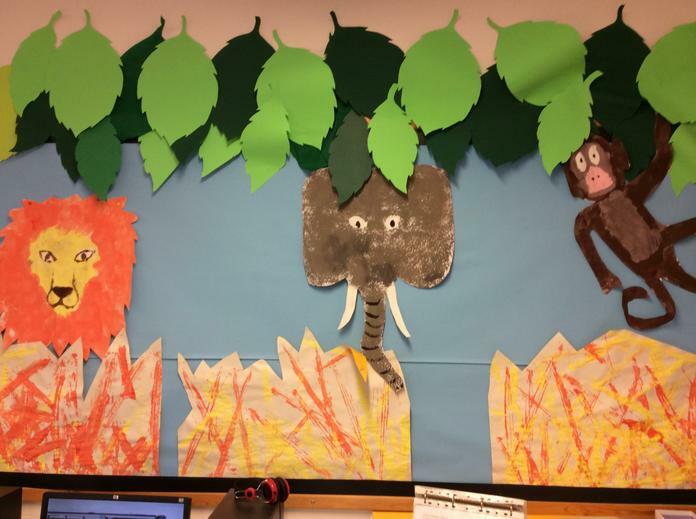 We used our knowledge of the African Savannah and the animals that live there to make a display using different printing techniques. 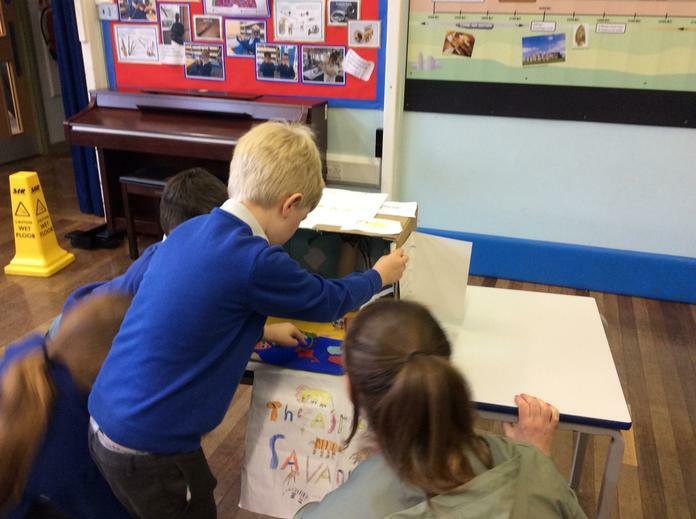 We had loads of fun, especially deciding where to put everything on the display. 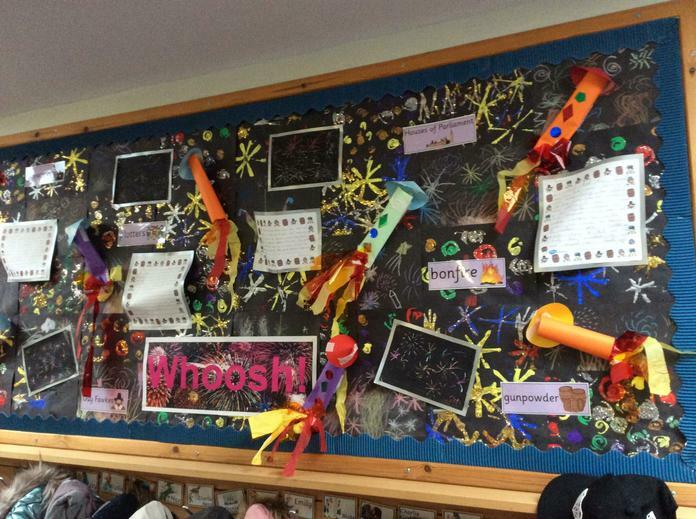 We love our display and hope you do too. 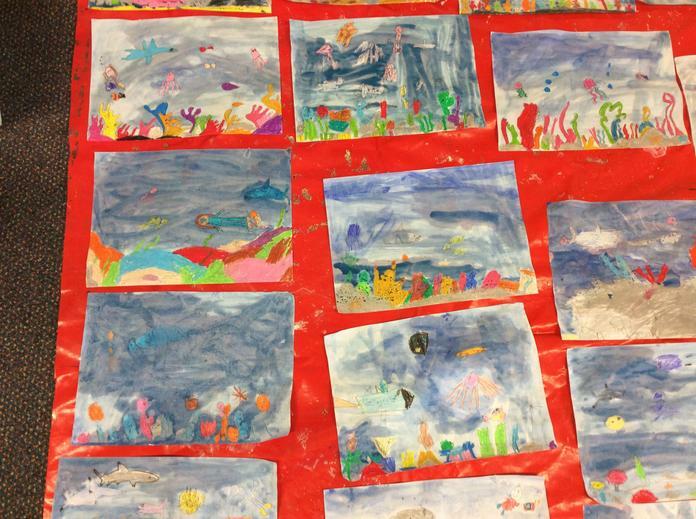 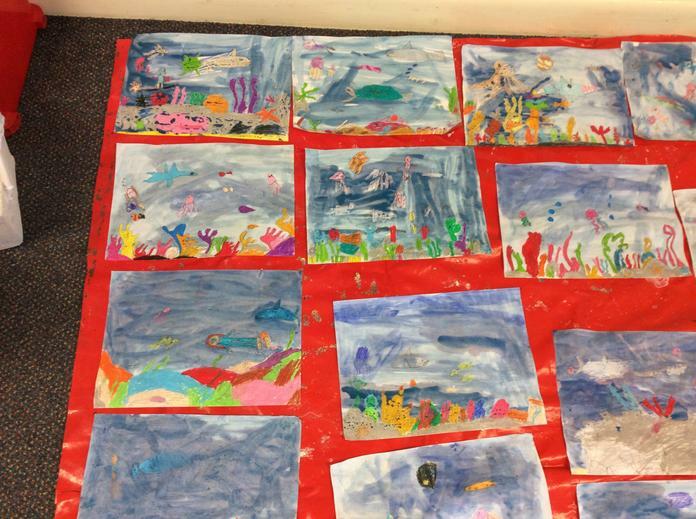 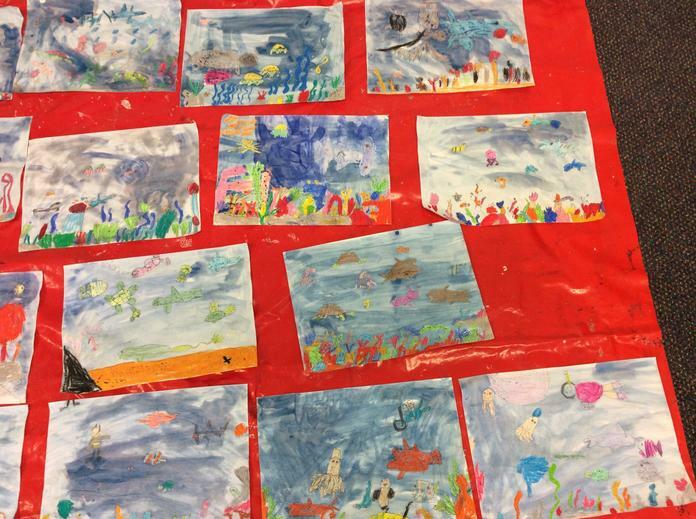 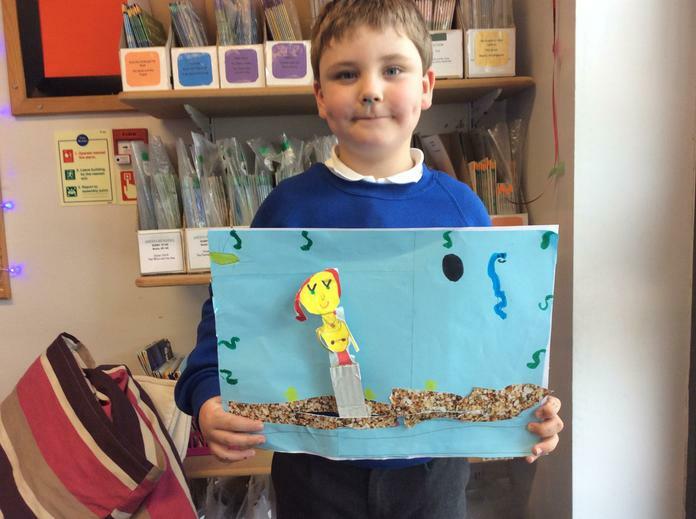 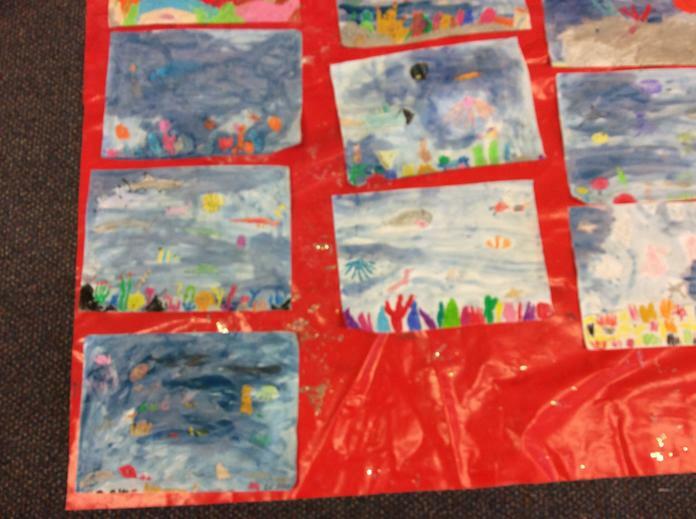 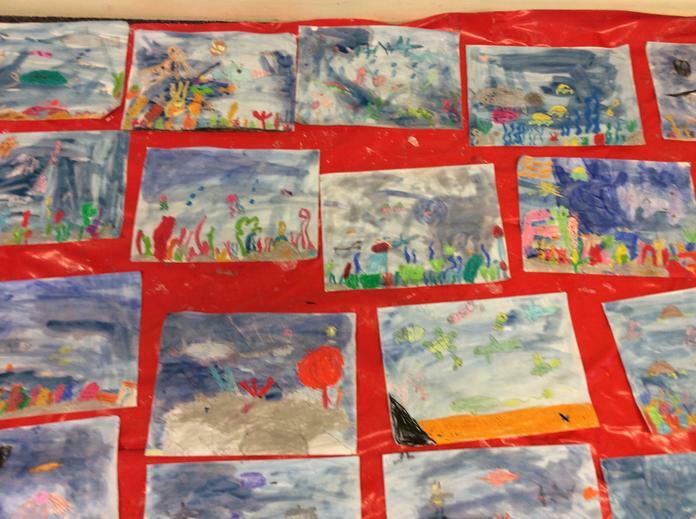 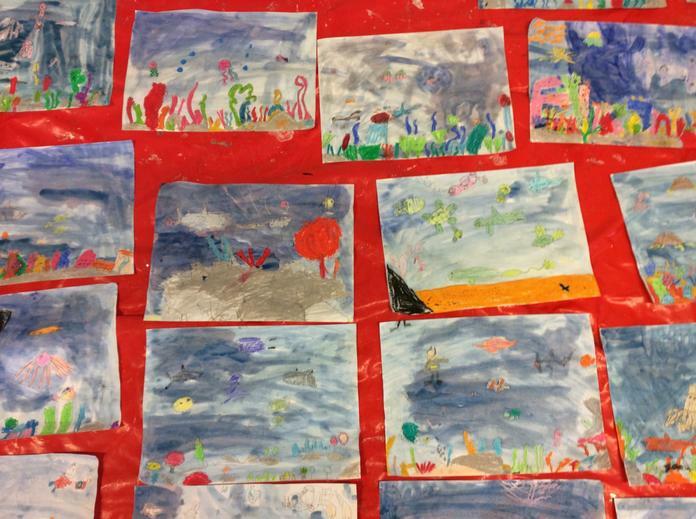 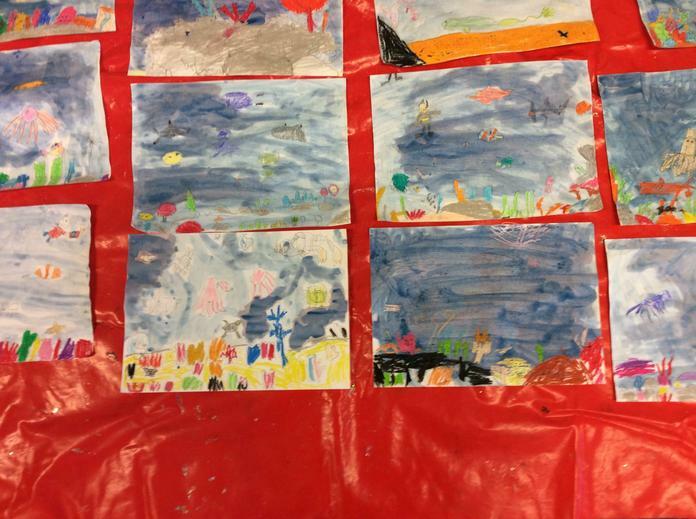 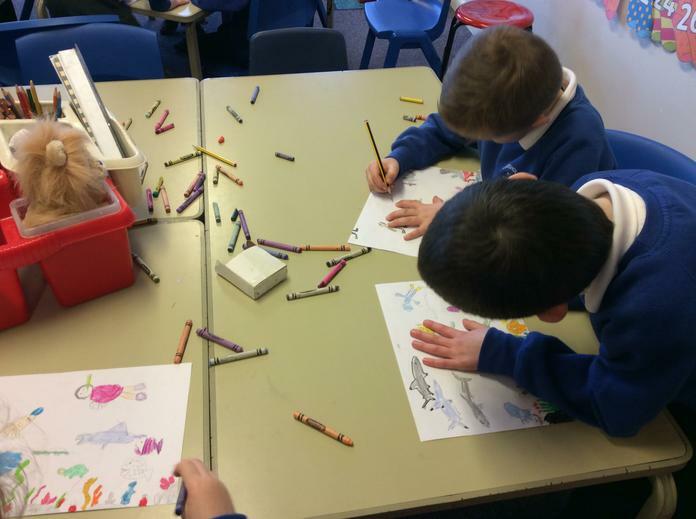 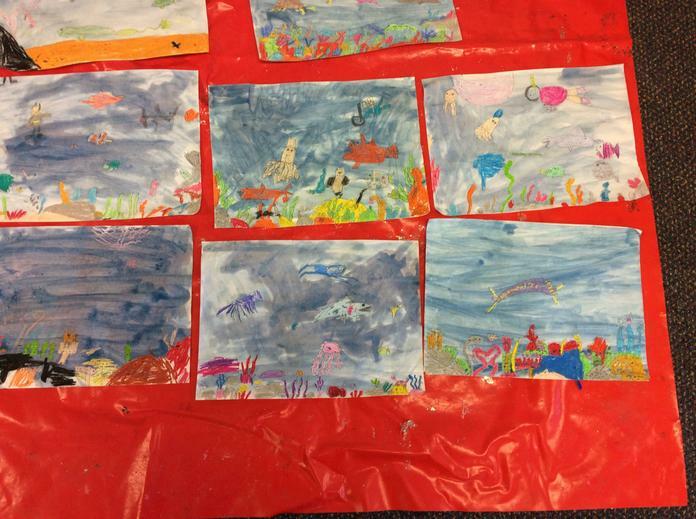 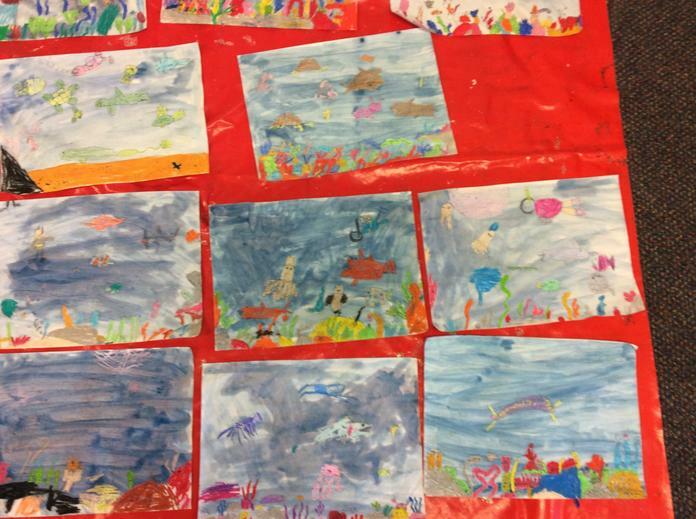 We have been learning about coral reefs. 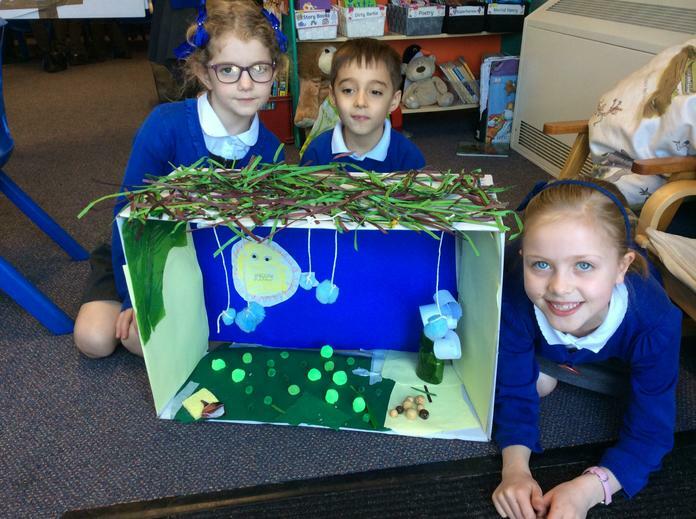 We learned about how animals live in this habitat. 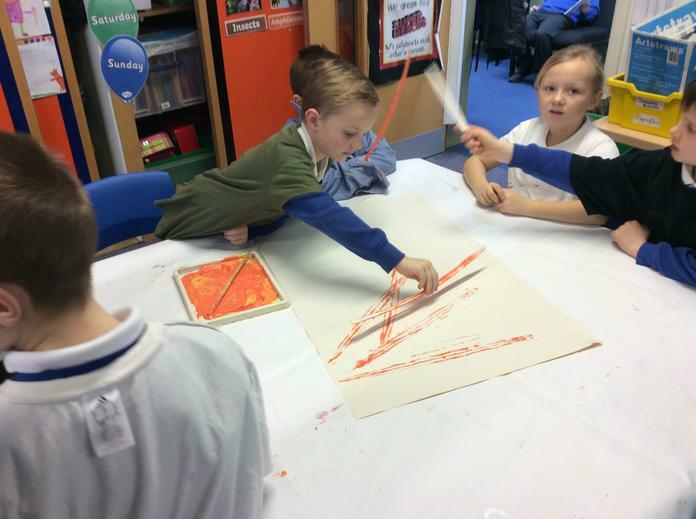 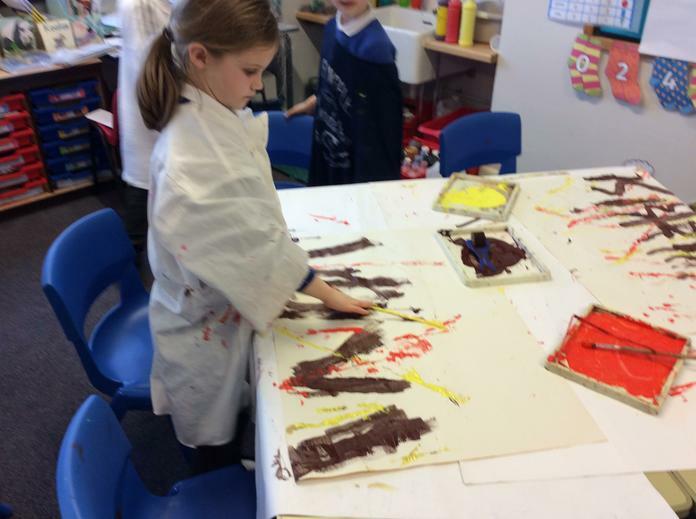 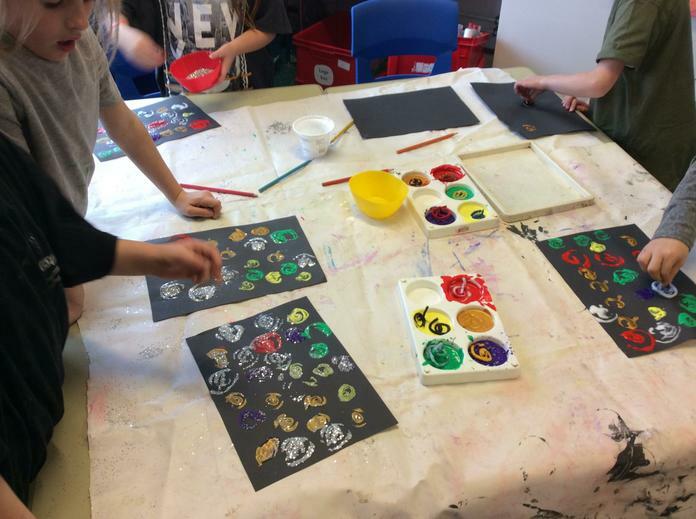 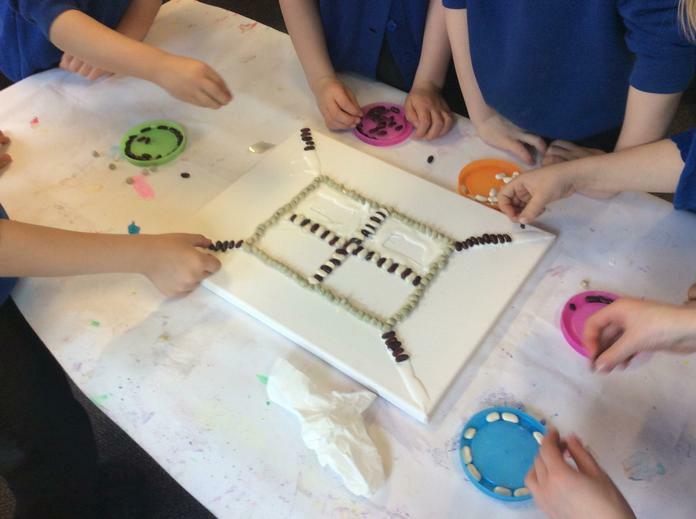 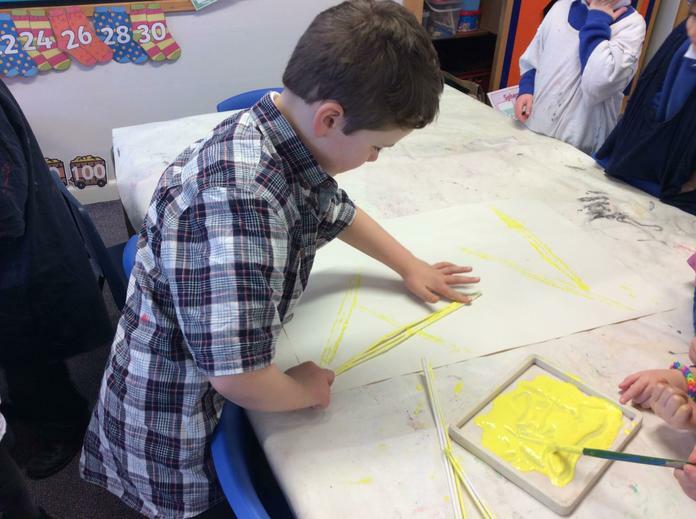 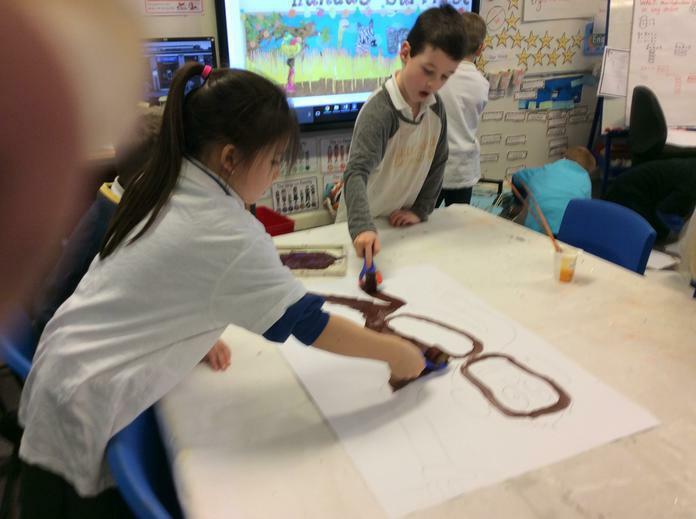 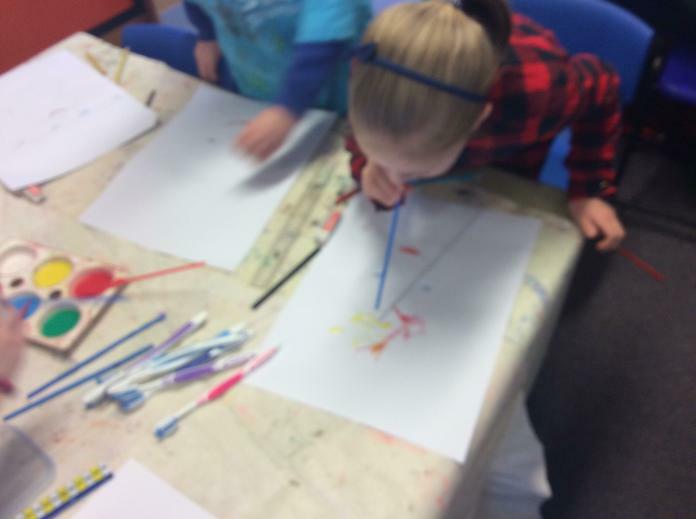 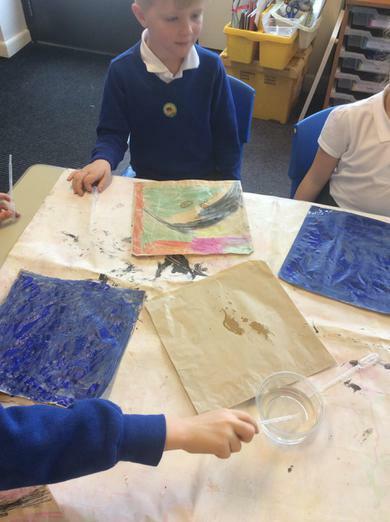 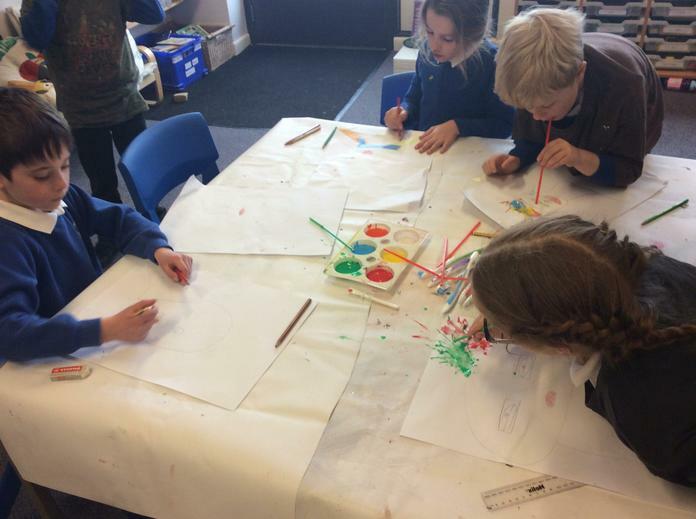 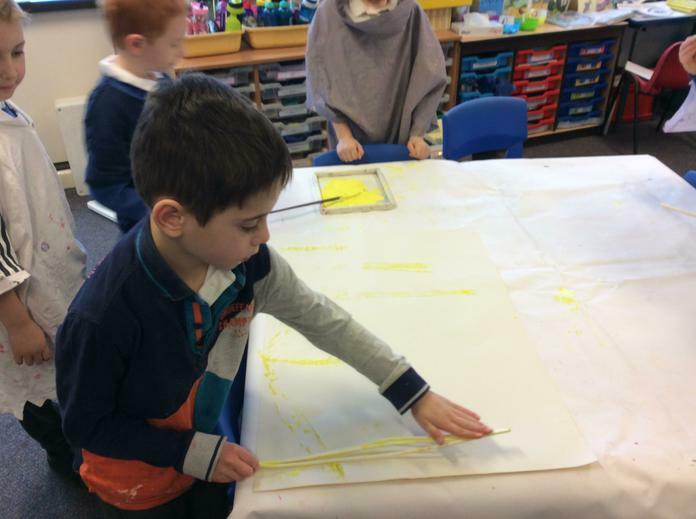 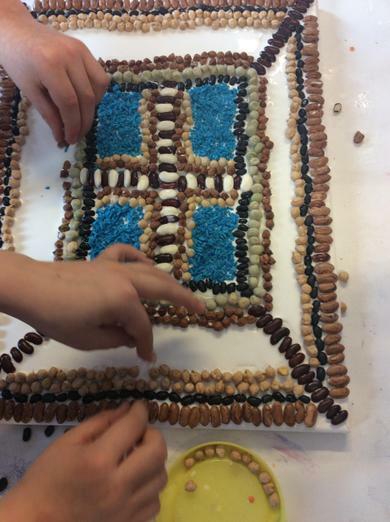 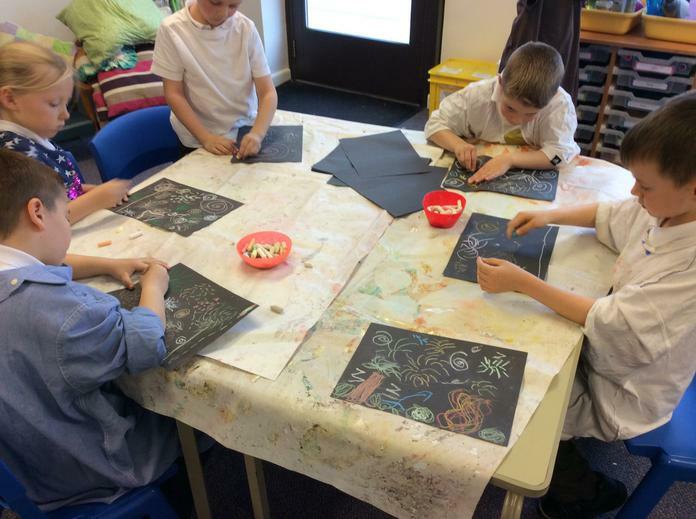 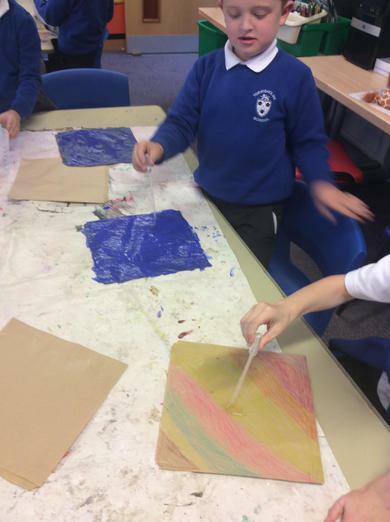 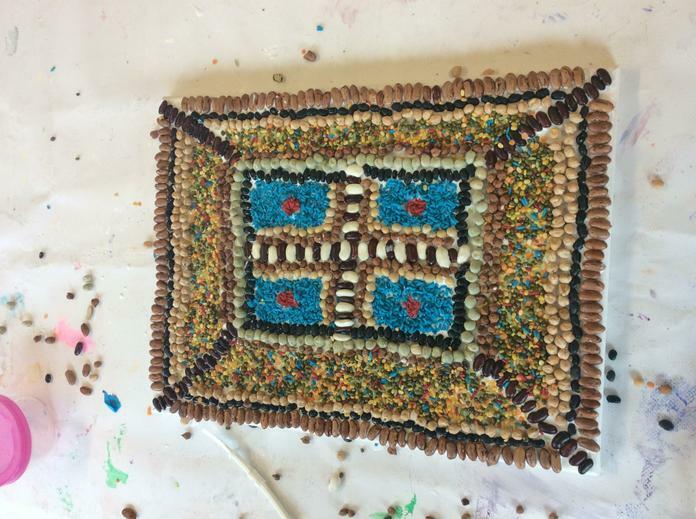 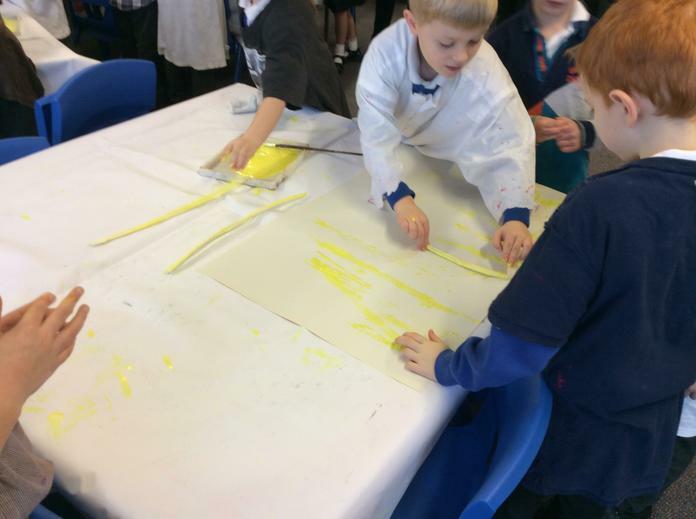 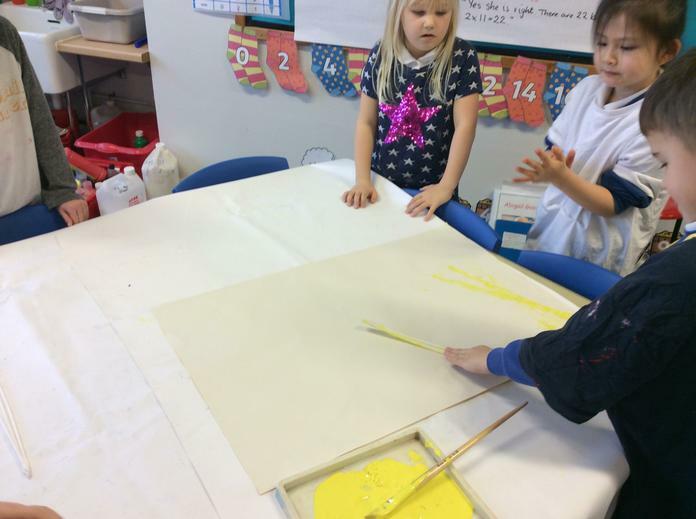 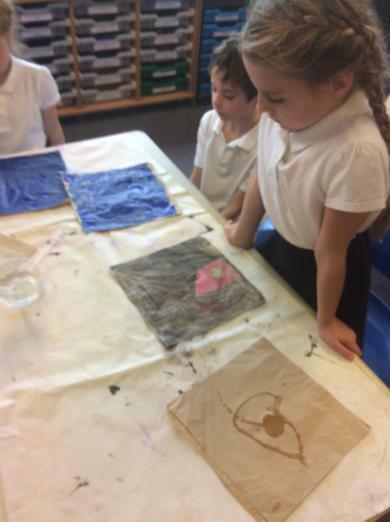 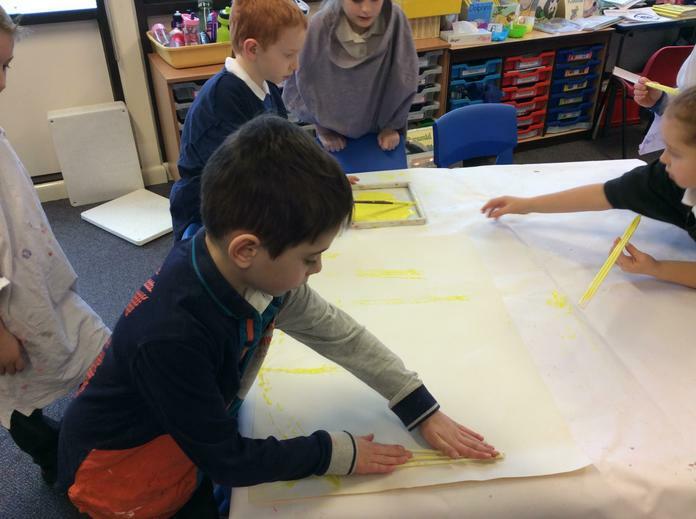 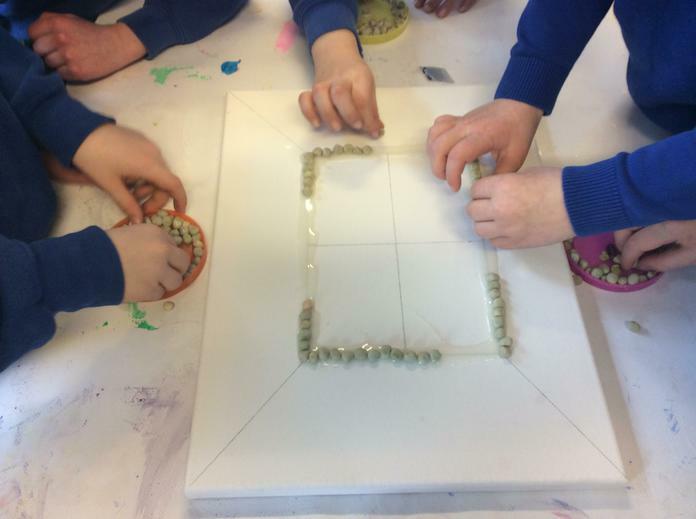 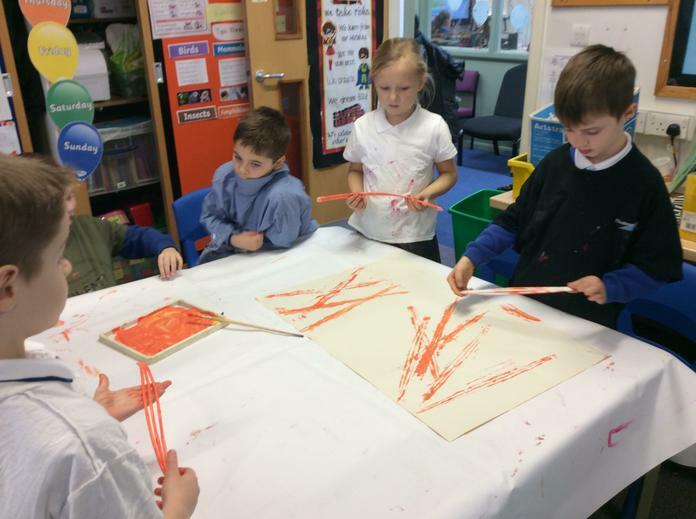 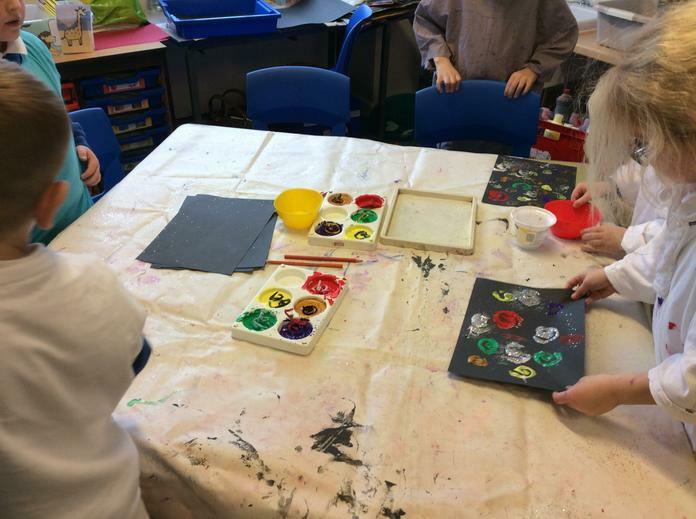 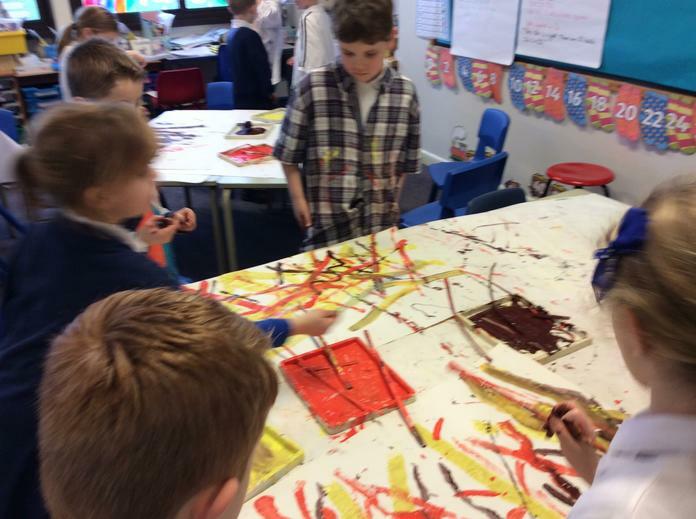 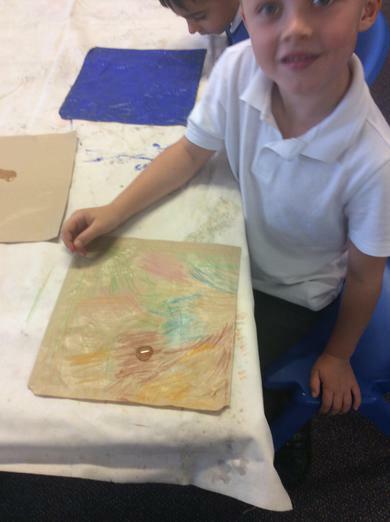 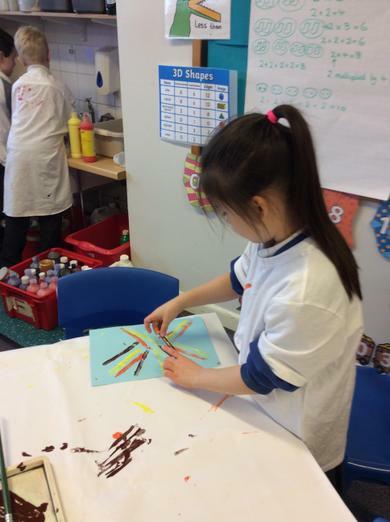 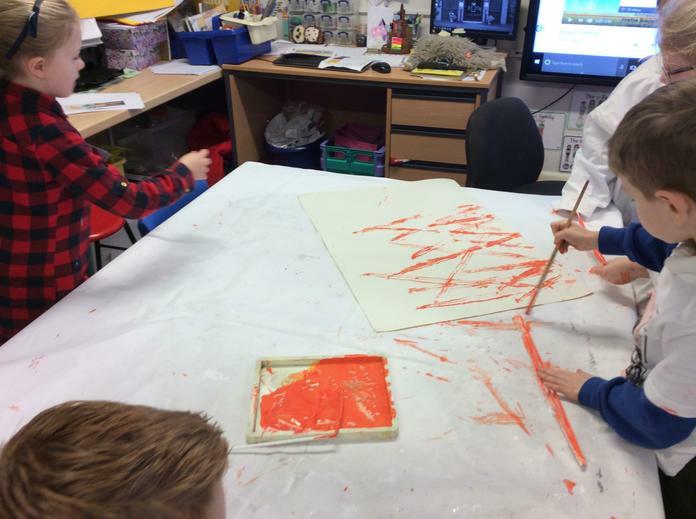 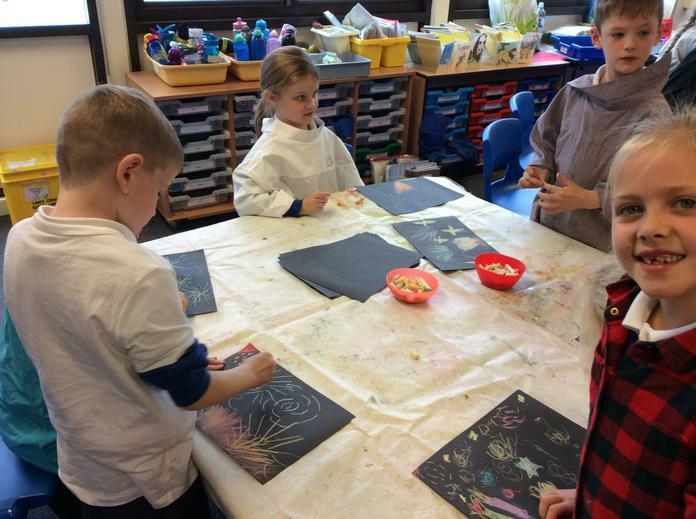 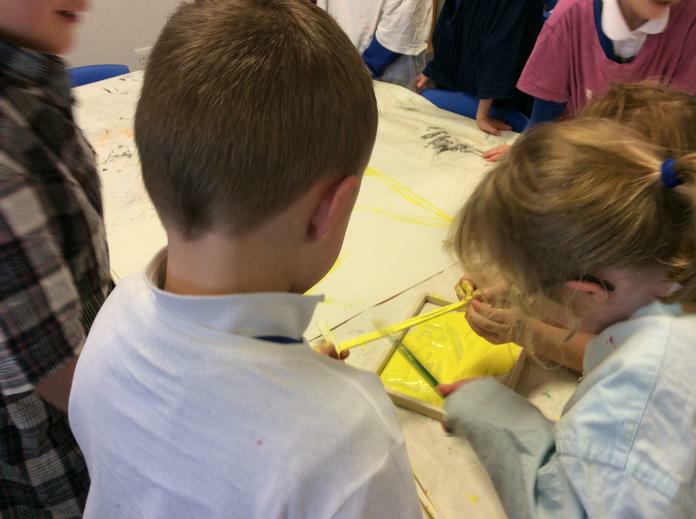 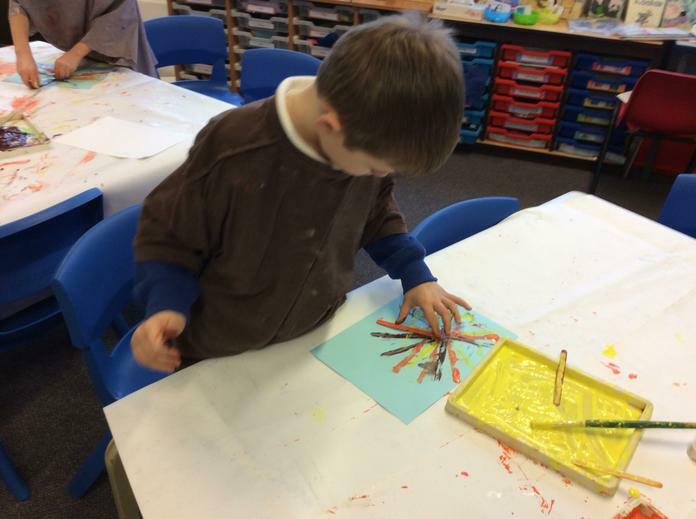 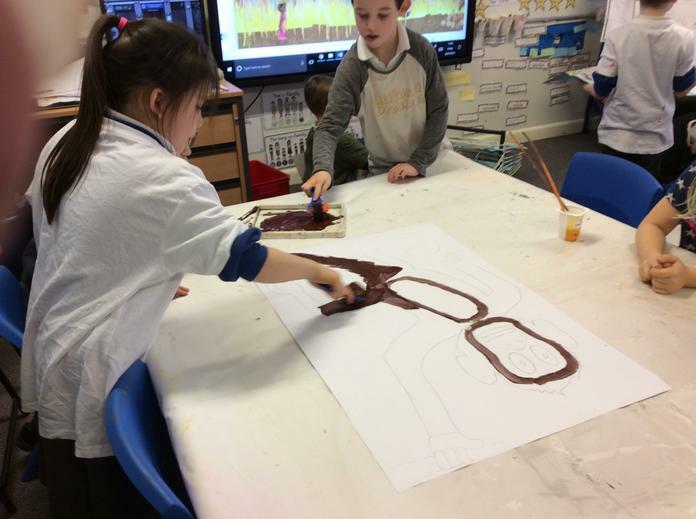 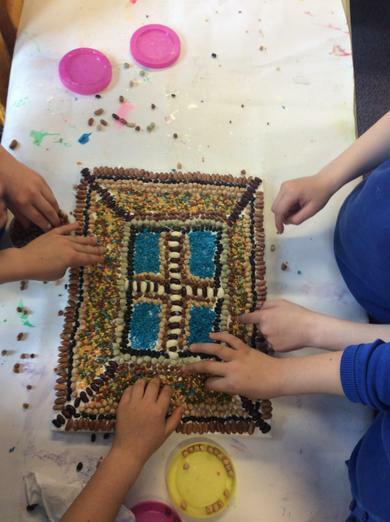 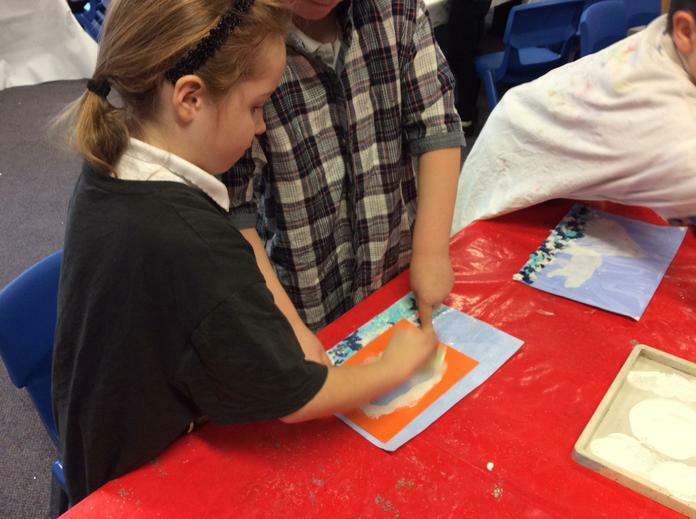 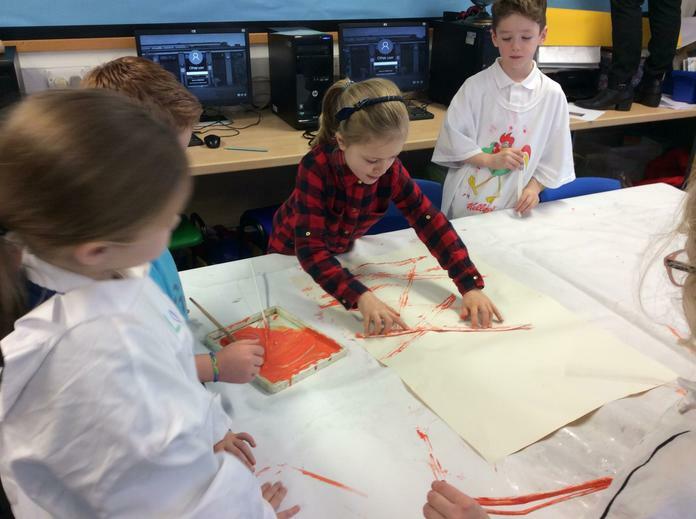 We created a piece of wax resistance art by using pastels and wax crayons. 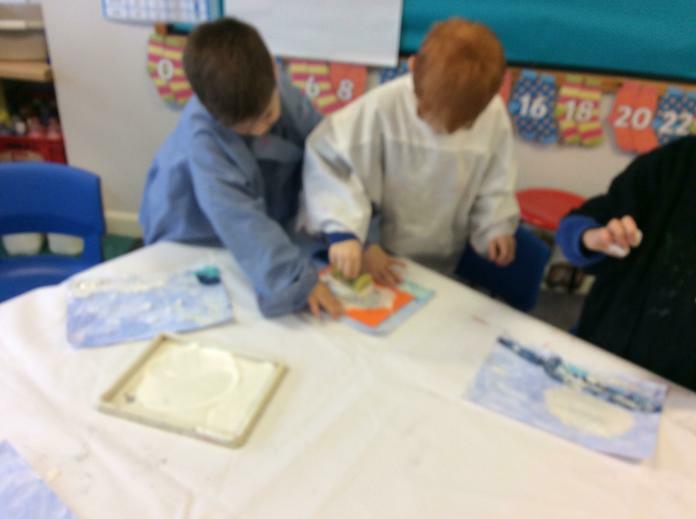 We then painted over it using watered down paint. 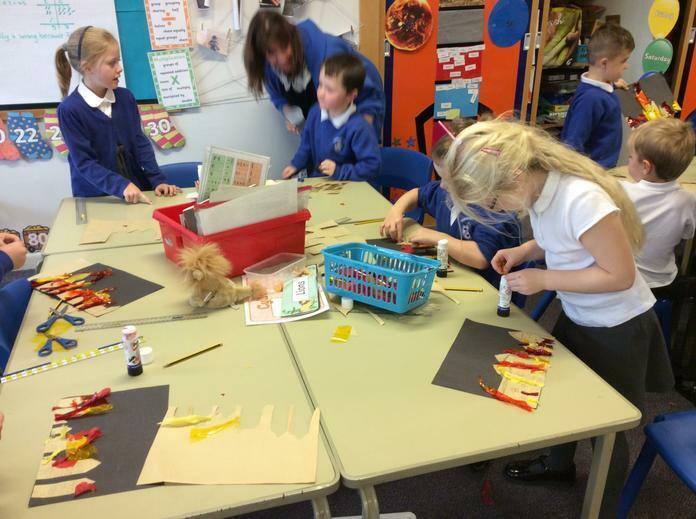 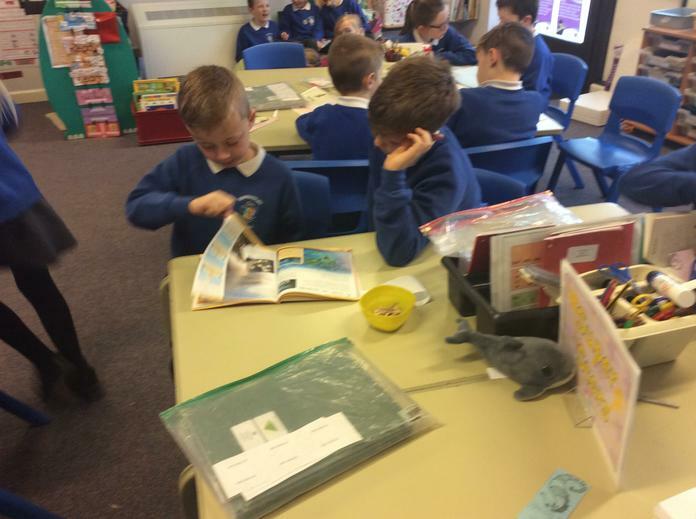 We are learning about different animals and how they are suited to their habitat. 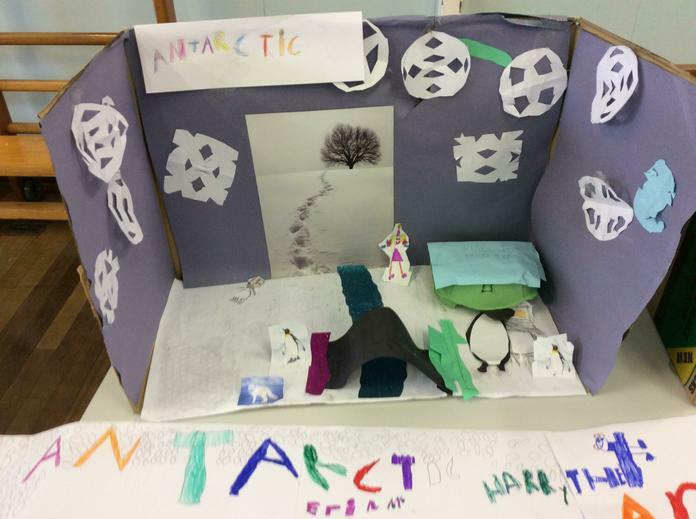 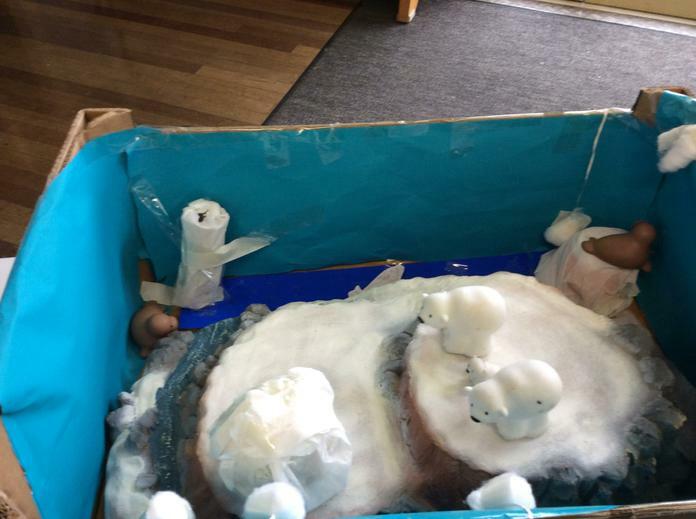 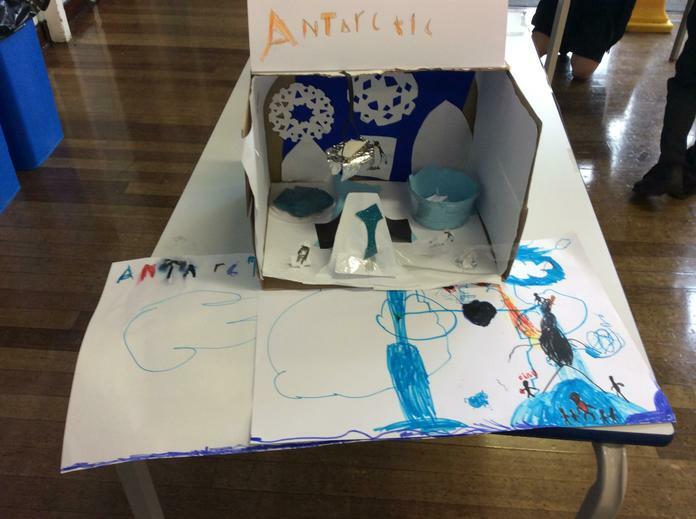 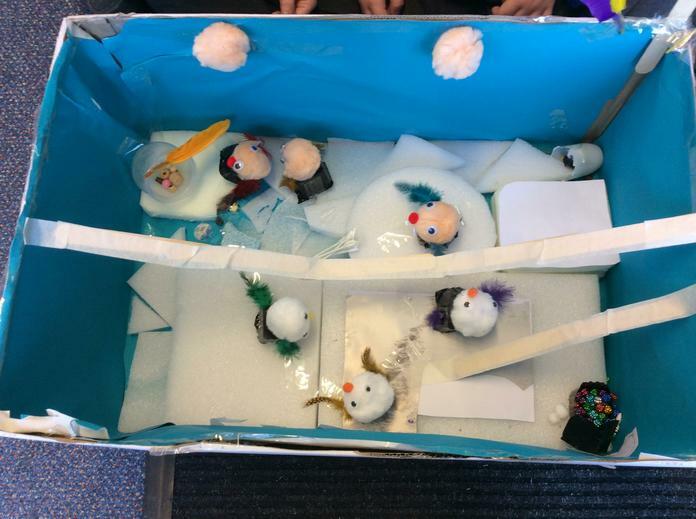 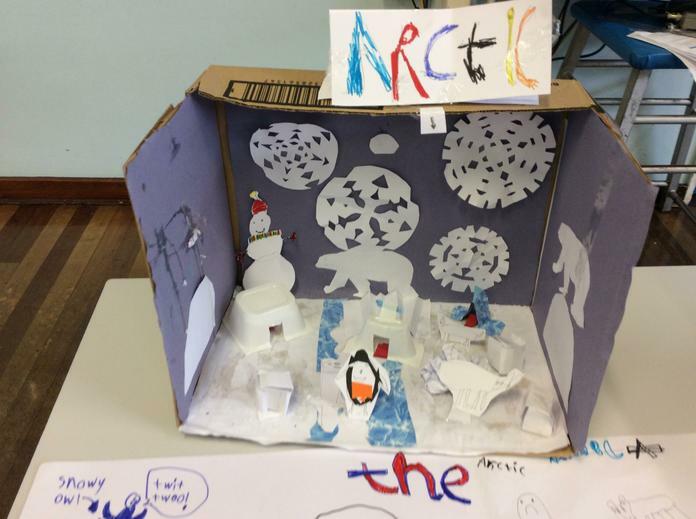 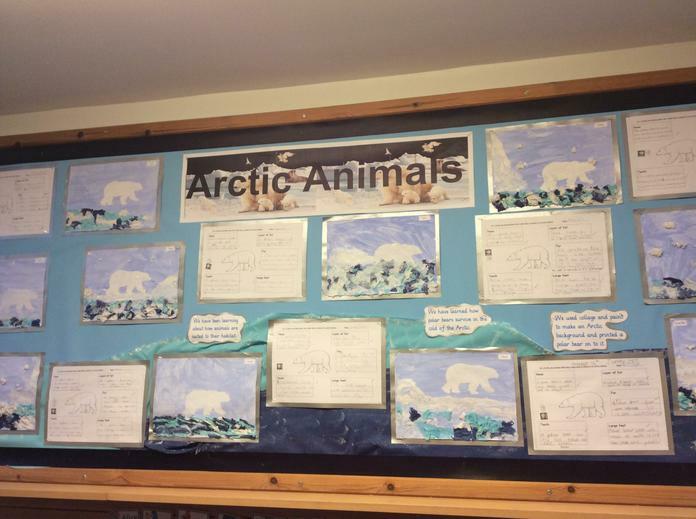 We have been learning about the Arctic and how different animals are adapted to live there. 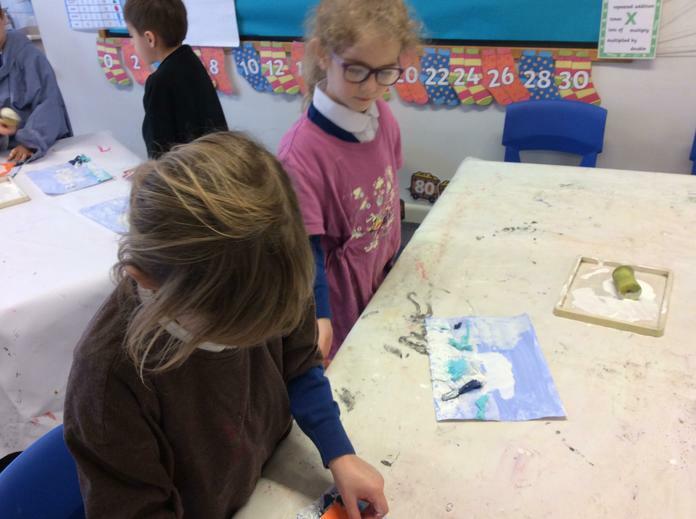 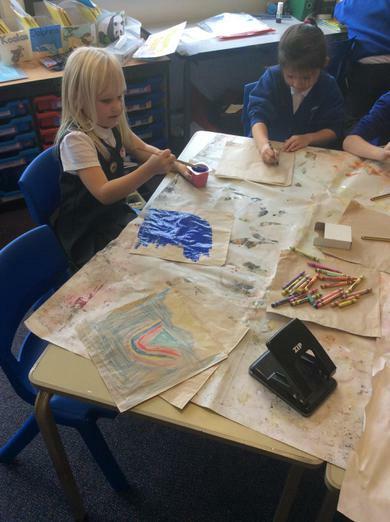 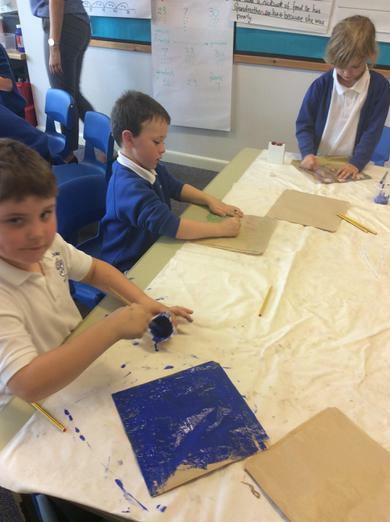 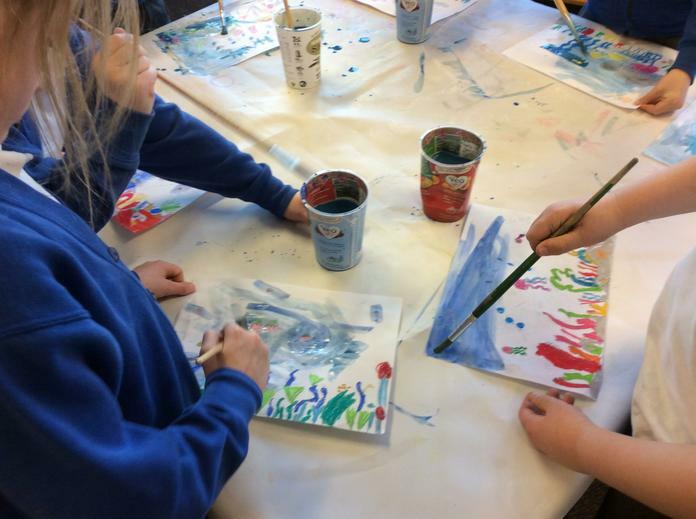 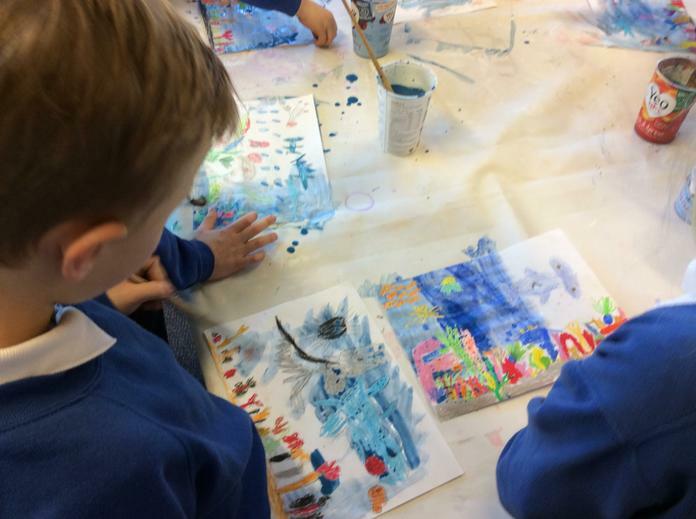 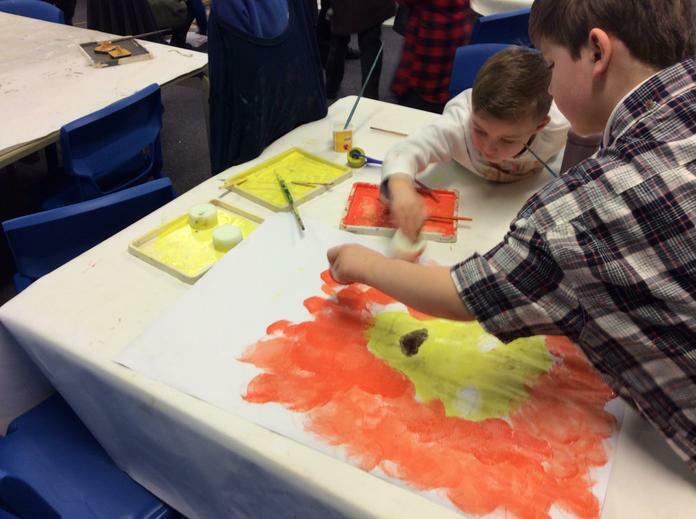 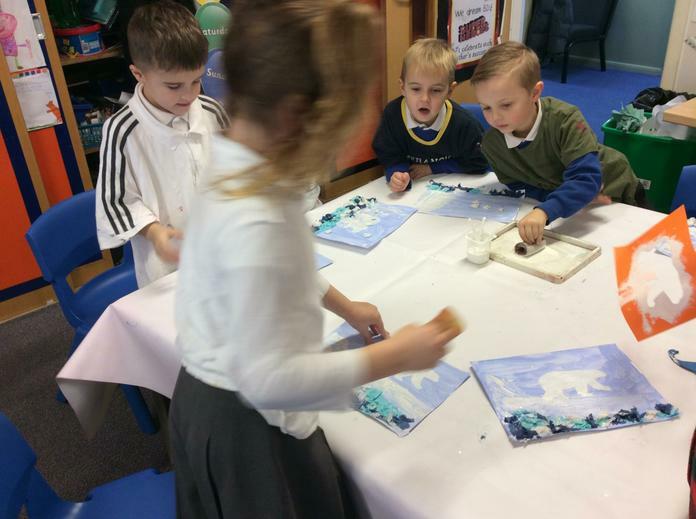 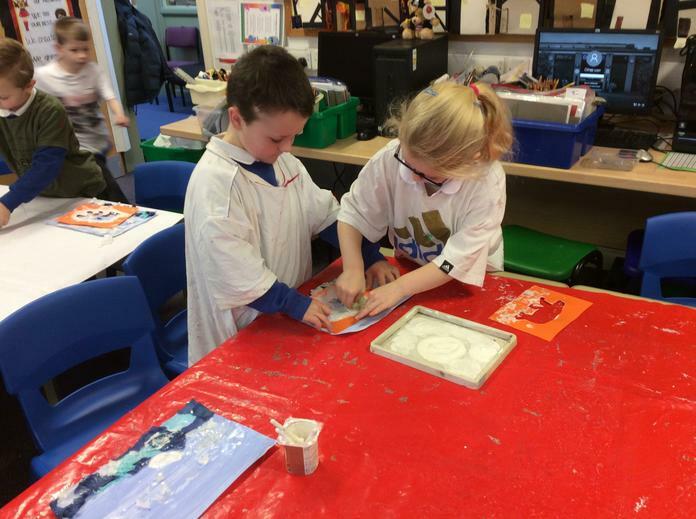 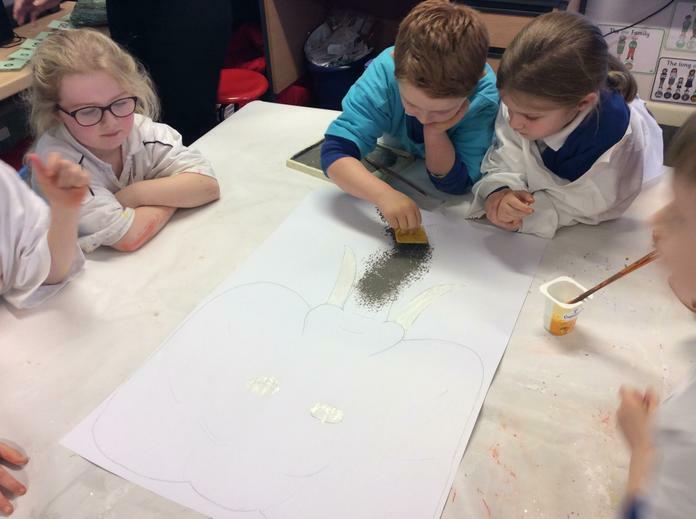 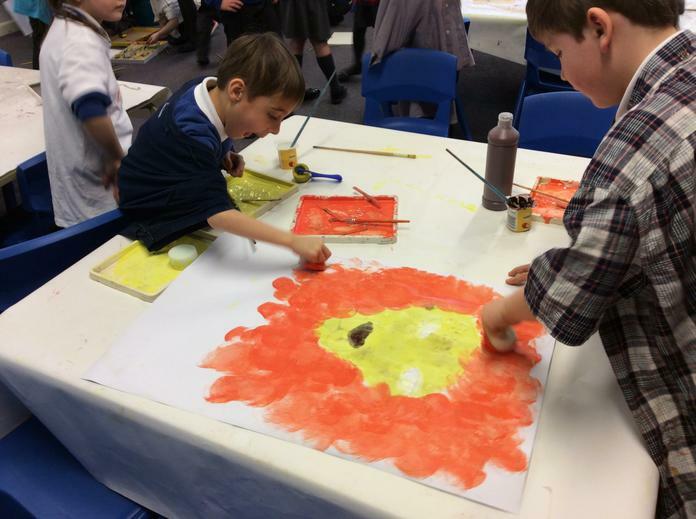 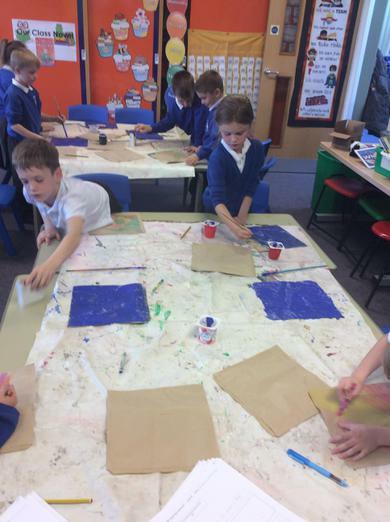 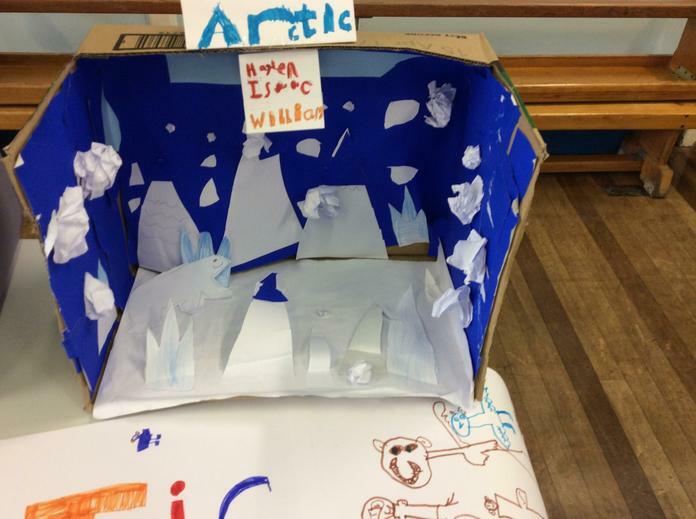 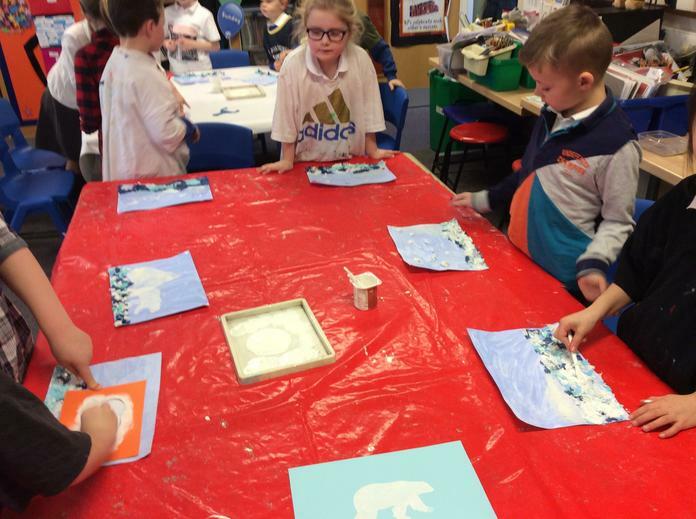 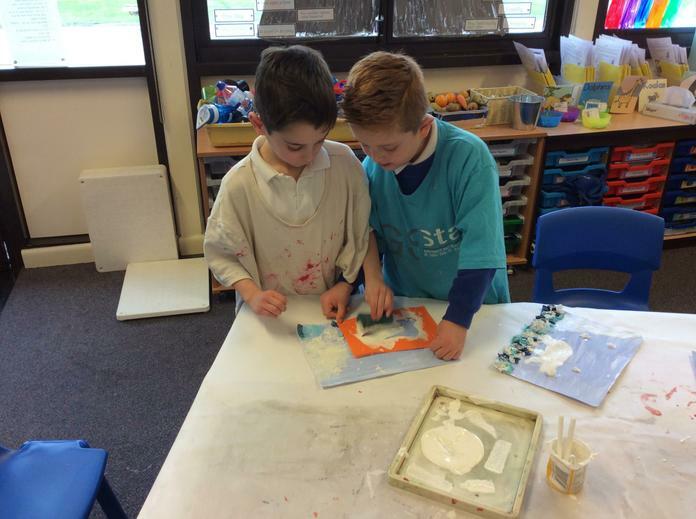 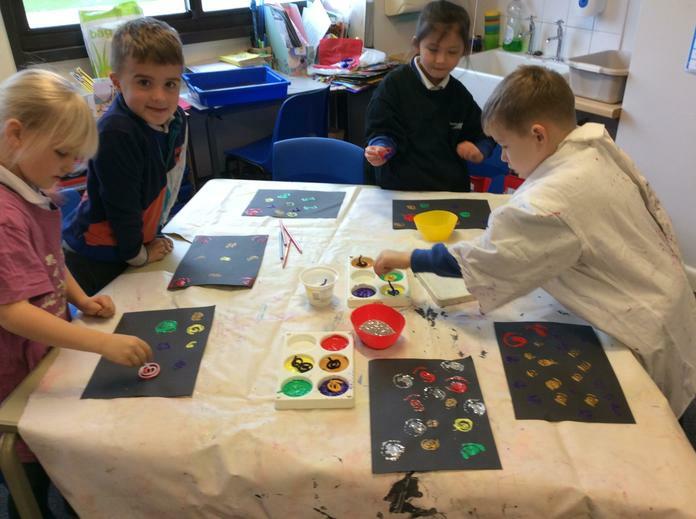 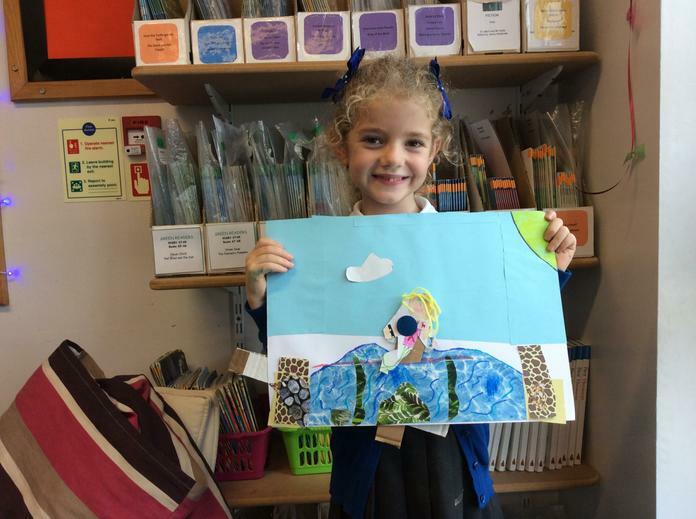 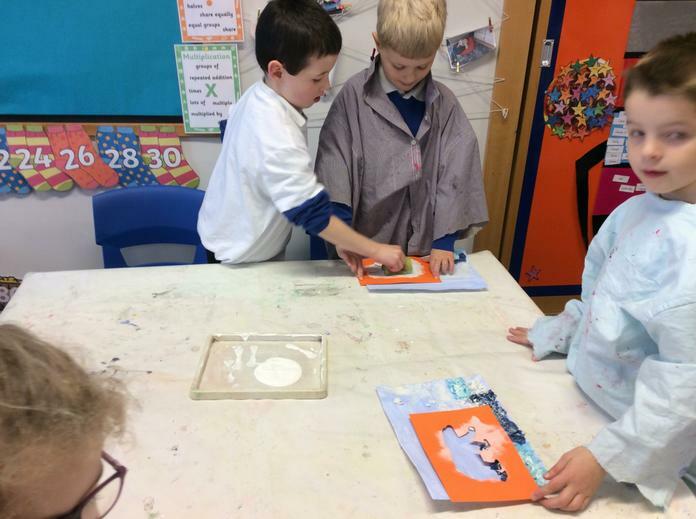 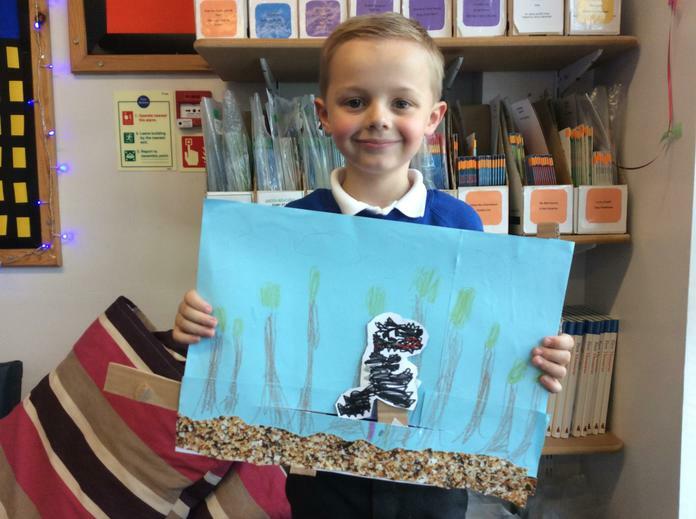 We made an Arctic background using different materials and printed a polar bear on to the background. 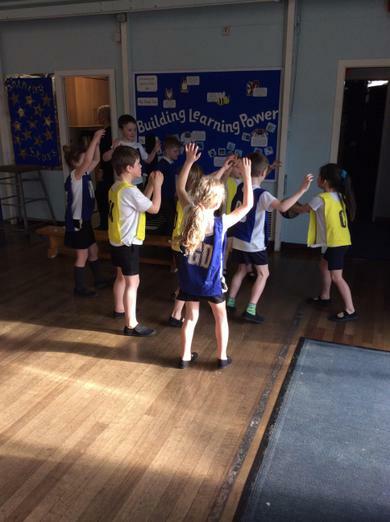 We 😍🏀! 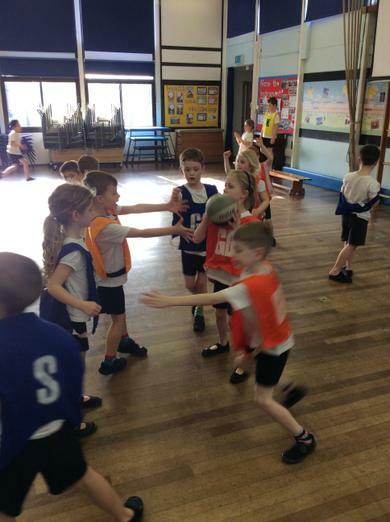 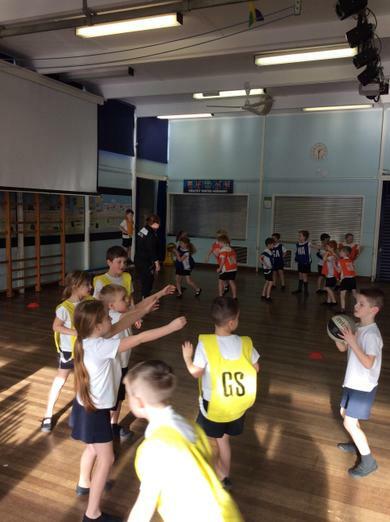 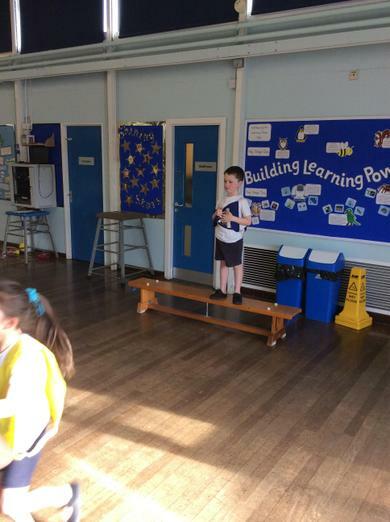 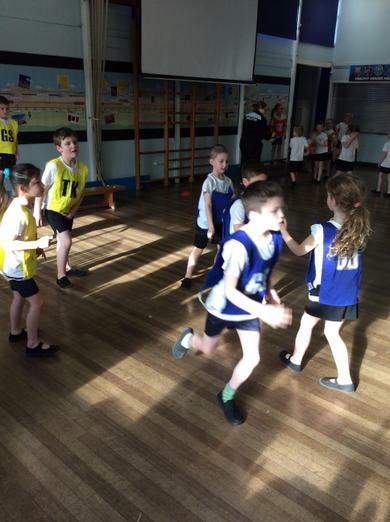 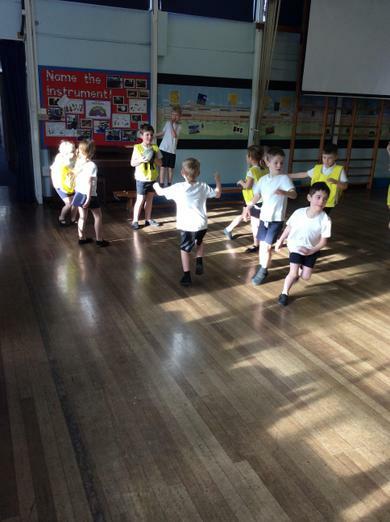 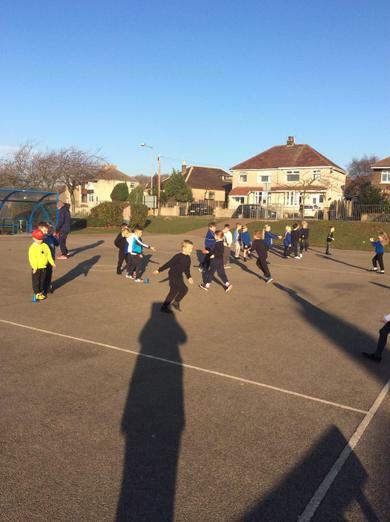 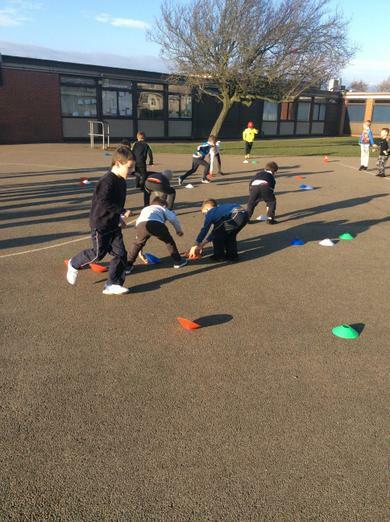 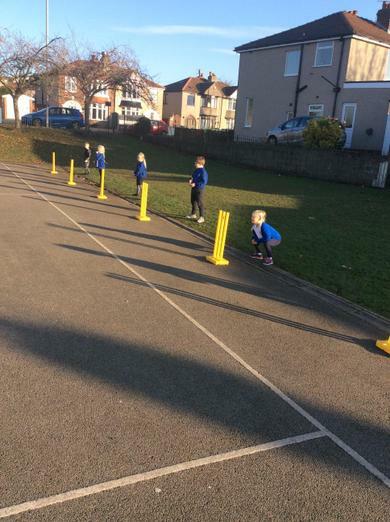 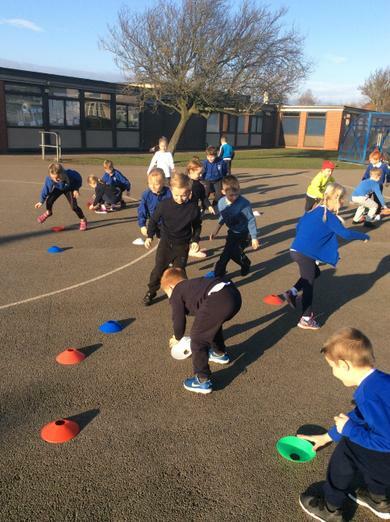 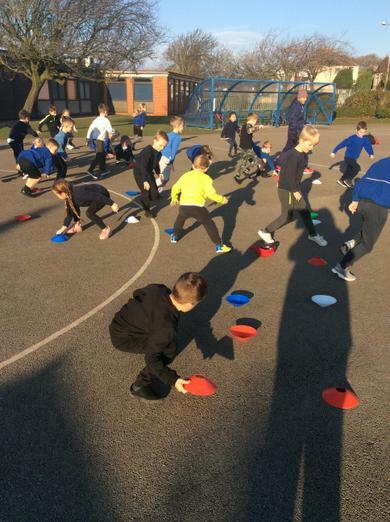 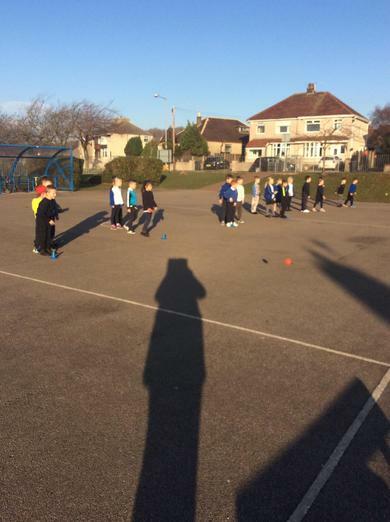 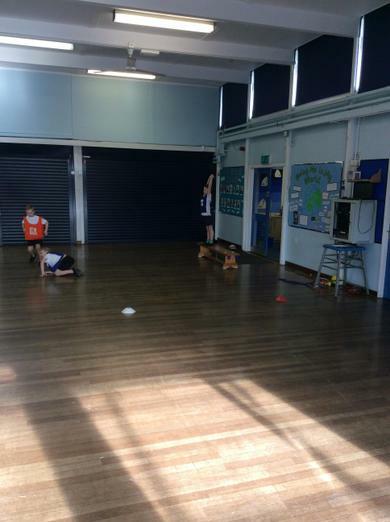 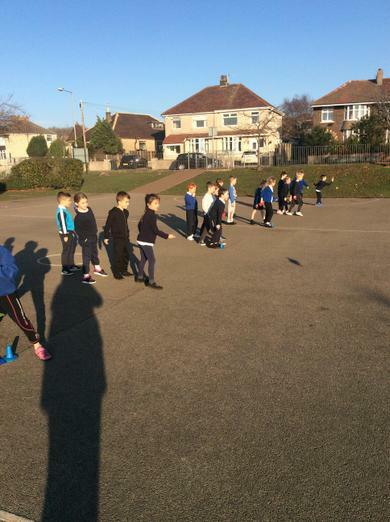 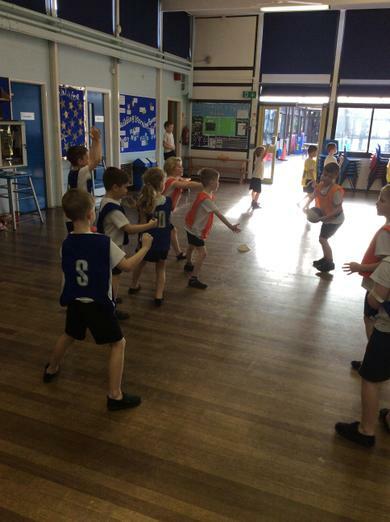 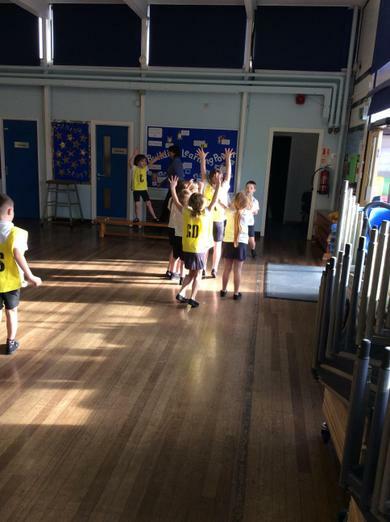 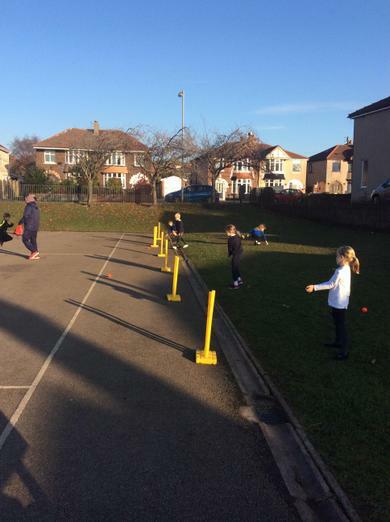 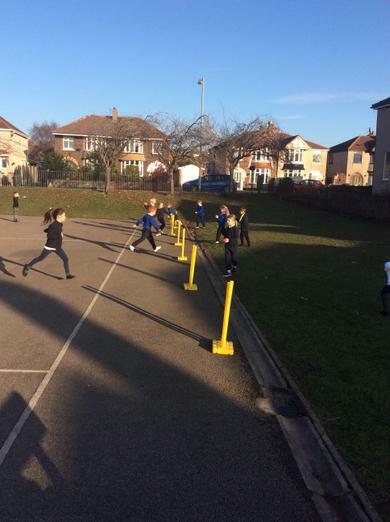 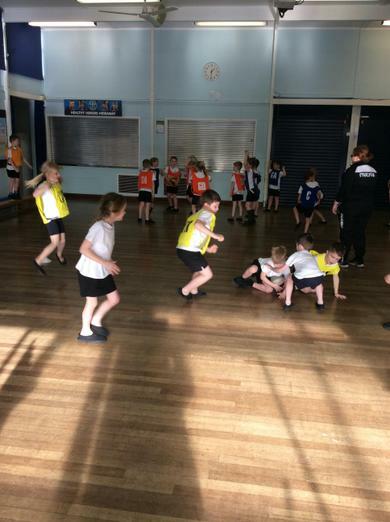 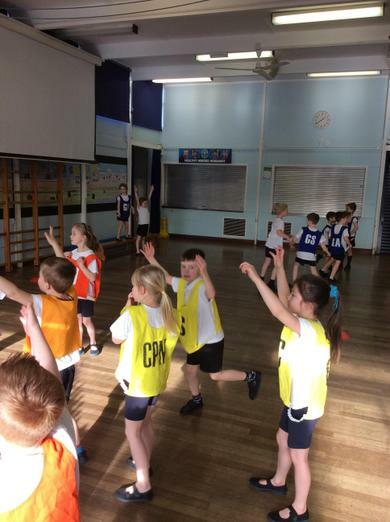 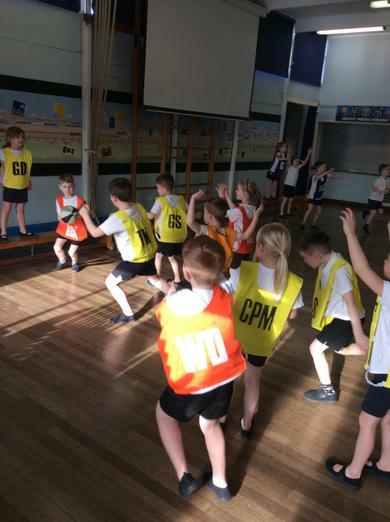 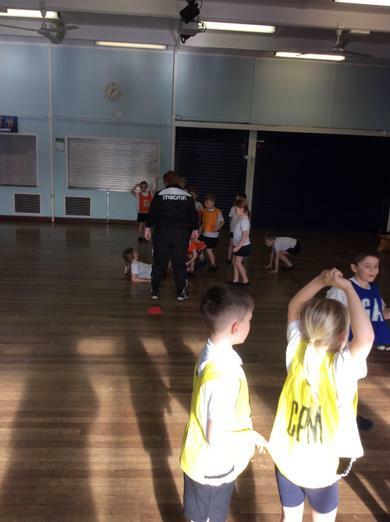 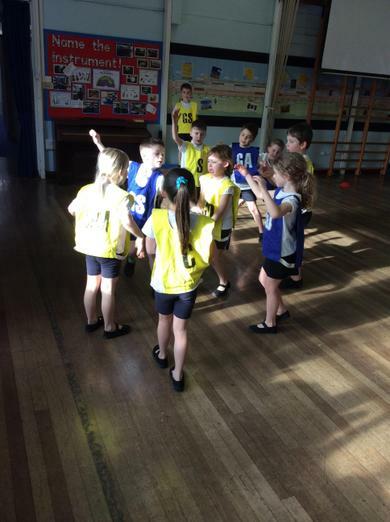 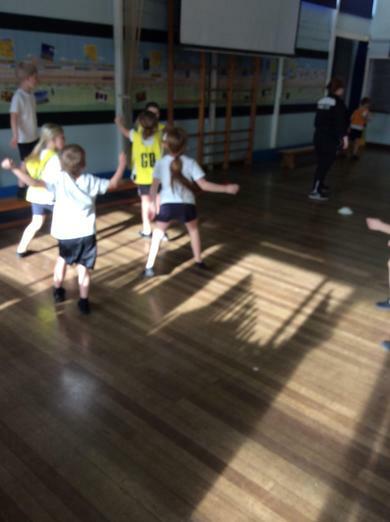 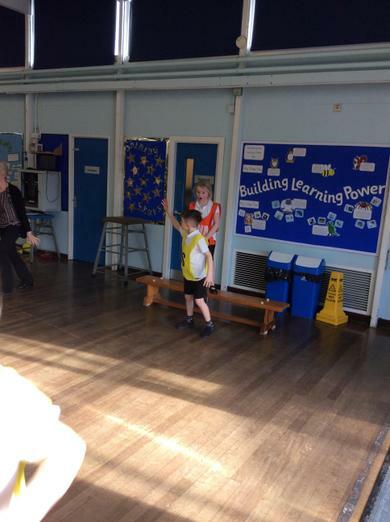 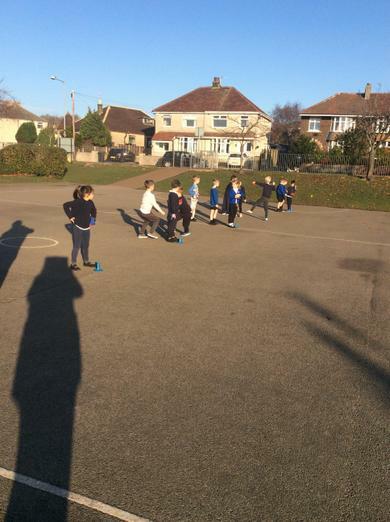 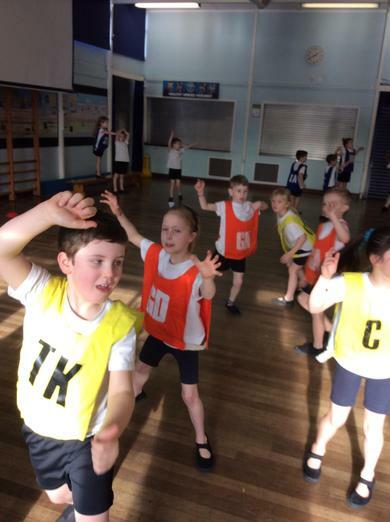 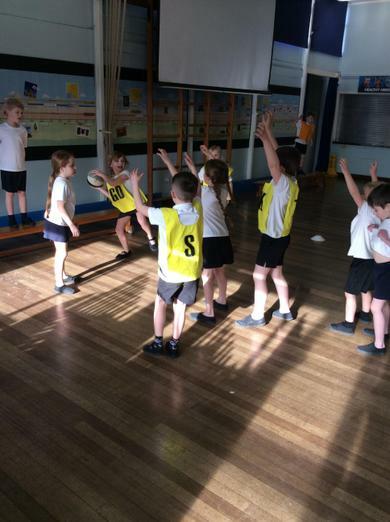 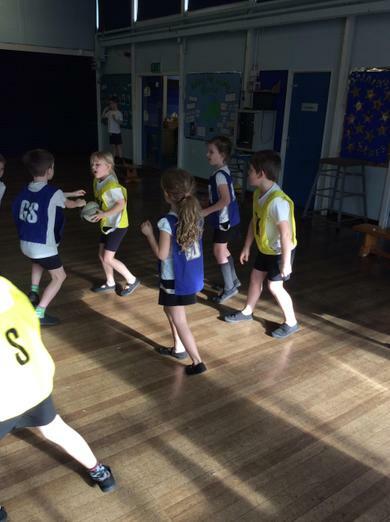 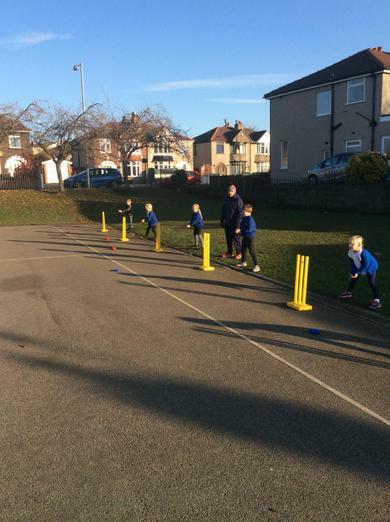 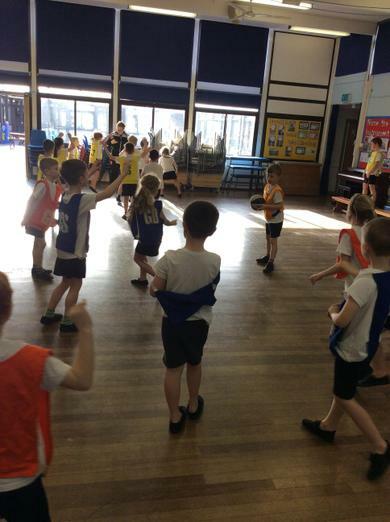 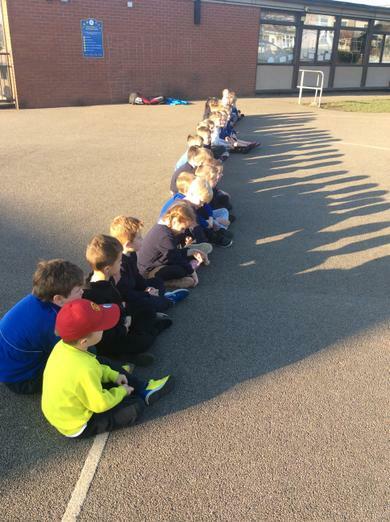 This half term we’ve enjoyed developing our basketball skills. 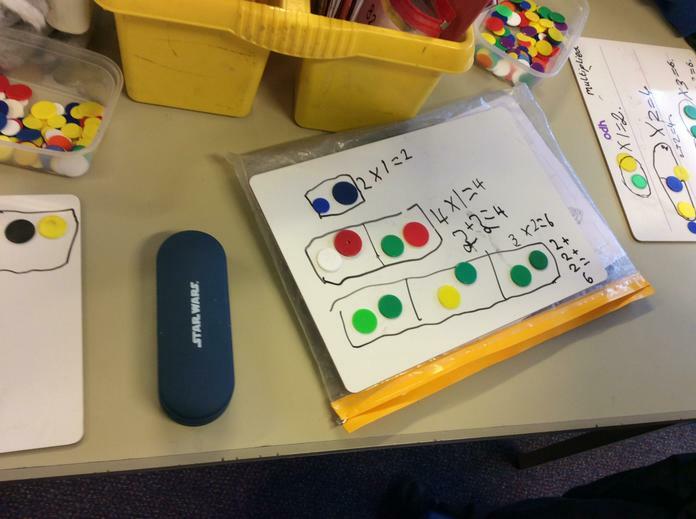 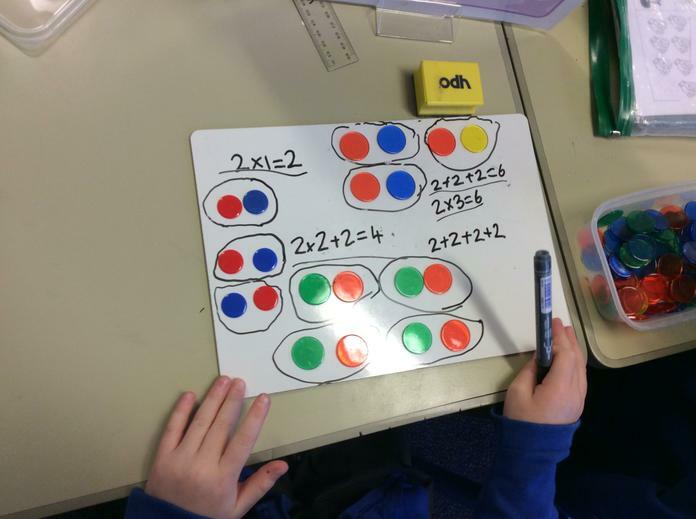 We are learning about multiplication. 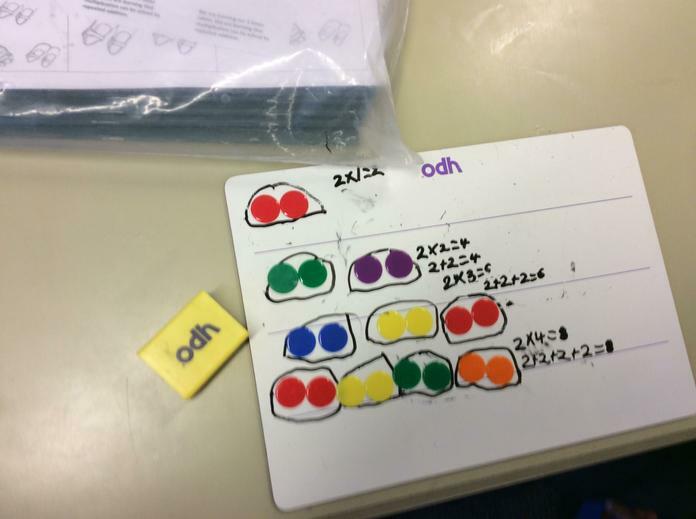 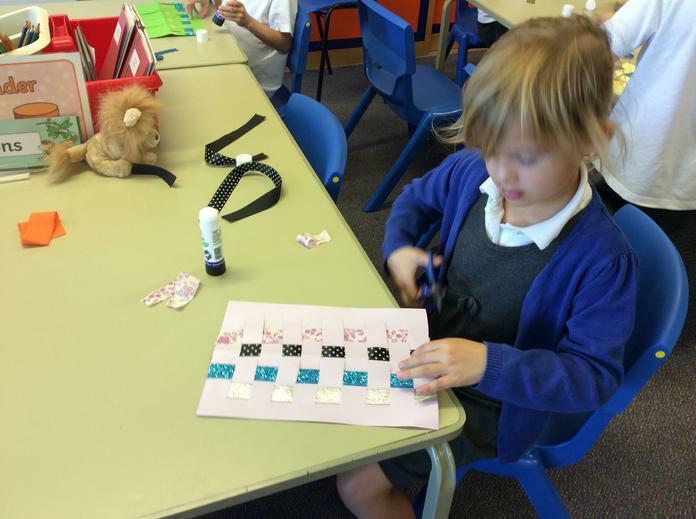 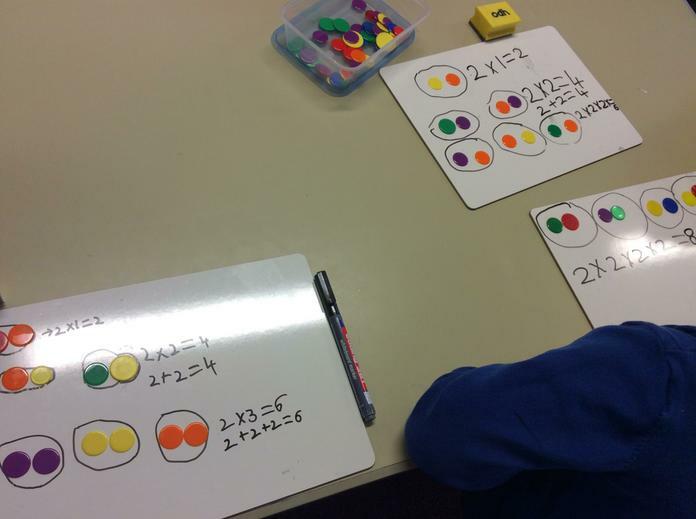 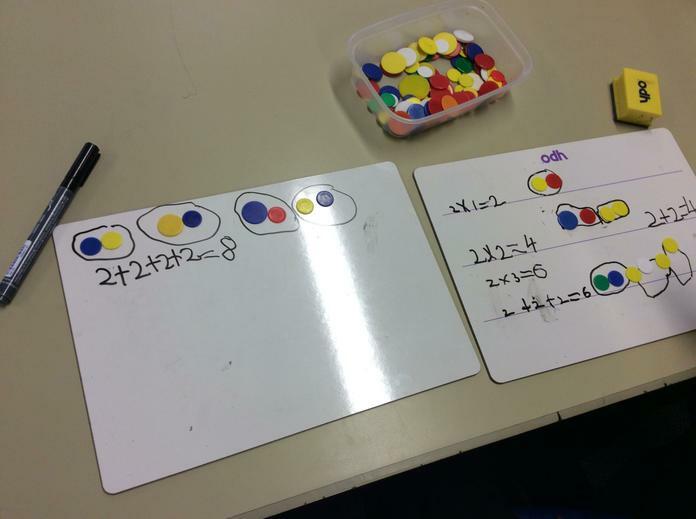 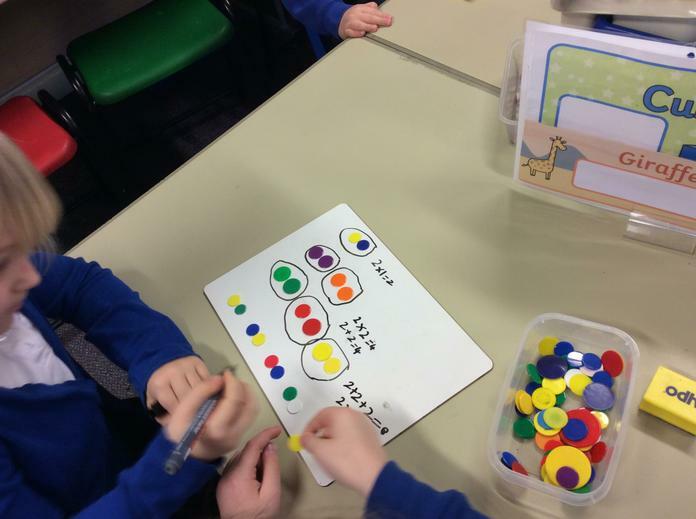 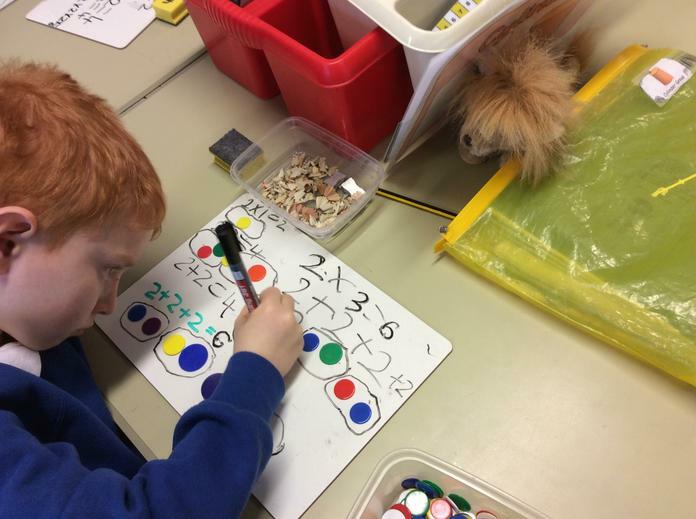 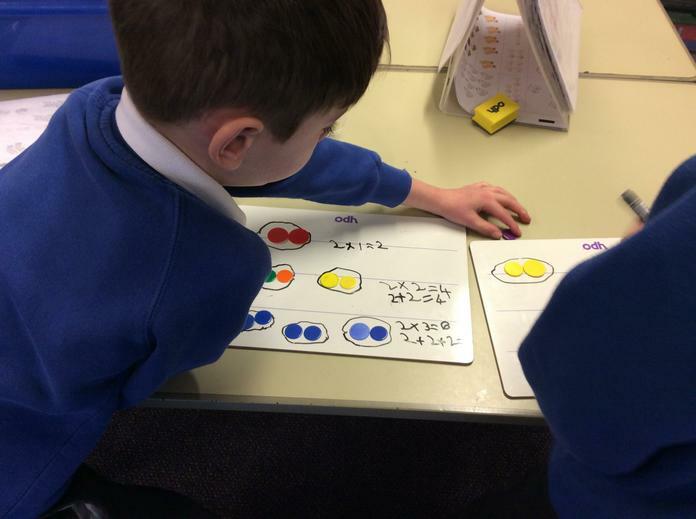 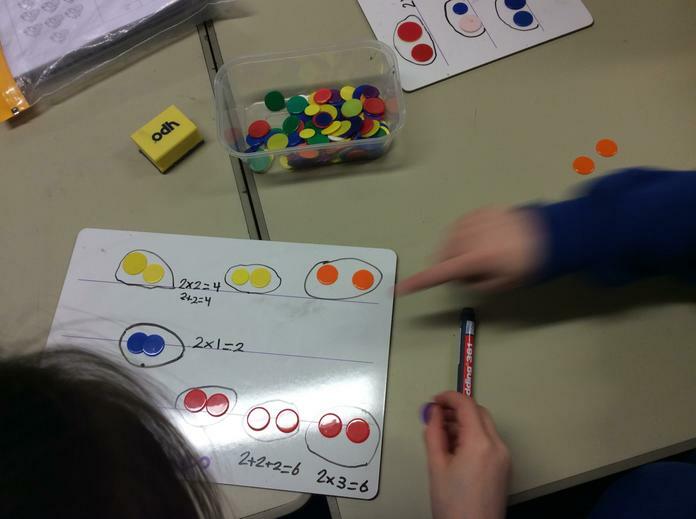 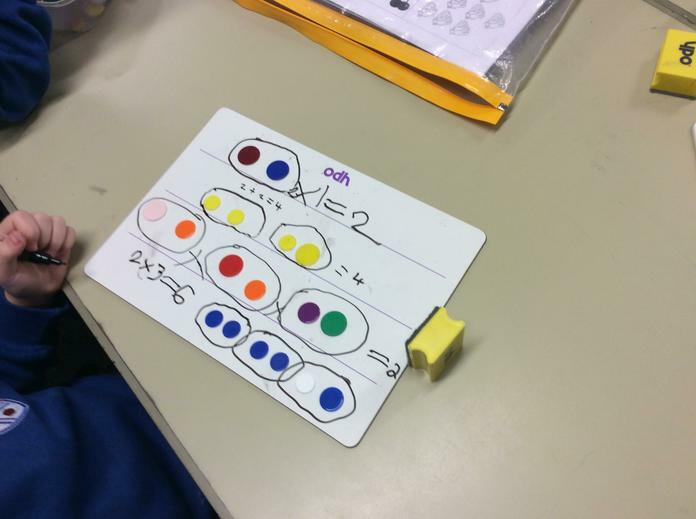 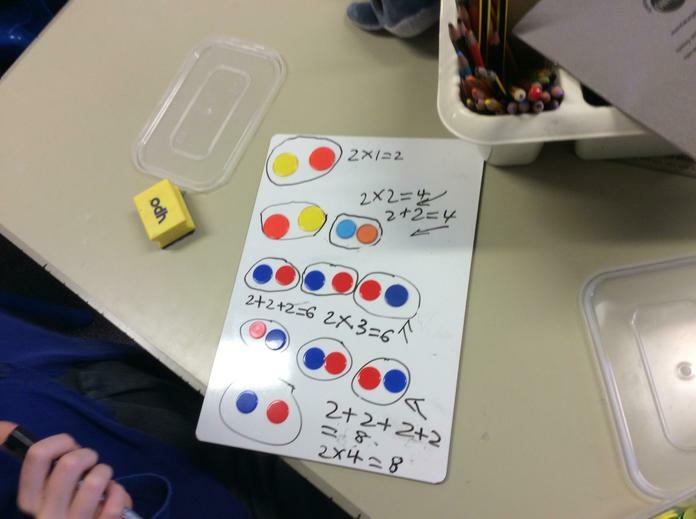 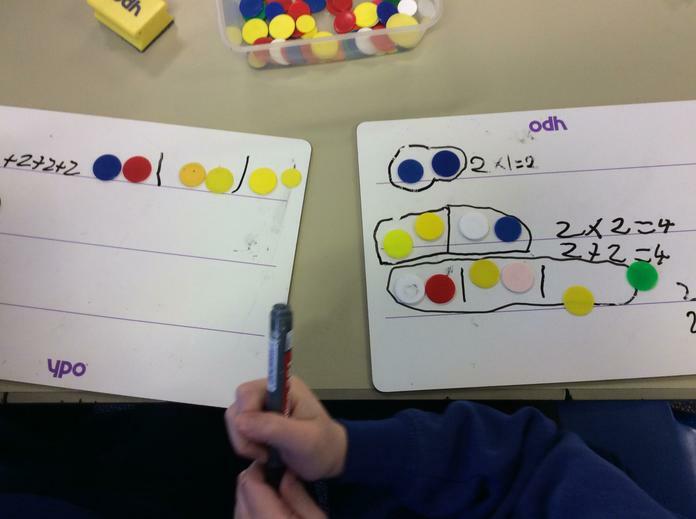 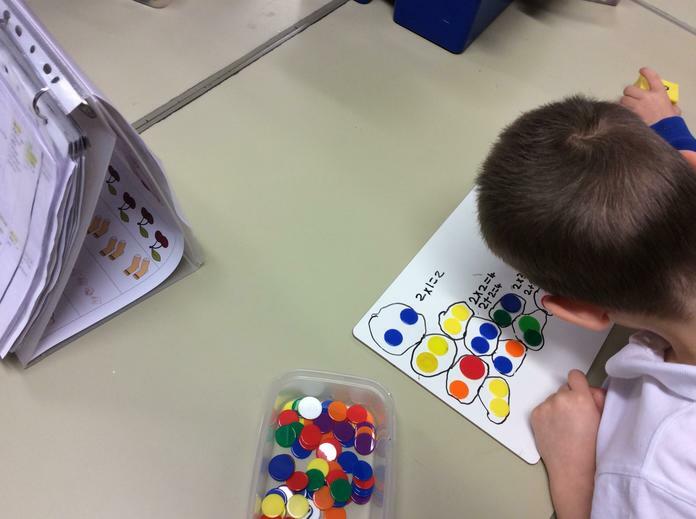 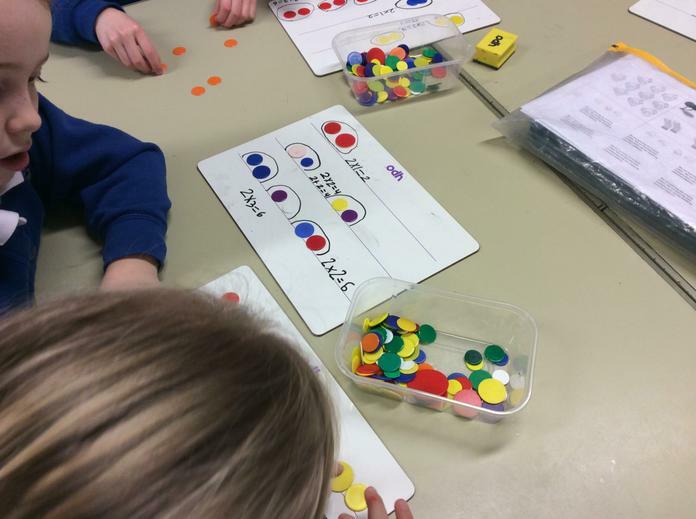 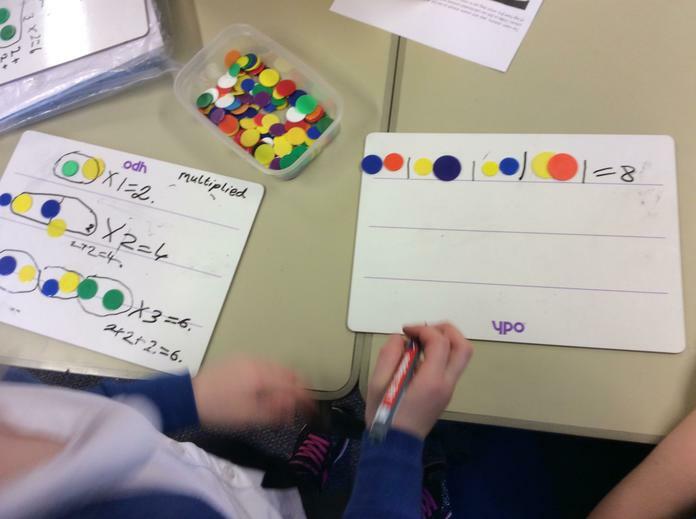 We have shown this by making it with counters and writing it as a repeated addition calculation and a multiplication calculation. 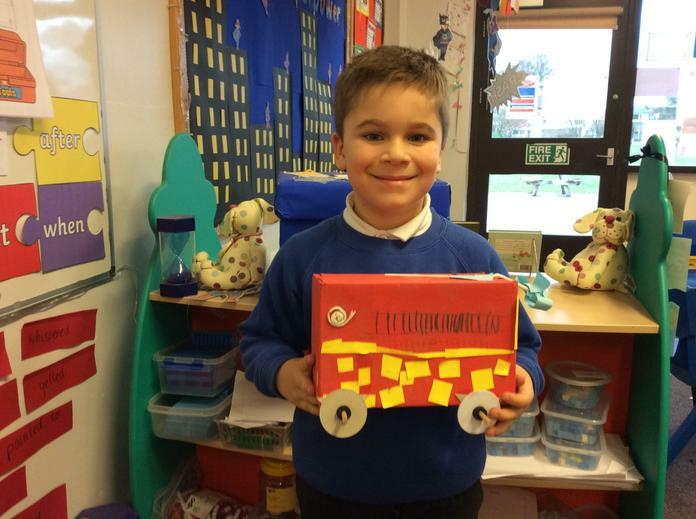 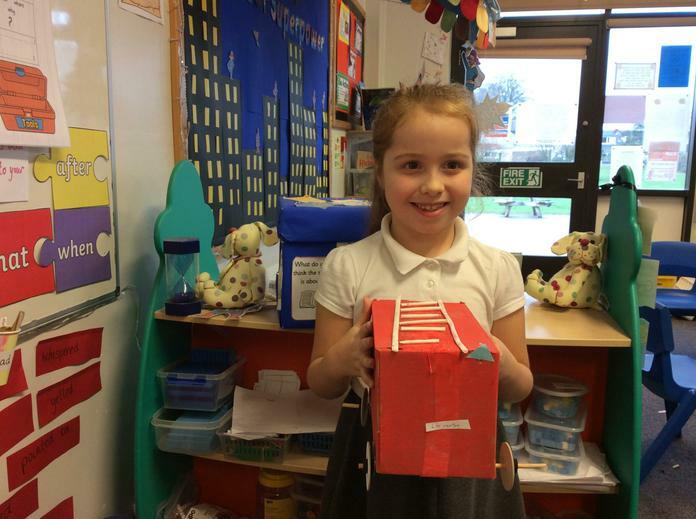 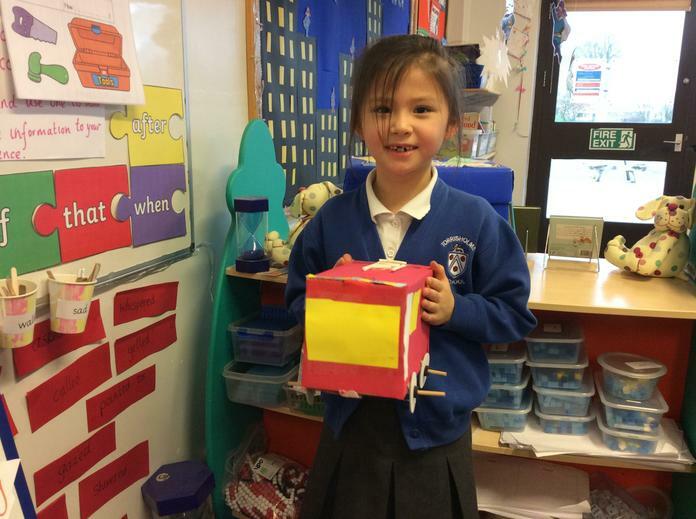 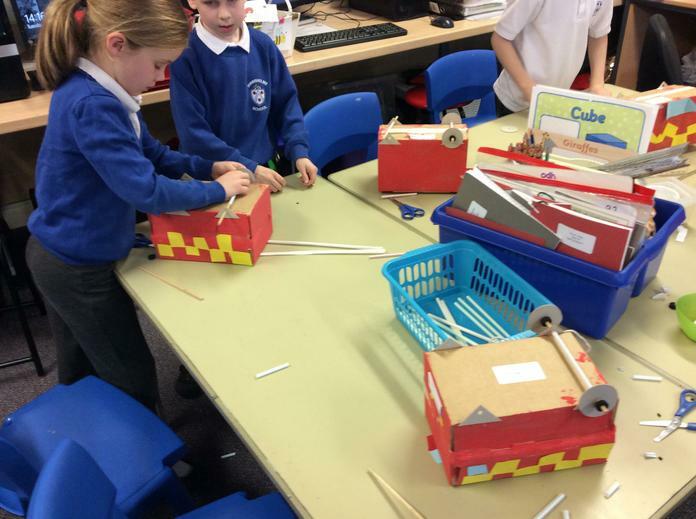 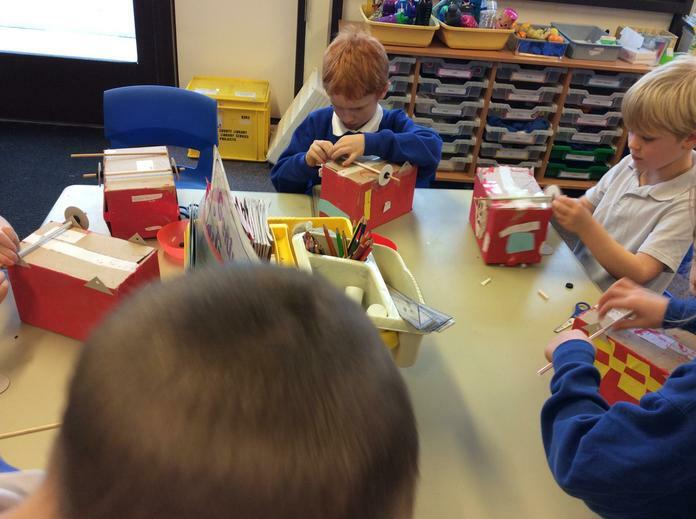 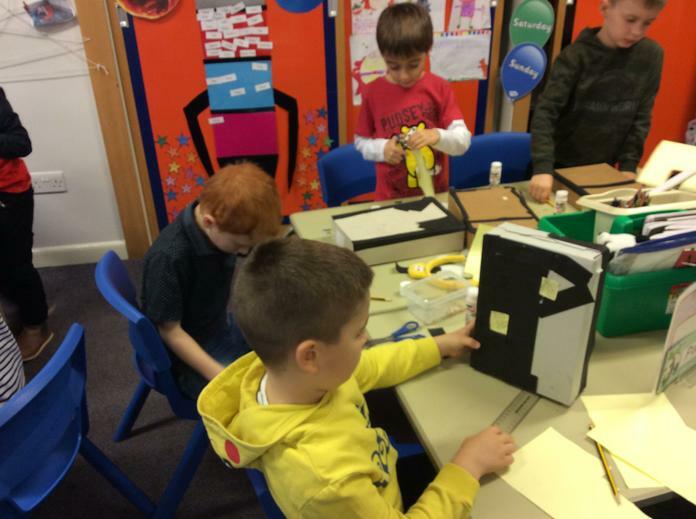 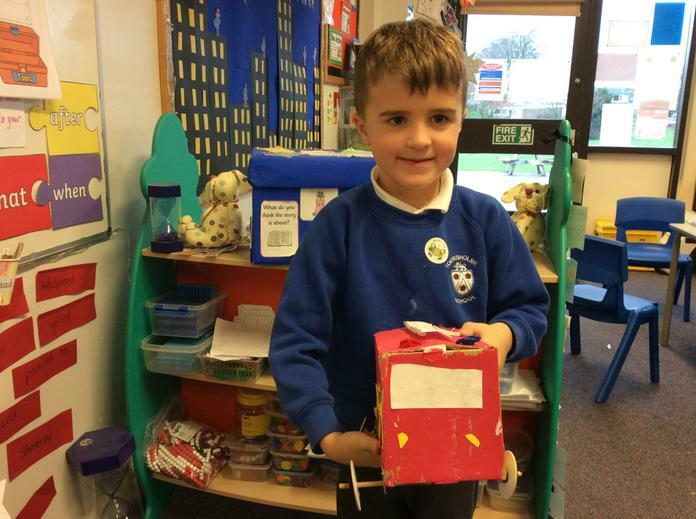 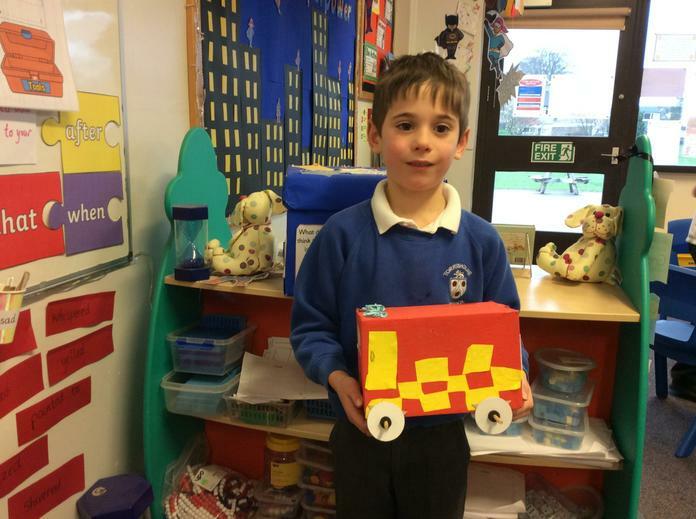 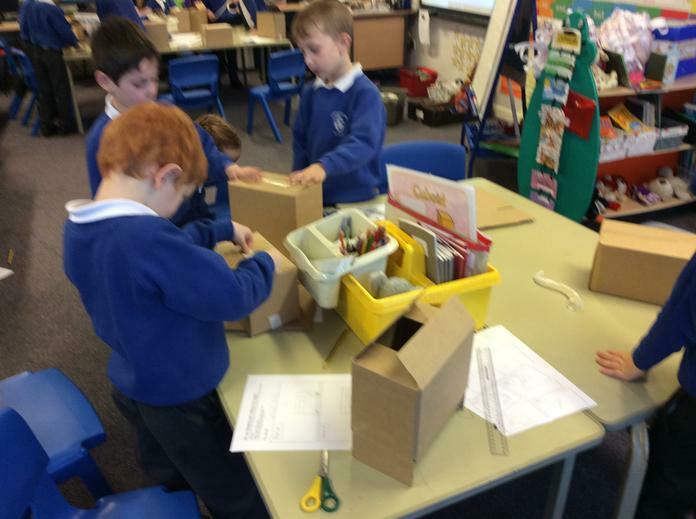 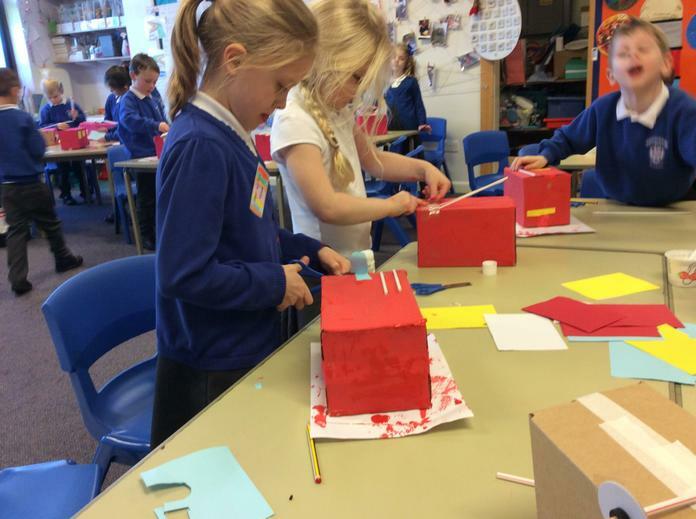 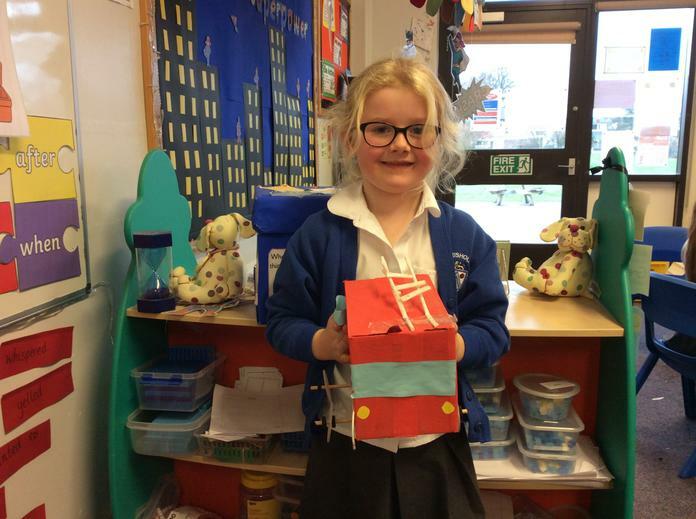 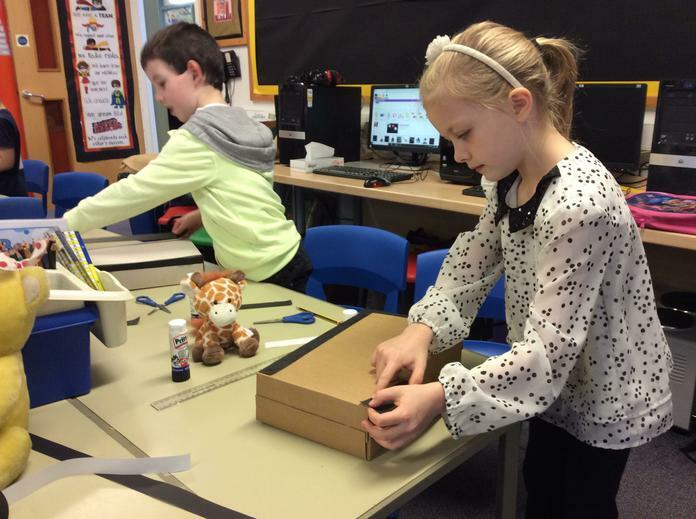 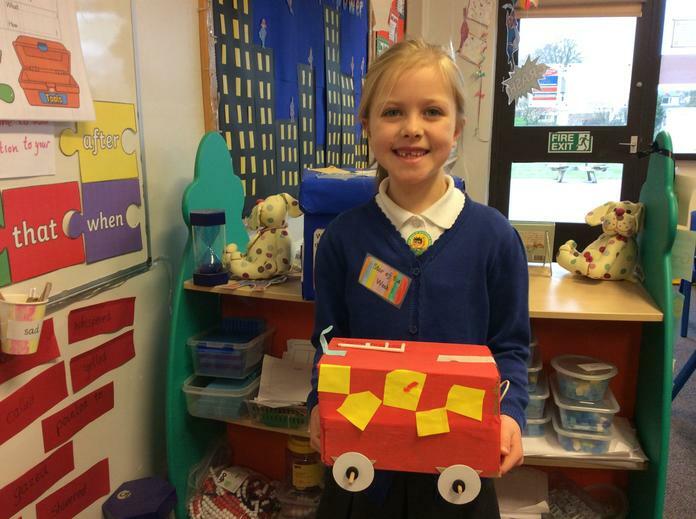 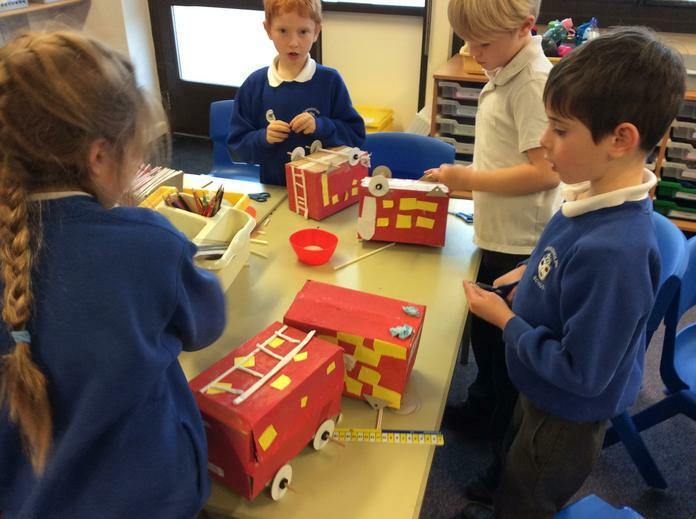 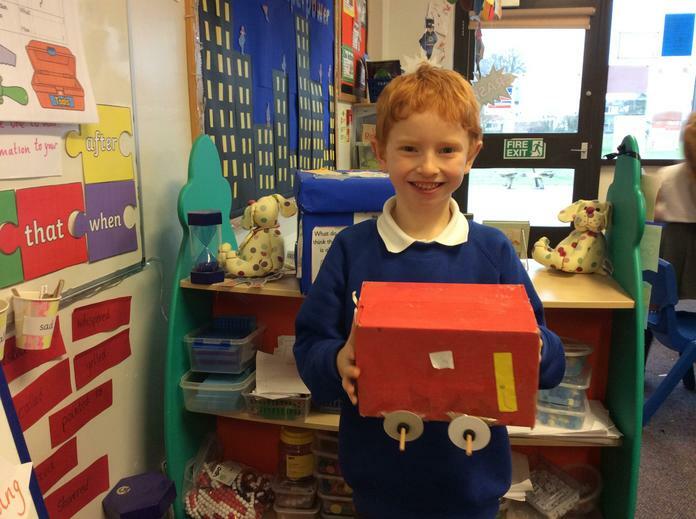 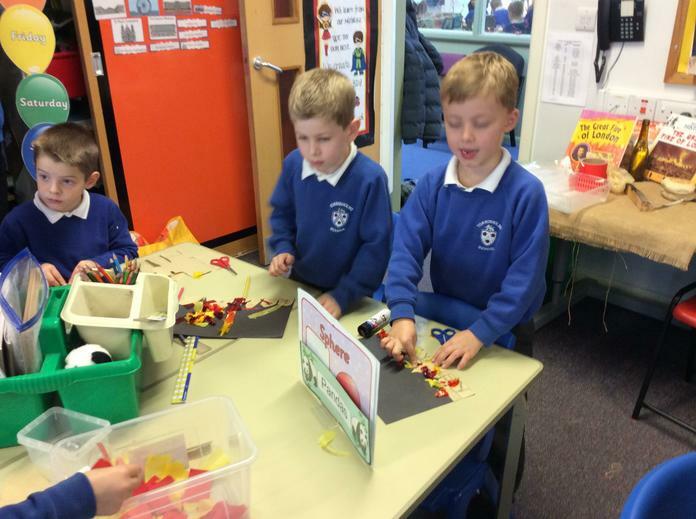 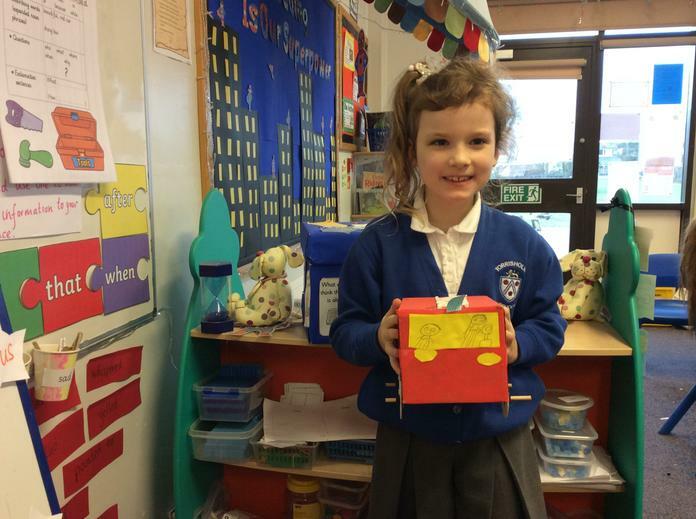 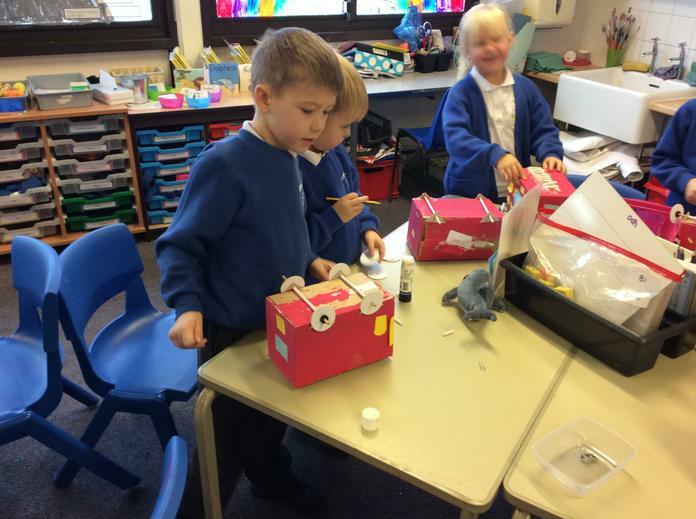 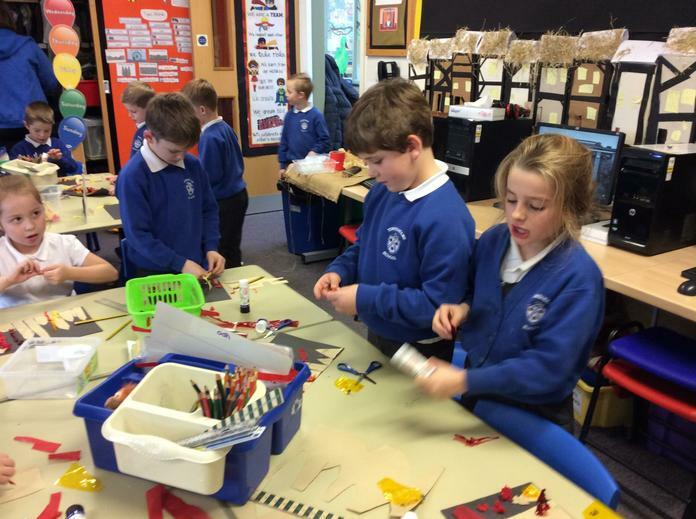 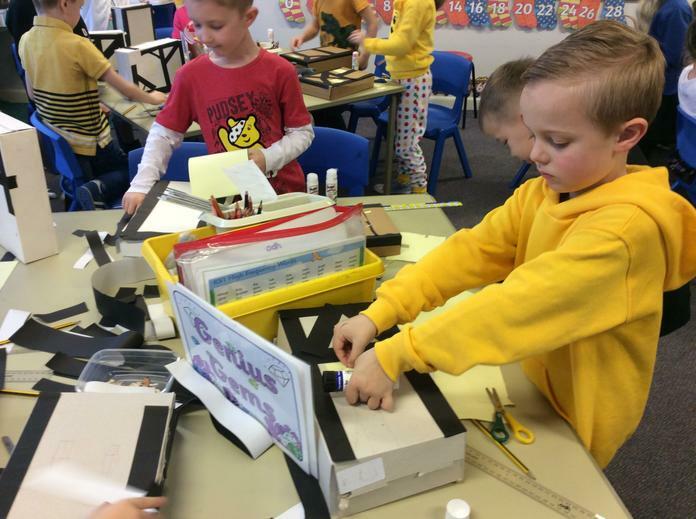 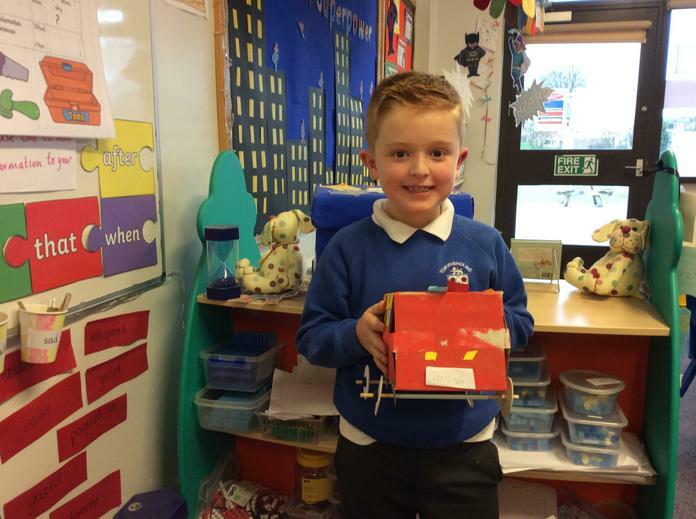 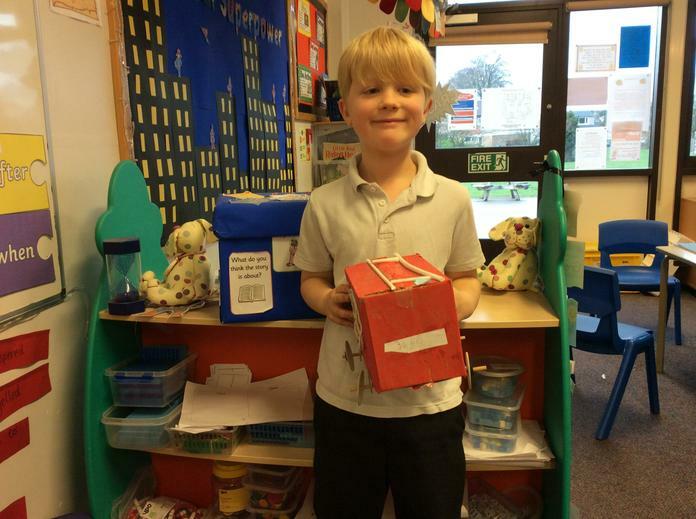 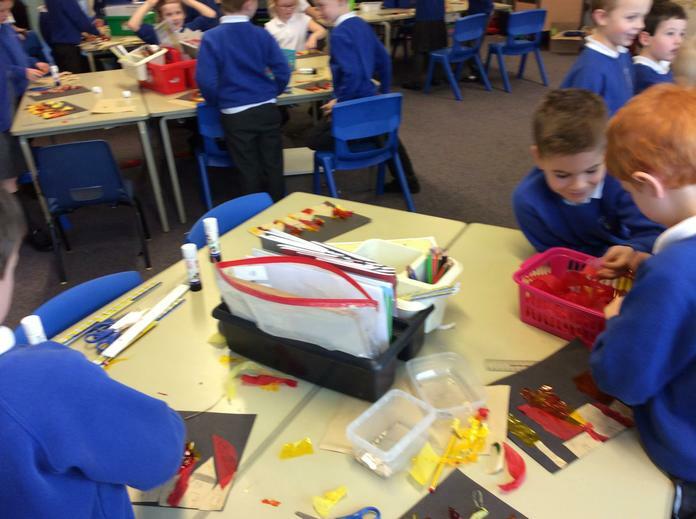 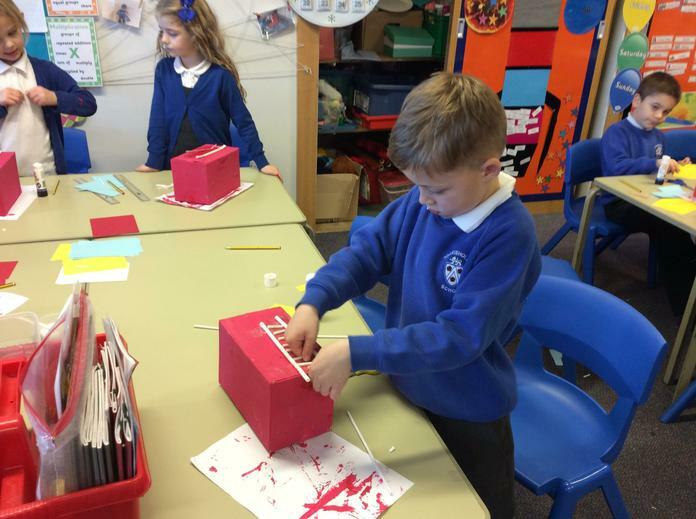 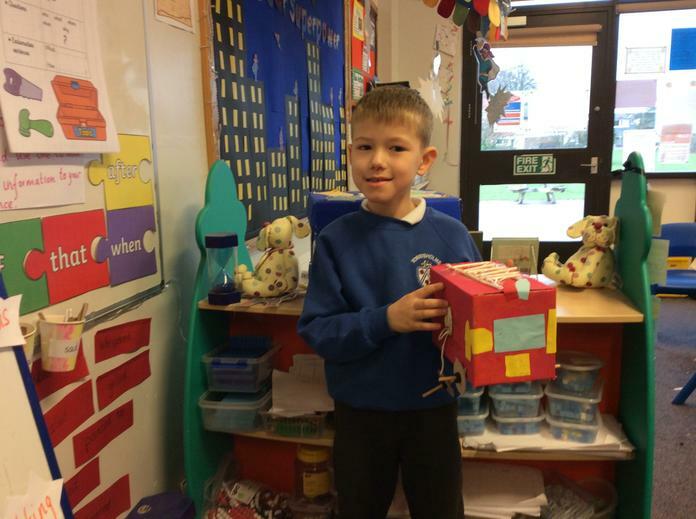 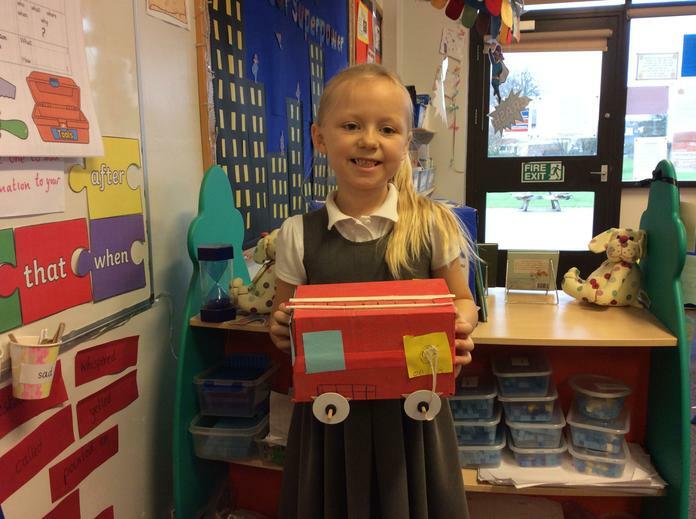 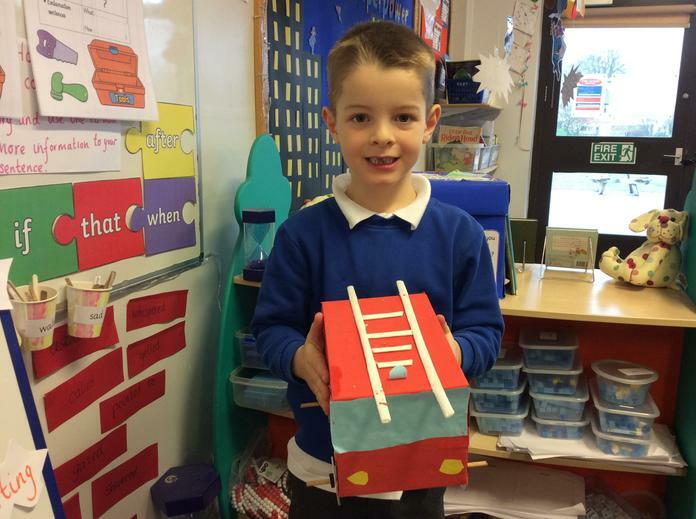 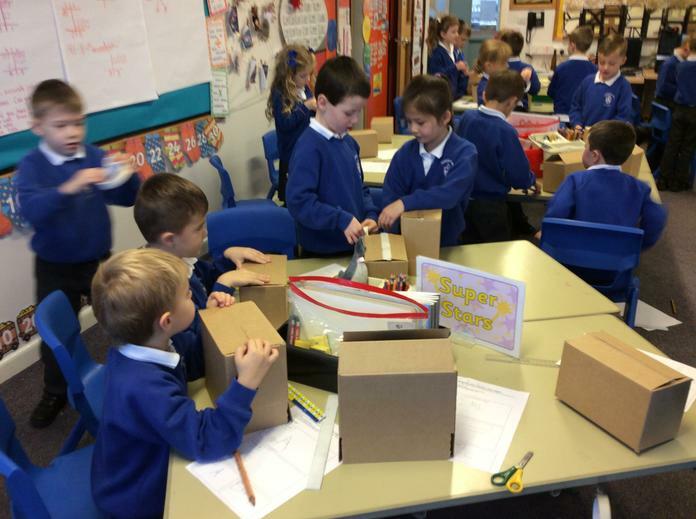 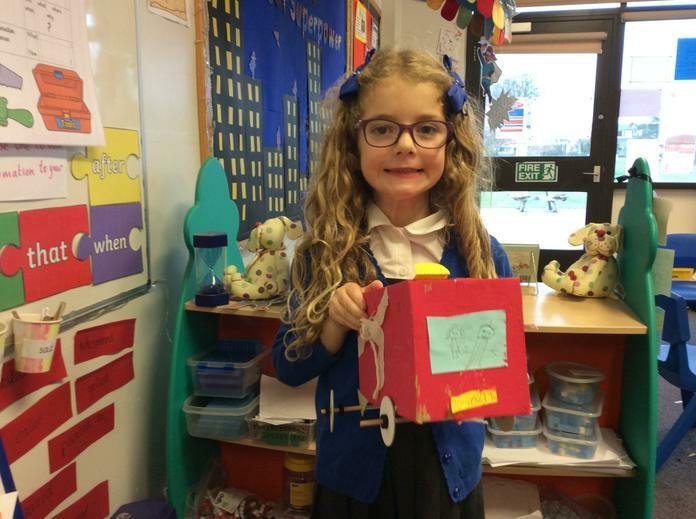 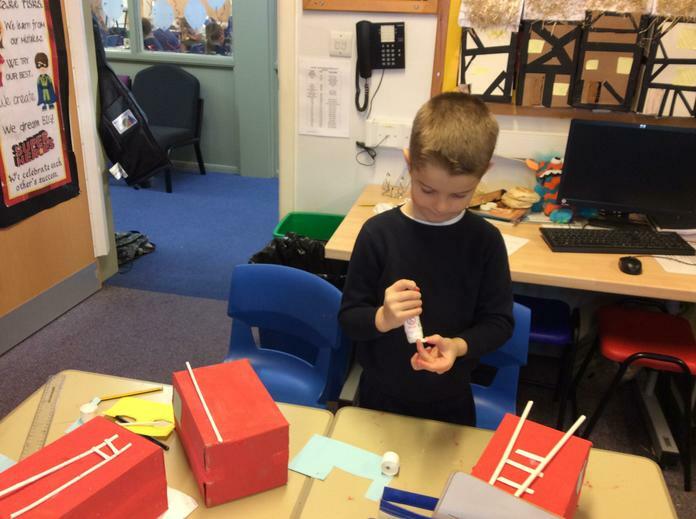 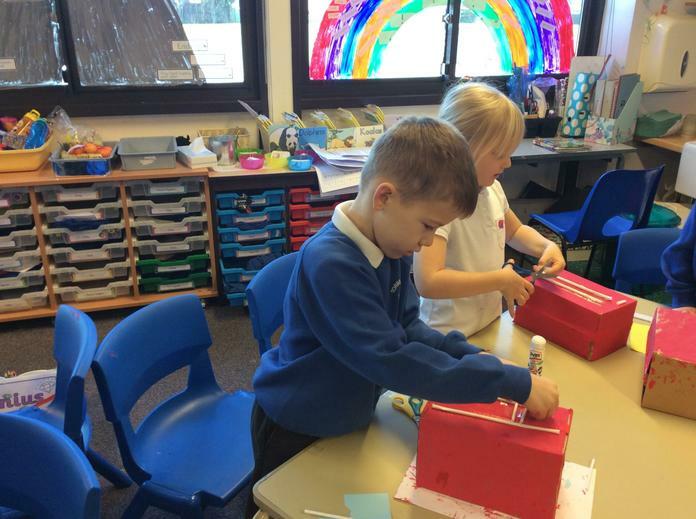 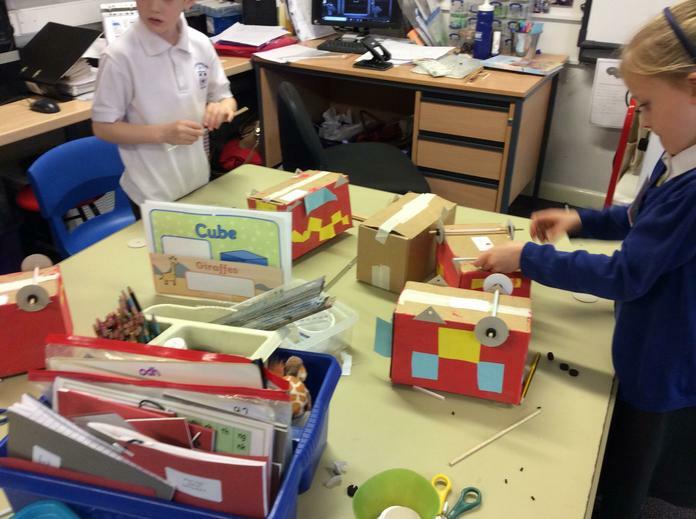 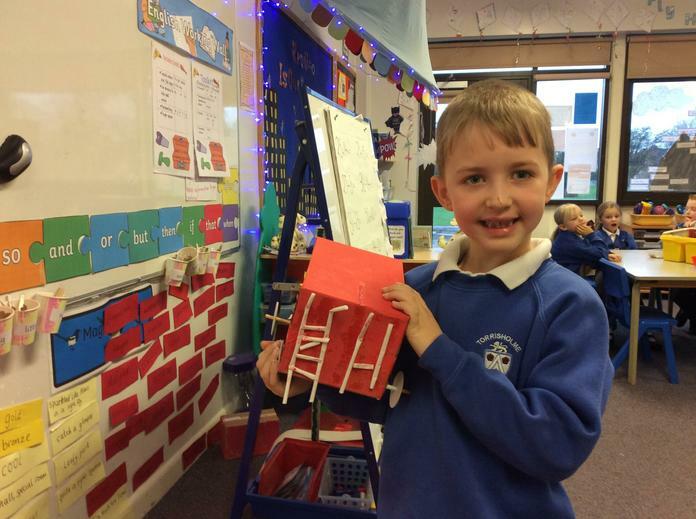 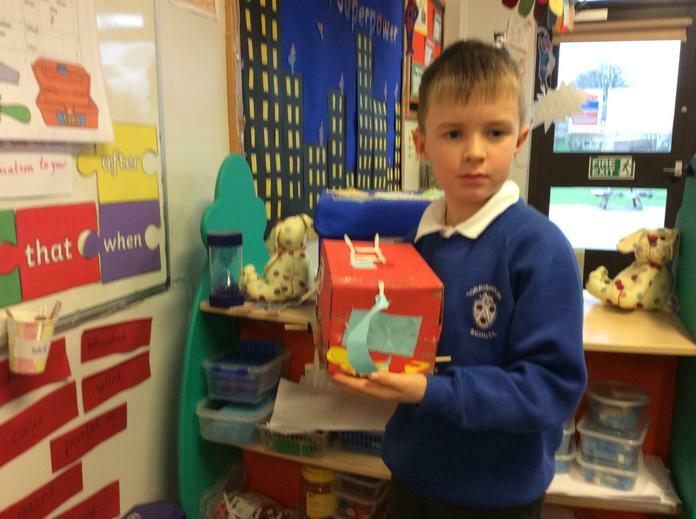 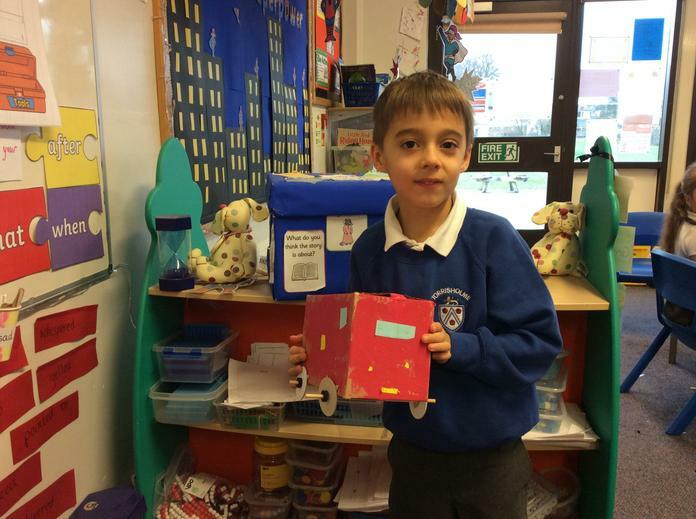 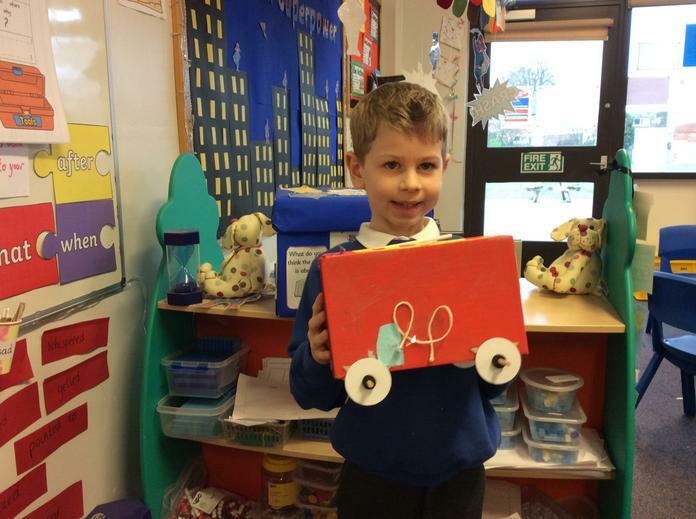 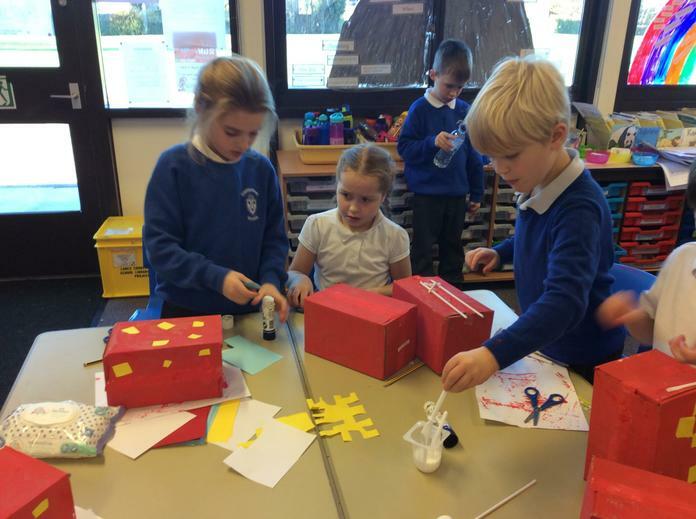 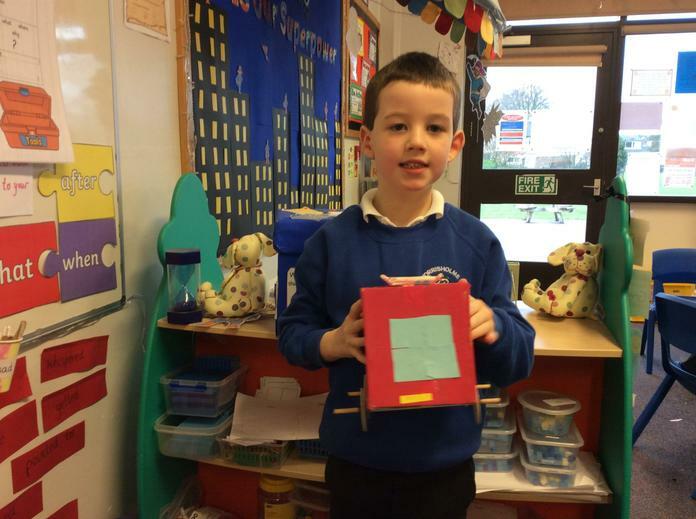 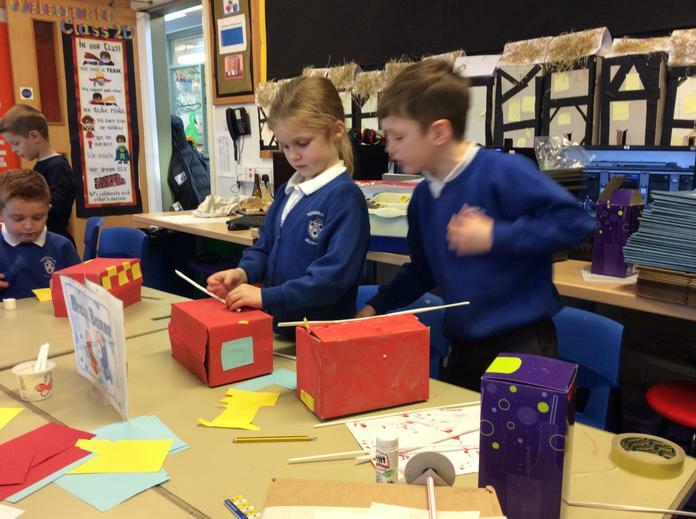 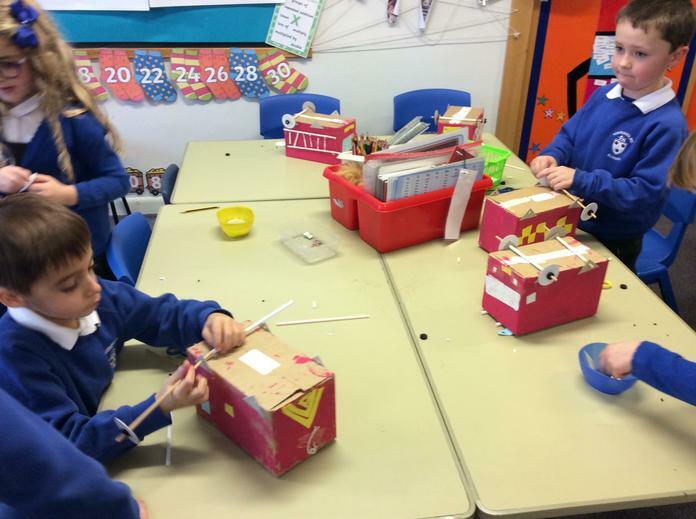 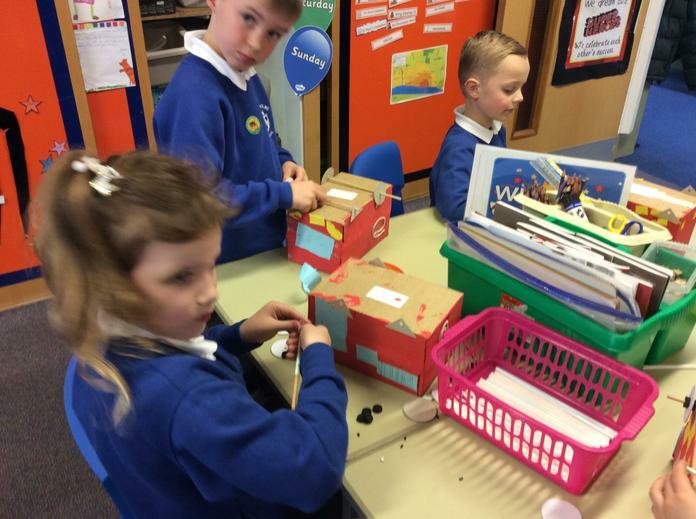 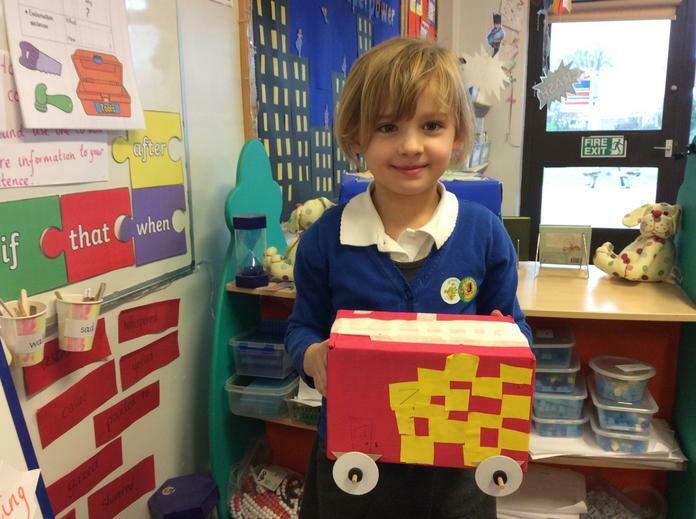 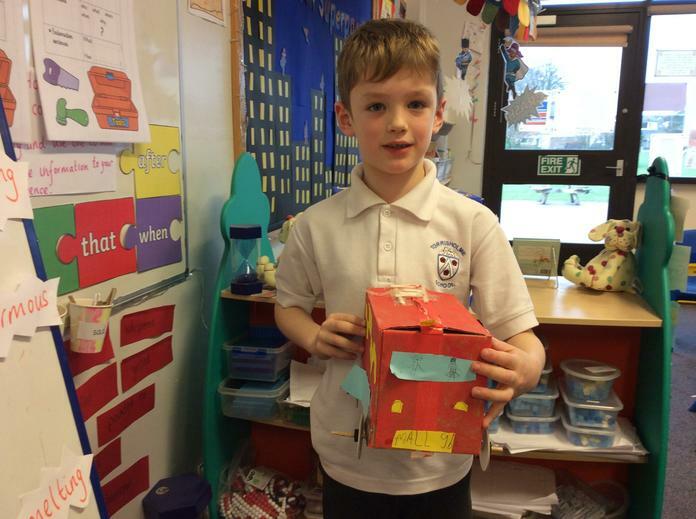 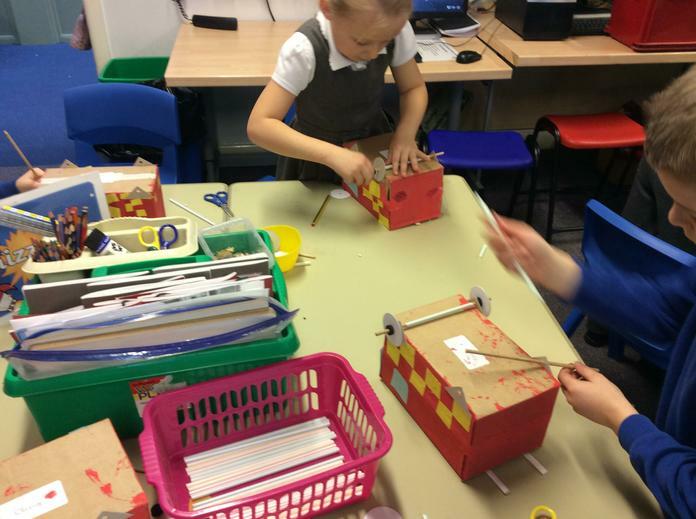 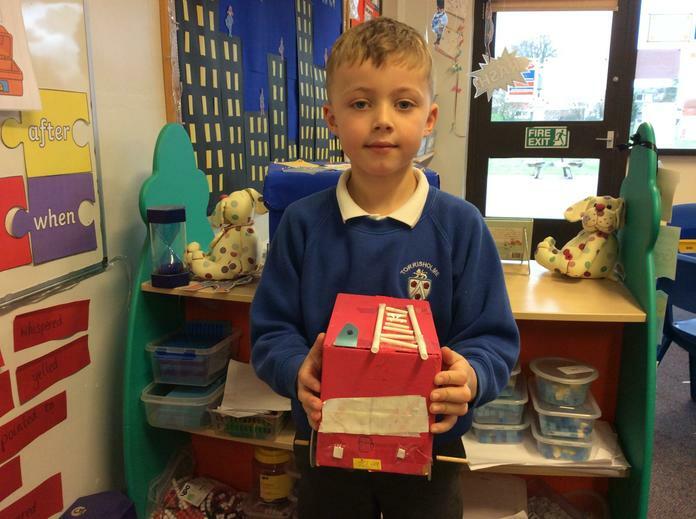 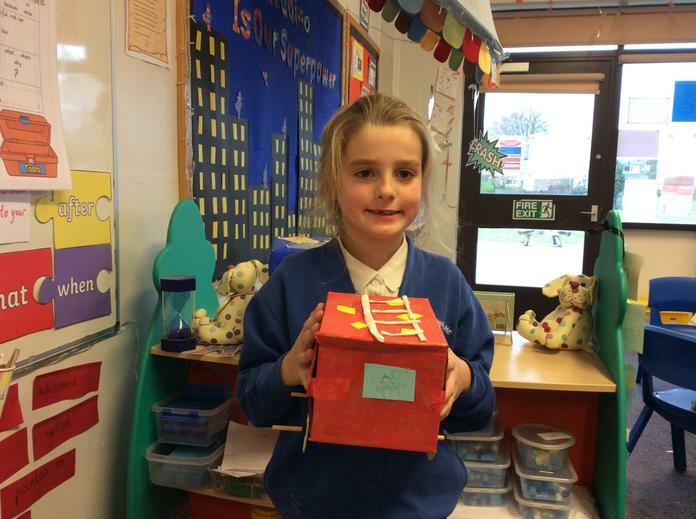 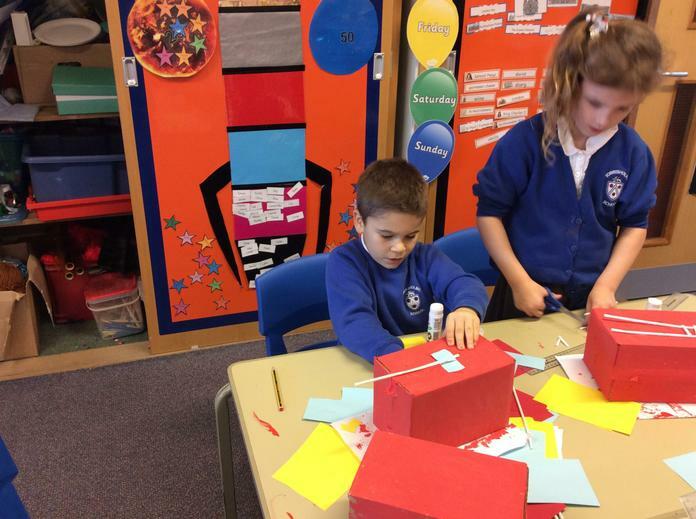 We have designed and made a fire engine to our own design criteria. 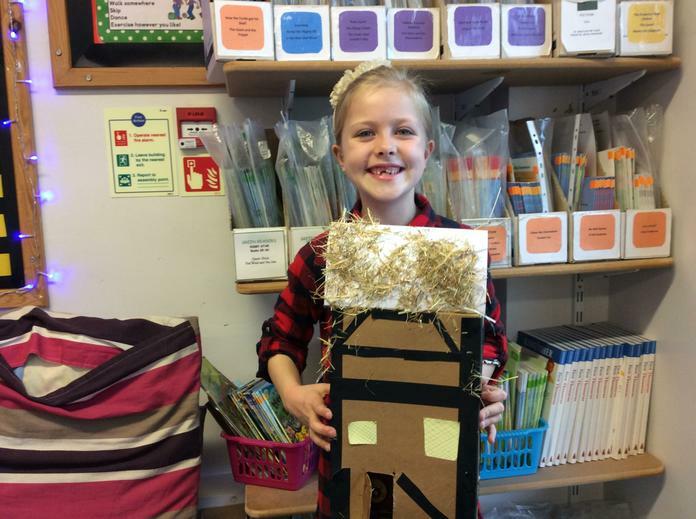 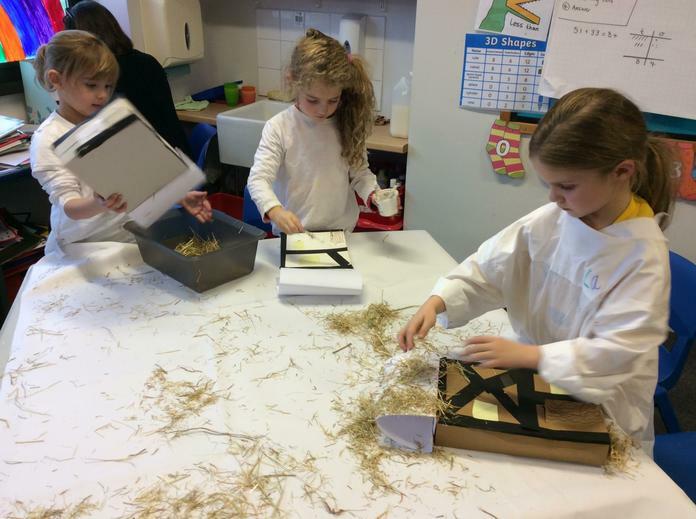 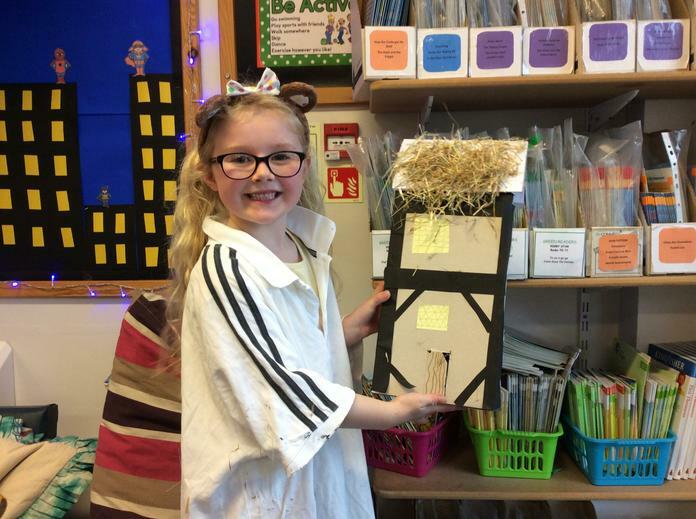 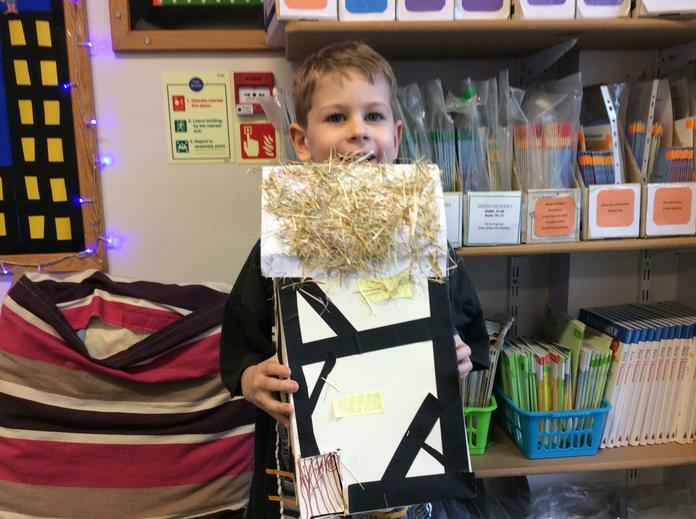 We have been learning about Tudor buildings and the use of wattle and daub. 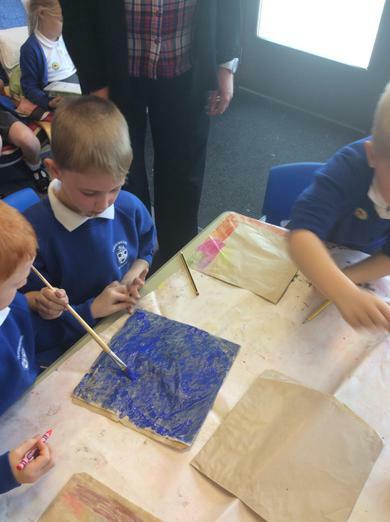 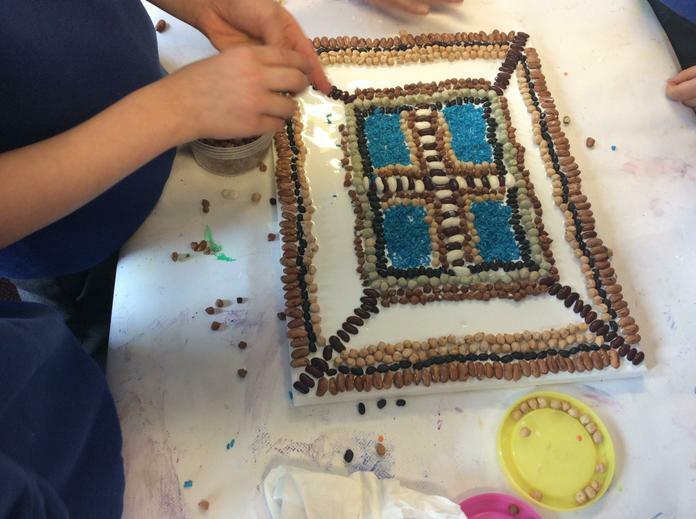 We worked with a partner to make our own wattle and daub square. 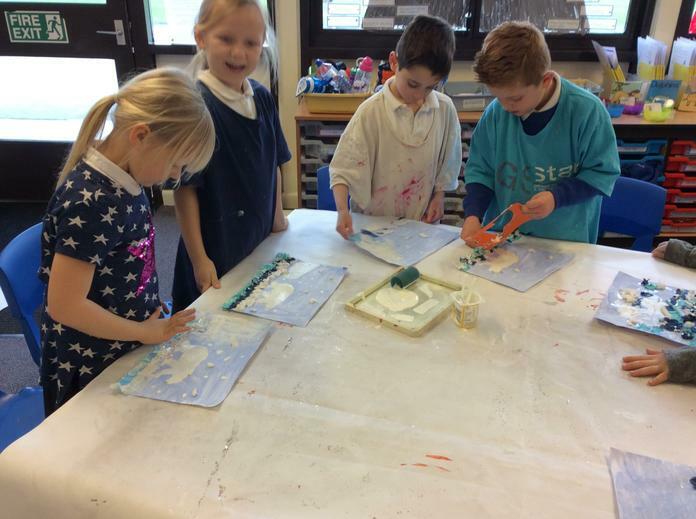 It was lots of funny and very messy! 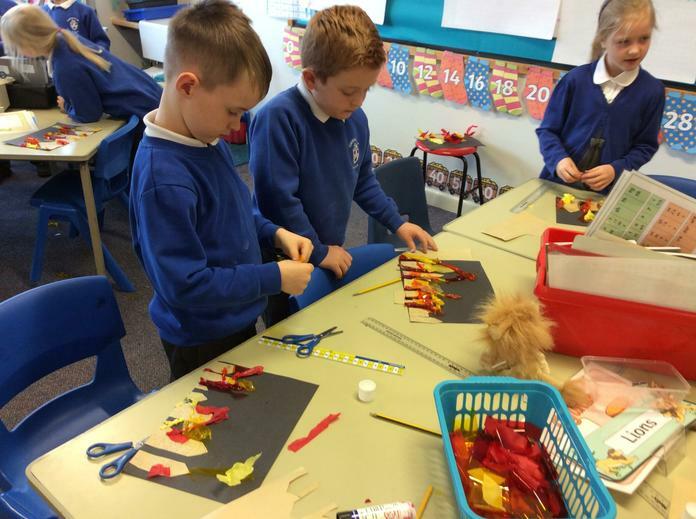 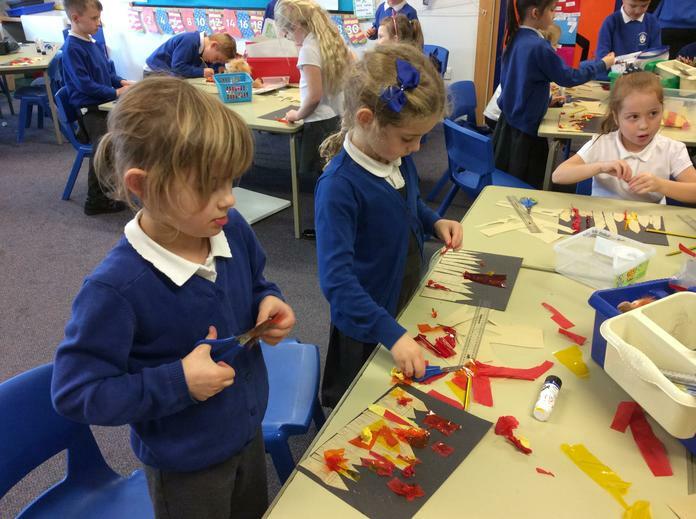 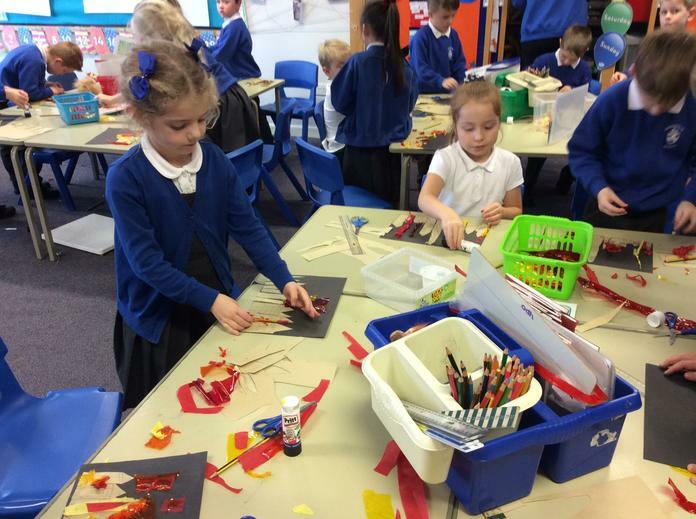 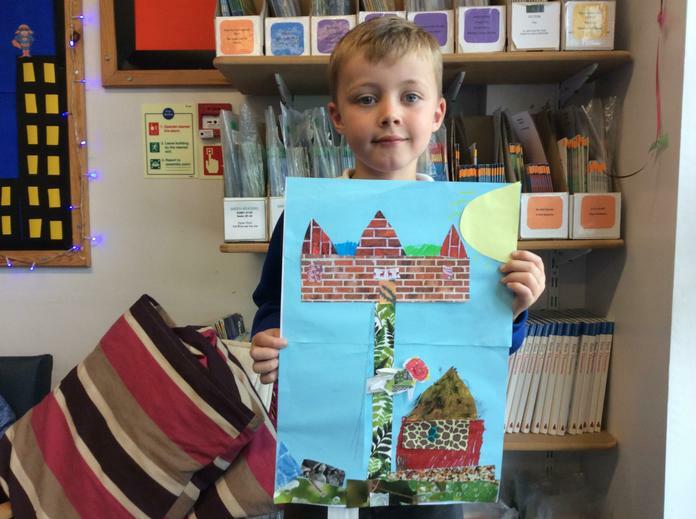 We have used different types of paper and collage techniques to make a Great Fire of London scene. 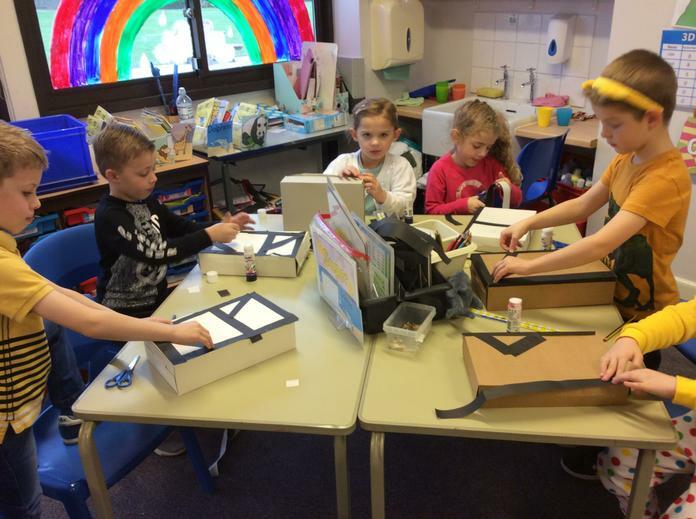 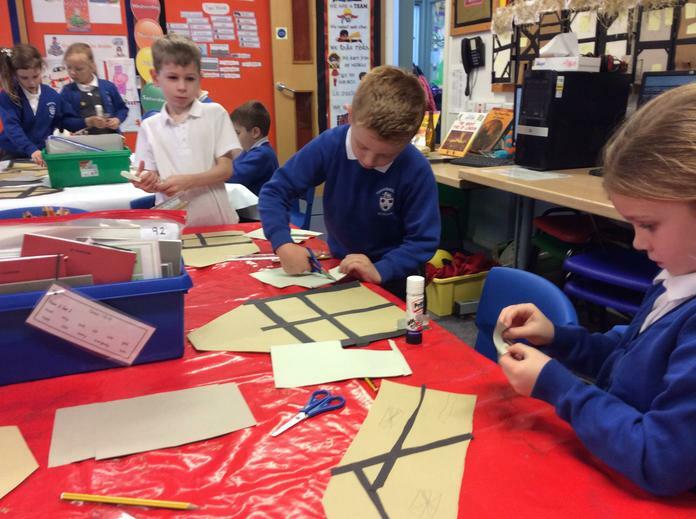 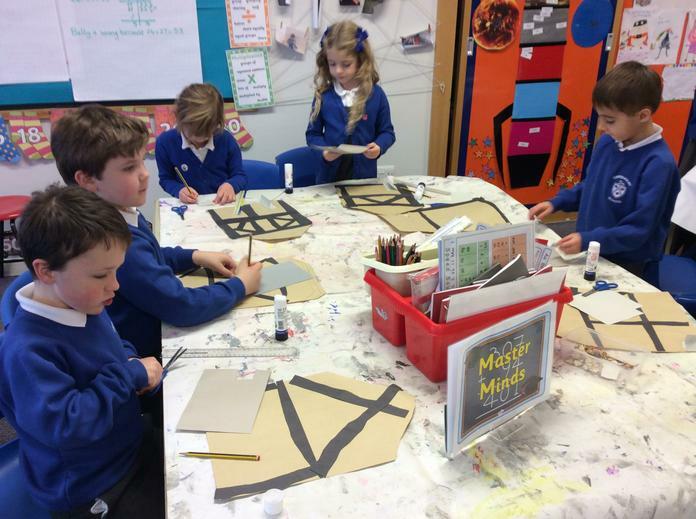 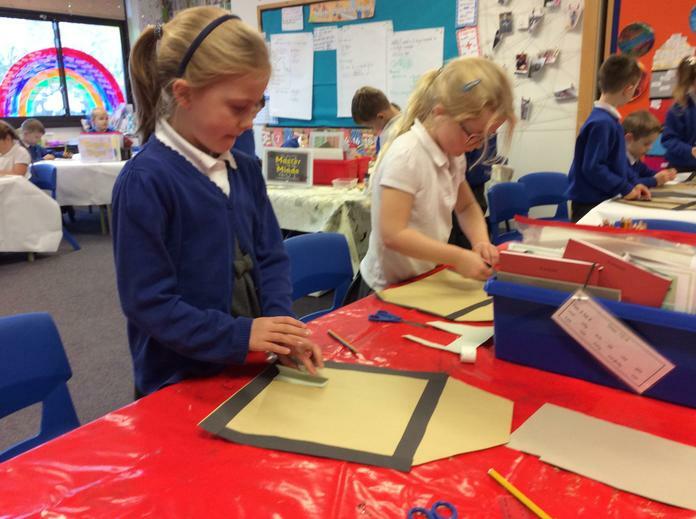 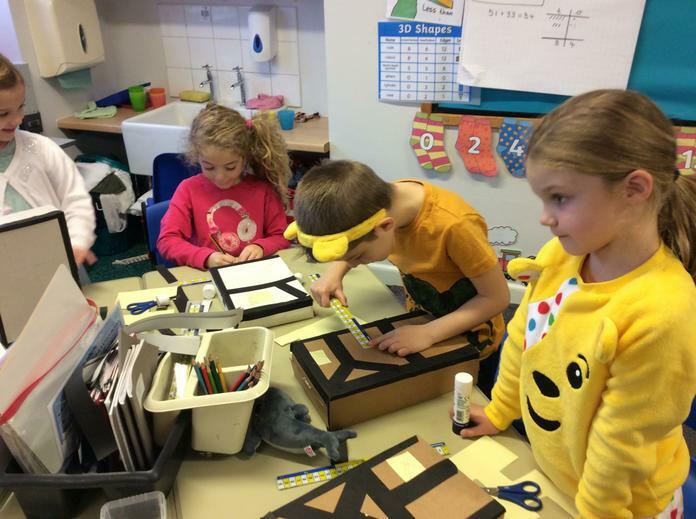 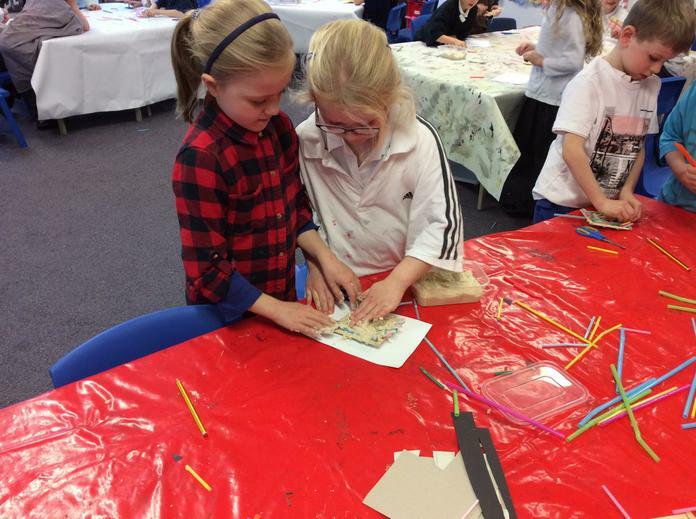 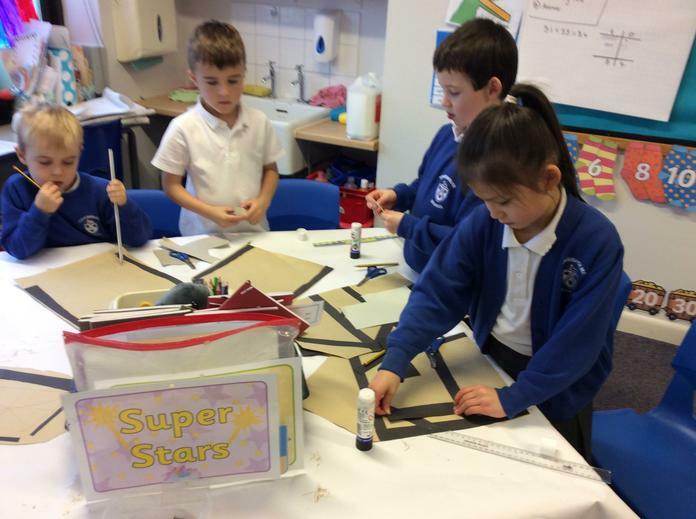 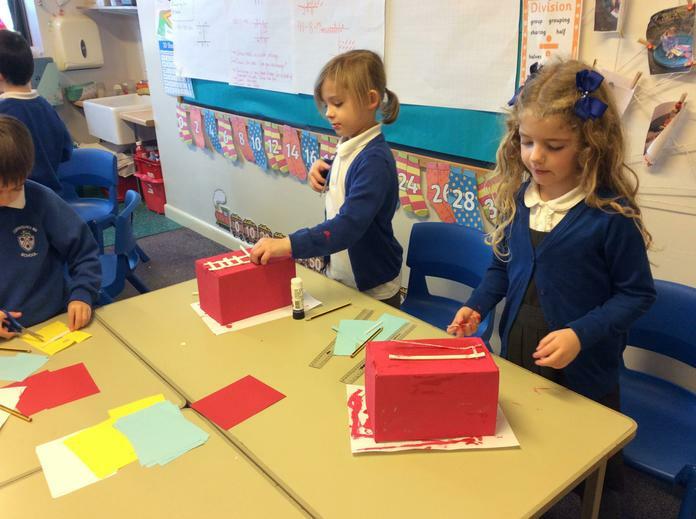 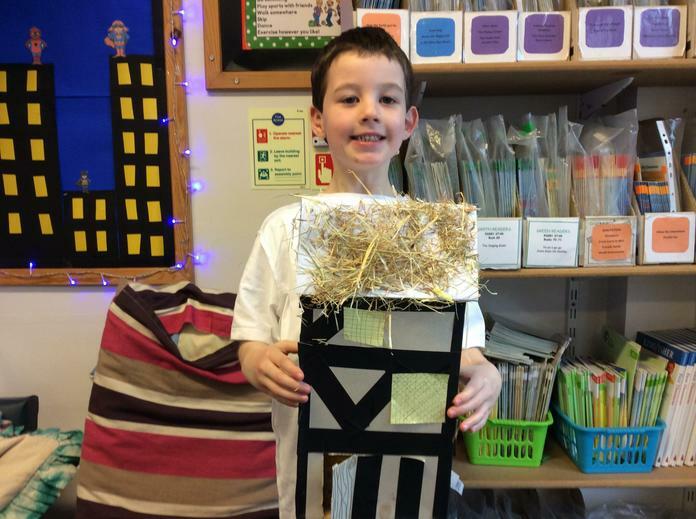 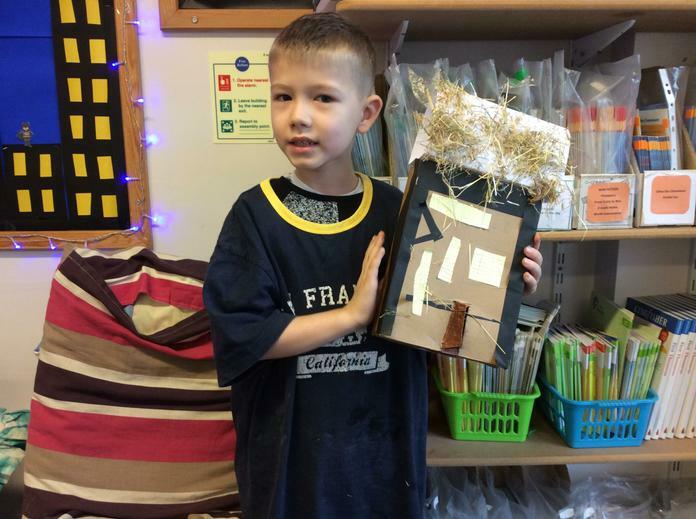 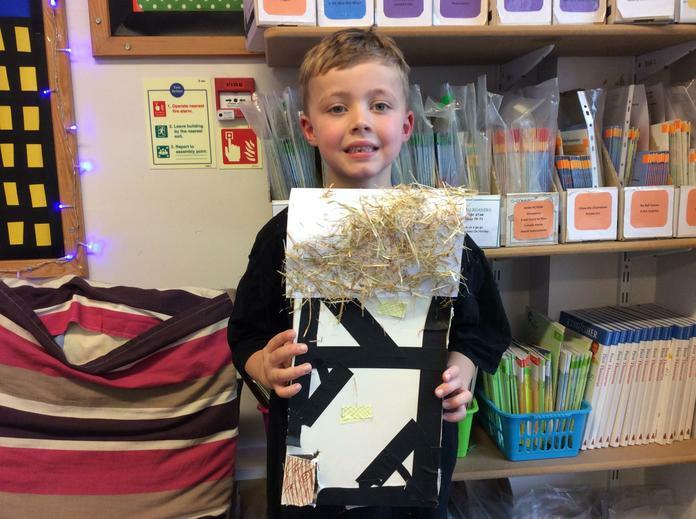 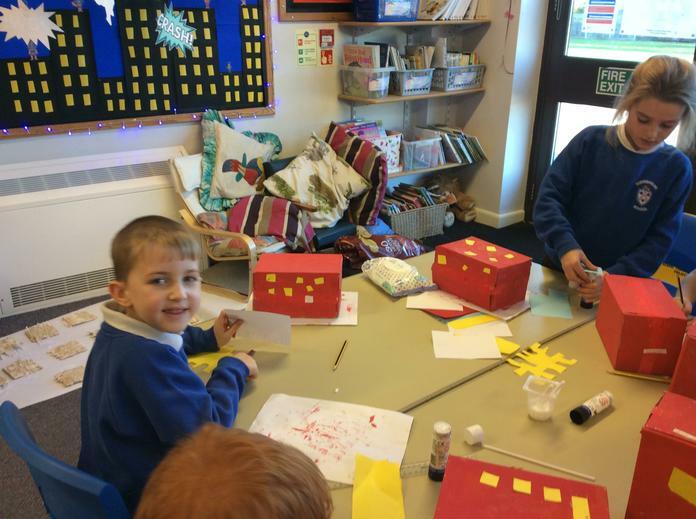 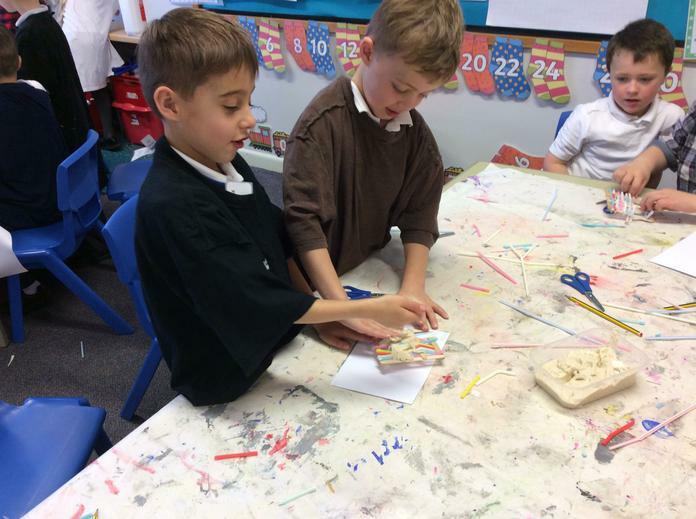 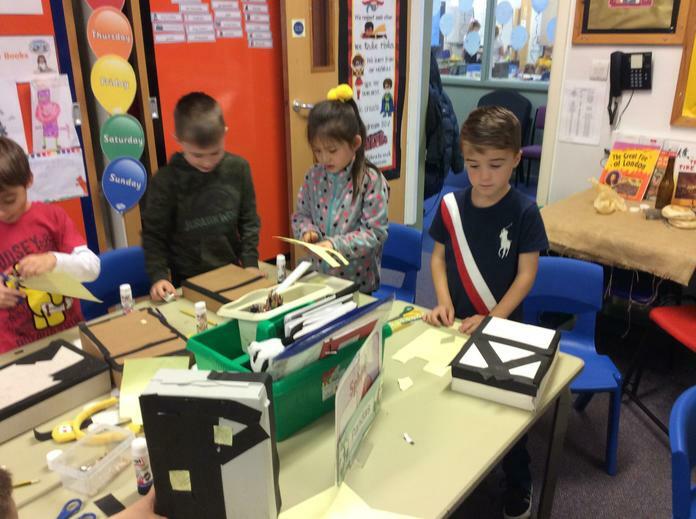 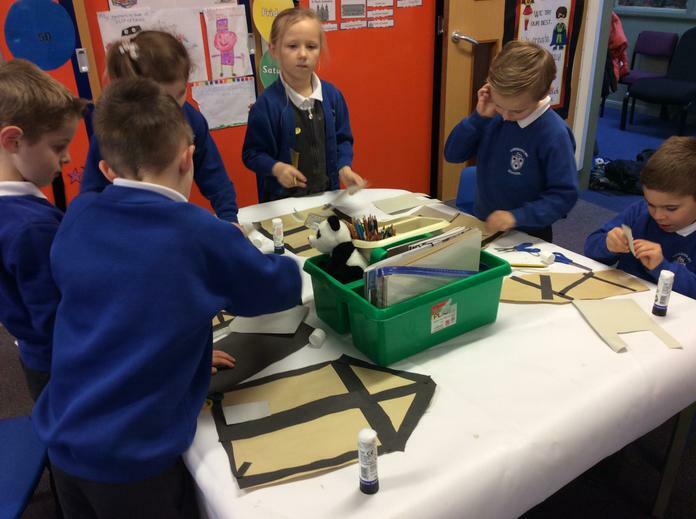 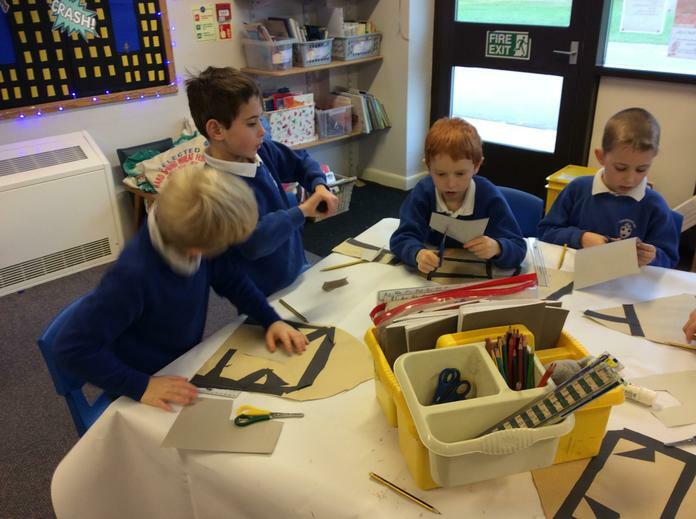 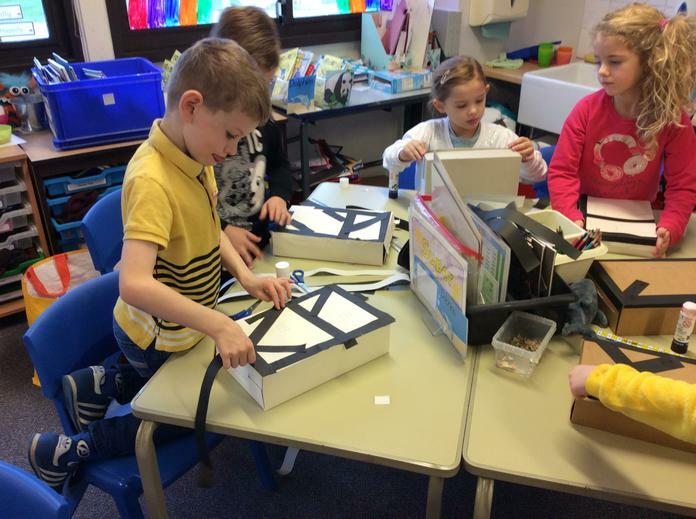 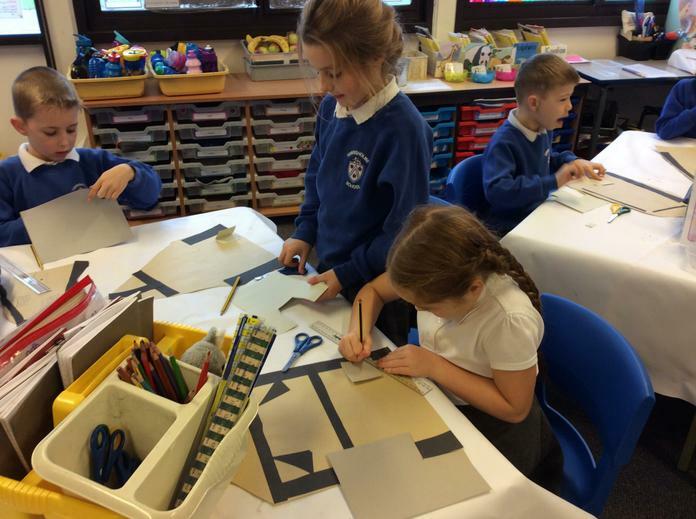 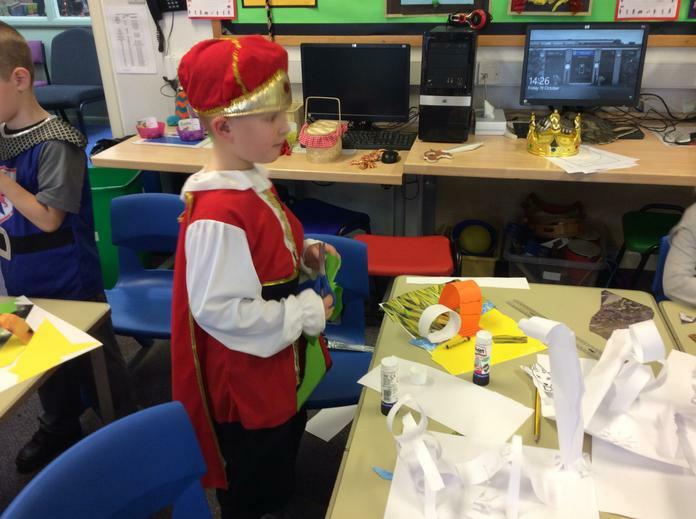 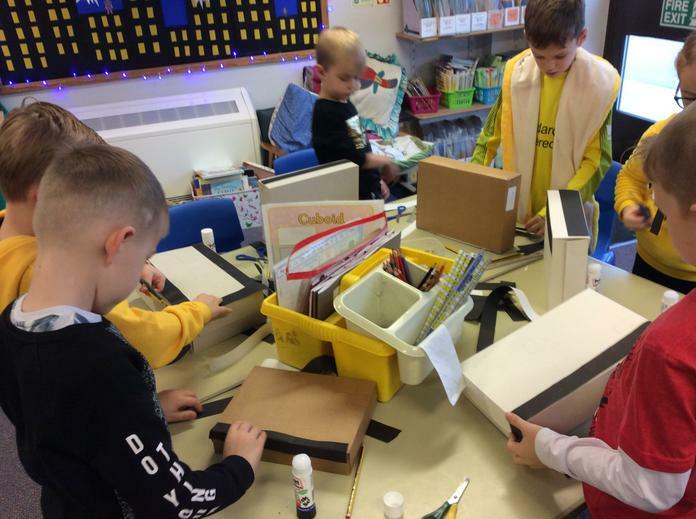 We made Tudor houses using different types of paper and techniques. 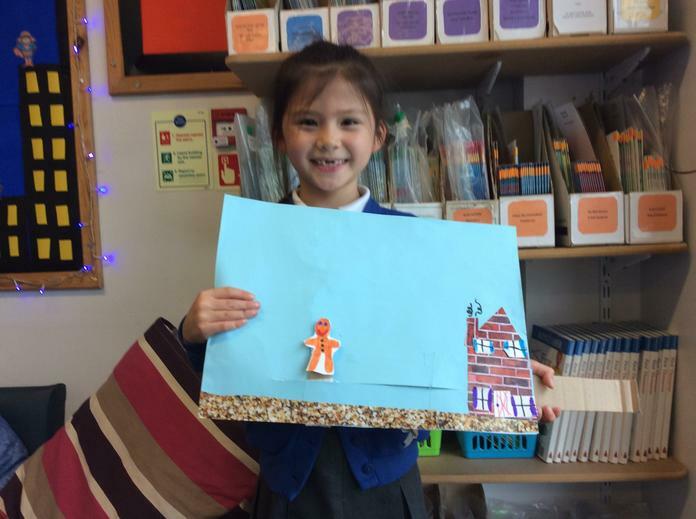 We are learning about the Great Fire of London. 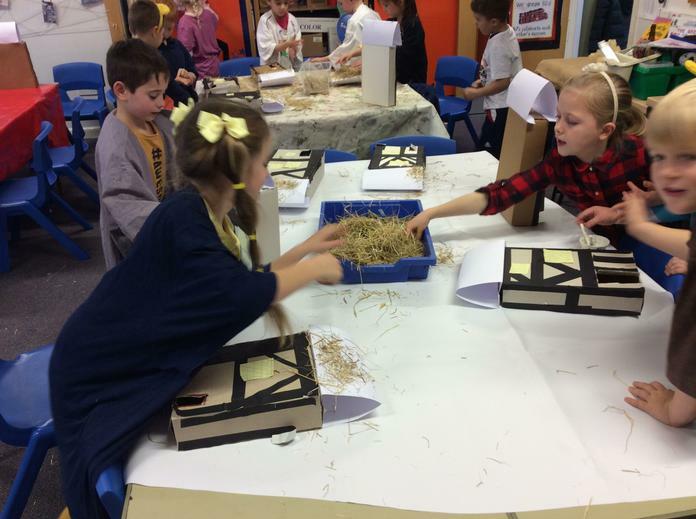 We found out that the buildings were made from wood and were built very close together. 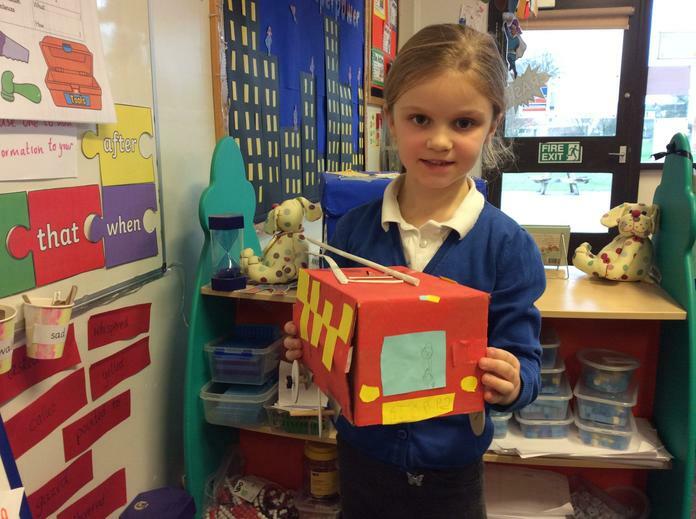 This is why the fire spread so quickly. 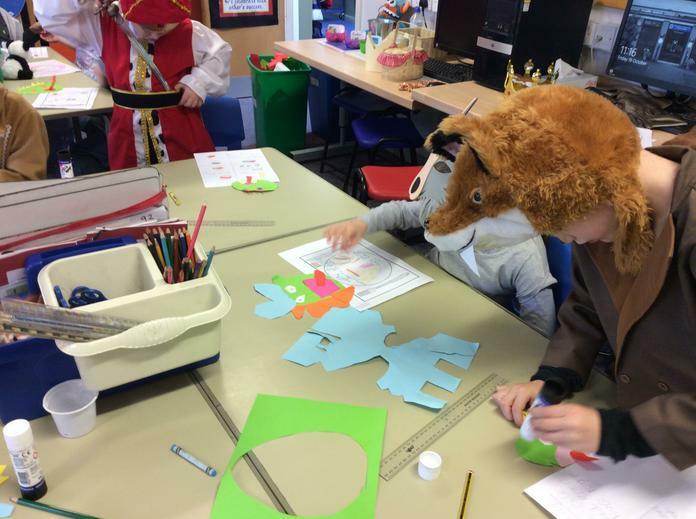 We learned about the gunpowder plot and how this is remembered today. 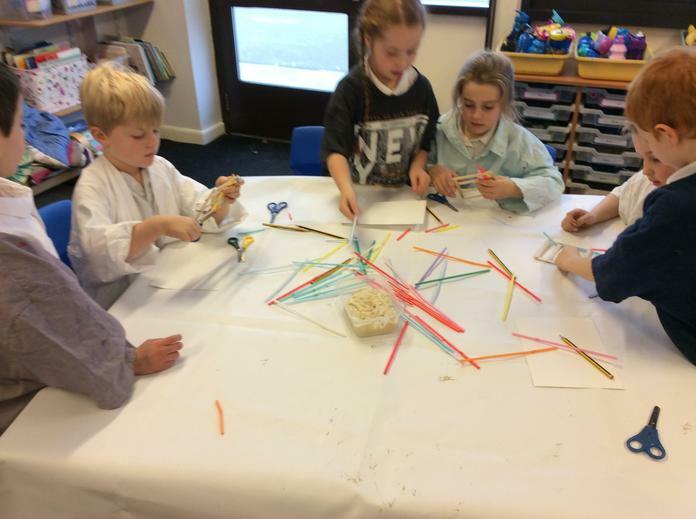 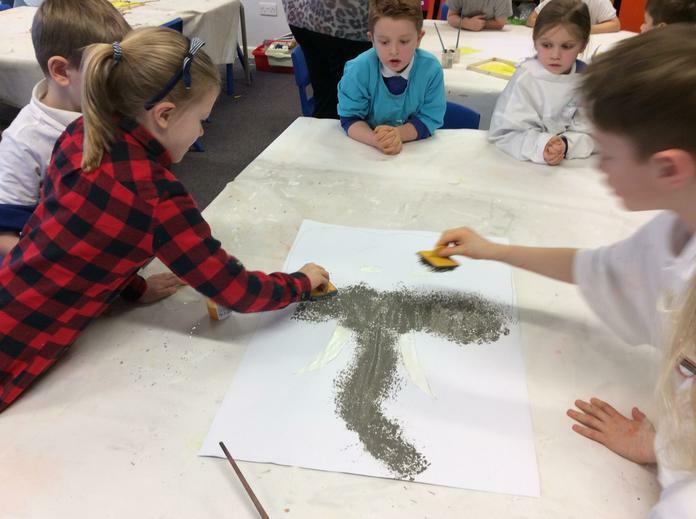 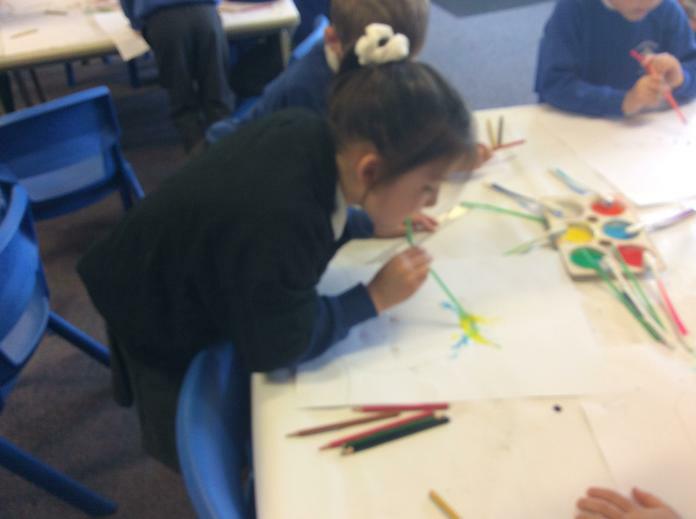 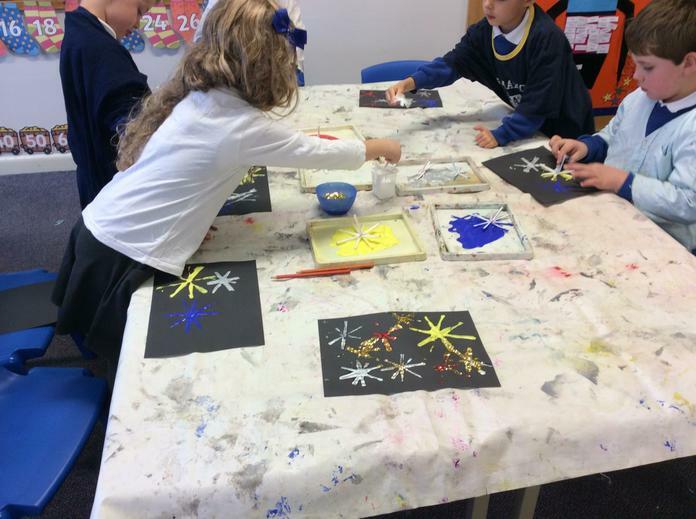 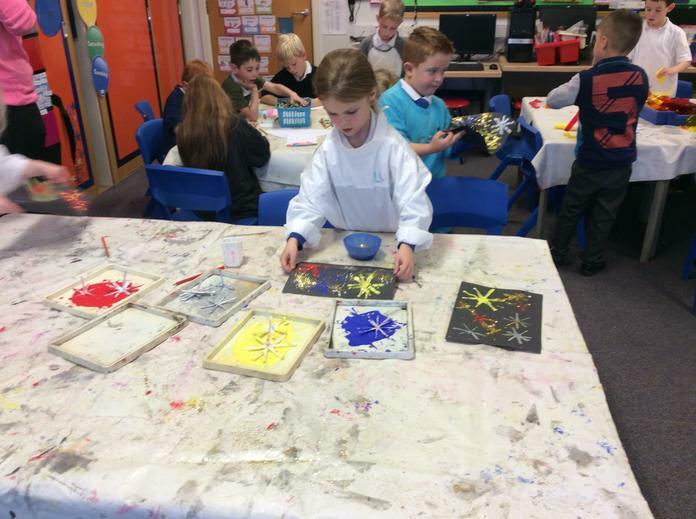 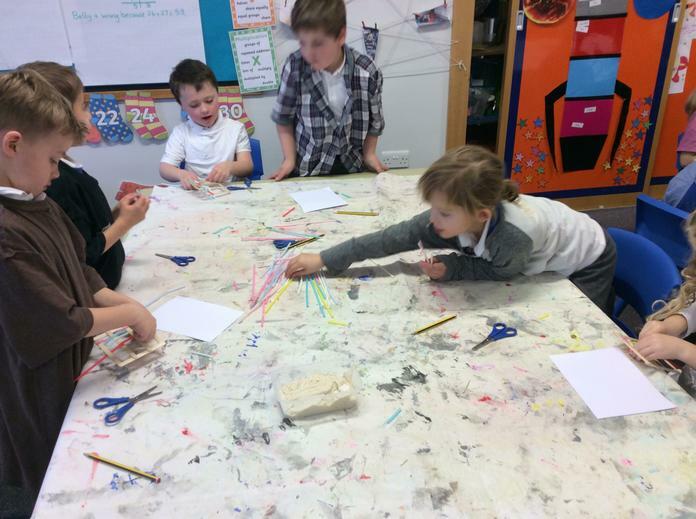 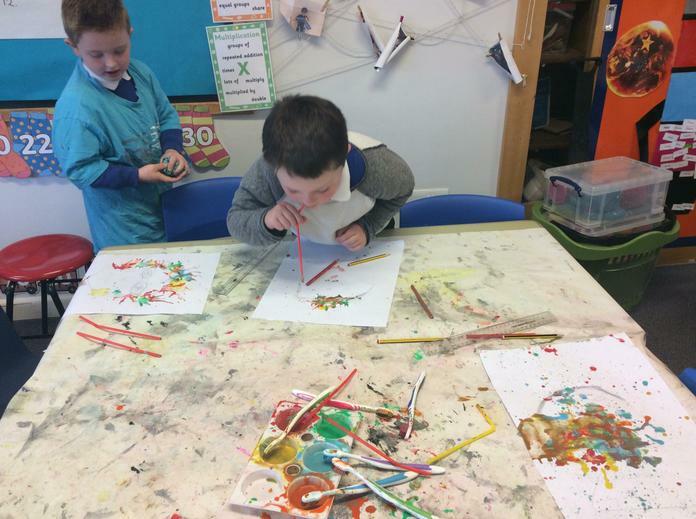 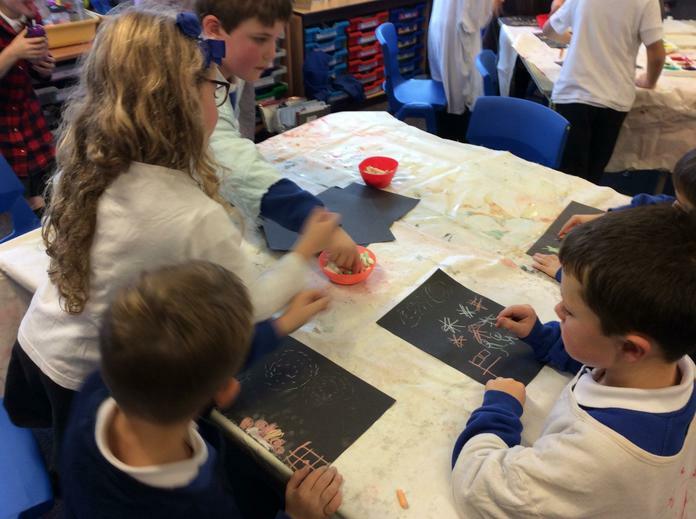 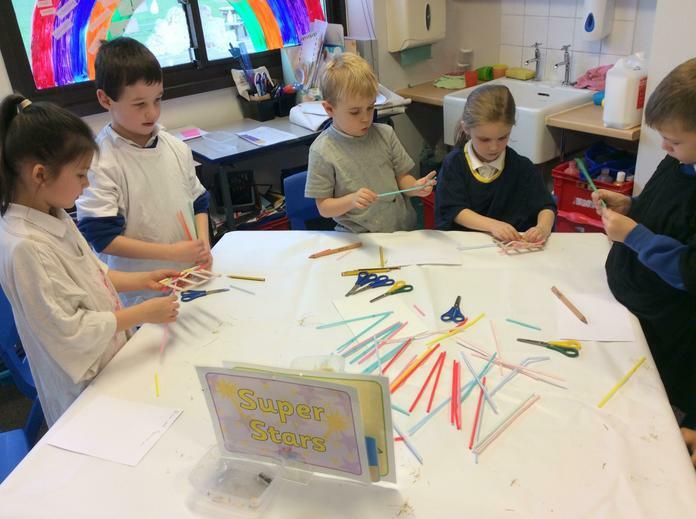 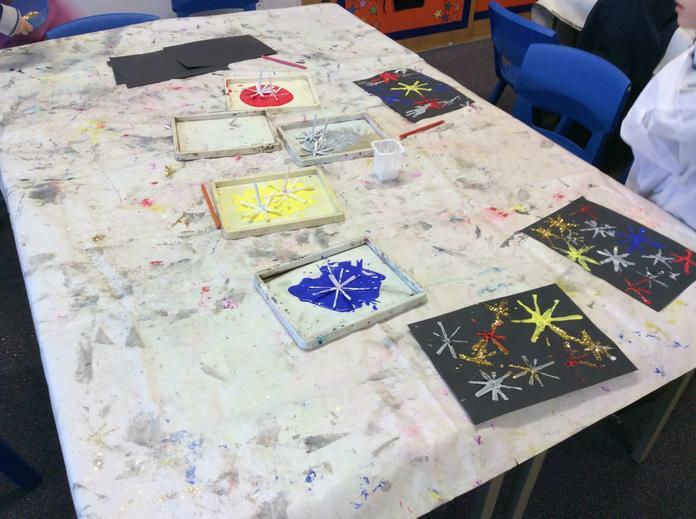 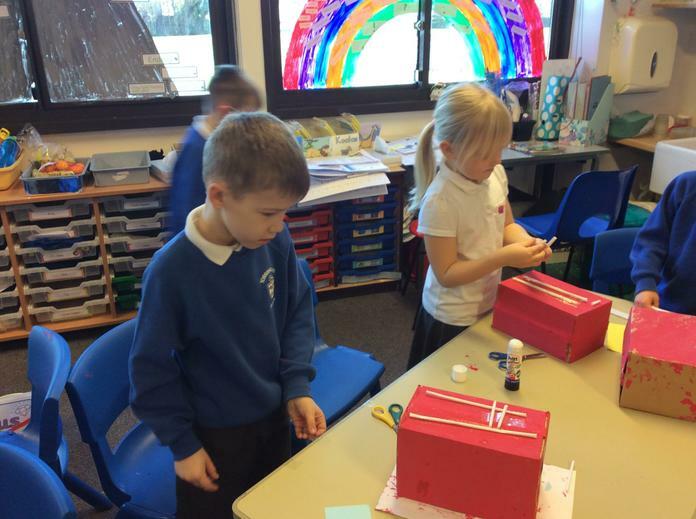 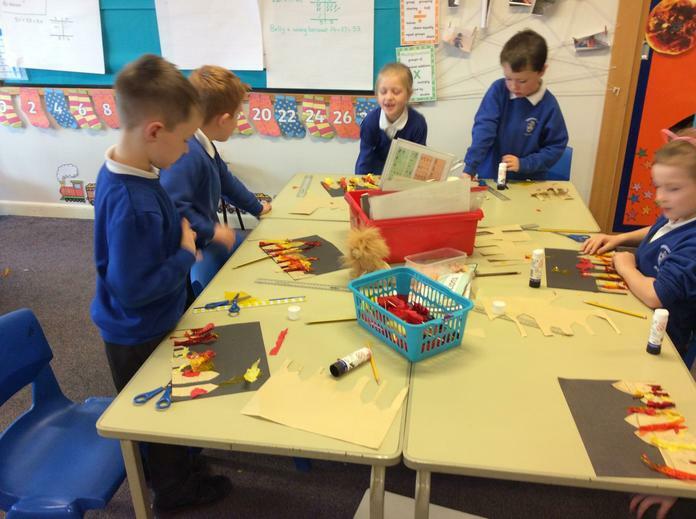 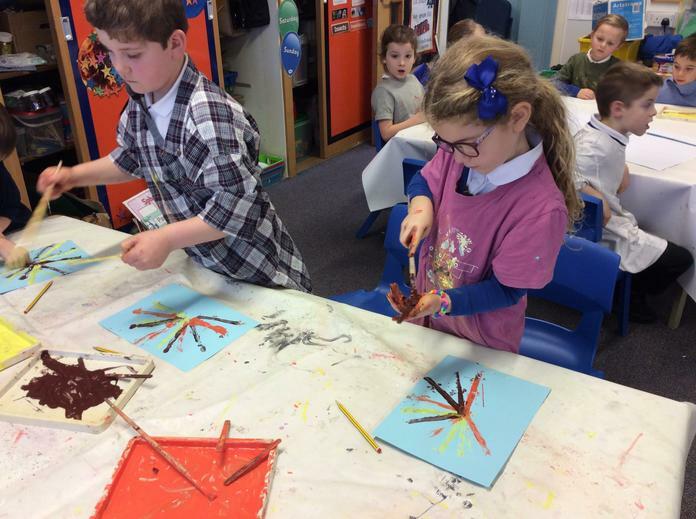 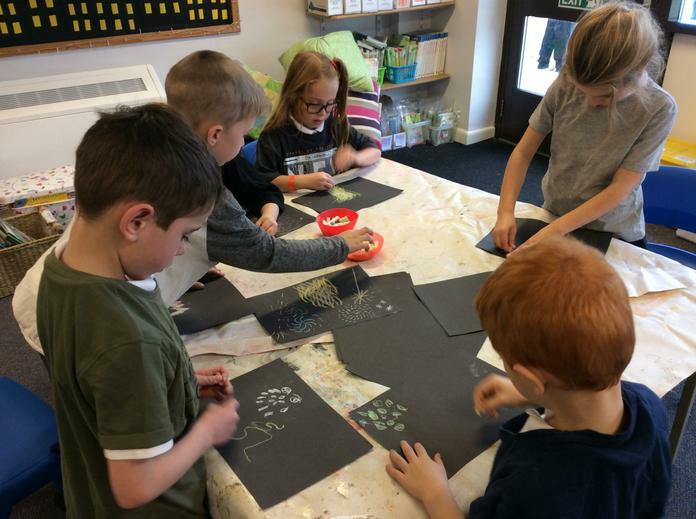 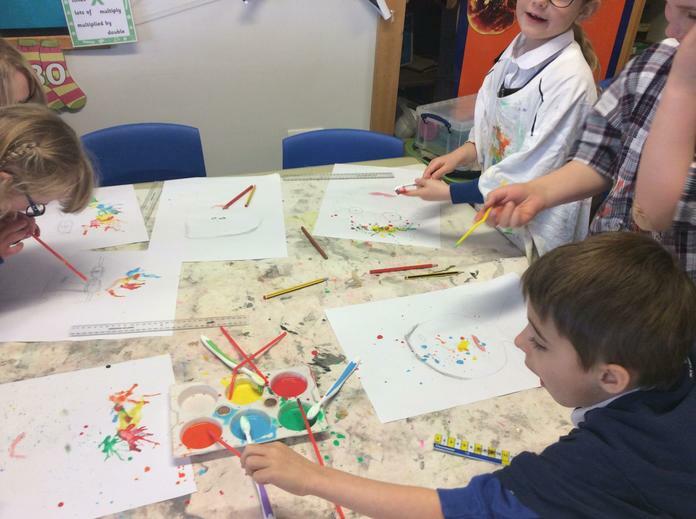 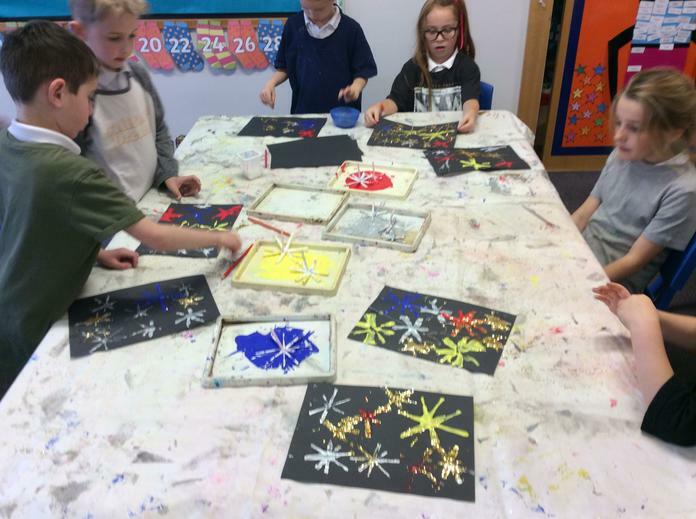 We had lots of fun creating fireworks using different techniques. 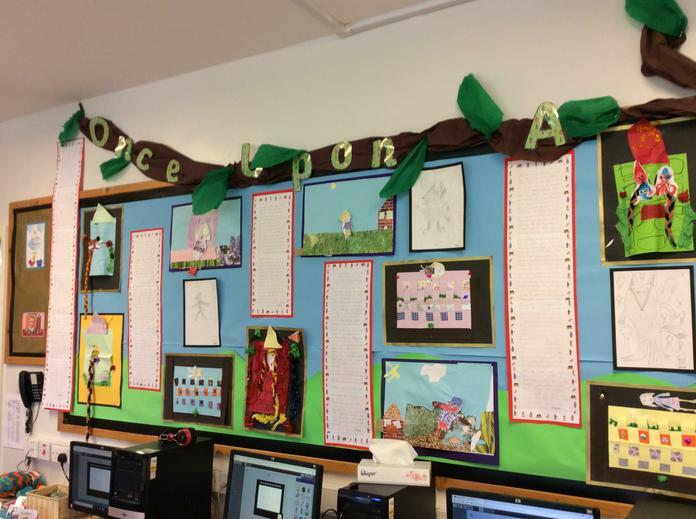 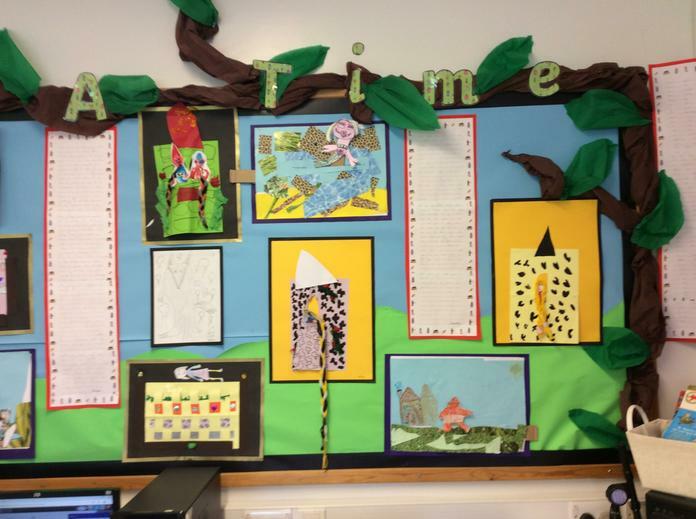 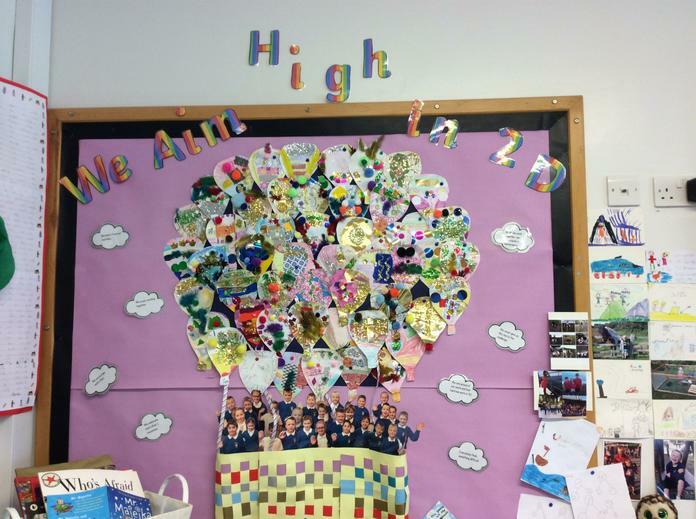 These are some of our class displays for you to enjoy. 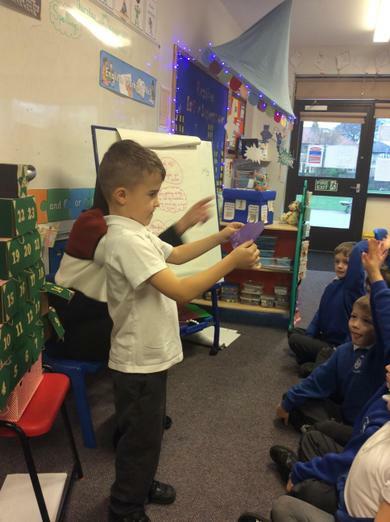 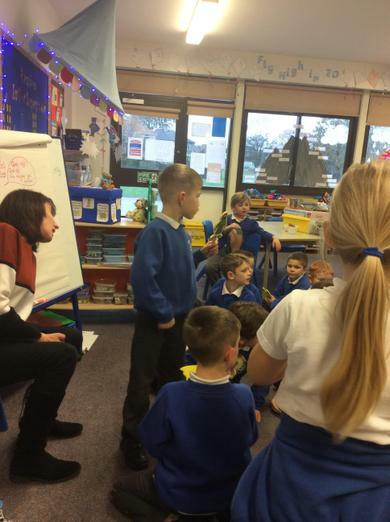 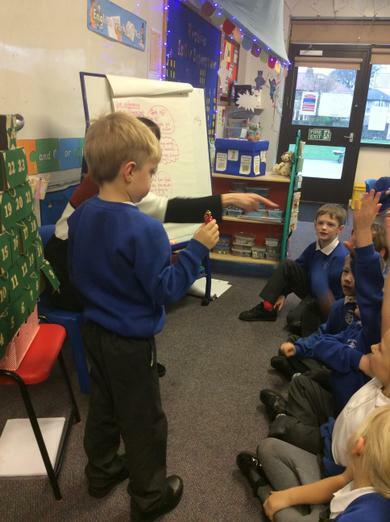 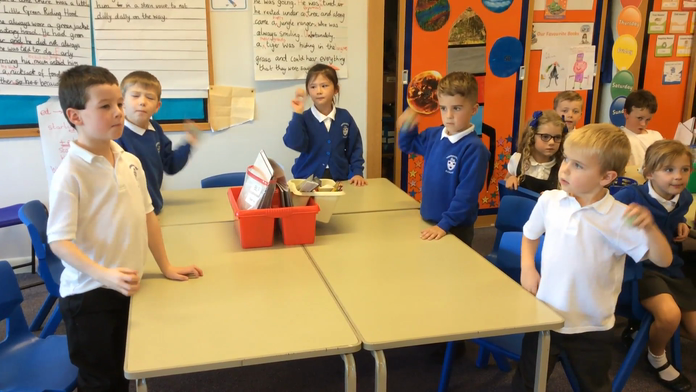 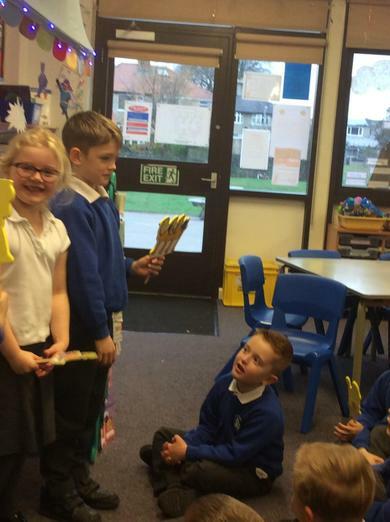 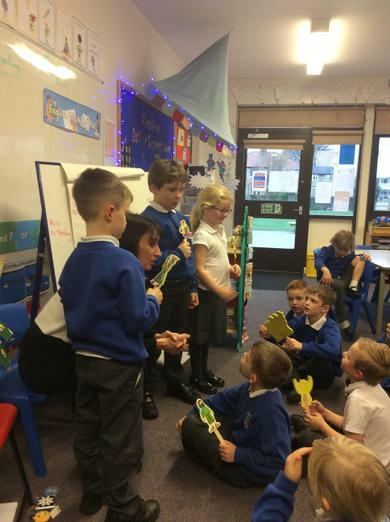 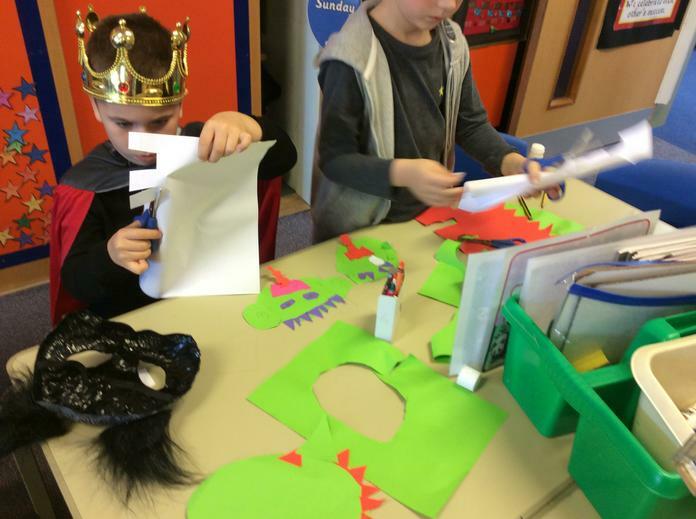 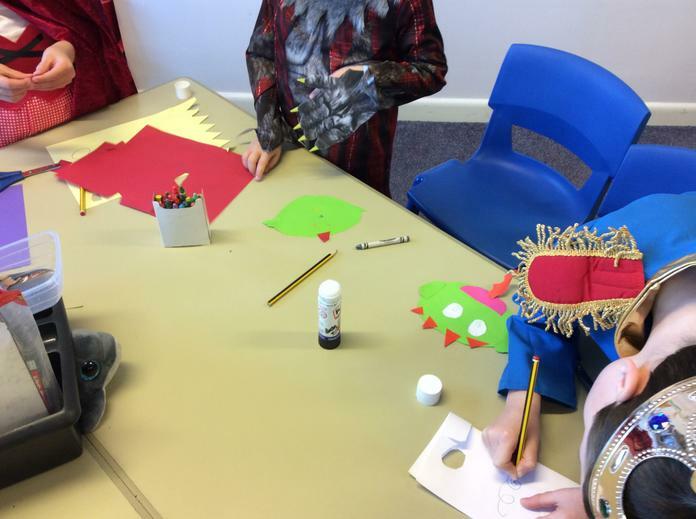 We have learned to tell the story of The Three Billy Goats Gruff using actions. 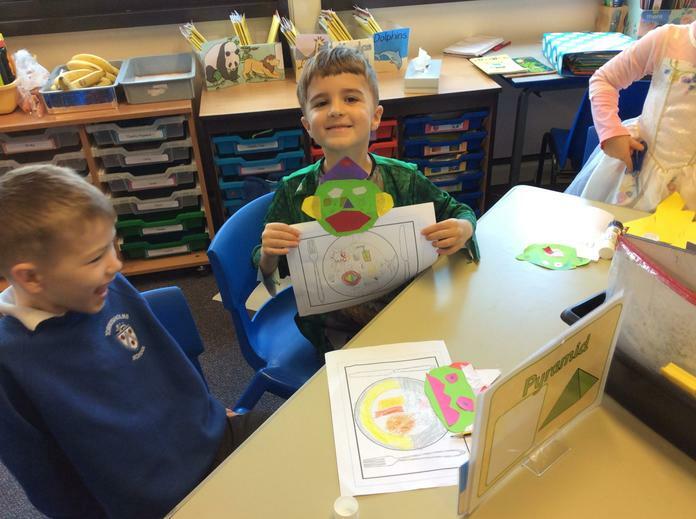 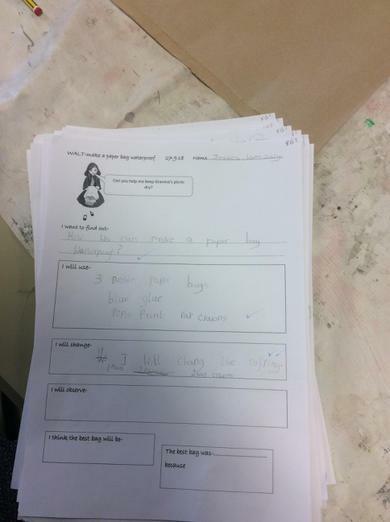 We made a troll and created a cafe menu for a troll to stop him eating Billy Goats Gruff. 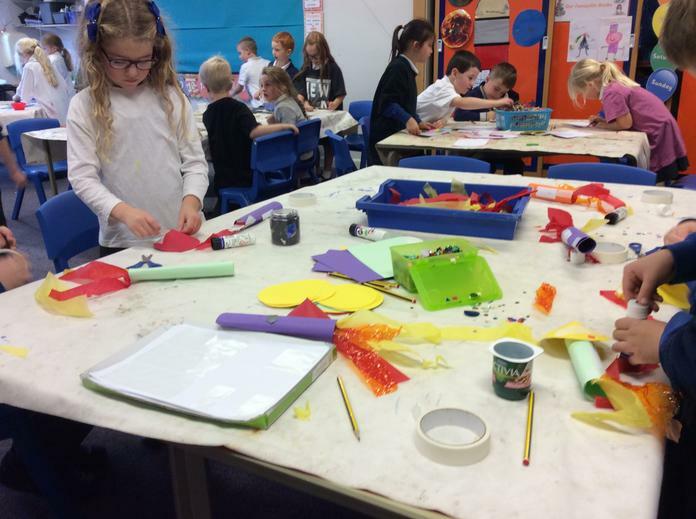 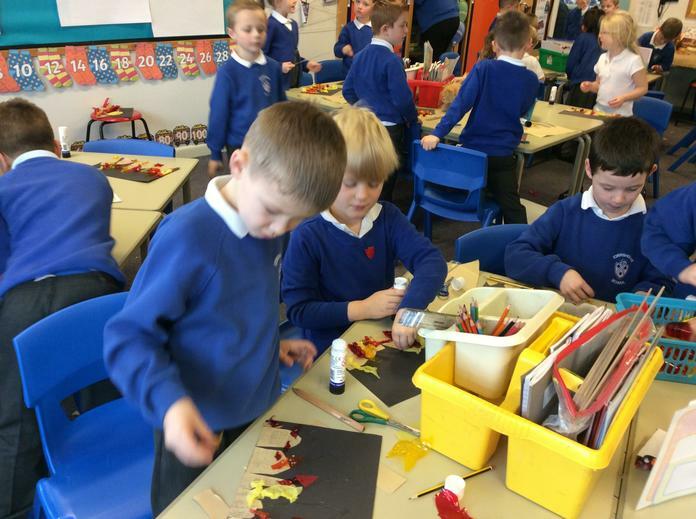 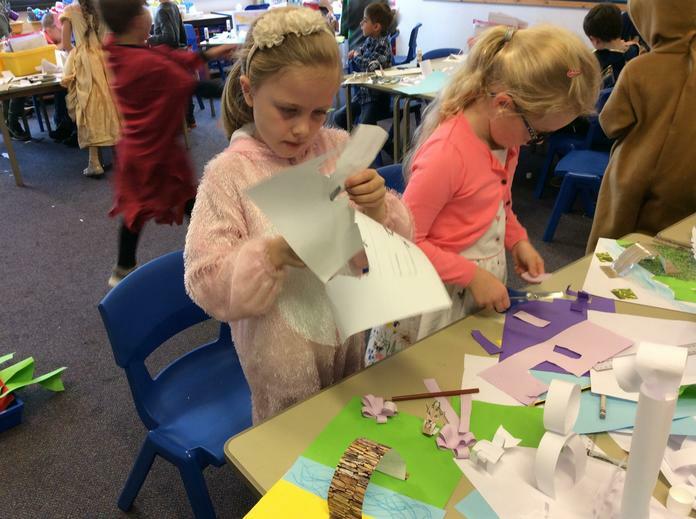 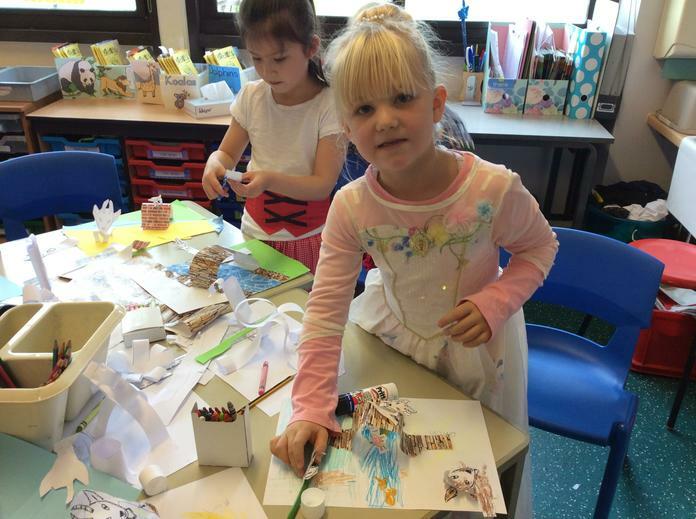 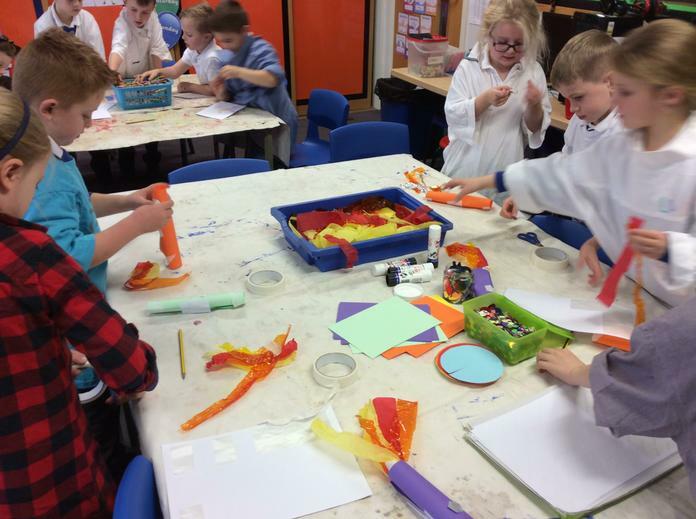 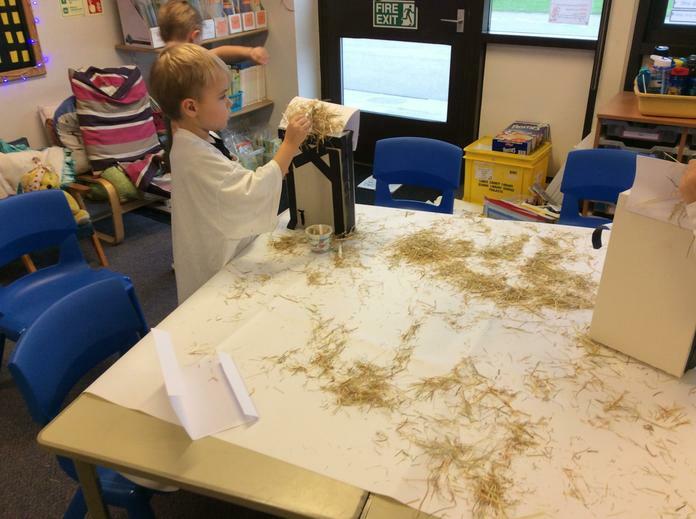 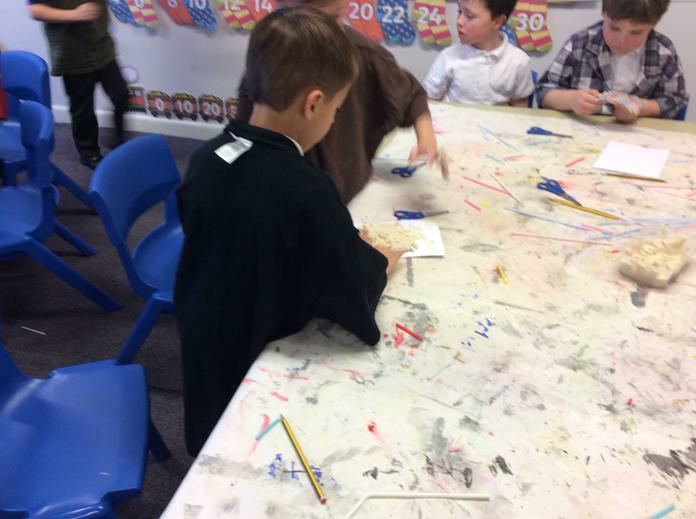 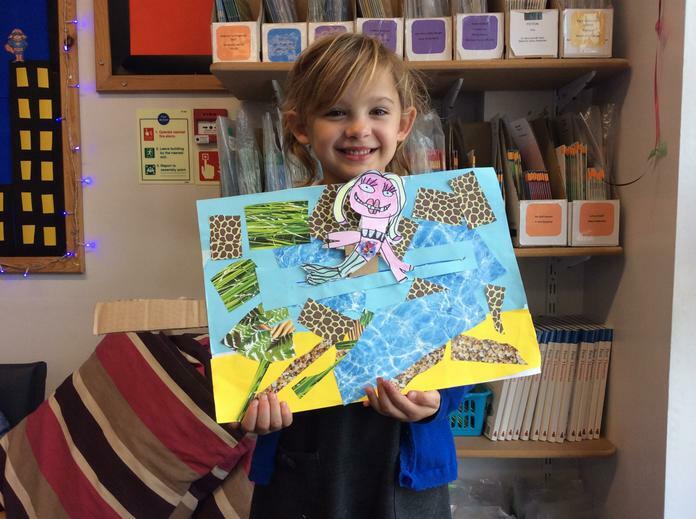 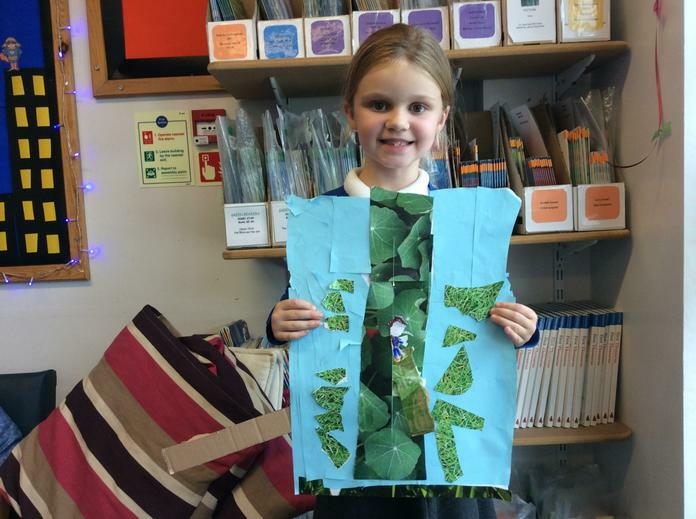 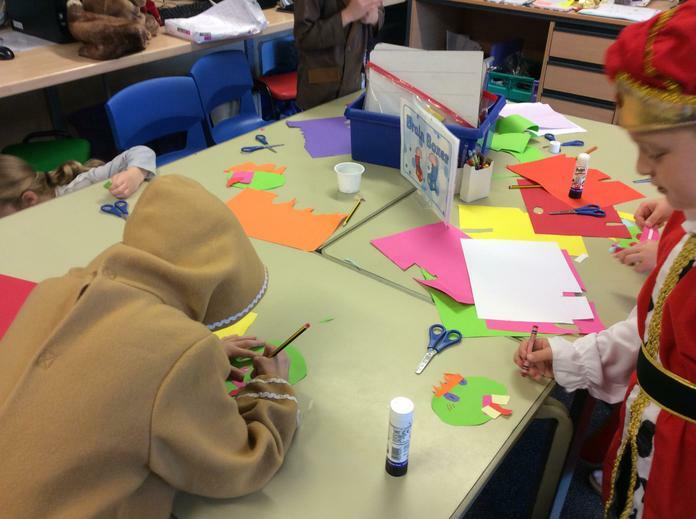 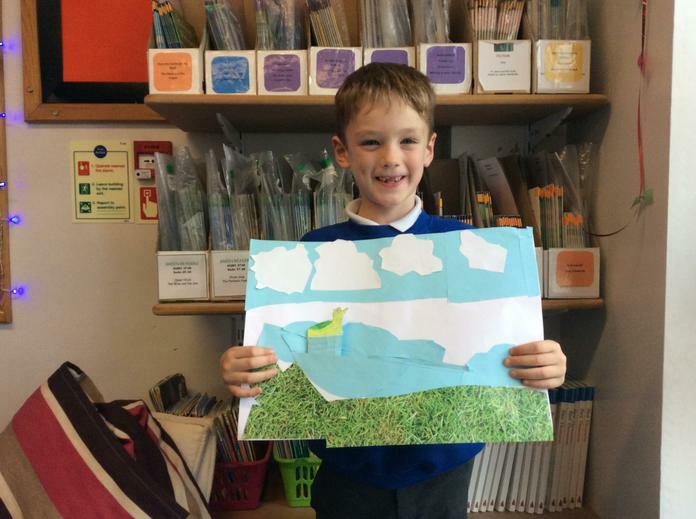 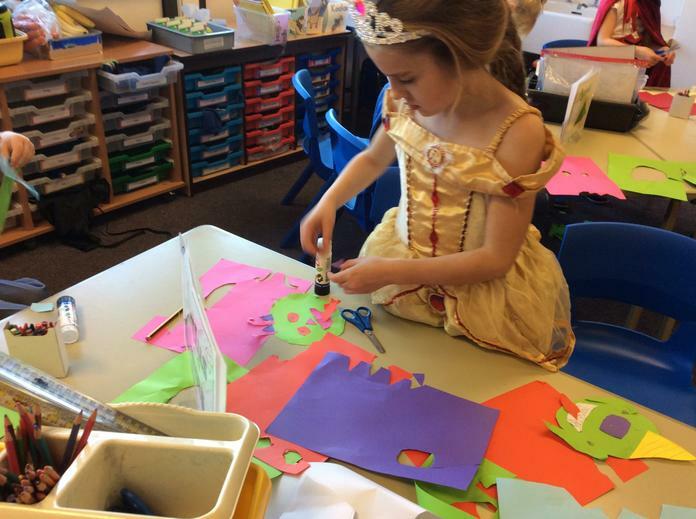 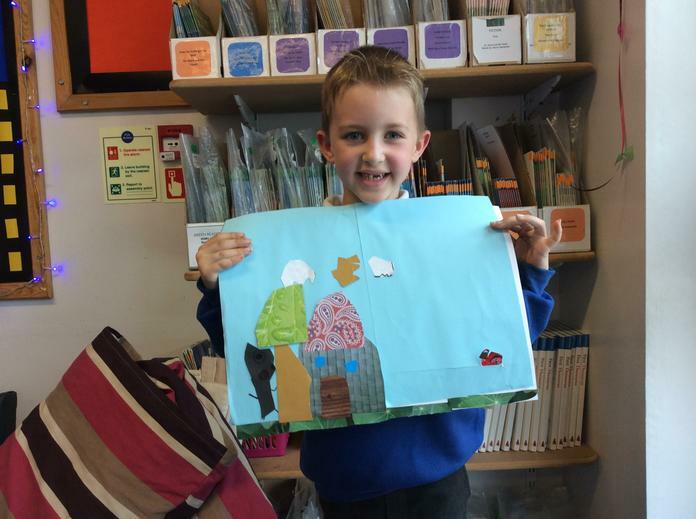 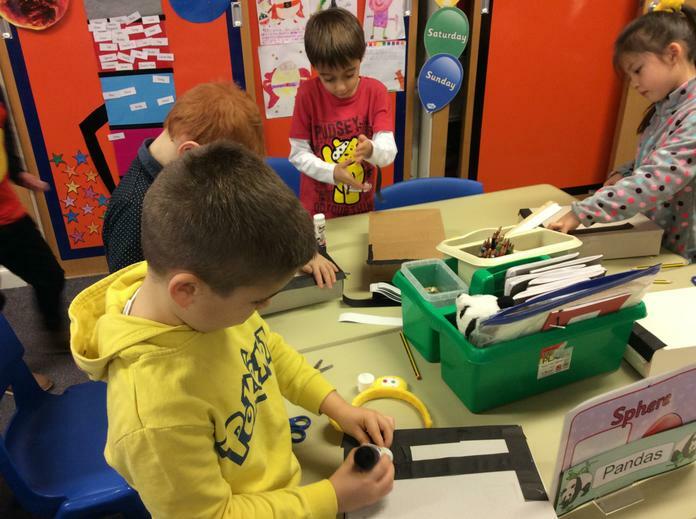 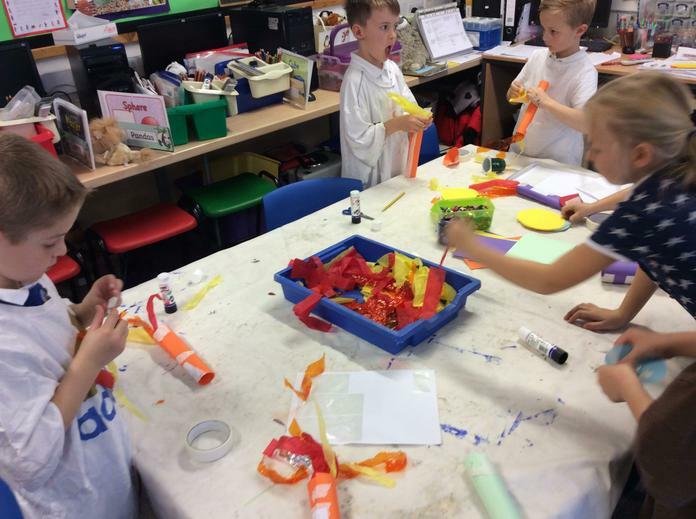 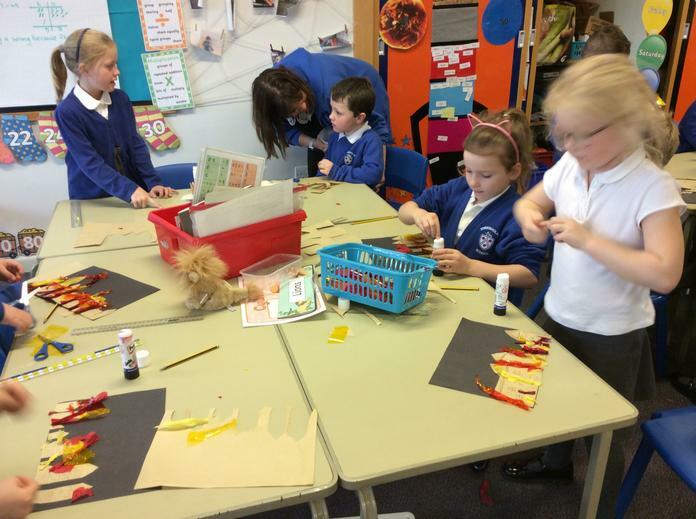 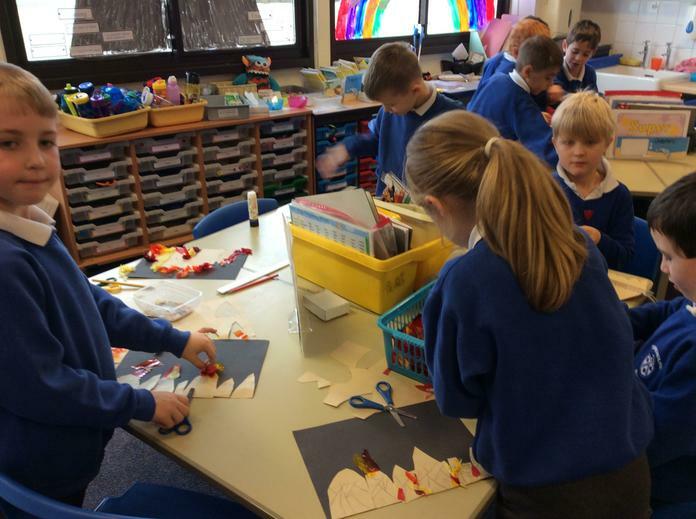 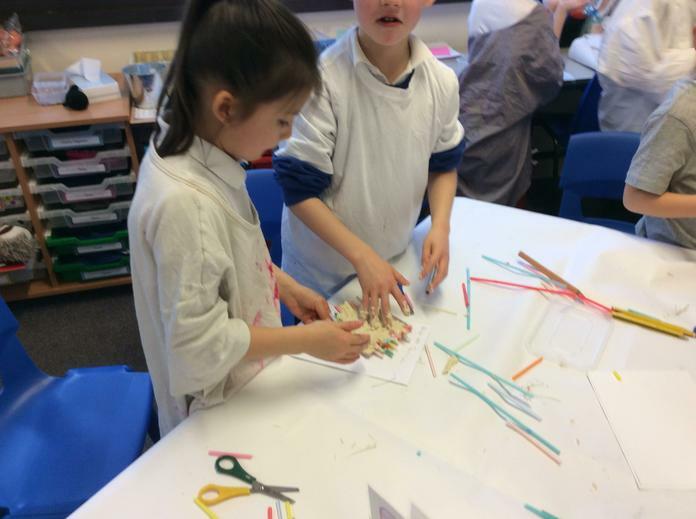 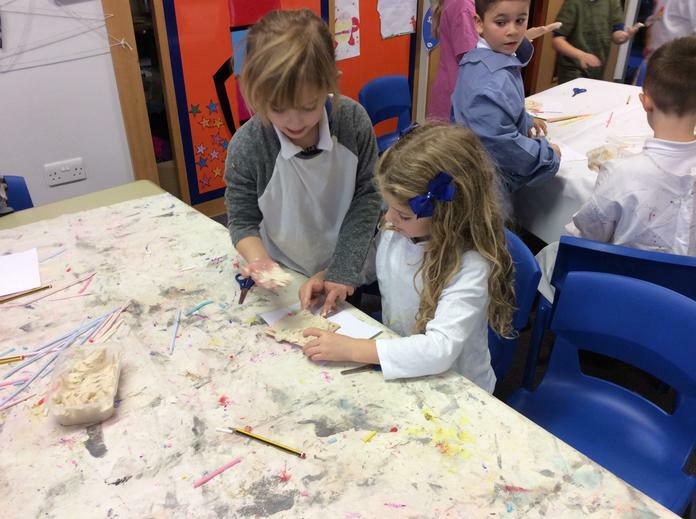 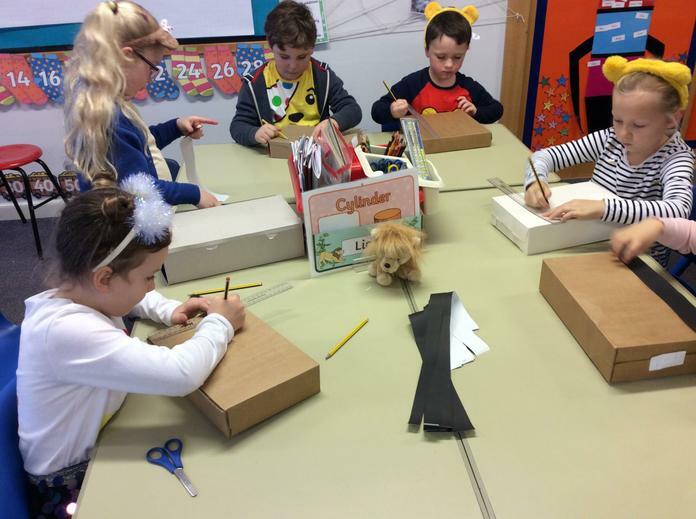 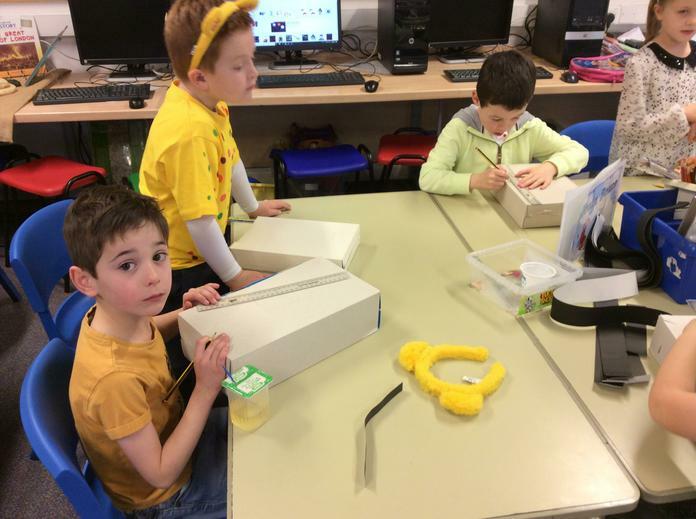 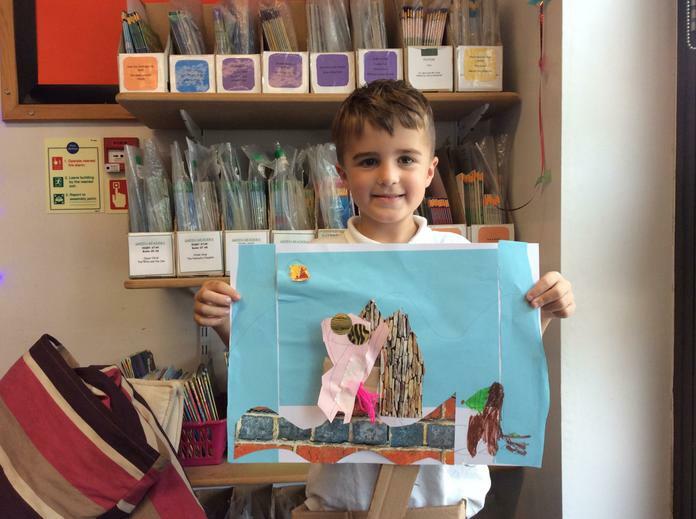 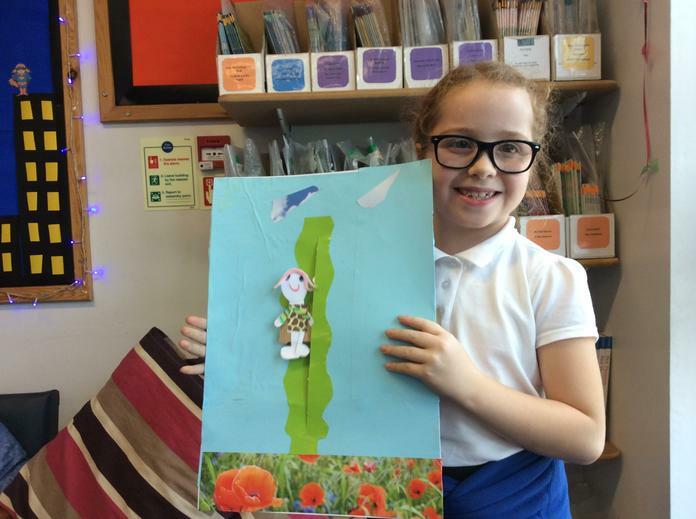 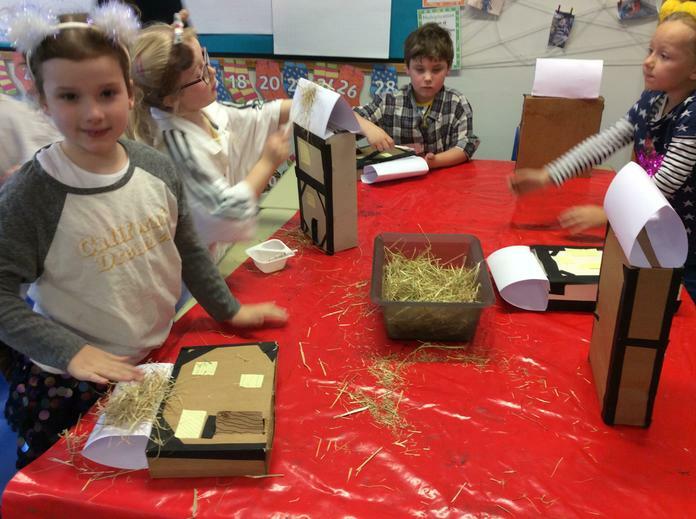 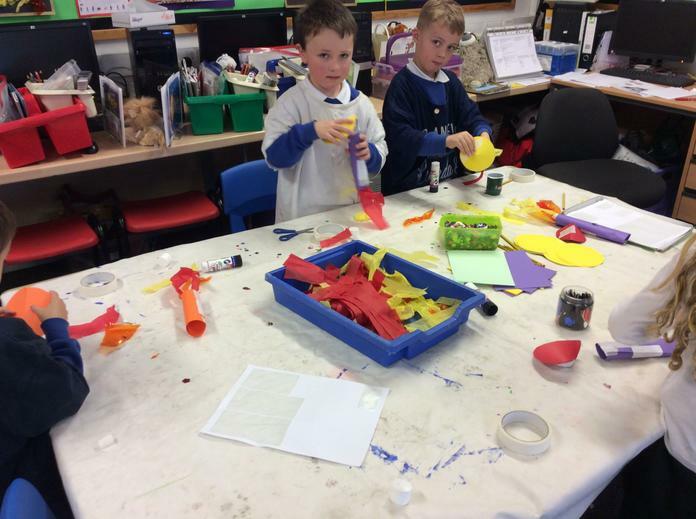 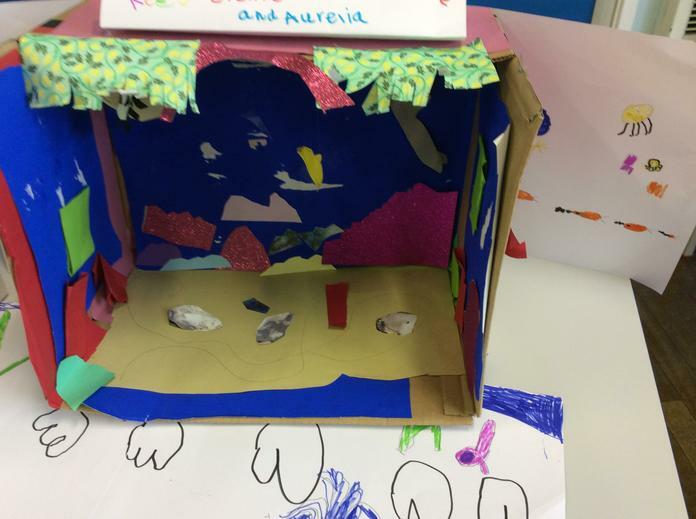 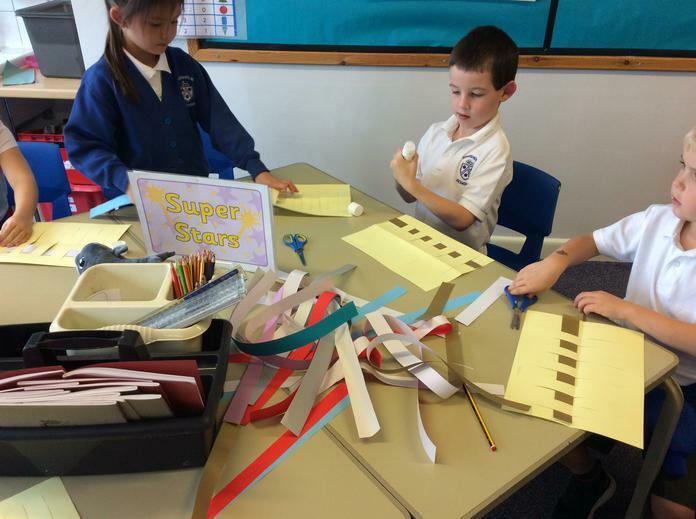 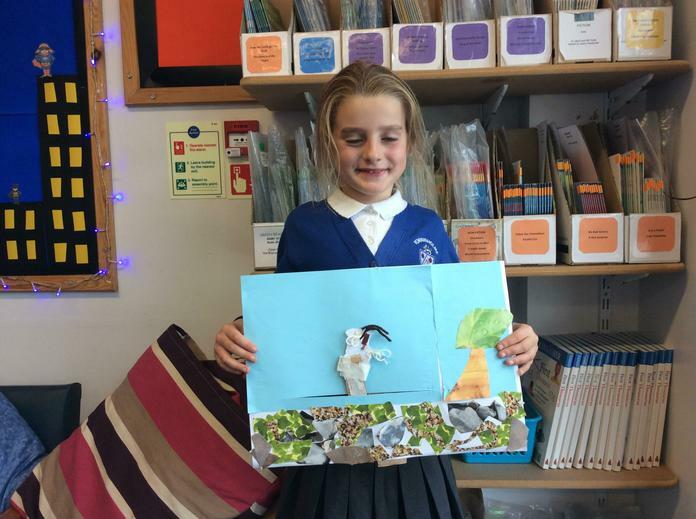 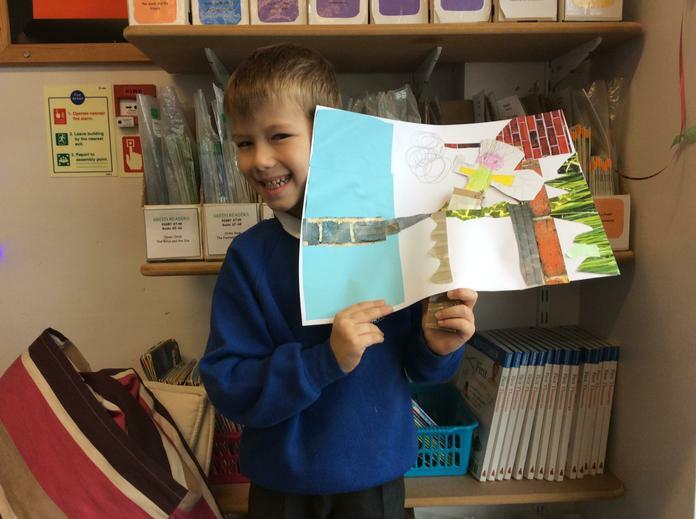 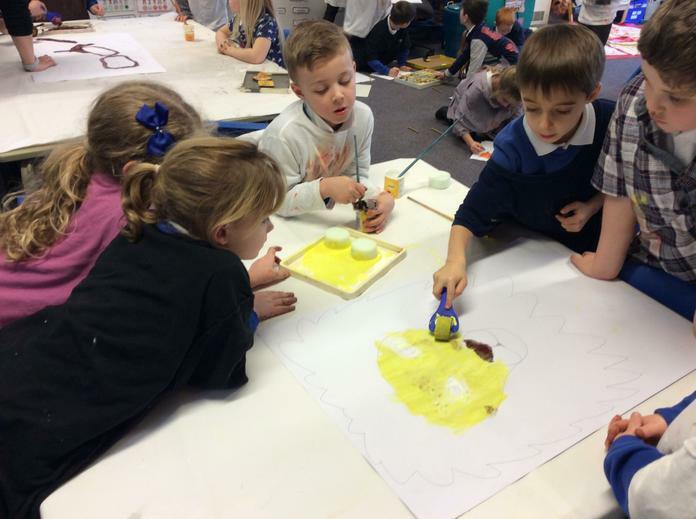 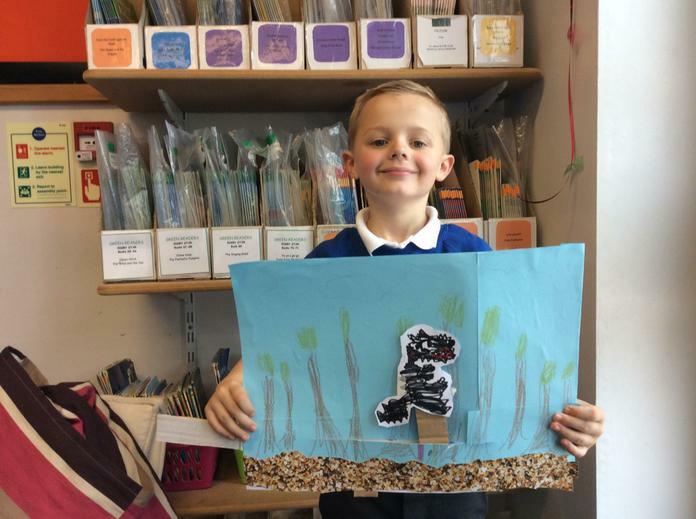 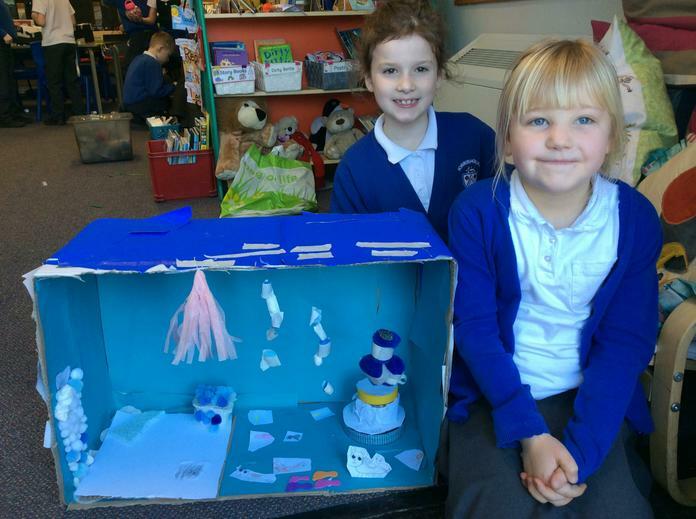 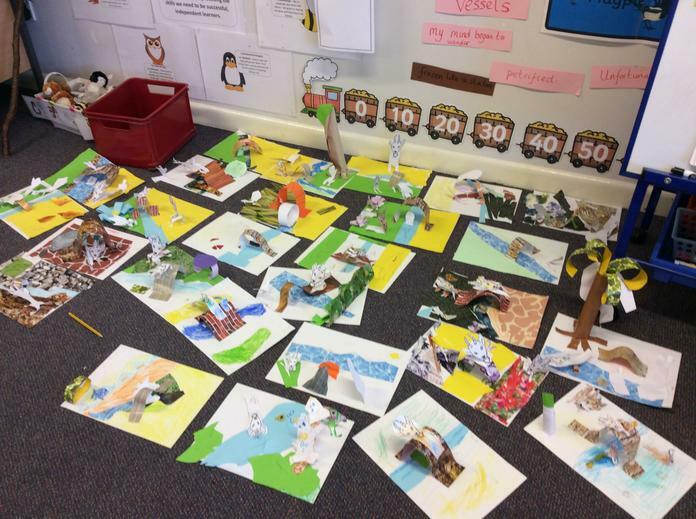 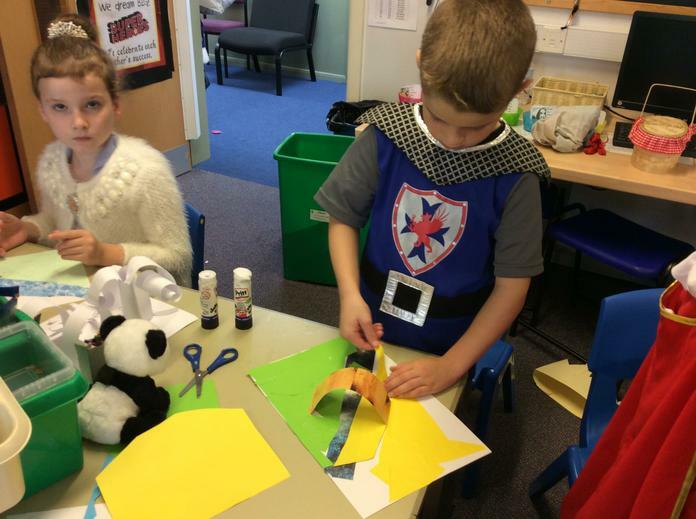 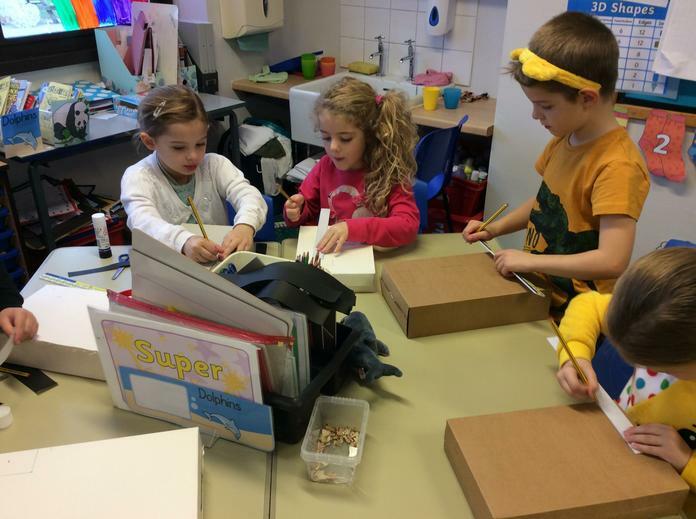 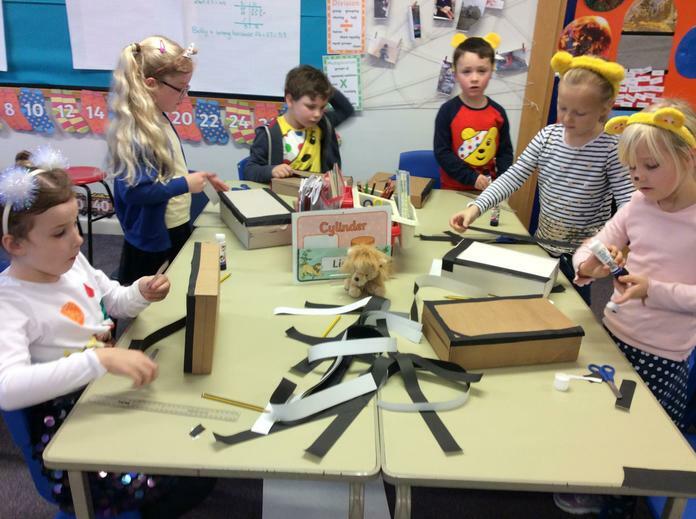 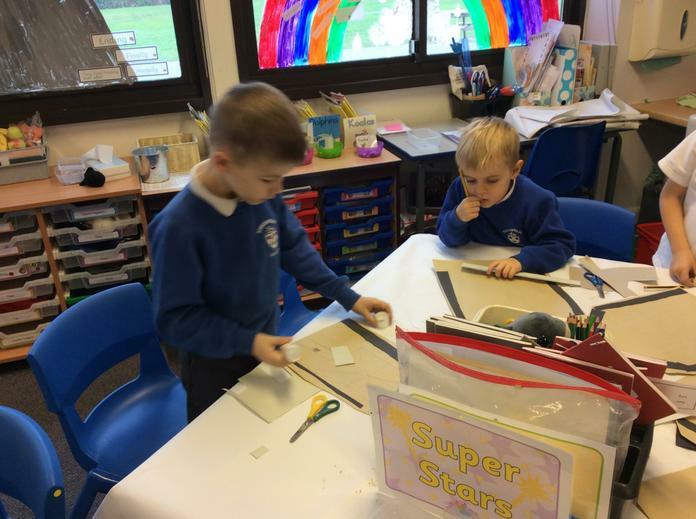 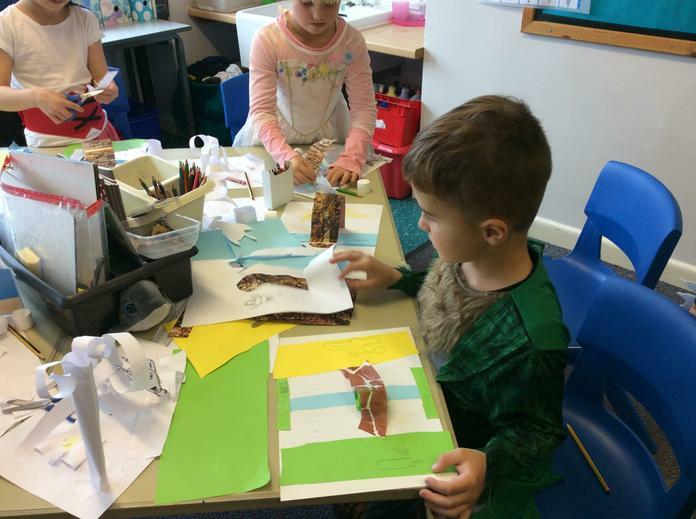 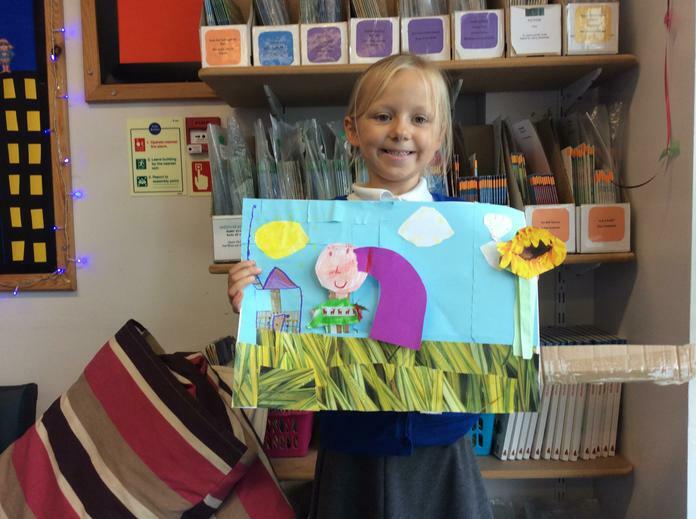 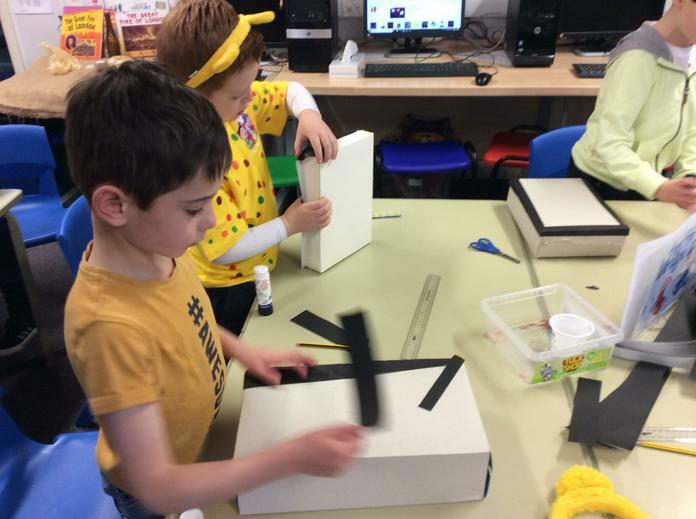 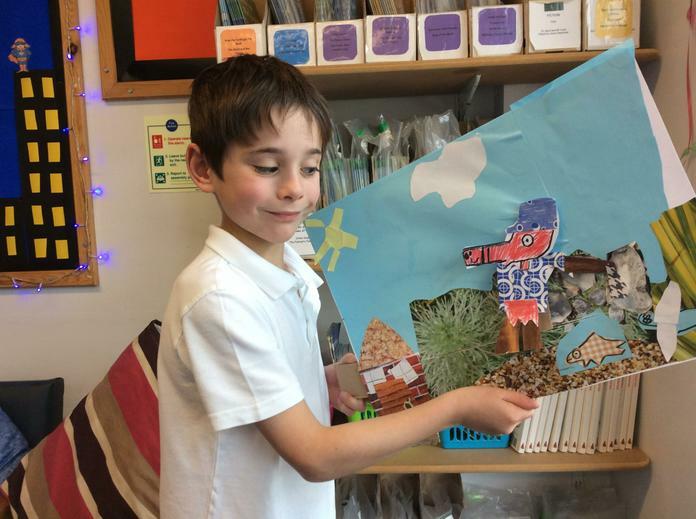 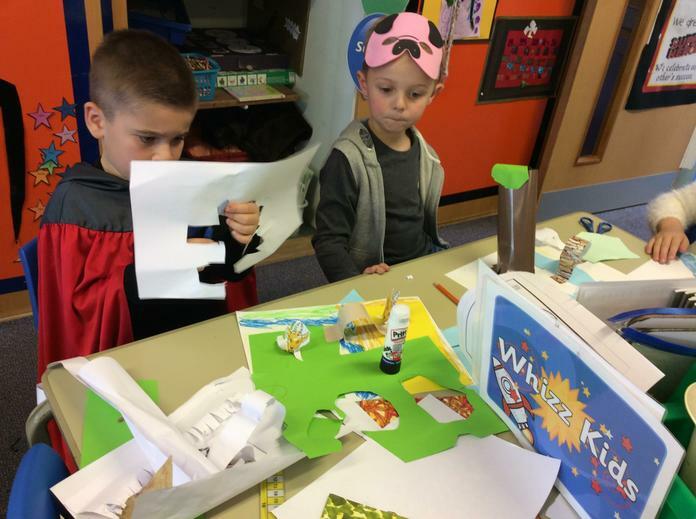 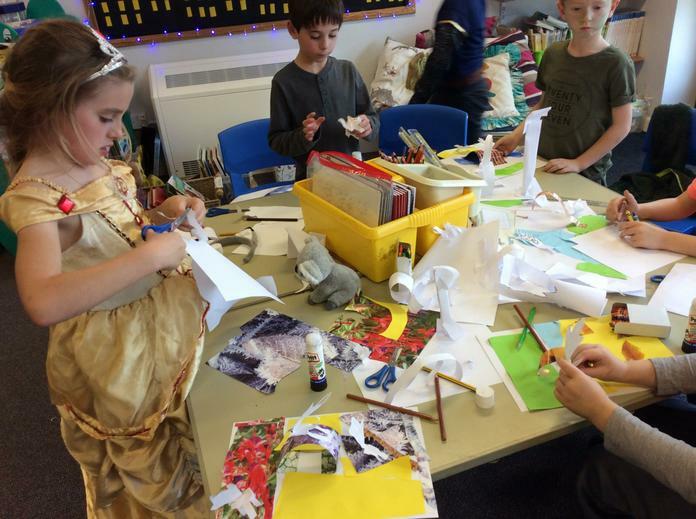 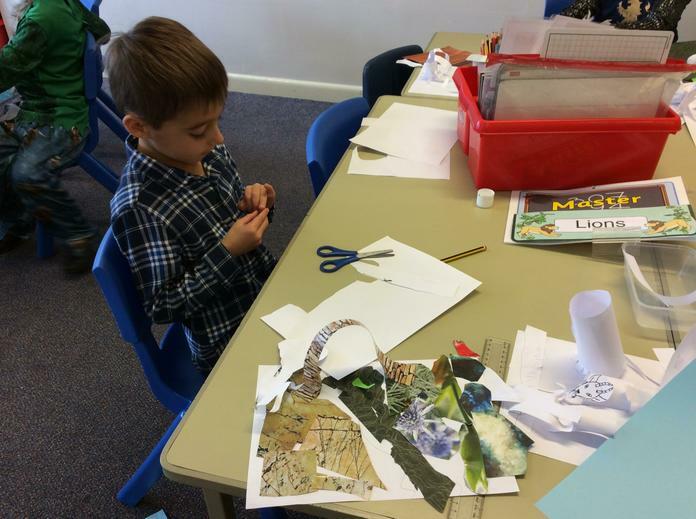 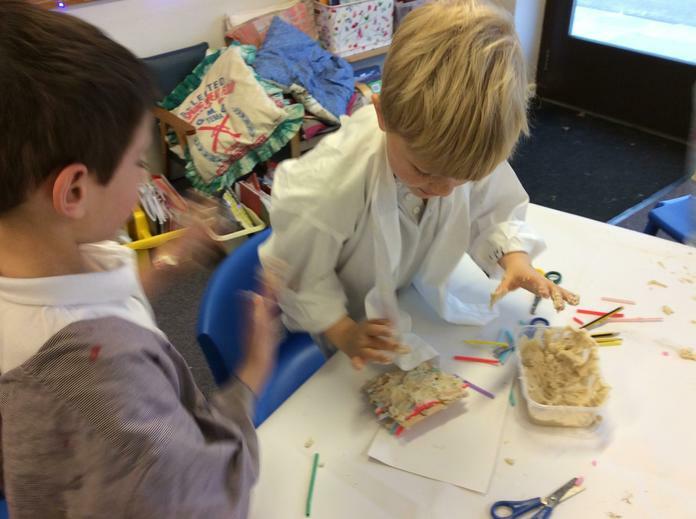 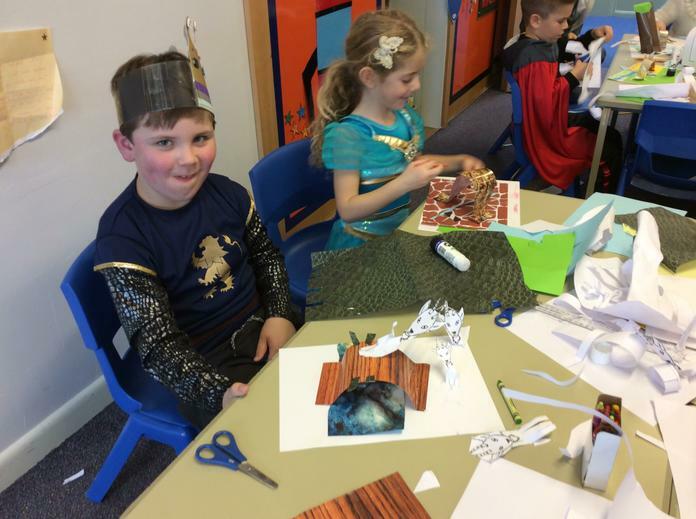 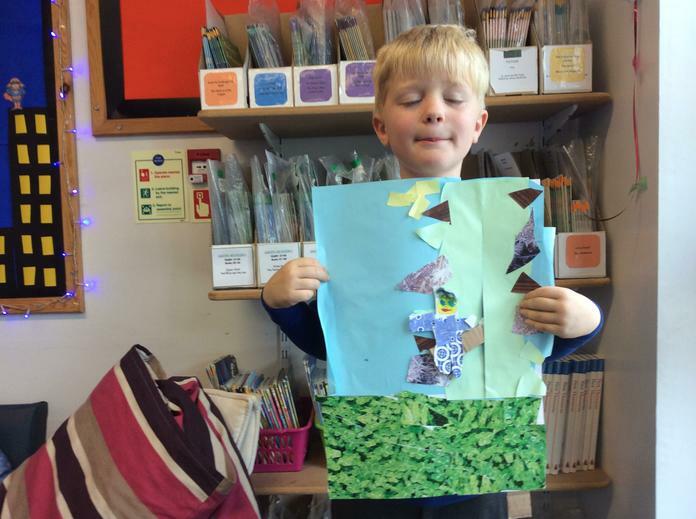 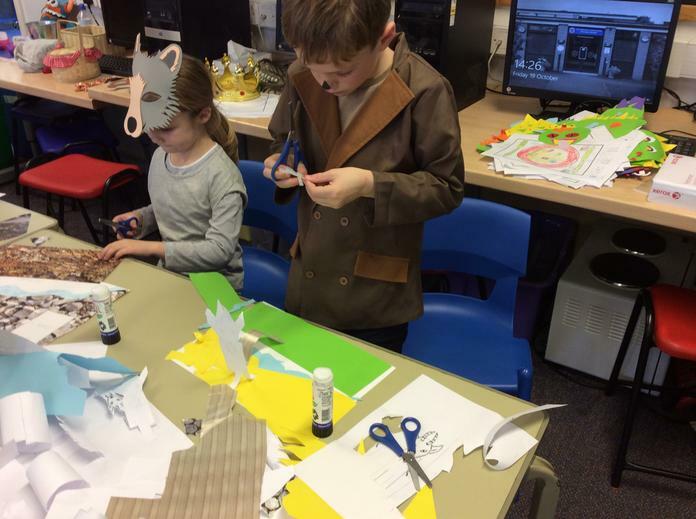 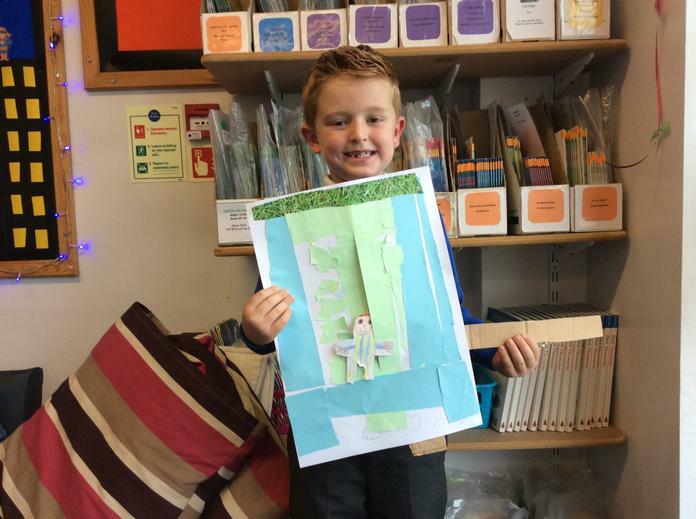 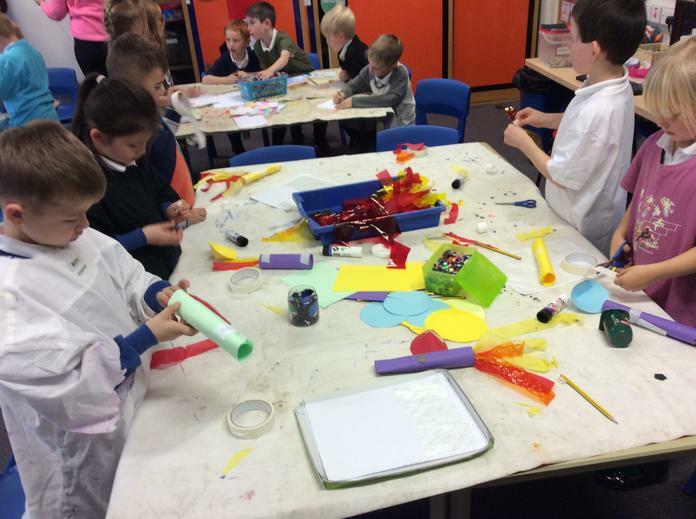 We used 3D paper sculpture techniques to make a 3D world for the Three Billy Goats Gruff. 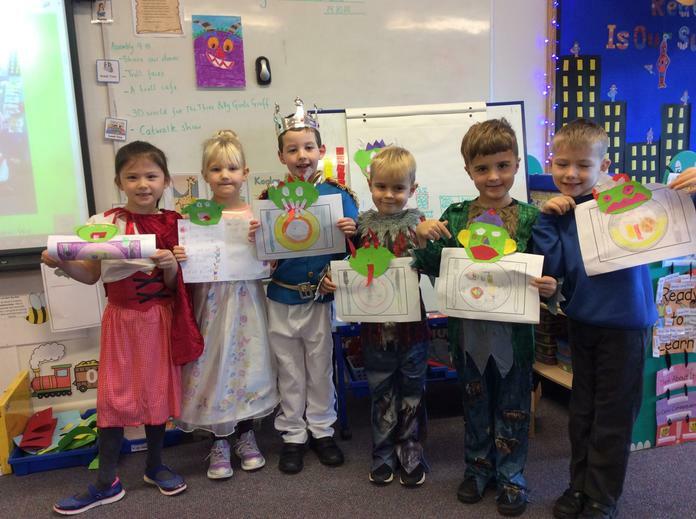 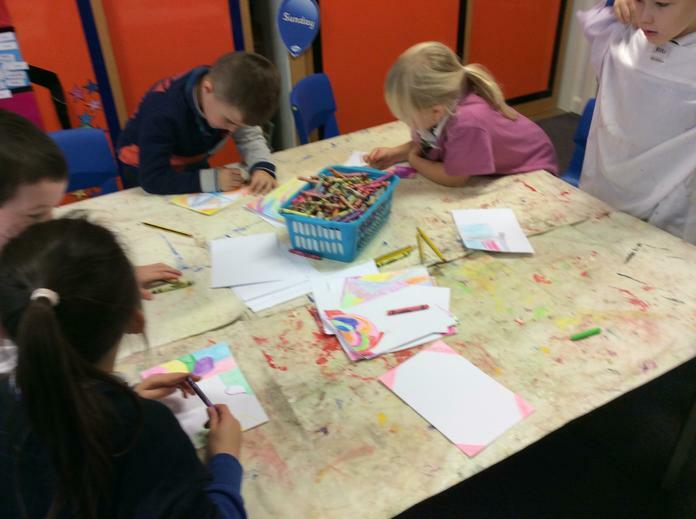 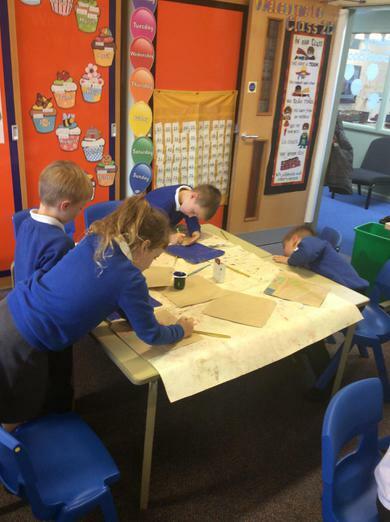 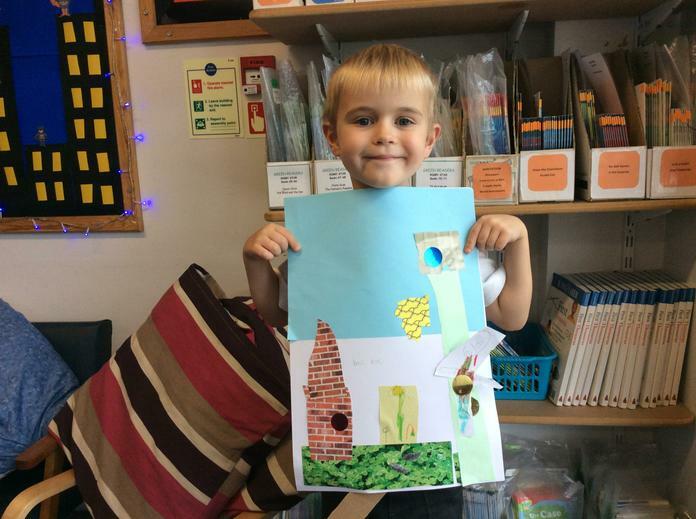 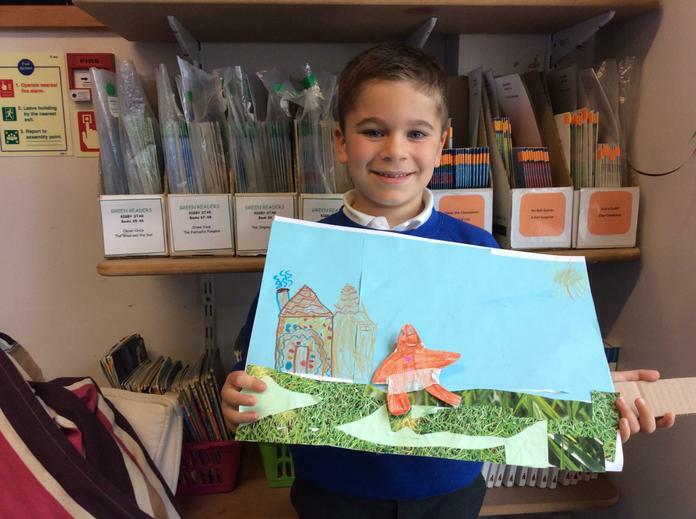 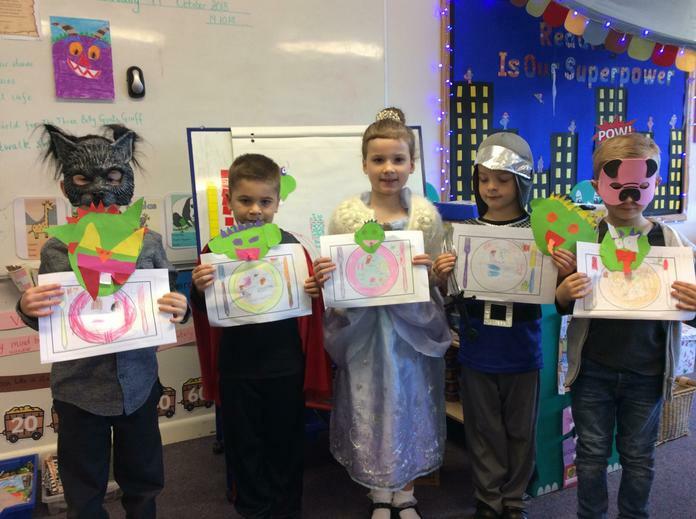 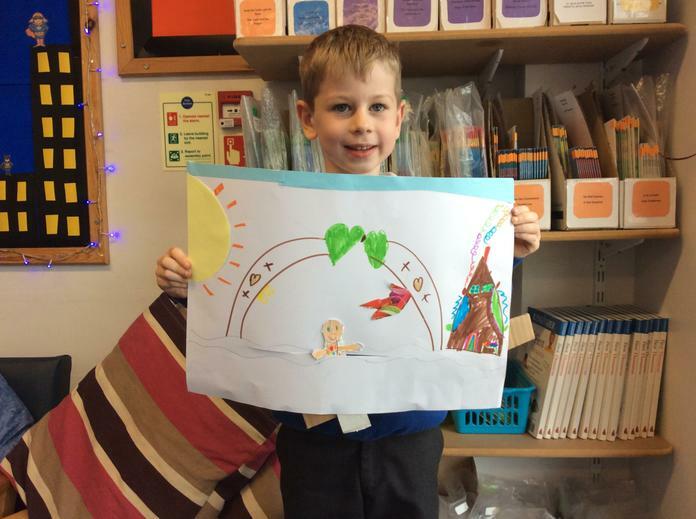 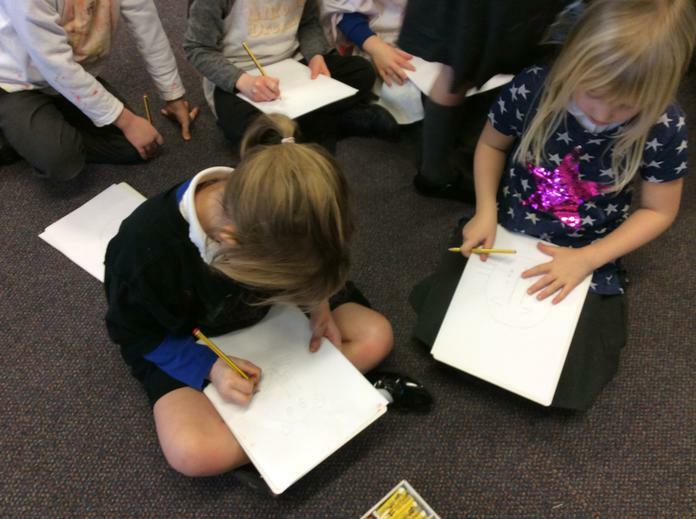 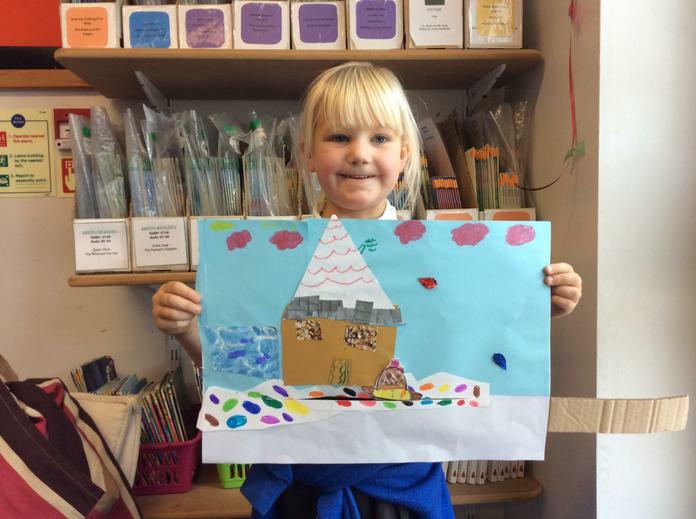 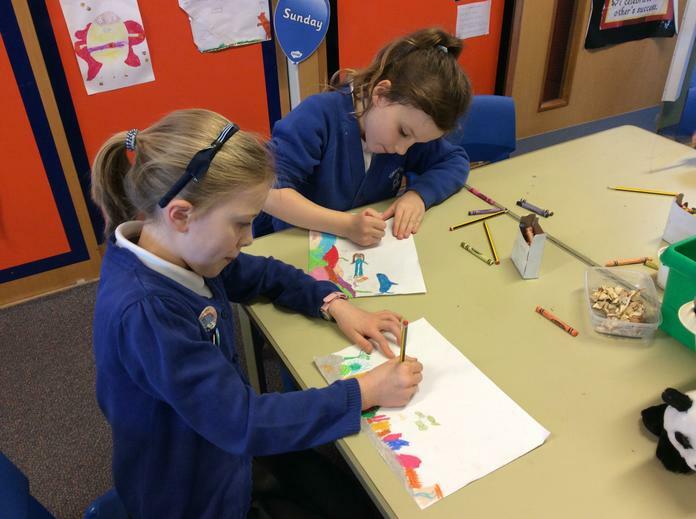 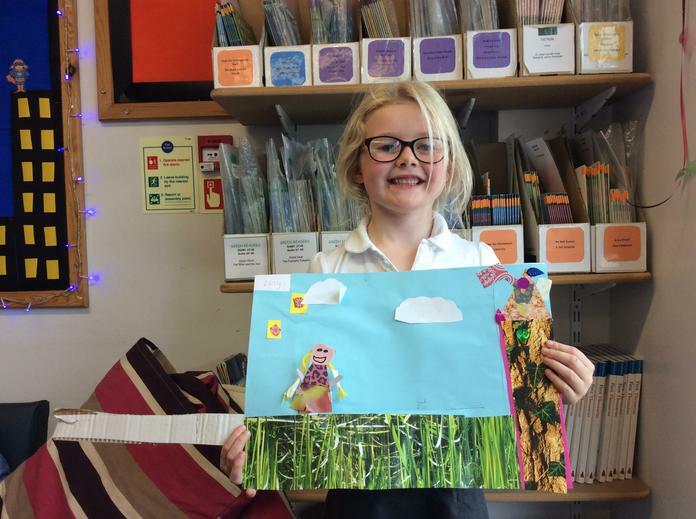 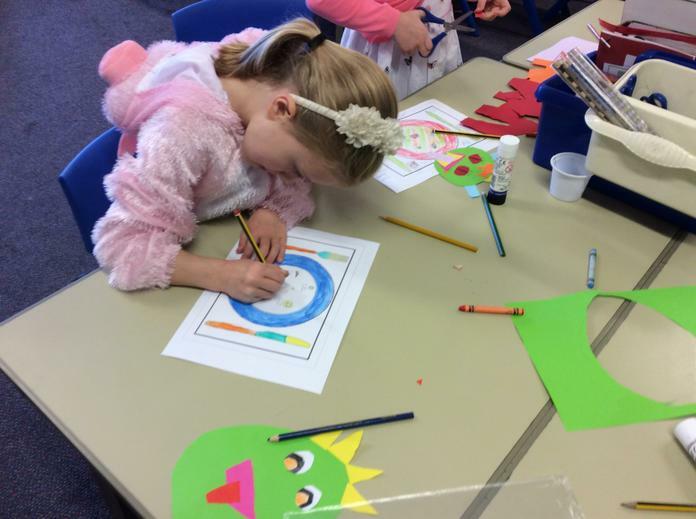 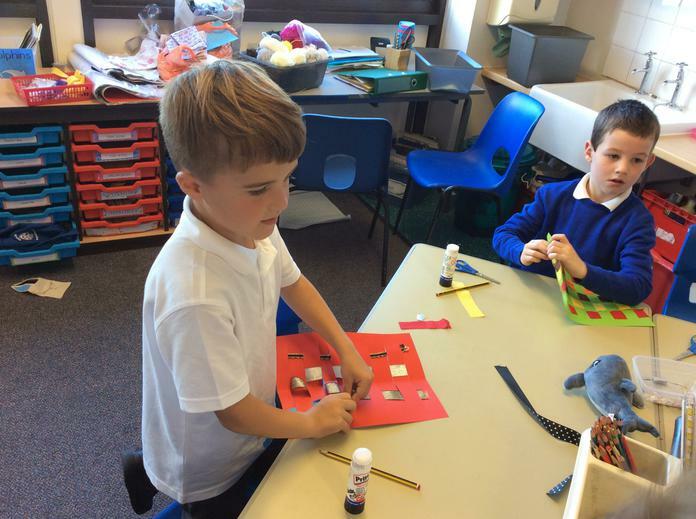 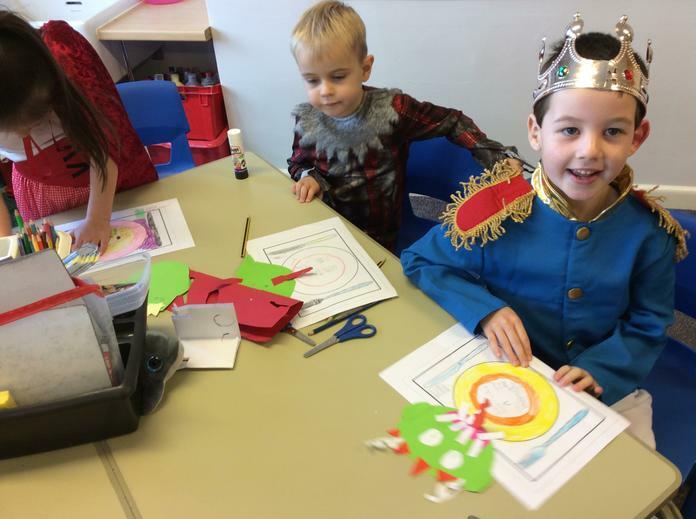 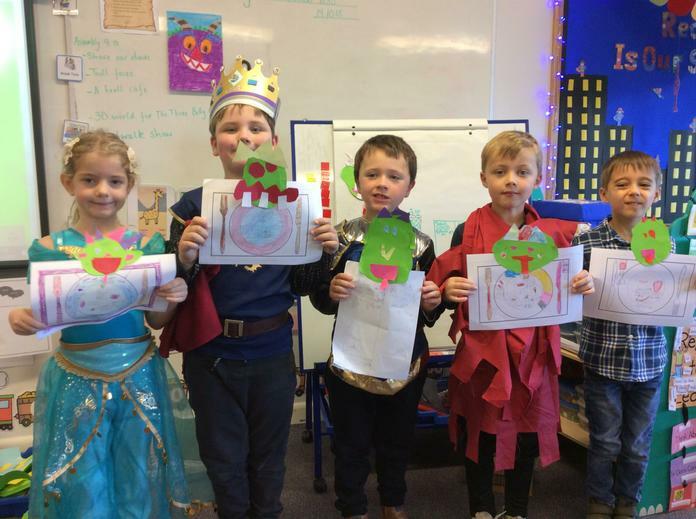 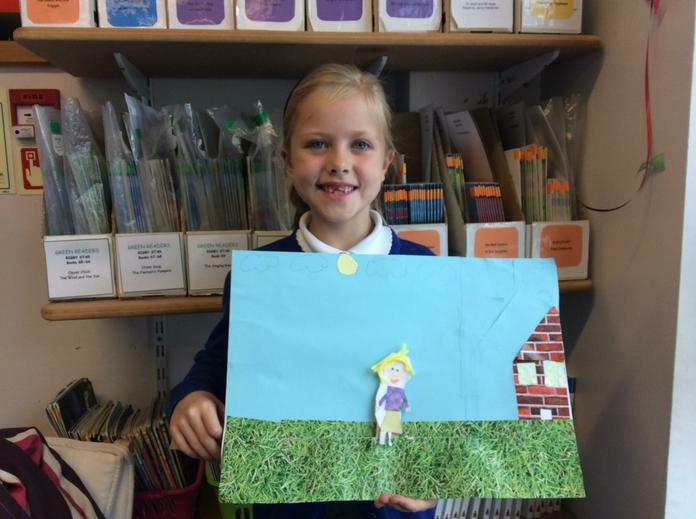 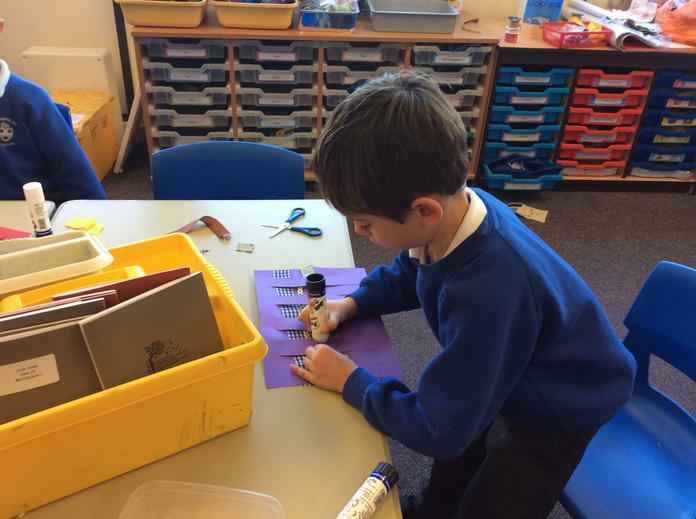 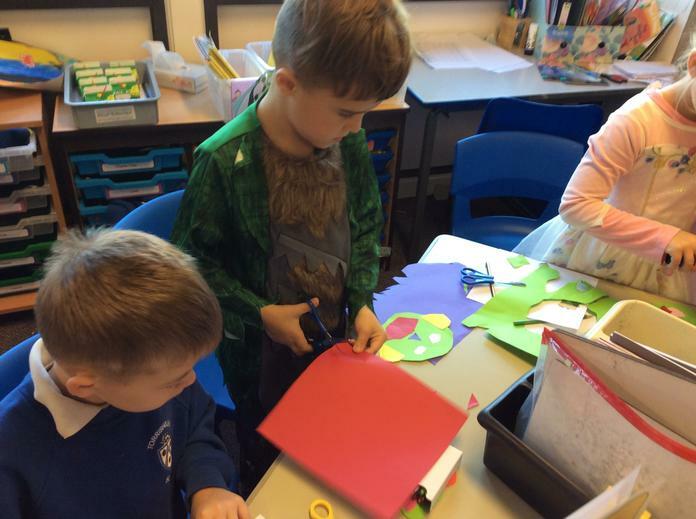 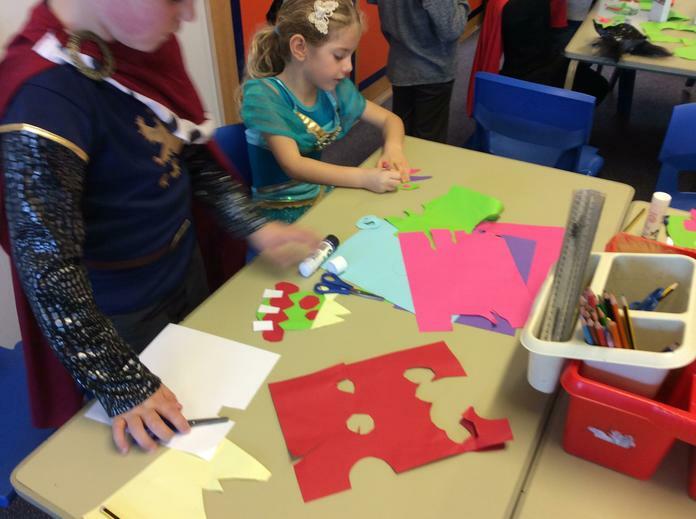 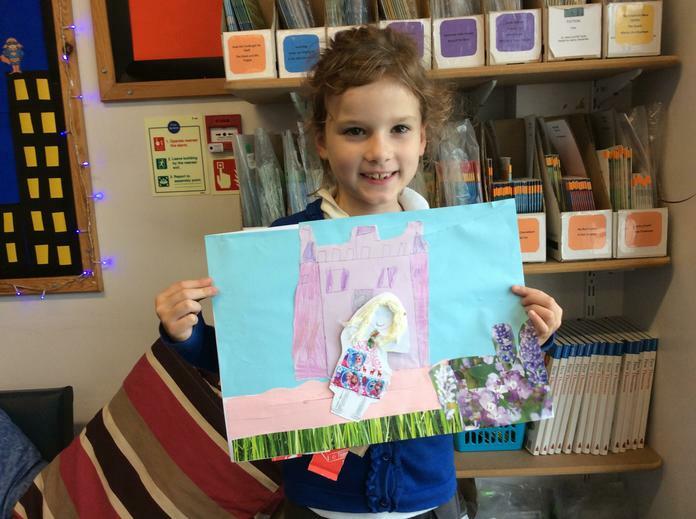 We have designed and made a moving fairy tale picture. 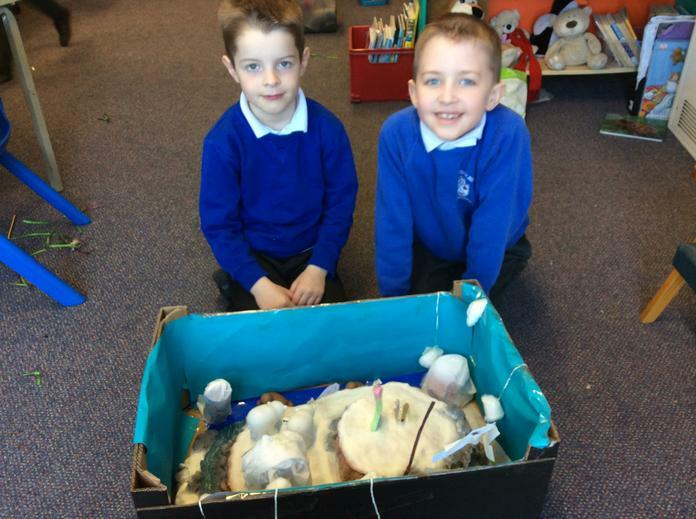 We are very proud of our work. 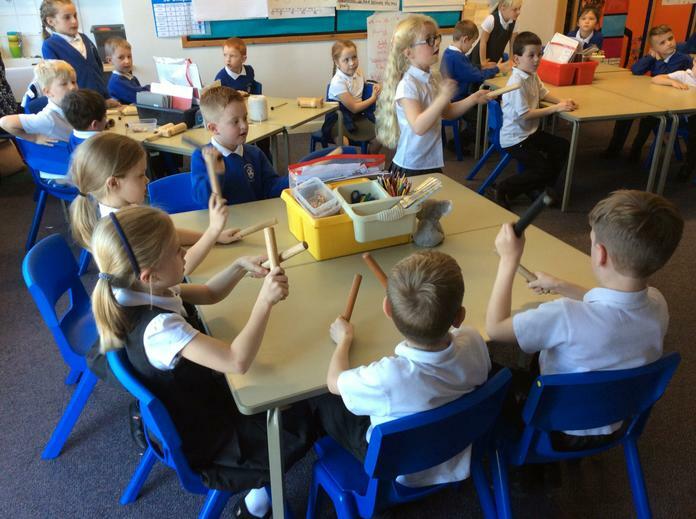 We have been learning to follow the pulse of the music. 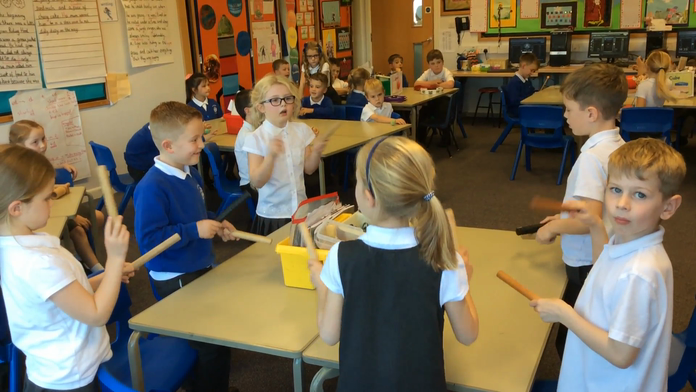 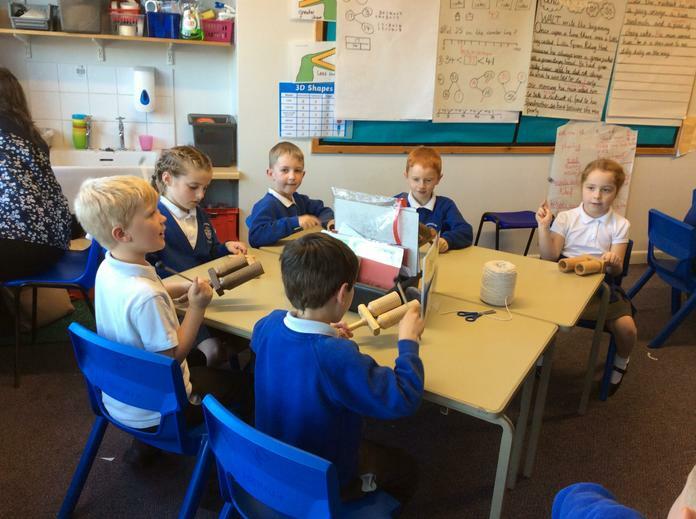 We used this when playing percussion instruments to accompany a piece of music. 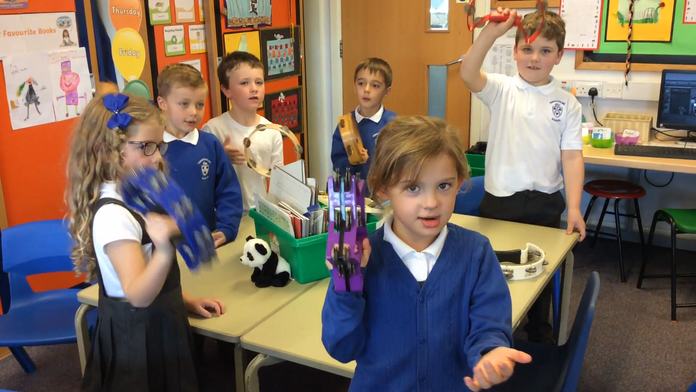 I wanna be in a band! 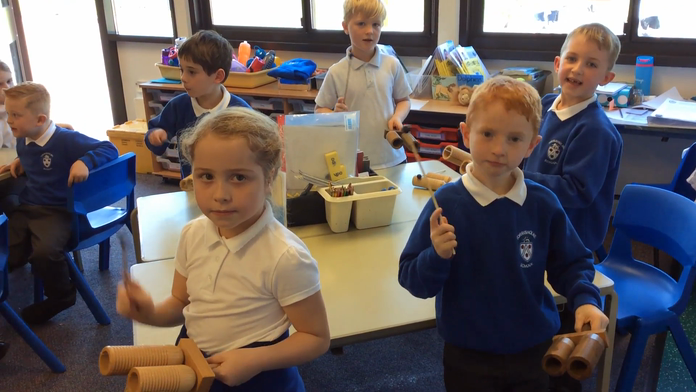 I wanna play in a band! 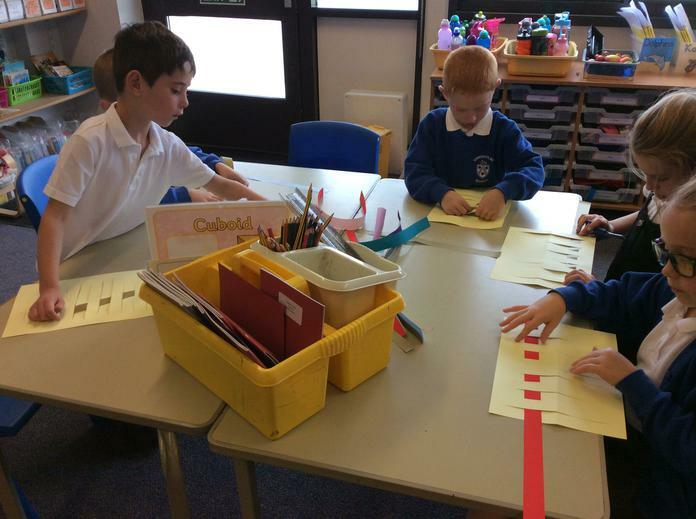 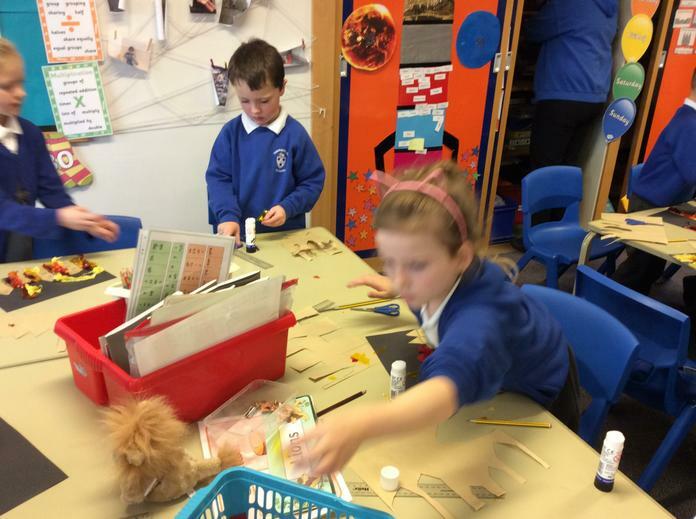 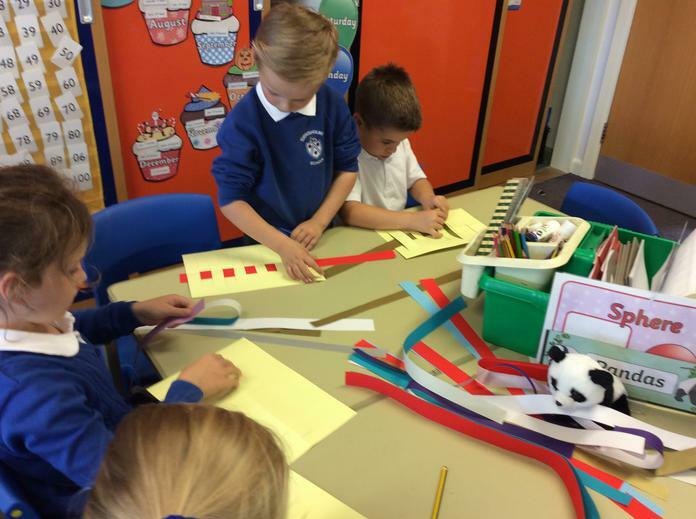 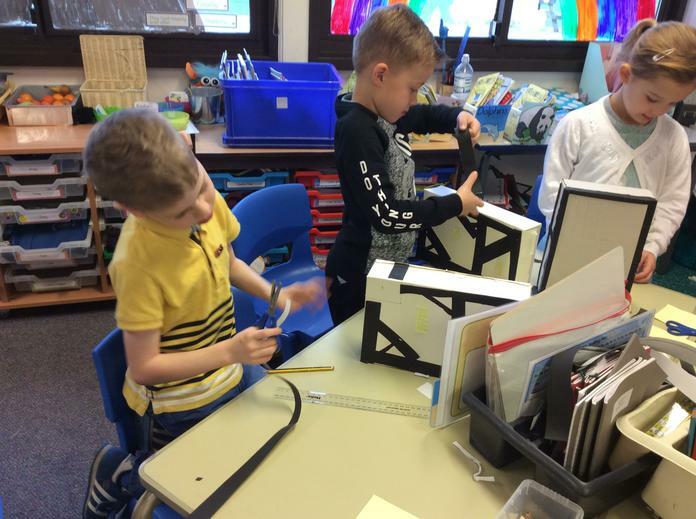 In Science this week we helped make a strong bridge for the billy goats to cross! 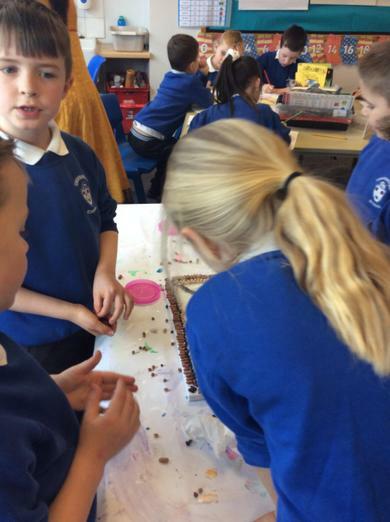 We worked well as teams and earned five pebbles for the pot. 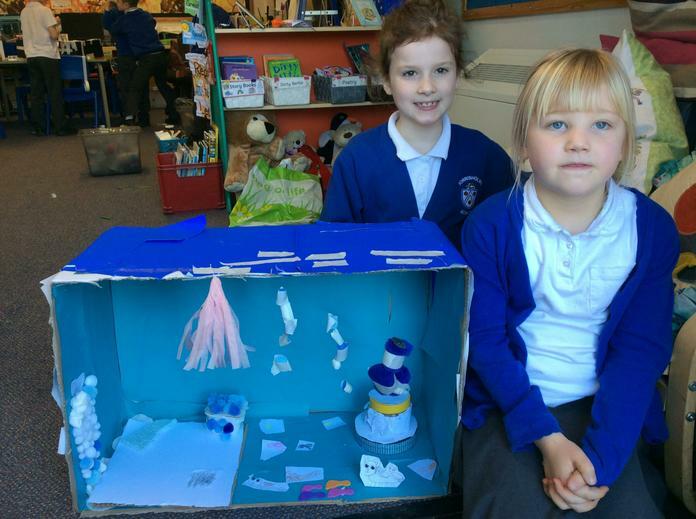 In Science we helped Cinderella find the best material to mop up water. 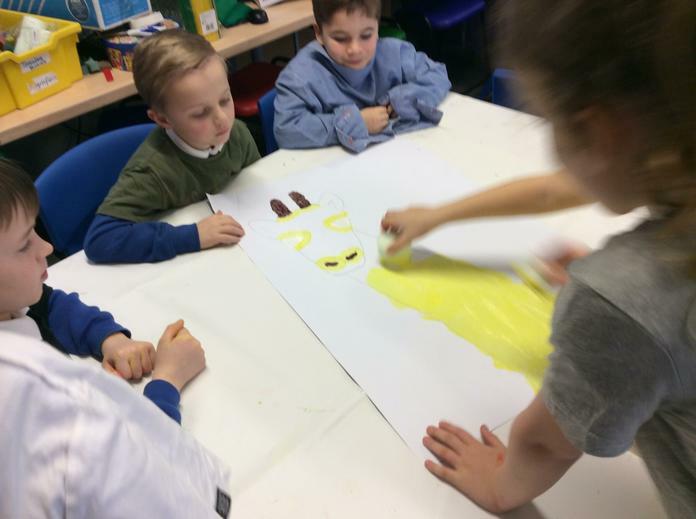 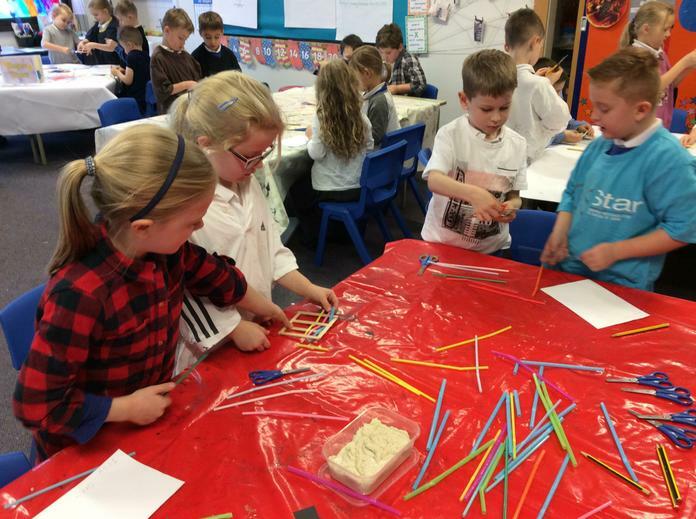 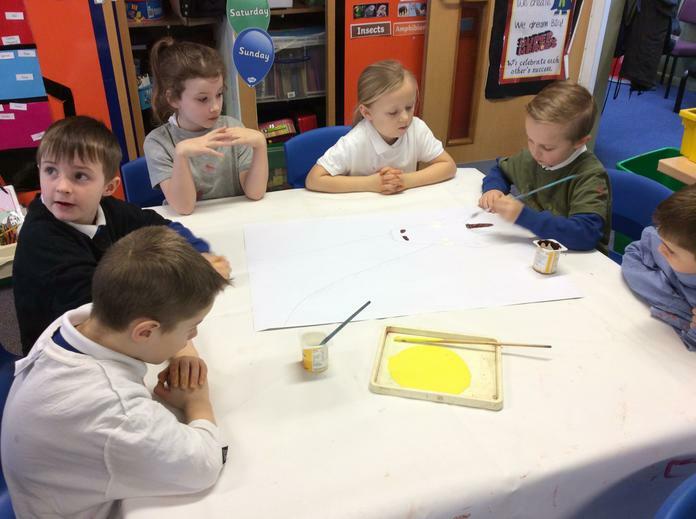 We worked in groups to make a face using natural materials. 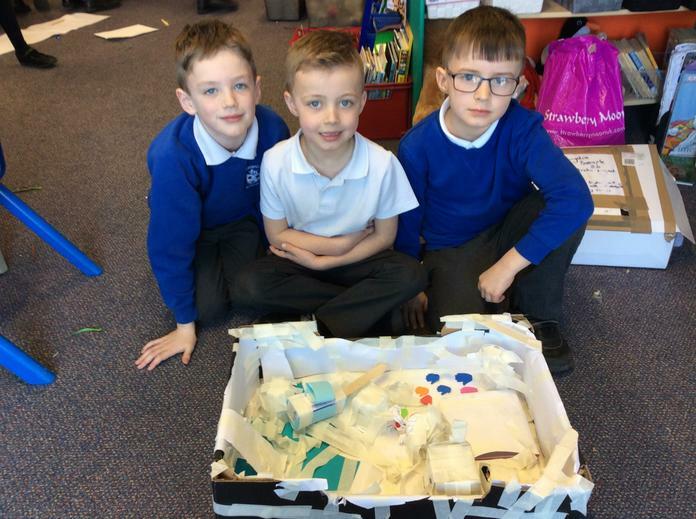 We worked hard to add lots of detail. 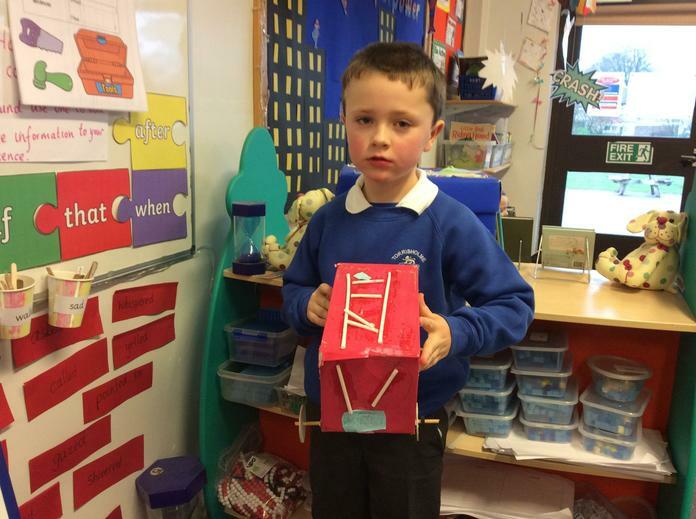 A strange item had been left in our playground. 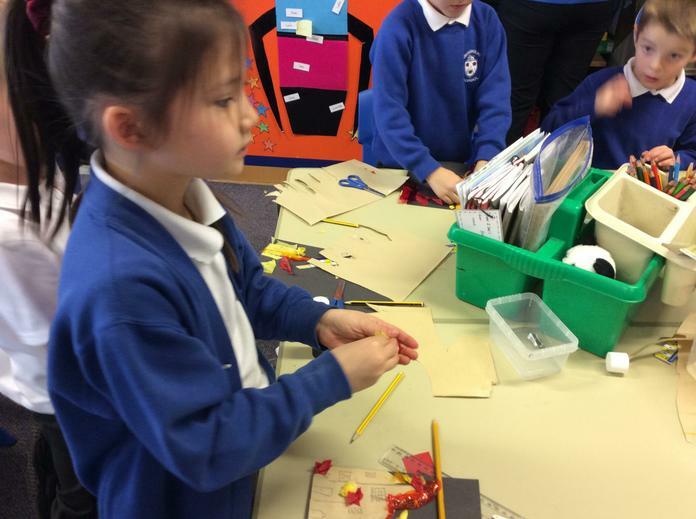 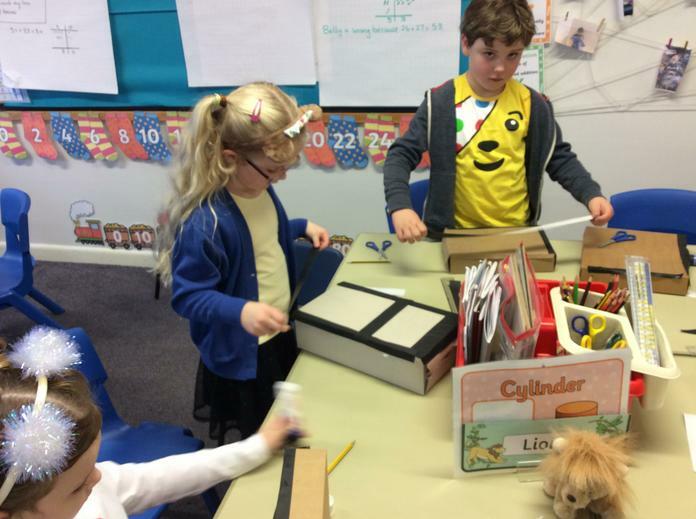 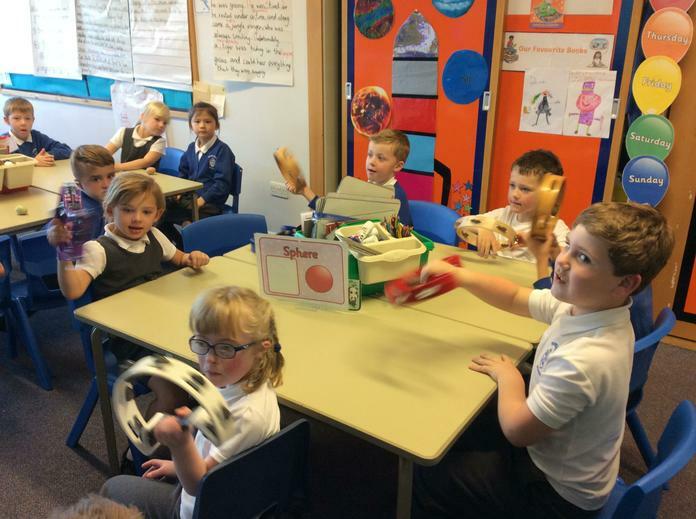 We investigated and found out it was Little Red Riding Hood's basket that the wolf had STOLEN! 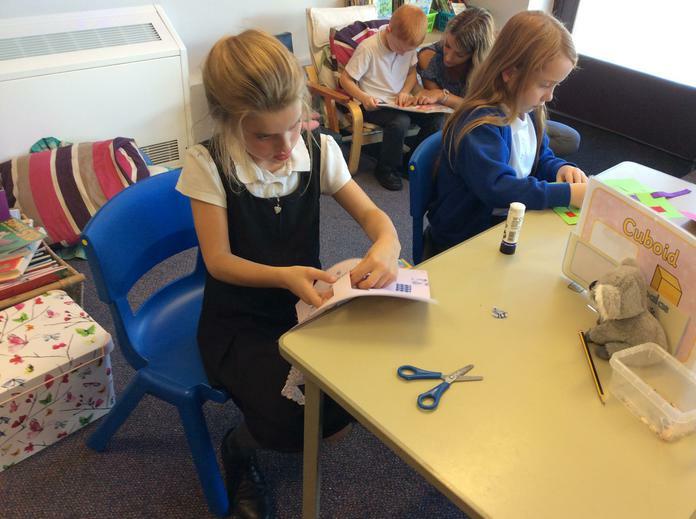 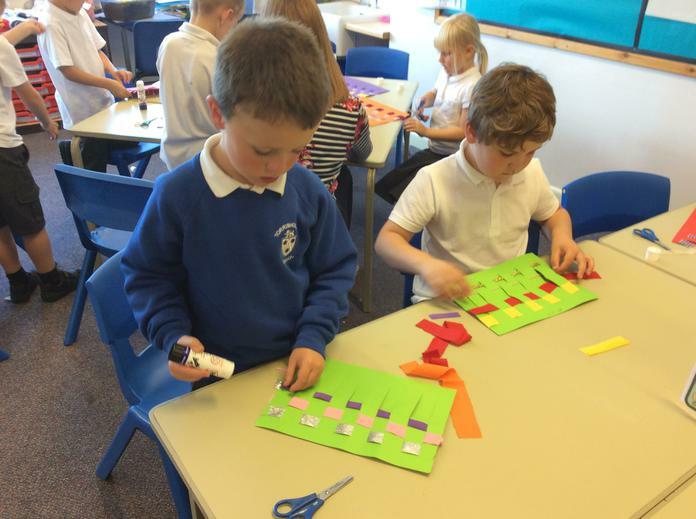 We have been practising our weaving skills. 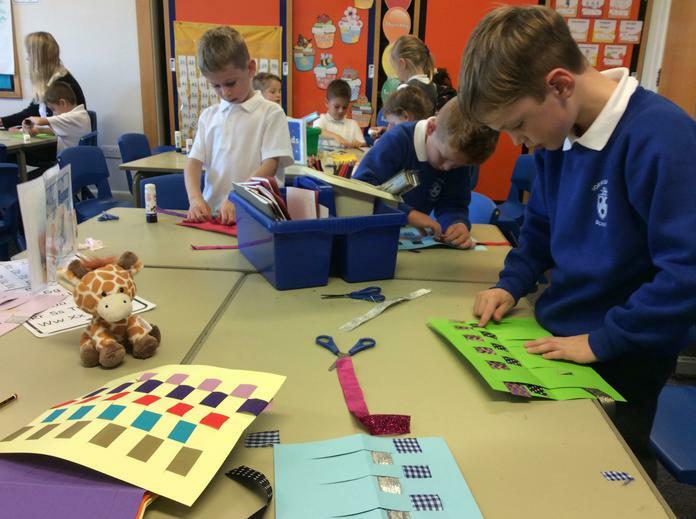 We used different types of fabrics to weave different mattresses for a bed based on Princess and the Pea.